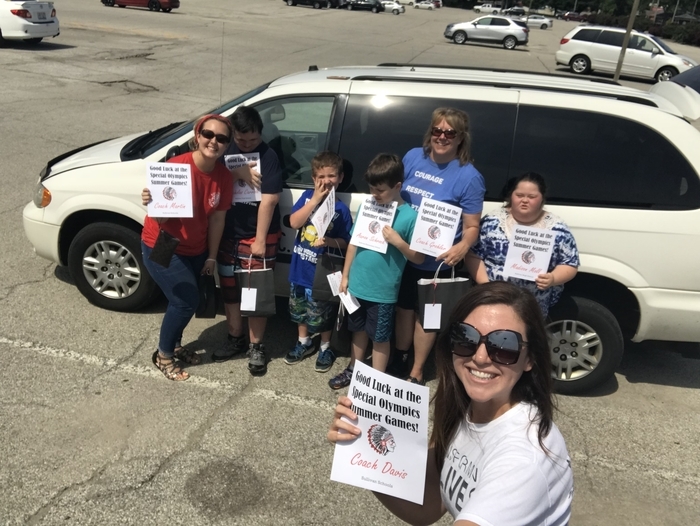 Some of our Special Olympic Athletes have been getting geared up this week reading books about Special Olympics, playing bingo, and practicing the Special Olympic Oath. One of our kindergarten athletes even received a motivational book made by his classmates. Tomorrow is the big event for our 17 athletes participating in track and field events at Eastern Illinios University. Cali, Cy and all of their classmates are sending a huge THANK YOU to Monical's of Sullivan for the donation of pizza boxes!!! They donated enough for each student in the entire third grade to have one for the solar oven project! 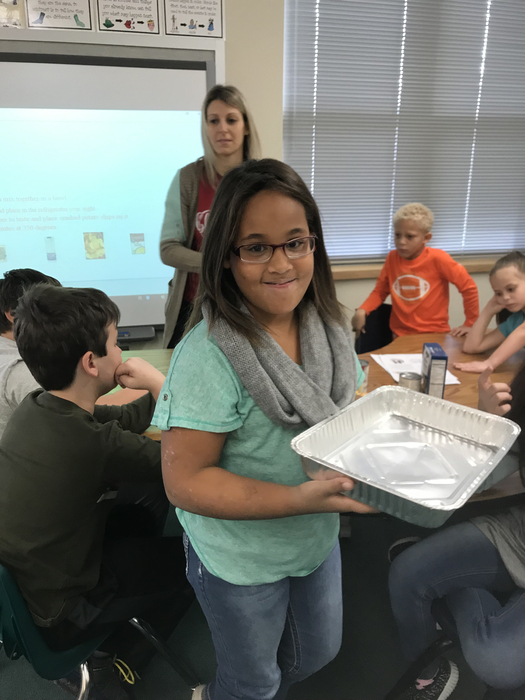 SMS science students visited SES to help third graders build solar ovens and explain the science behind the project. 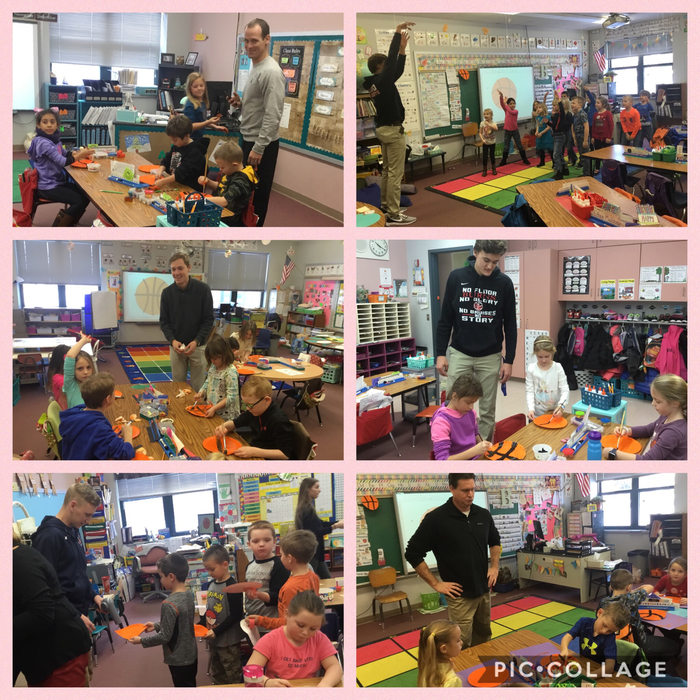 Pictured are David Rose and Caden Guest assisting Mrs. Harpster's class, and happy 3rd graders with their projects! Fingers crossed for a sunny Friday! 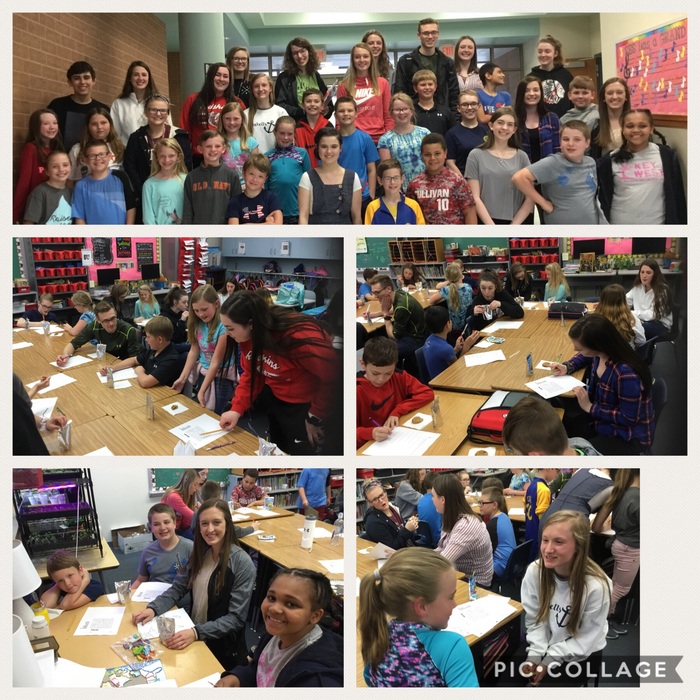 NEHS pen pals visited with Mrs.Hendry’s 4th grade today for our finale! Looking for a fun thing to do with the whole family? 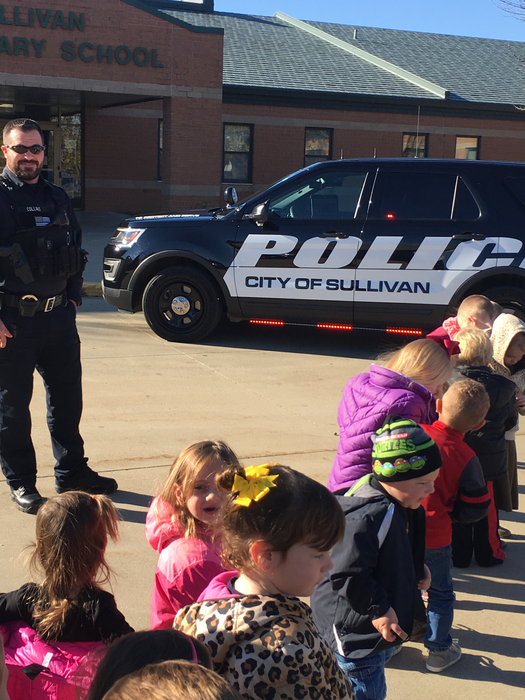 Come see the highly popular Awesome Squad at Sullivan Elementary School on Wednesday, April 24 at 6:00 p.m.; it is free to attend! They will perform for around 45 minutes. This event is sponsored by Bright Start and Baby Talk. The start time for the Spring Choir Concert (Children's Choir and Middle School Choir) on April 29th has been pushed back to 7 p.m. in order to allow for middle school track athletes to return from a meet in time to perform. Congratulations to the newest 4th Grade members of the MIND (Math Is Not Difficult) Club! 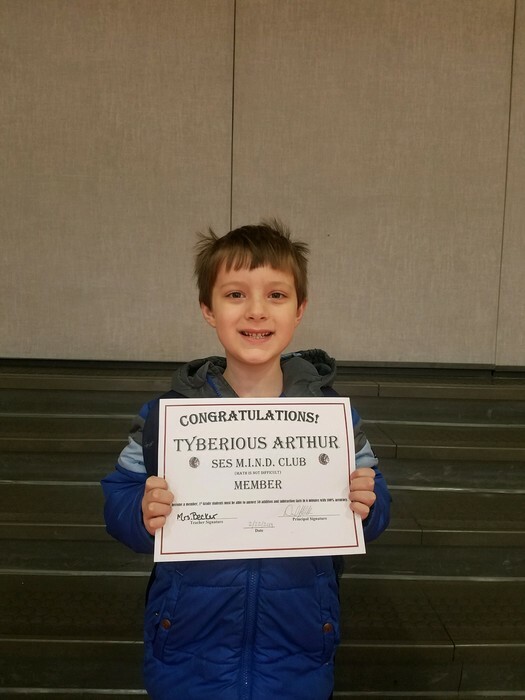 Congratulations to the newest 2nd Grade member of the MIND (Math Is Not Difficult) Club! 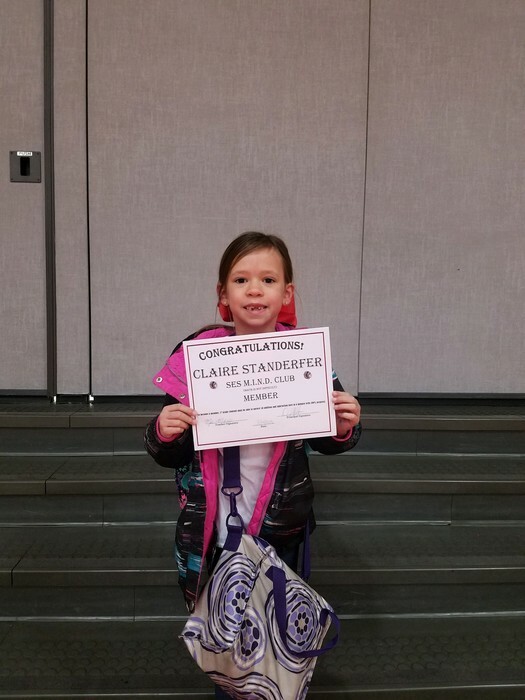 Congratulations to the newest 1st Grade member of the MIND (Math Is Not Difficult) Club! Congratulations to the newest 1st Grade members of the MIND (Math Is Not Difficult) Club! Every day should start with and an all-school assembly, Disney, ukeleles and recorders! Pictured are some of the 3rd graders performing "Under the Sea." Great show, SES third and fourth graders! 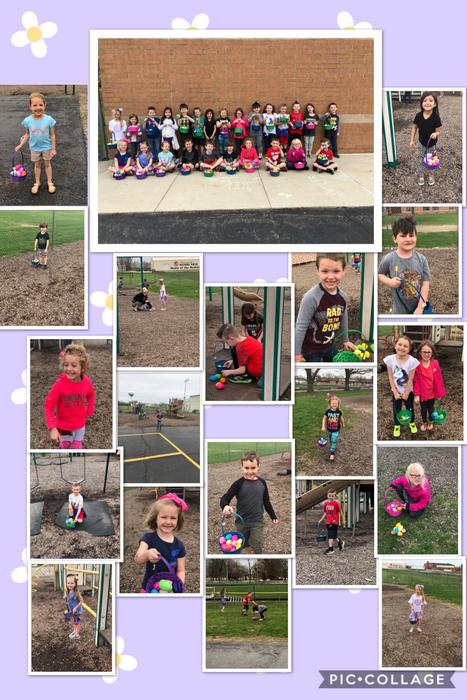 Mrs. Watkins’ class enjoyed hunting eggs this morning. 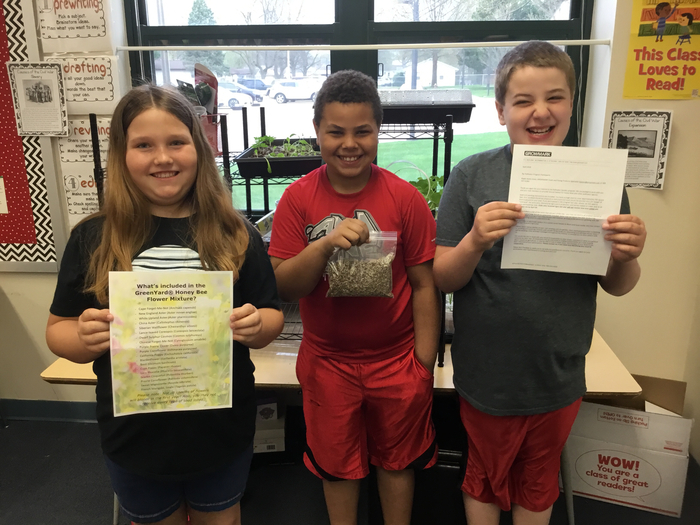 Thanks to our local 4-H for helping us get seeds for our very own ”Pollinator Garden.” Sullivan schools are Growing in many ways! Thank you to the Sullivan PTO for organizing Recess at Night, it was enjoyed by all! Don’t forget, Family Fit Night is tonight 6pm! See you on the playground! Parents must accompany children. 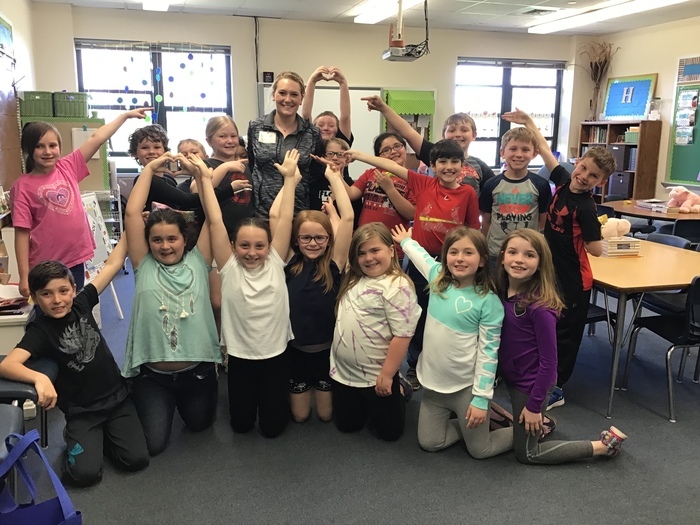 The 5-2-1-Almost None curriculum was taught by Healthy Kids Educator Ms. Brittney, of SBLHC (pictured above with Mrs. Harpster's third grade class). 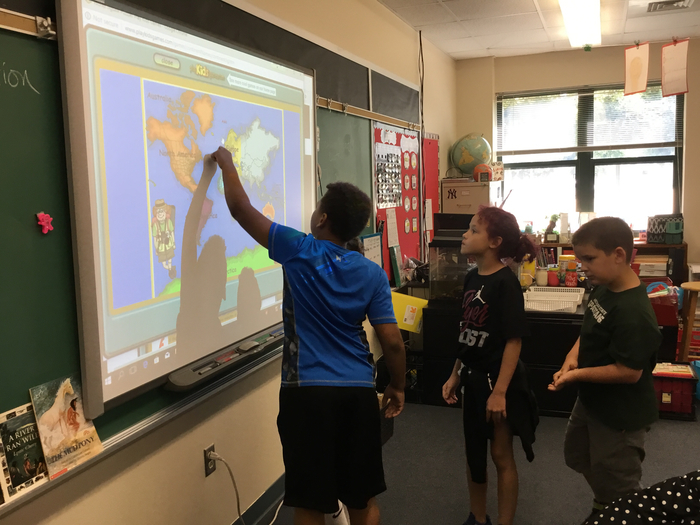 During the monthly visits, students loved actively participating in interactive lessons that help to promote healthier lifestyles. First grade has been learning about all different habitats! We have focused on the rain forest and have learned many things ! 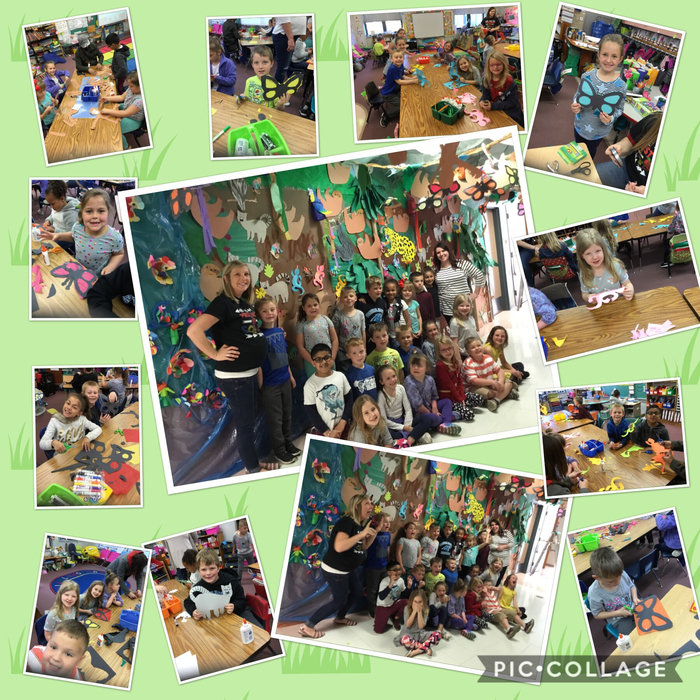 Mrs. Becker’s class had a great day making animals and plants for the rainforest! Mrs. Harpster's class has discovered a love for paper mache today! Can you guess what the finished product will be? 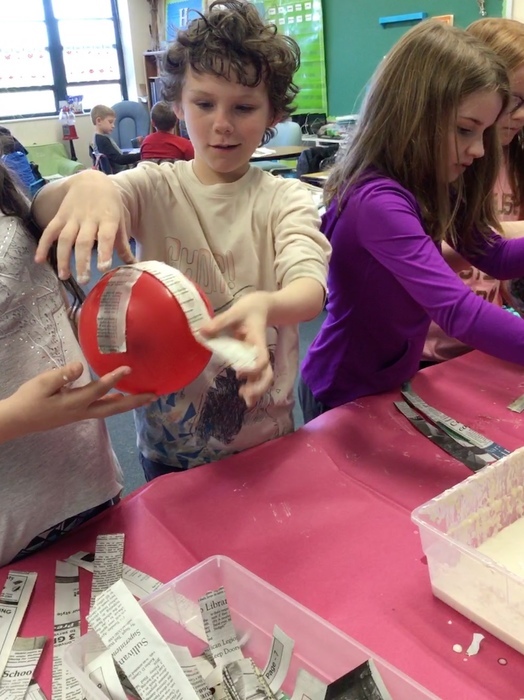 More fun with paper mache in third grade! It's a paper mache kind of day in Room 20! 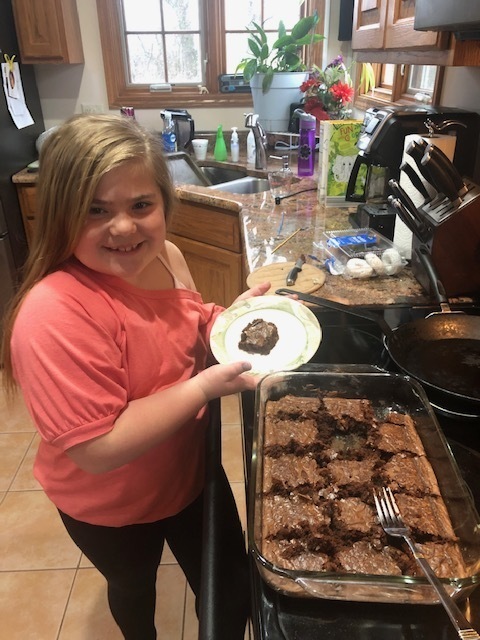 Mali and her family participated in the "On the Same Page" baking project. This was the winning picture for Mrs. Harpster's third grade class. Congratulations, Roe Family! 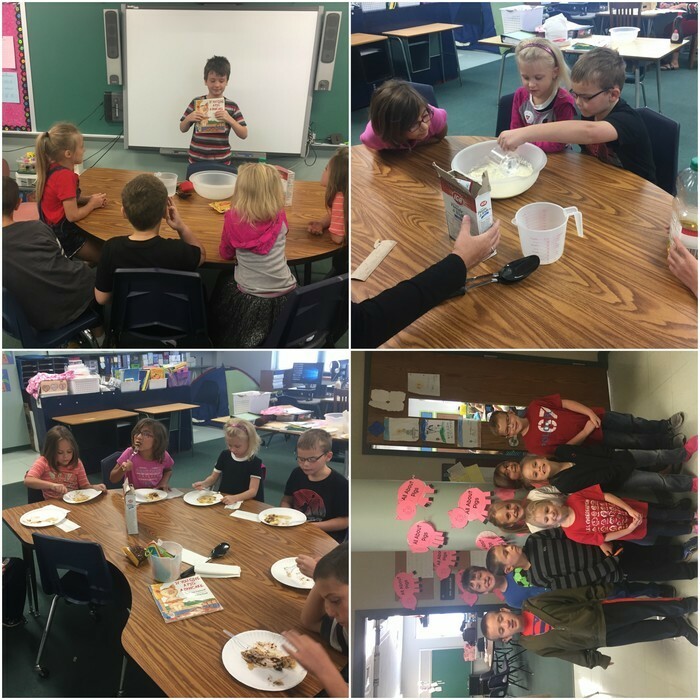 Mrs. Harpster's third grade students had fun participating in the "On the Same Page" baking project. We have "The Chocolate Touch!" Congratulations to the newest 3rd Grade members of the MIND (Math Is Not Difficult) Club! Who doesn’t love Chocolate! 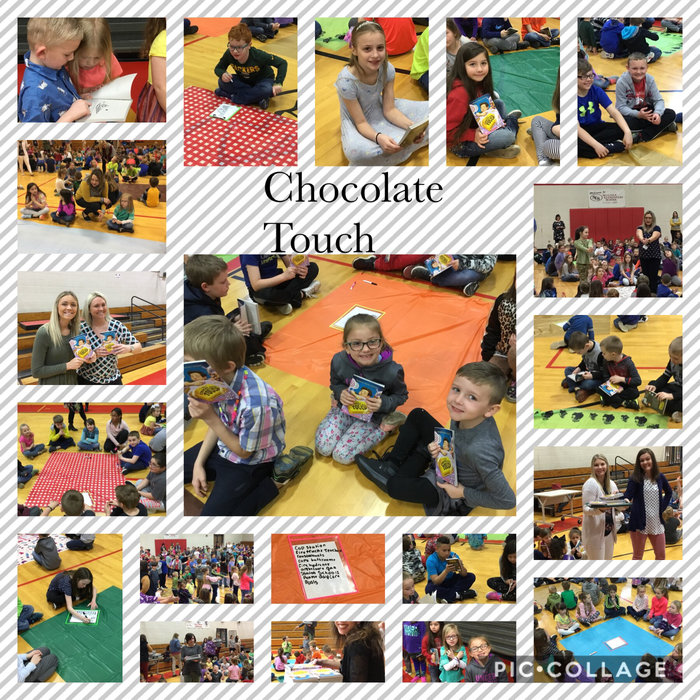 Mrs. Florey, Mrs. Guyot, and Mrs. Grohler’s students wrapped up the amazing Chocolate Touch book with activities centered around chocolate. 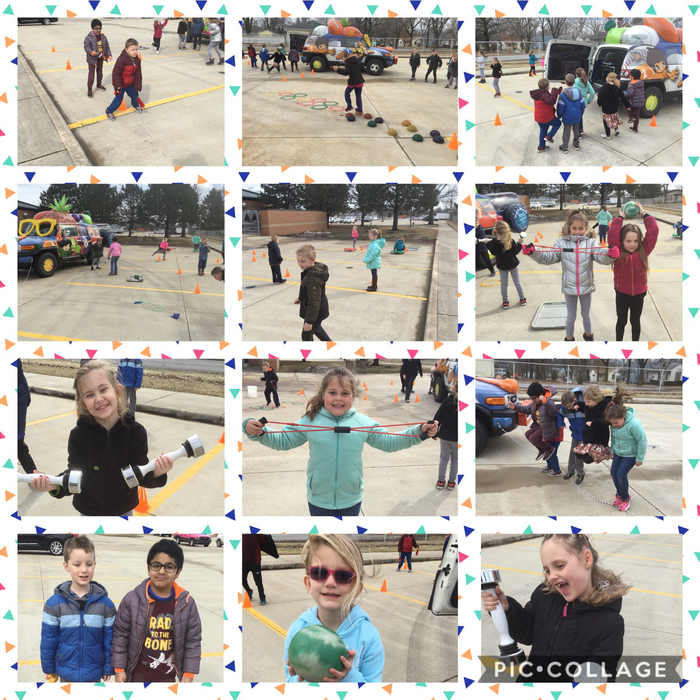 Look at the fun time had by all the students! 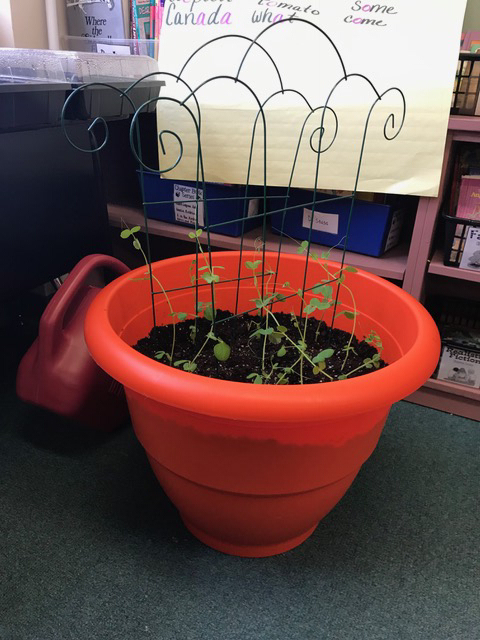 Mrs.Haegen’s 2nd grade potted the sugar snap peas that they started with AG in the Classroom. Spring is in the air! 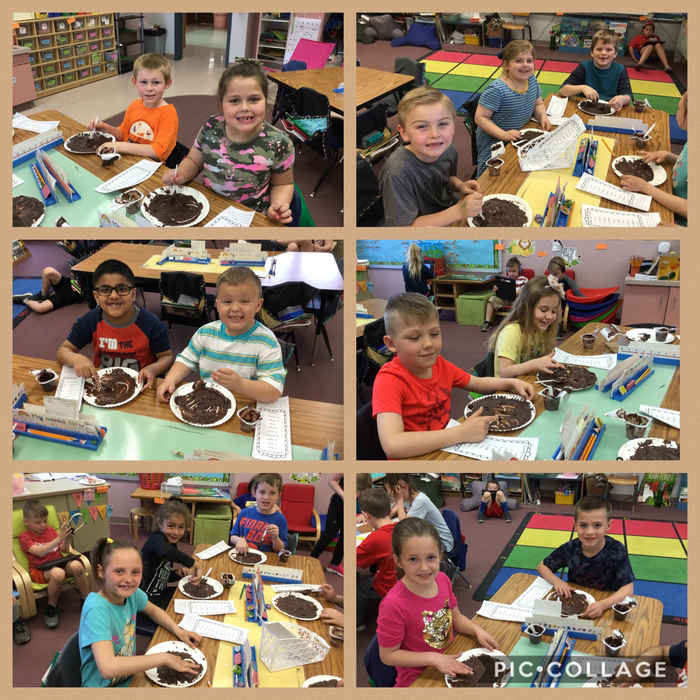 In the spirit of “Chocolate Touch” Mrs. Becker’s class practiced writing their spelling words in chocolate pudding ! 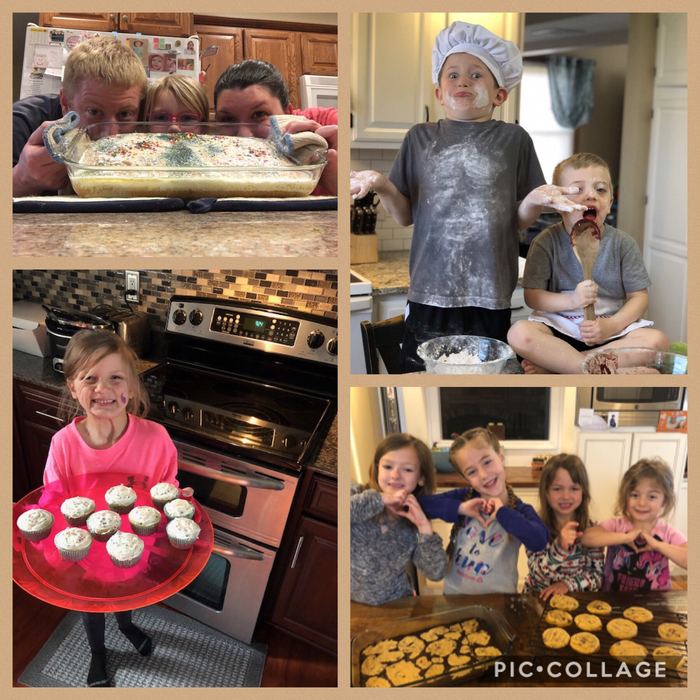 Mrs. Watkins had 13 students send in family baking pictures. 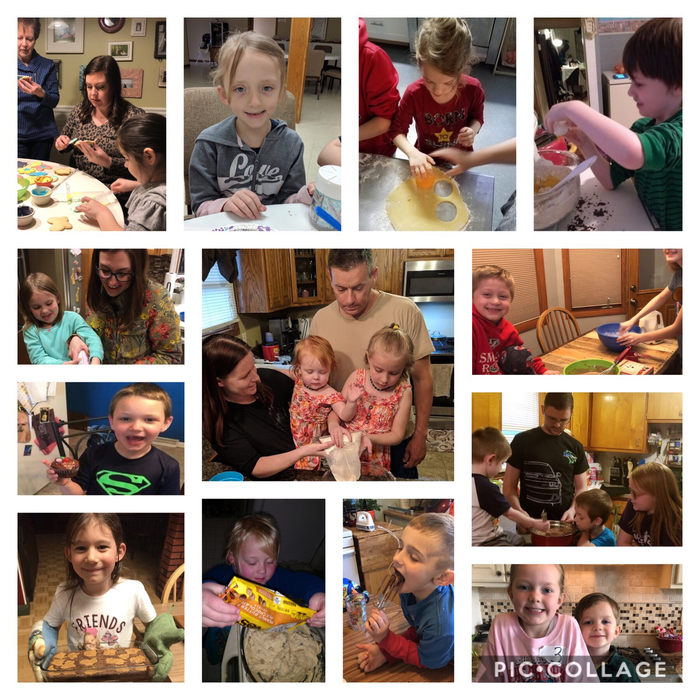 They are enjoying The Chocolate Touch, spending time with family, and making memories! 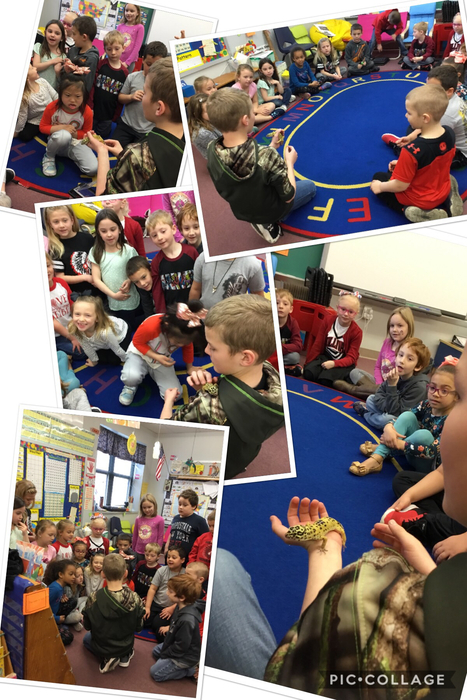 Owen Smith shared his leopard gecko, Toby, with Mrs. Drollinger’s first grade class to help the them learn about the desert and its animals. 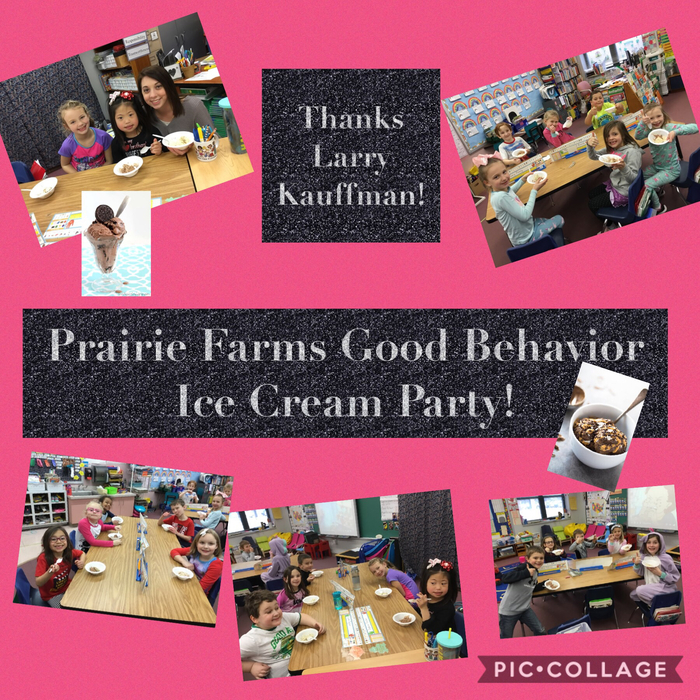 Thanks Larry Kauffman for providing ice cream for our class! 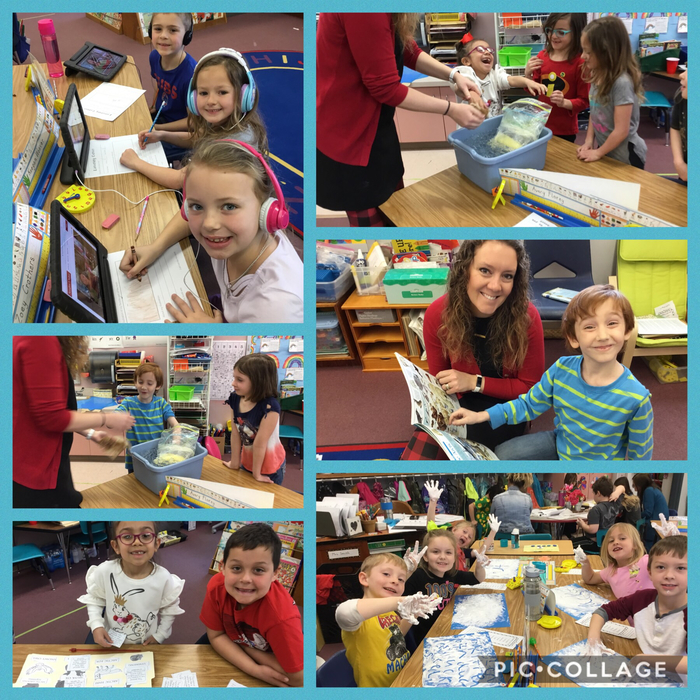 Mrs.Smith created centers to help our class learn about the Arctic habitat! 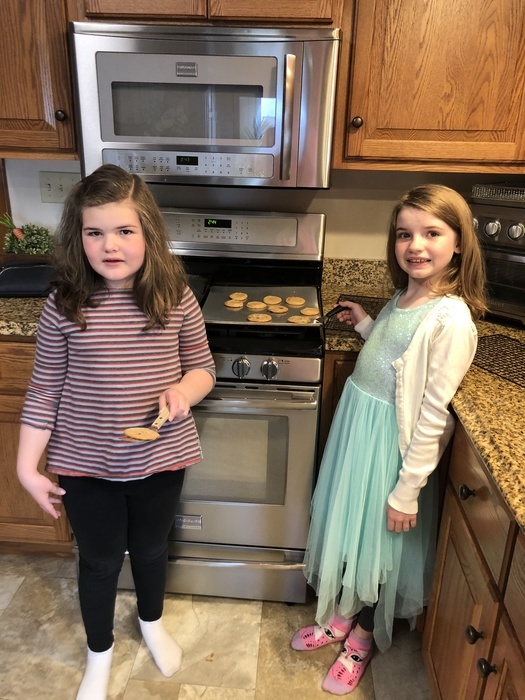 First grade baking picture winners ! Each class picked at random from those who submitted pictures! 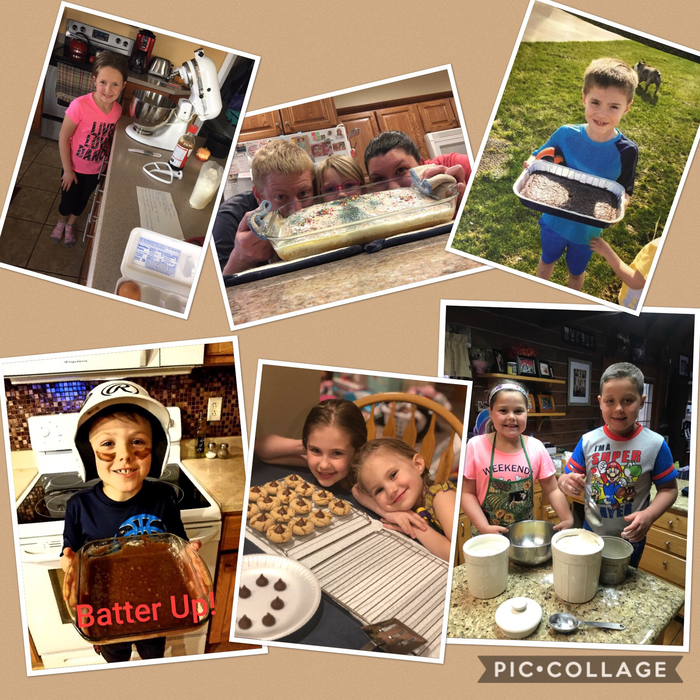 Mrs. Becker’s chocolate touch baking pictures! They all looked so delicious! 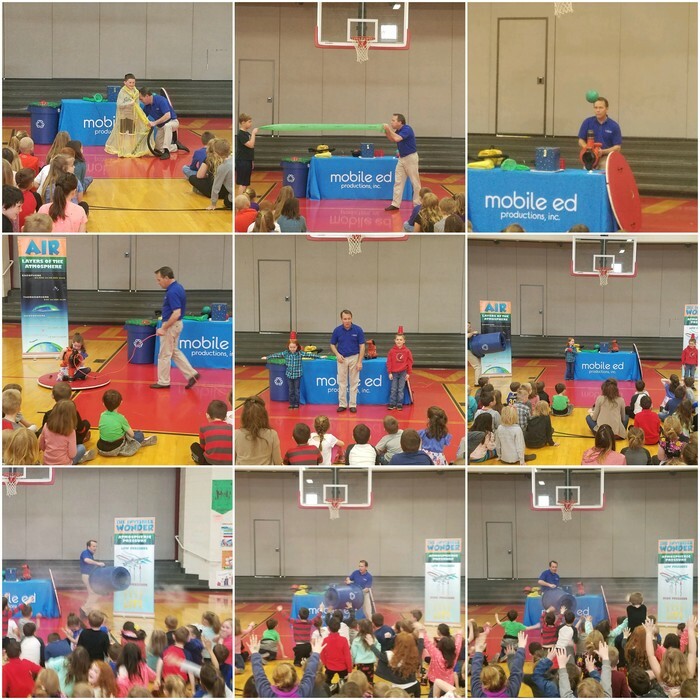 SES students enjoyed their Science Day Good Behavior Celebration courtesy of Mobile Ed. 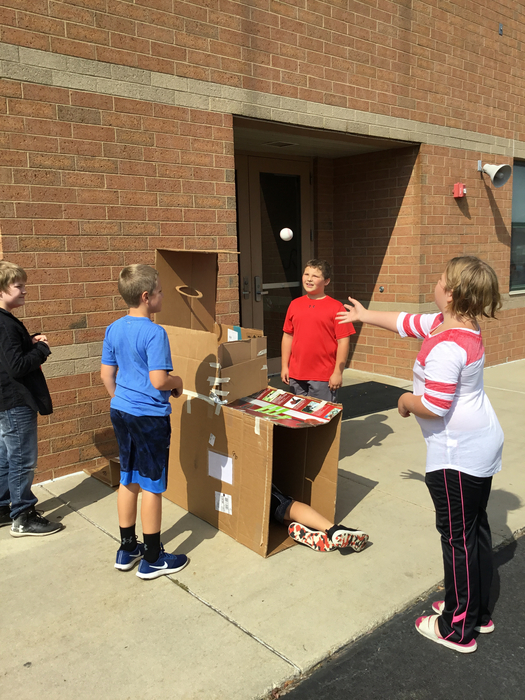 Students got to see a homemade hovercraft in action, a student get shrinkwrapped, and watched other students have cups knocked off their heads by an "air cannon," all while learning about the physics that made such things possible! On his retirement day, SES wanted to show their gratitude to Chief Waggoner. 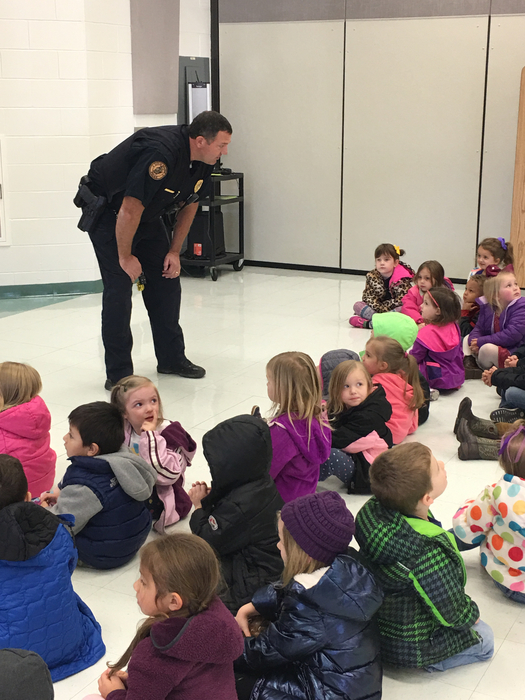 Chief Waggoner has worked hand and hand with our schools, not just to provide security for our students, but to provide much, much more. He showed a genuine concern for our students and support for our staff. You will be missed, Chief! Congratulations! 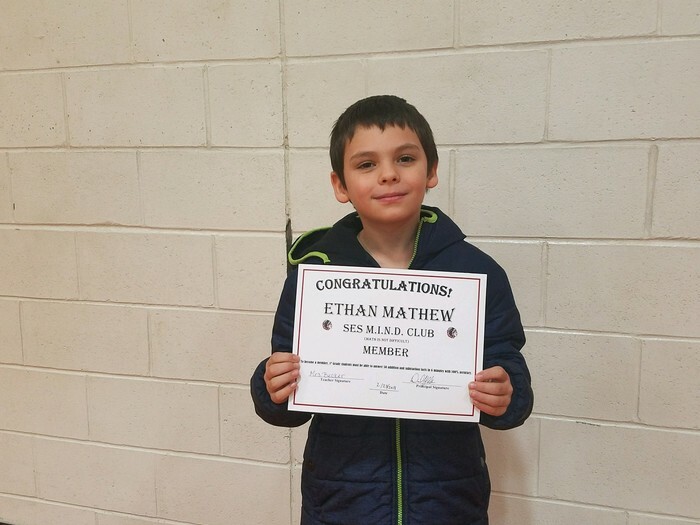 Congratulations to the newest 4th Grade MIND (Math Is Not Difficult) Club member! 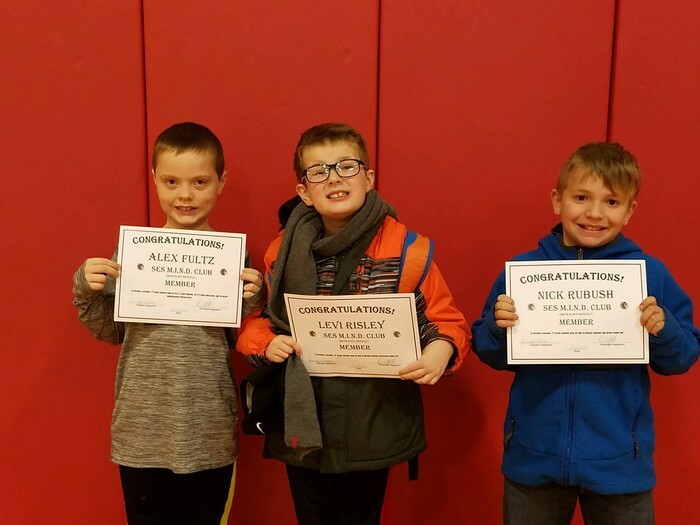 Congratulations to the newest 3rd Grade MIND (Math Is Not Difficult) Club members! 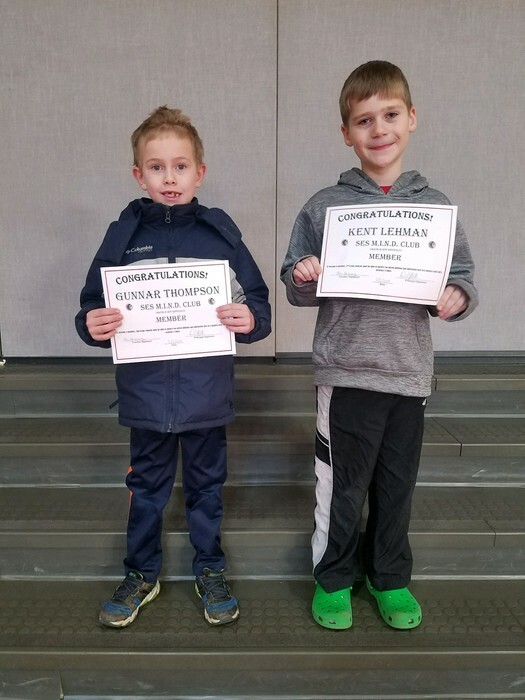 Congratulations to the newest 1st Grade MIND (Math Is Not Difficult) Club members! 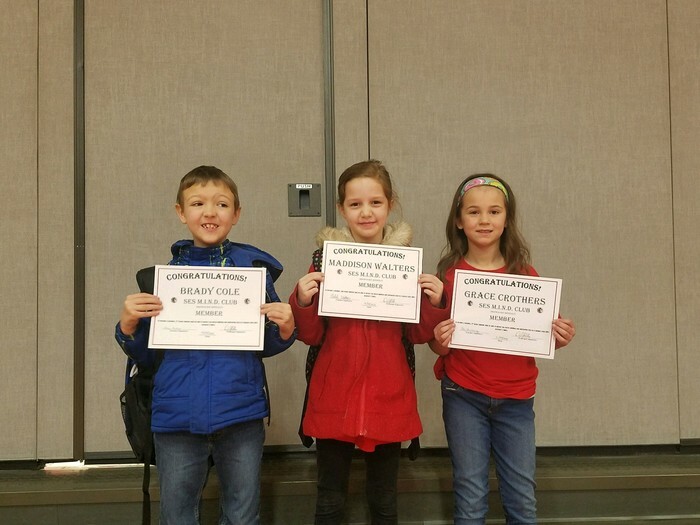 Congratulations to some new 1st Grade MIND (Math Is Not Difficult) Club members! They were inducted a few weeks ago but their forgetful principal forgot to get the pictures on here. Here is an updated calendar for SES for the remainder of the year. Events that are highlighted have been added or changed since the start of the school year. Those that are in bold print involve student attendance. Looking for a fun thing to do with the whole family? Come see the highly popular Awesome Squad at Sullivan Elementary School on April 24 at 6:00 p.m.; it is free to attend! They will perform for around 45 - 60 minutes. This event is sponsored by Bright Start and Baby Talk. 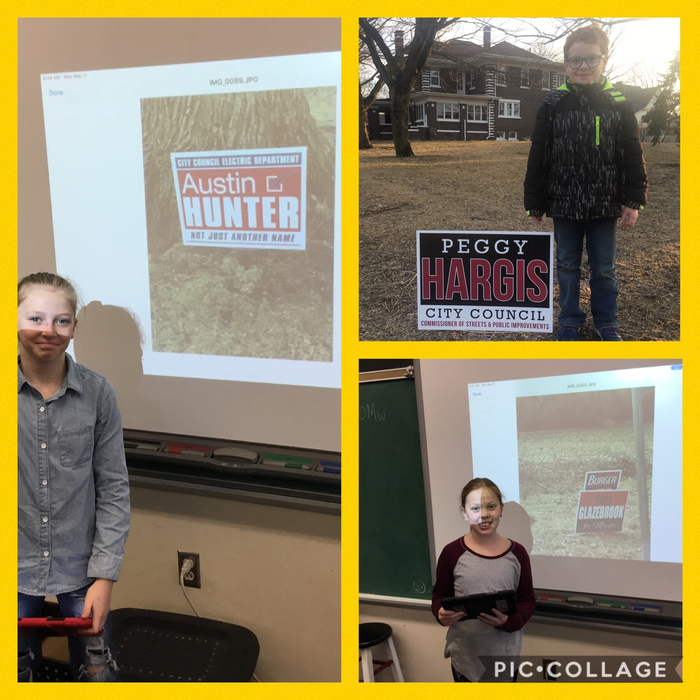 Fourth graders spent a couple of mornings meeting local candidates. 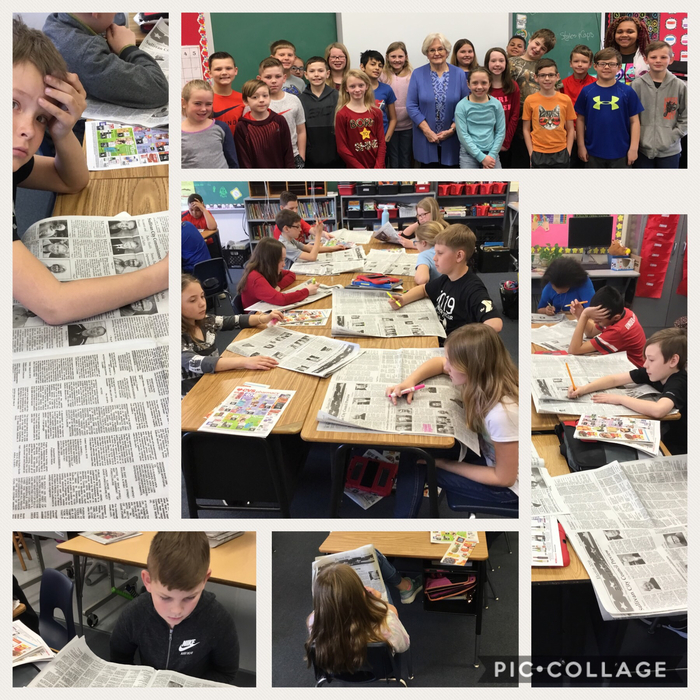 Today Mrs.Hendry’s fourth grade dove into our NewsProgress to read about all the candidates before they participate in a mock election. The actual election is tomorrow, Tues. April 2. Our students remind you to exercise your right to vote. We also wish all the candidates Good Luck! 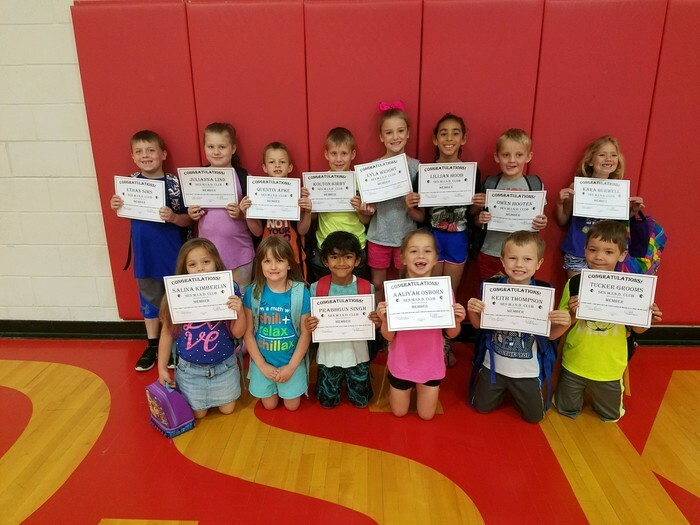 Each month, Sullivan Elementary School recognizes students who go above and beyond expectations by awarding them "Gold Slips." 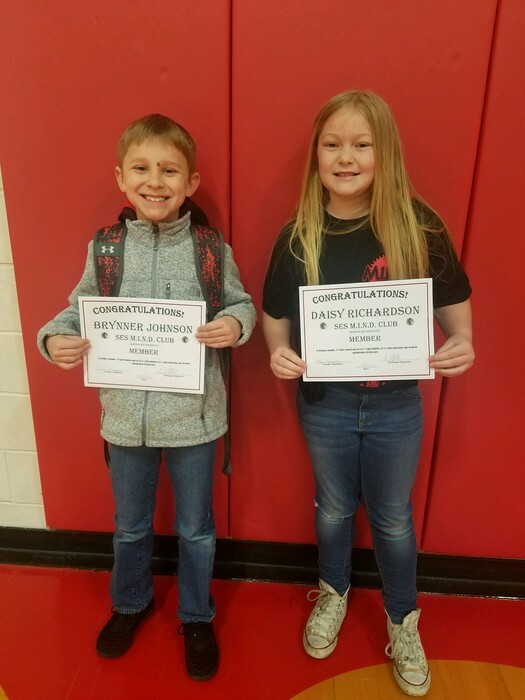 Here are the Gold Slip winners from the month of March: Jozelyn Meador noticed that some of her classmates left equipment on the blacktop after recess. Instead of just leaving it there, she quietly picked it all up to bring inside. How thoughtful, responsible, and respectful! Infinti Phillips saw another student spill a water bottle on the floor and volunteered to clean it up without being asked. Addalyn Hendry is always helping others! 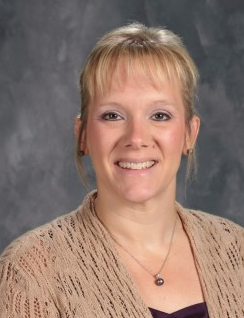 When another student needed something, Addy selflessly gave that student hers. She is helpful not just in the classroom, but everywhere. Emmersyn Jiannoni's determination and hard work is very impressive. She has been a great role model! Connor Ruge opens the door for Mrs. Crowe nearly everyday when she has a big load of trash to take out of the cafeteria. He has done this the entire school year! 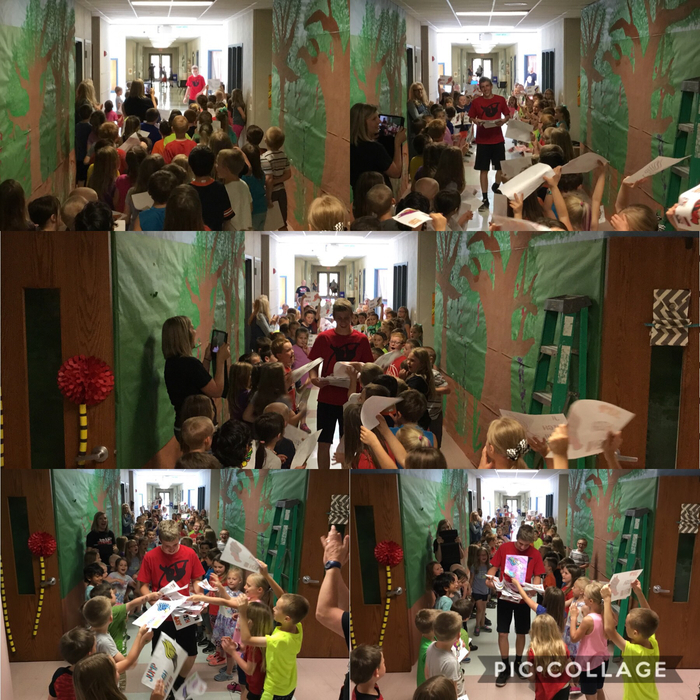 Mrs. Leach and Coach Typer took kindergarten students on a "bear hunt" on Friday! 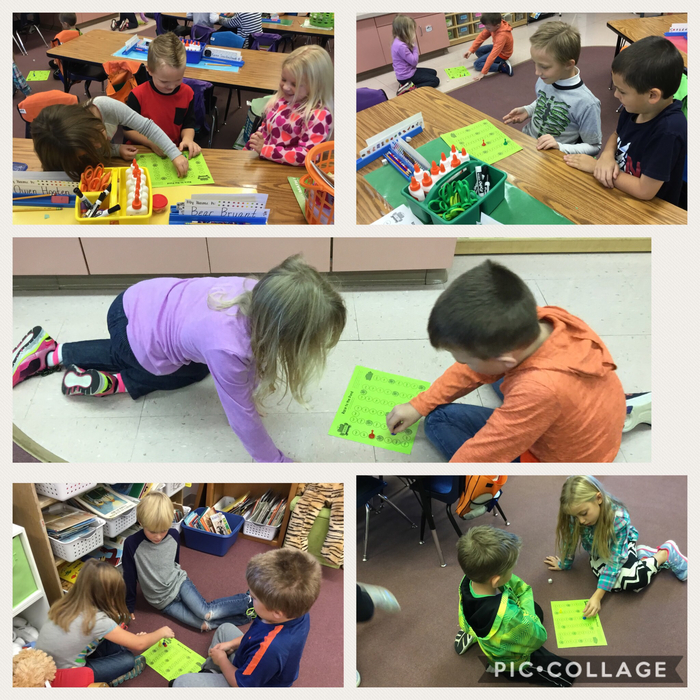 Every Friday, Mrs. Hussong’s second graders and Mrs. Watkins’ kindergarteners come together for reading buddies. 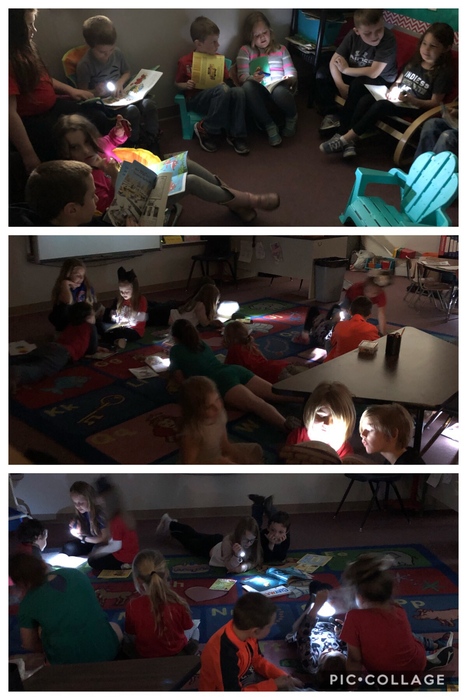 Today they enjoyed a new twist to reading: Flashlight Friday. 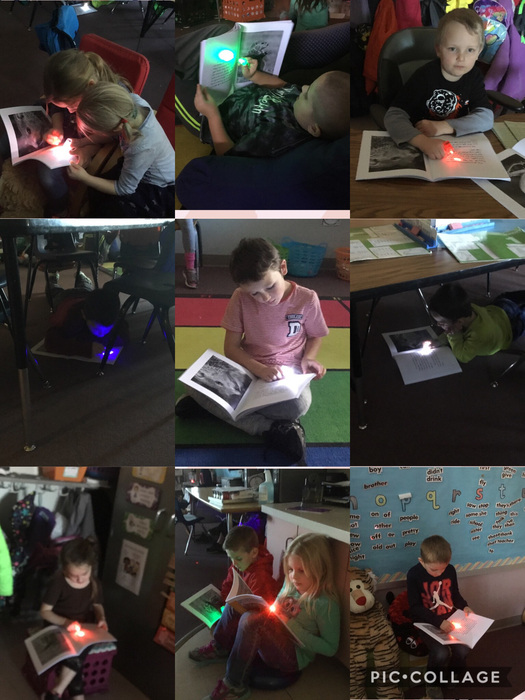 The gloomy weather made it a perfect day for turning off the lights and reading around the room with flashlights! 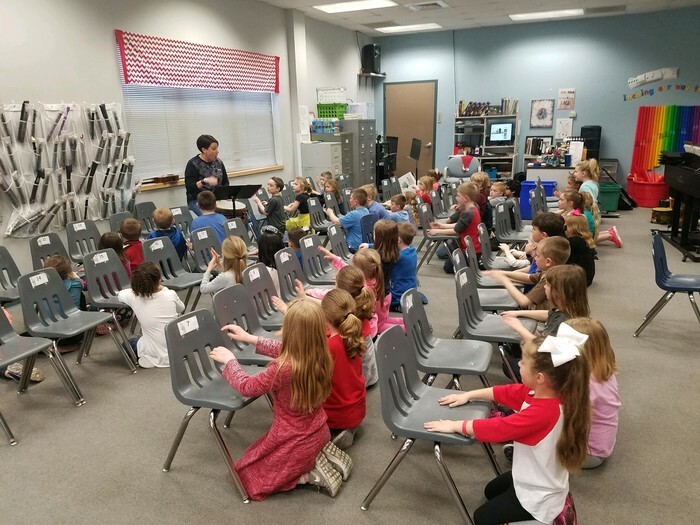 Mrs. Leach's 1st Grade music class turned their chairs into percussion instruments to play "Chicka Chicka Boom Boom" today. Just a reminder to students that their entries for the "On The Same Page" Candy Bar Wrapper Contest are due on Monday, April 1st! 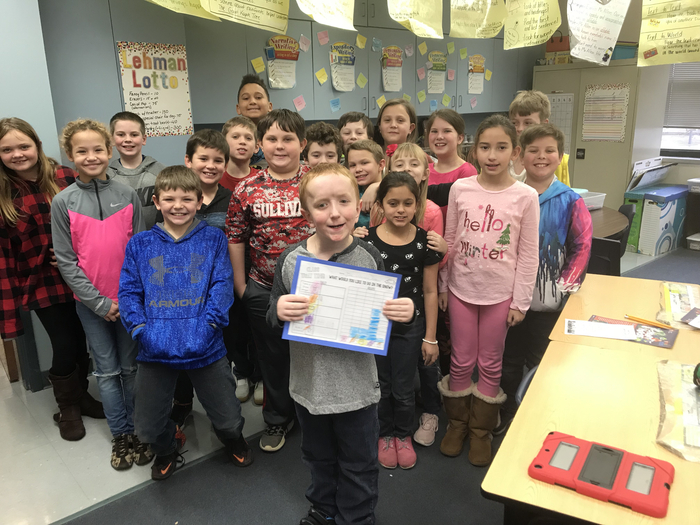 Congratulations to the newest 4th Grade member of the MIND (Math Is Not Difficult) Club! We “donut” want the month of March to pass by without wishing a Happy Birthday to Coach Typer, Mrs. Bragg, and Mrs. Fleming ! Just like in Chapter 2 of "The Chocolate Touch," a candy shop appeared out of nowhere in the lobby of SES while students were at lunch! The shopkeeper, with the help of Mrs. Graham, handed out chocolate coins or Smarties to all the students. 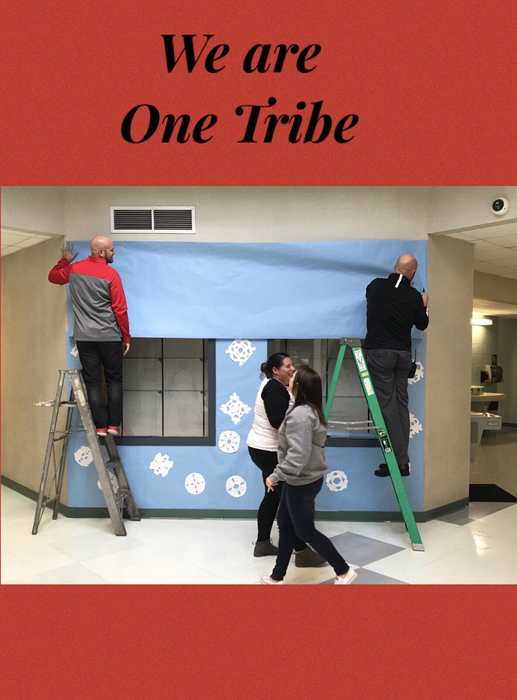 Today SES had it's big reveal of the book that all SES students and staff will be reading for the "On The Same Page" project. For the next couple weeks, we will be reading "The Chocolate Touch." Please check out our Facebook page or YouTube channel tonight anytime after 6 as our first guest reader will read Chapter 1! Below is the schedule for when each chapter will be aired (each will be posted at 6 p.m.): Chapter 1: 3/25 Chapter 2: 3/26 Chapter 3: 3/27 Chapter 4: 3/28 Chapter 5: 3/29 Chapter 6: 4/1 Chapter 7: 4/2 Chapter 8: 4/3 Chapter 9: 4/4 Chapter 10: 4/8 Chapter 11: 4/9 Chapter 12: 4/10 Please join us as we read this delicious book! 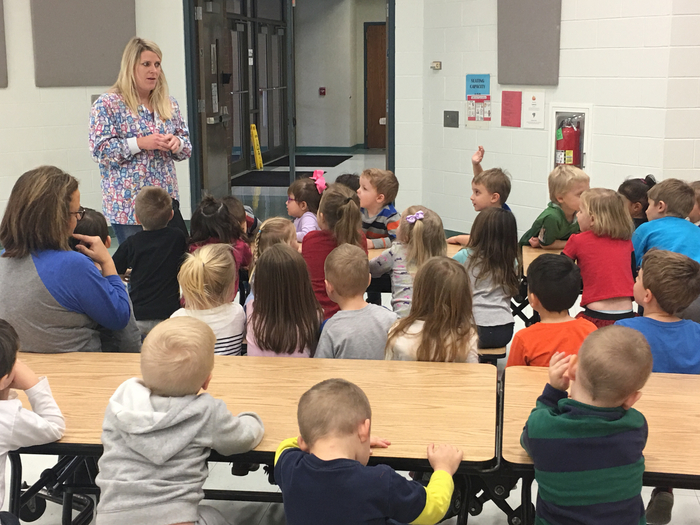 Mrs. Becker’s class loves when Miss Britney comes to teach us about healthy kids from Sarah Bush Lincoln ! 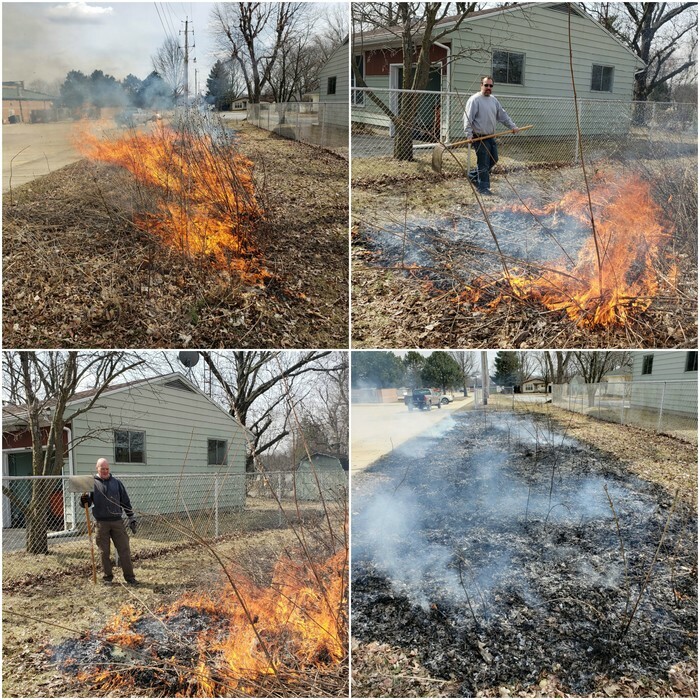 Zak Standerfer and Dave VanDeursen recently conducted a "controlled burn" at the prairie plot next to Sullivan Elementary while students were on Spring Break. 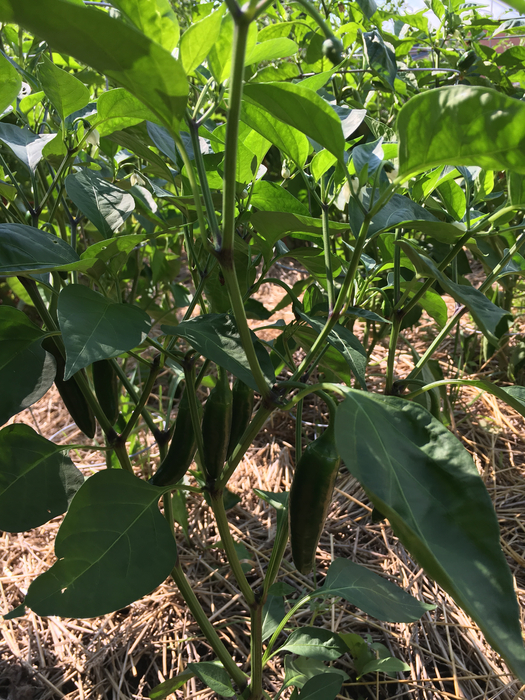 The controlled burn helps maintain the health of the habitat by managing weeds and restoring nutrients for desired plant growth. As sad as we are that our hallways will be silent this coming week, we hope you all have a wonderful spring break! When we return we will be announcing our exciting initiative, On The Same Page, community/school book reading. We will be announcing the book on March 25th and reading will begin that day (one chapter will be read every school day evening). During the initiative, check our Facebook page for video of different guest readers each evening at 6. We will keep you posted on more information! 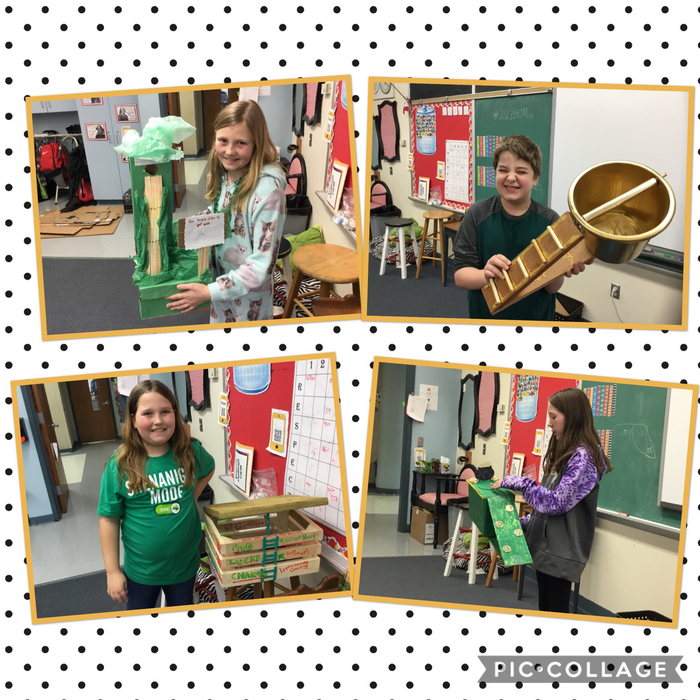 Mrs. Guyot, Florey, and Grohler’s students enjoyed thematic St. Patrick’s Day Activities. They ended their celebration with eating green ice cream. 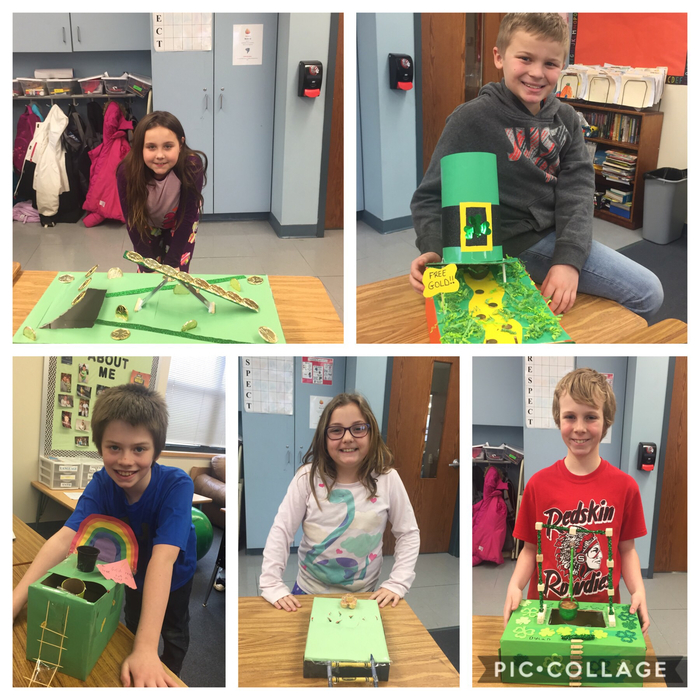 Mr. Campbell’s class made leprechaun traps using at least one simple machine in their design. 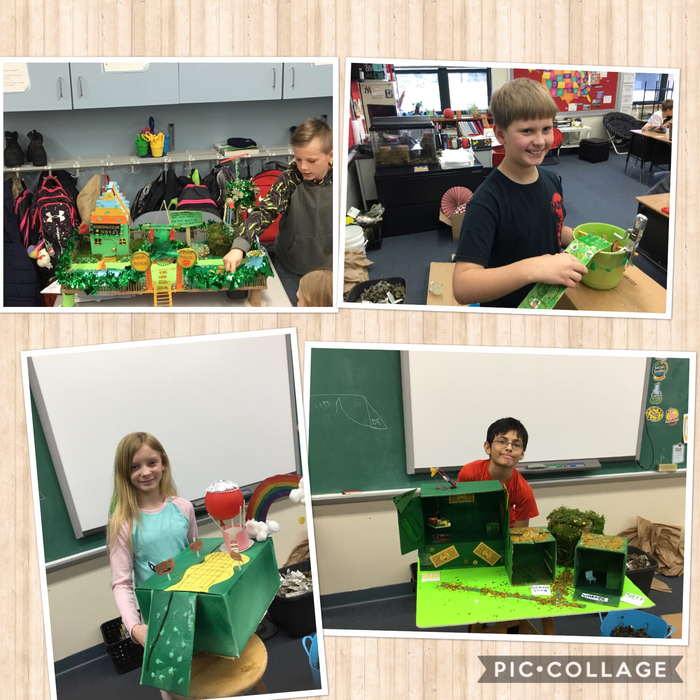 Mrs.Hendry’s 4th grade was excited to share their leprechaun traps. 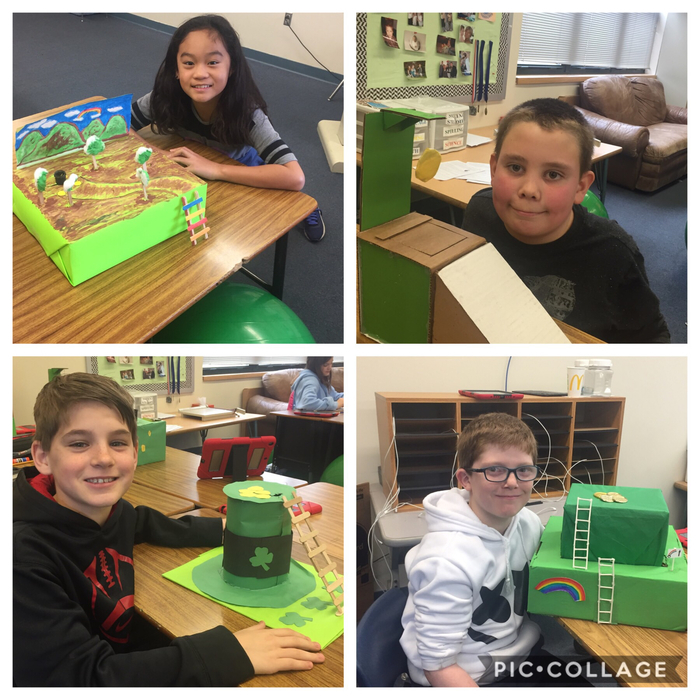 Some worked independently and some worked with their families to use Simple Machines in their construction of a Leprechaun Trap. 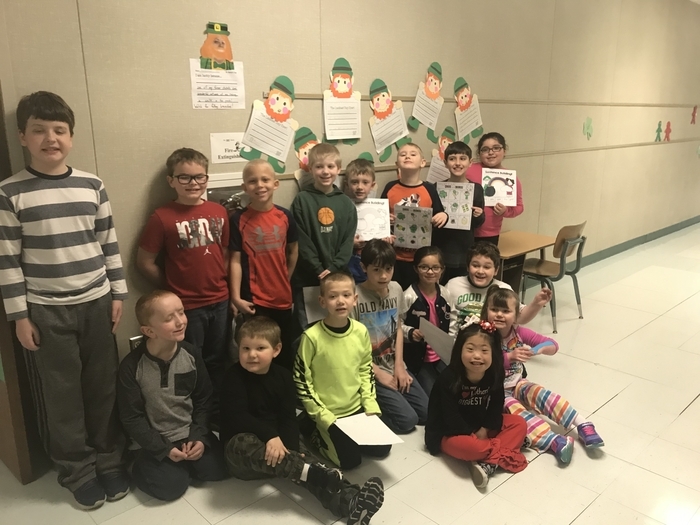 One student was concerned and asked, “How will the Leprechaun eat if he gets stuck in one during Spring Break?” Mrs.Hendry assured them she’ll check on Monday and release any that get caught. 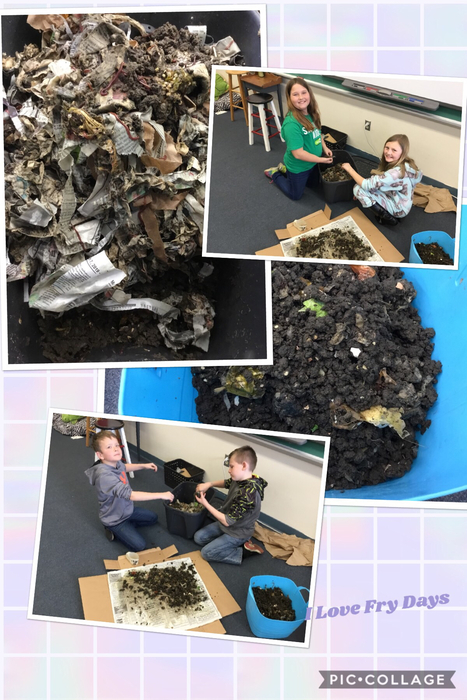 It’s time to harvest our Vermicompost castings to add to our Sullivan Elementary School Community Garden. Mr. Allen challenges staff at the SIP after lunch. 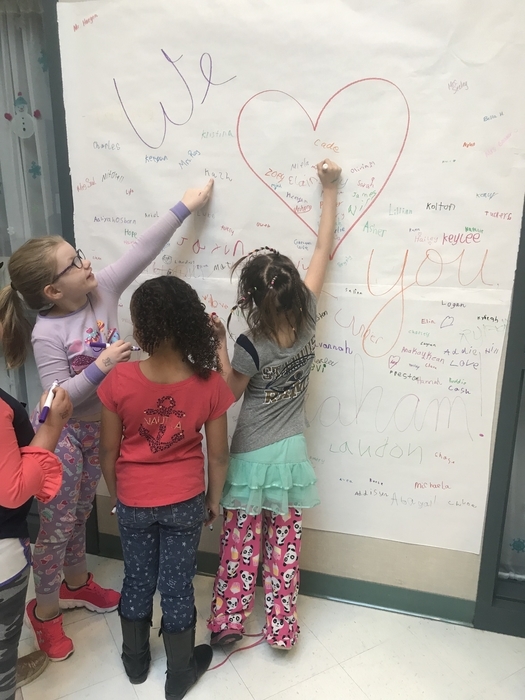 In celebration of School Social Worker Week, SES students and faculty signed a poster sized card showing Mrs. Graham our appreciation for her. 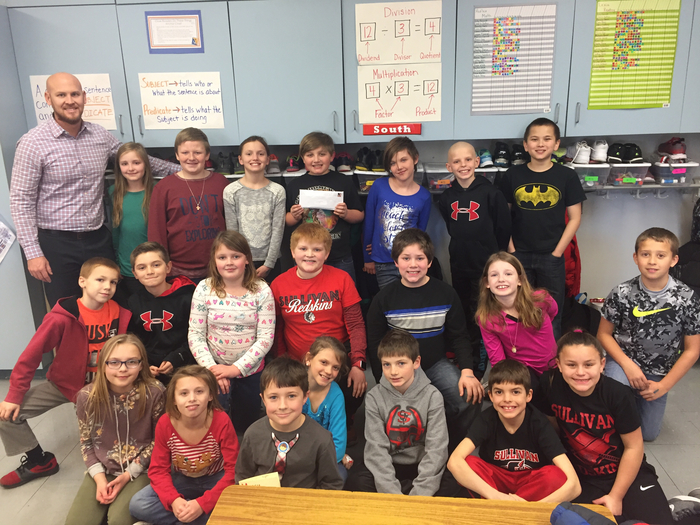 Each month, students at Sullivan Elementary who go above and beyond expectations are awarded a "Gold Slip." 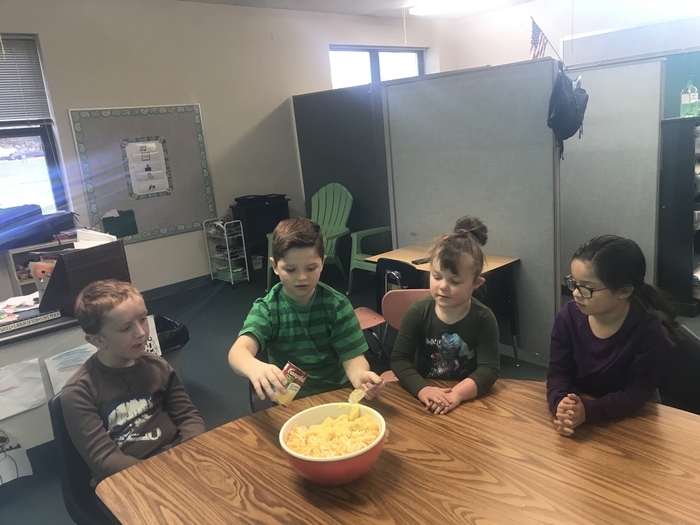 Here are the Gold Slip winners for the month of February (pictured from left to right): The kindergarten class was making a mess with the trays after lunch and Callum Welty stopped and straightened up the trays and told the others to stop and look at the trays. How responsible of him! Scarlett Griffin is a good friend and great helper! 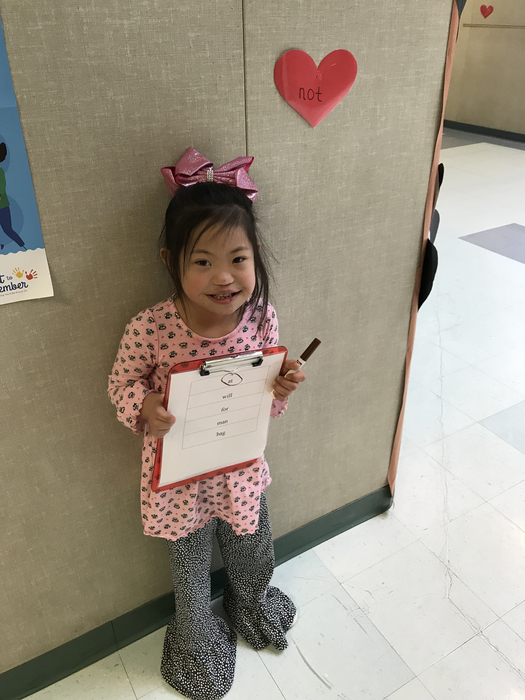 She used her play time to help her friends write to 100! 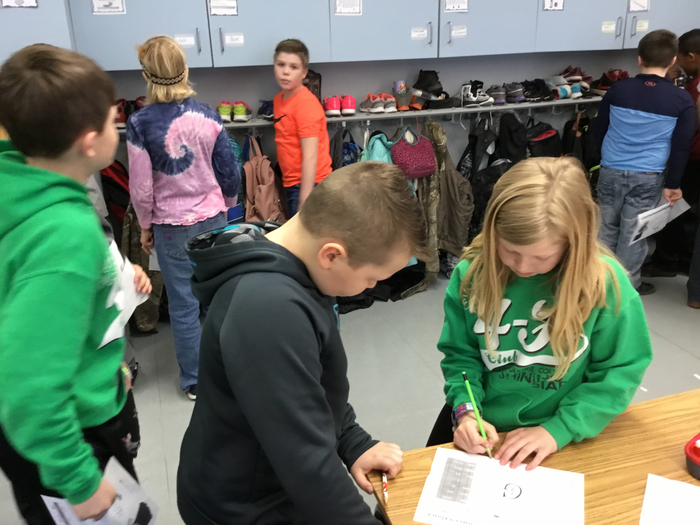 After every indoor recess, Savanna Dendy always takes extra time to make sure all of the games are organized and put away neatly without being told. Maddison Walters is always pushing herself to do better and seeks a challenge. She always gives 100%! Come and cheer for your favorite team during the Battle of the Badges. They are all heroes, but only one will win the game. Will it be the Sullivan Police Department or the Sullivan Fire Department that claim the title? Join us for a fun evening, beginning at 6 p.m. on March 14th in the high school gym. A hot dog supper will precede the game at 5 p.m. with proceeds going to post prom in the High School Commons. This event is free for all to enjoy! 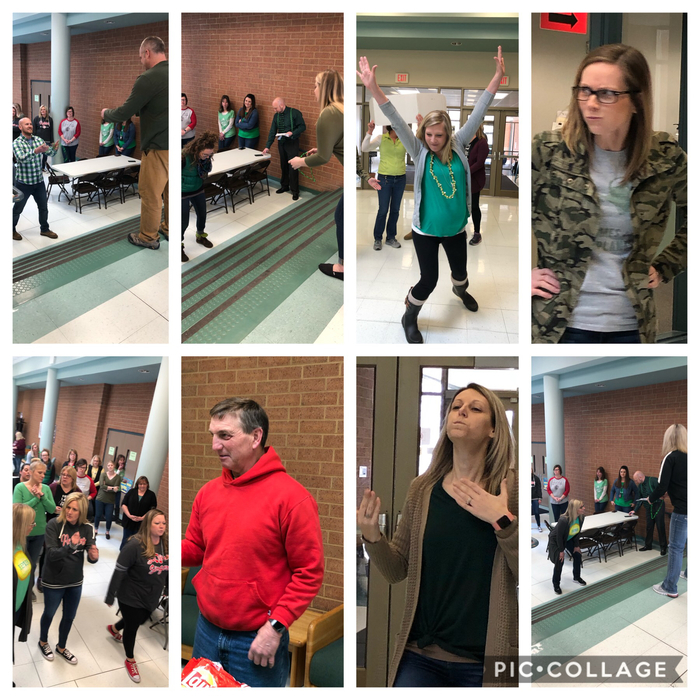 Lots of fun things happening including a 50/50 drawing, SES staff cheerleaders and more! All proceeds from the game will go to the Sullivan PTO and their efforts to support SES students and staff. Donations are appreciated and accepted at the door. A very fun night out for members and adult volunteers of Helping Hands in Sullivan. 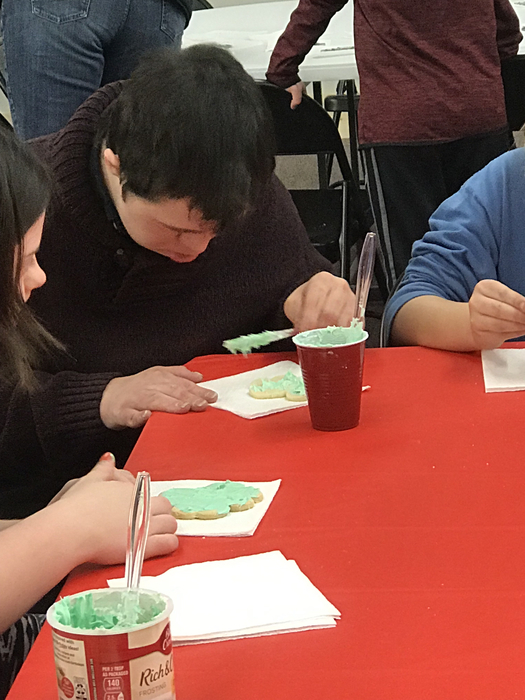 Building 1225 was a wonderful venue to host our Helping Hands in Sullivan Fun Night. 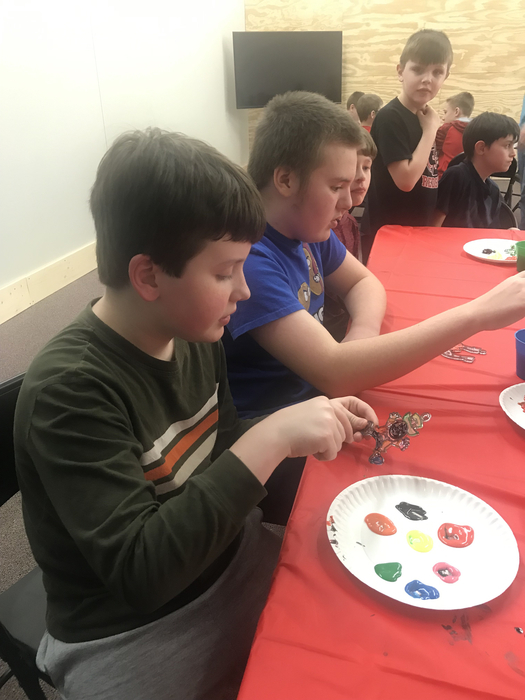 Another fun and successful night for Helping Hands in Sullivan with pizza, crafts, and more activities at Building 1225. It was a very rewarding and fun-filled night for all involved. Mr. Hutchings was a longtime counselor at Sullivan High School. During his time there, he inspired and motivated students to make a better life for themselves and was loved by faculty and students alike. The Dennis Hutchings Memorial Scholarship has been created in his memory. This scholarship will be awarded to a Sullivan High School student who is entering a college program focused on obtaining certification in the field of education. If you would be interested in donating to this scholarship, please mail checks to Sullivan High School, ICO Nikki Cloyd, 725 North Main Street, Sullivan, Illinois 61951. Checks can be made out to "Sullivan High School." 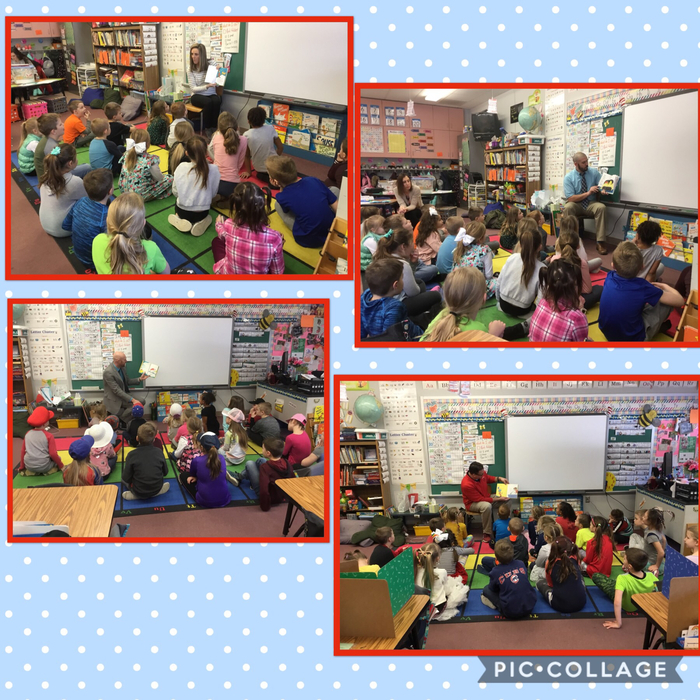 Mrs. Becker’s class loved having mystery readers this whole week in honor of Dr. Seuss week ! A big thank you to Mrs. Reeder, Coach Becker, Mr. Walk and Coach Van Pelt. 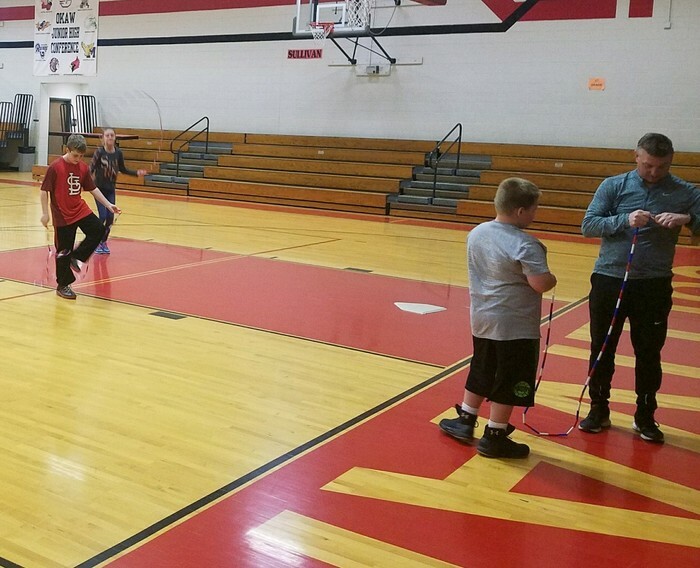 Officer Hayse and Coach Typer showed off their jump roping skills during Jump Rope for Heart. This is the 17th year that Coach Typer has coordinated the event, and this year alone students raised an impressive $12,400! Way to go Coach and kids! 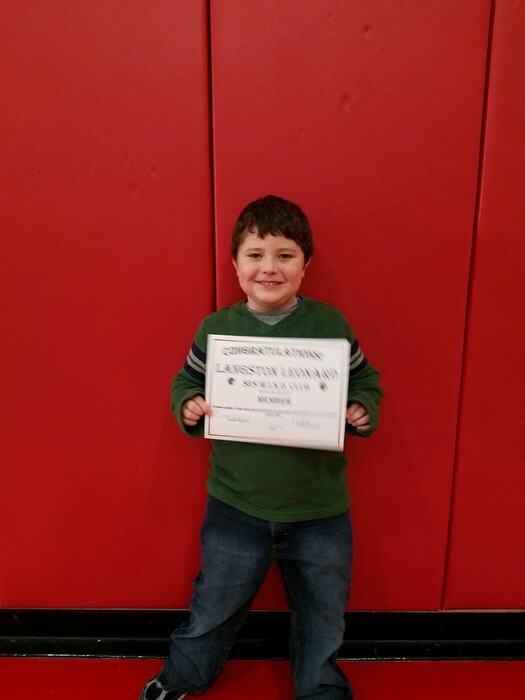 Jonathan Iacobazzi finished first in our Moultrie County Spelling Bee against Lovington. His winning word was Caribbean. The Regional Bee will be held March 16th in Decatur. 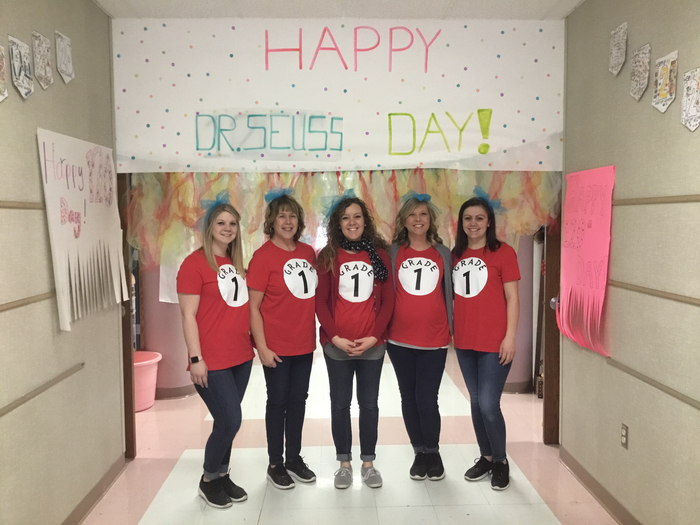 First grade teachers are excited to celebrate Dr. Seuss all week long ! 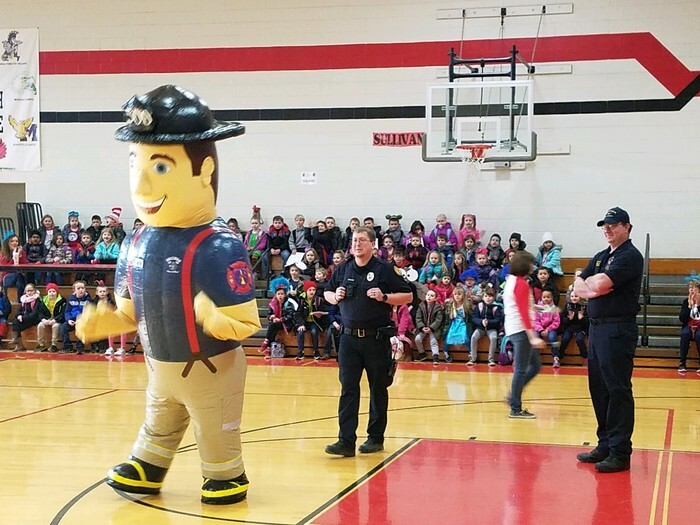 The Sullivan Police and Fire Departments came to SES to promote their Battle of the Badges basketball game that will take place at 6 p.m. on March 14th in the high school gym. A hot dog supper will precede the event at 5 p.m. in the high school commons. All proceeds from the game and dinner will go to the Sullivan PTO. As you can see, the fire department has taken the early lead in promotional points! 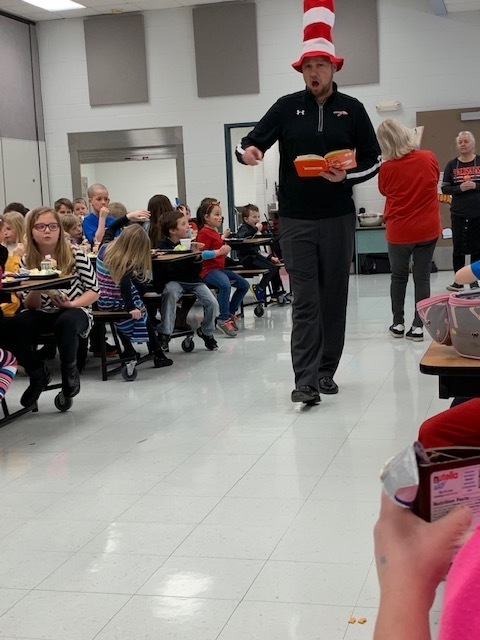 Mr. Allen really got into character reading Green Eggs and Ham during lunch today! 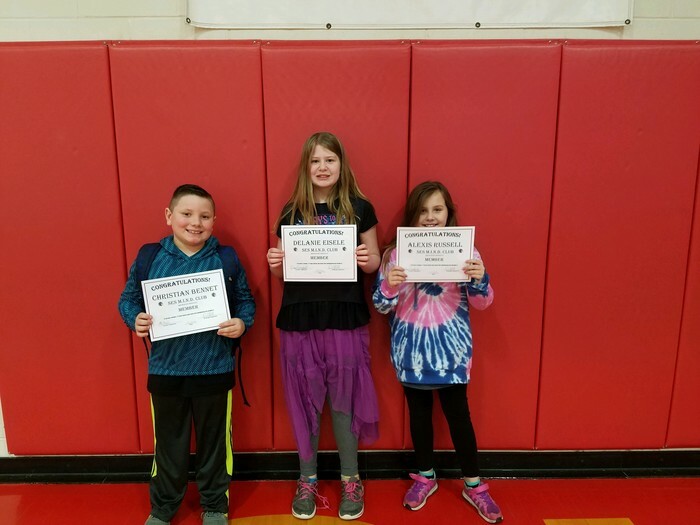 Congratulations to the newest 4th Grade members of the MIND Club! 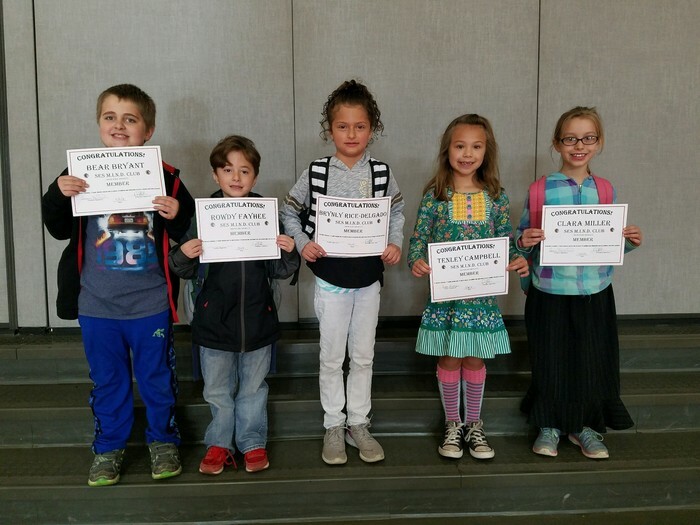 Congratulations to the newest 2nd Grade members of the MIND Club! 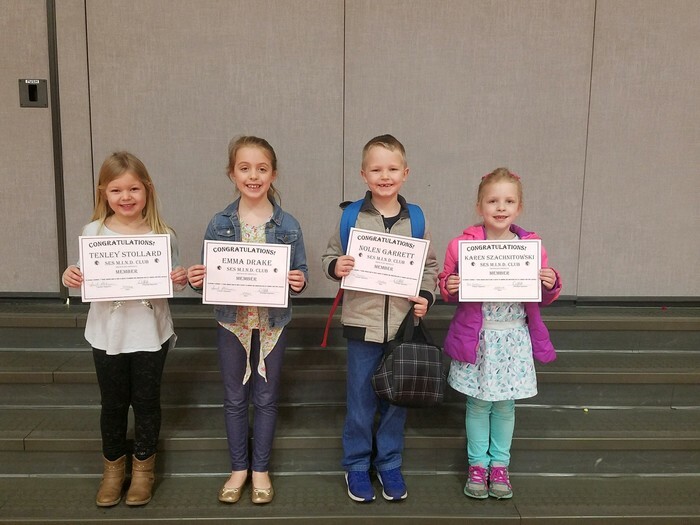 Congratulations to the newest 1st Grade members of the MIND Club! 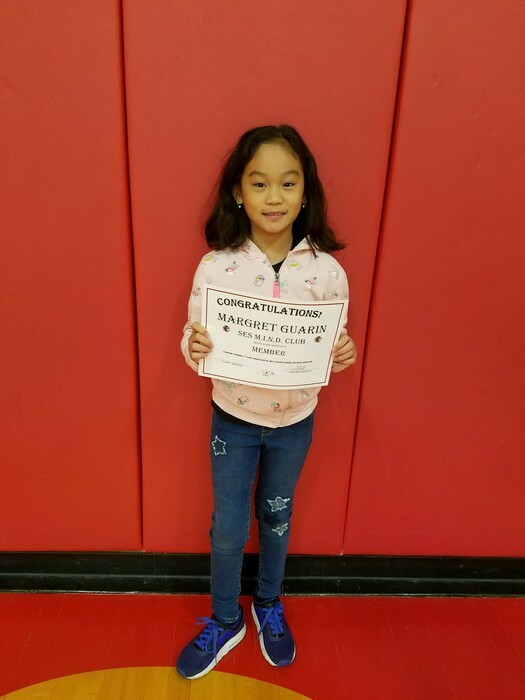 Congratulations to the newest 1st Grade member of the MIND Club! 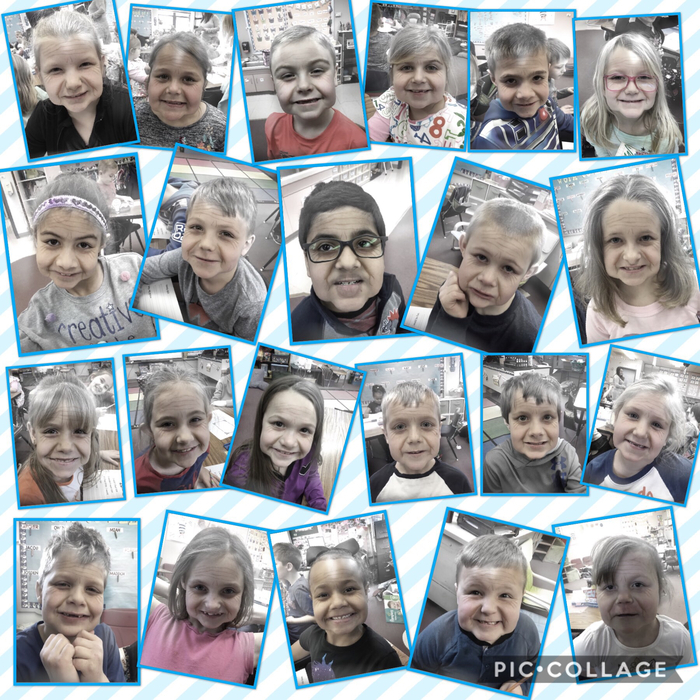 Mrs. Becker’s class loved celebrating 120 day and are the cutest 120 year olds ! 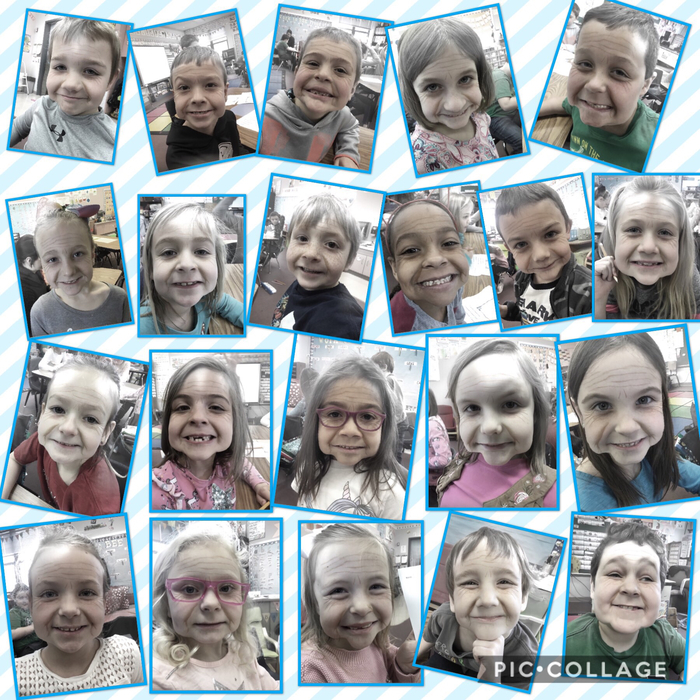 Ms. Mars’ class loved celebrating 120 day and are the cutest 120 year olds ! 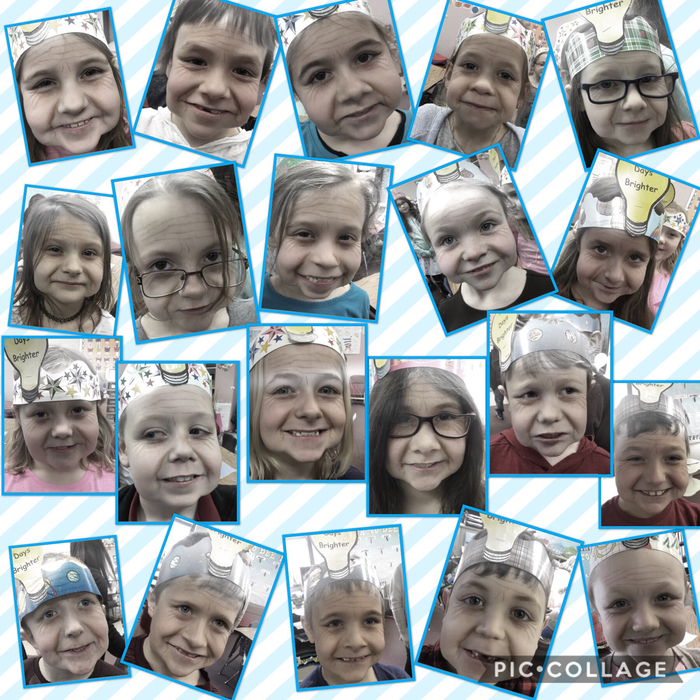 Mrs. Fultz’s class loved celebrating 120 day and are the cutest 120 year olds ! 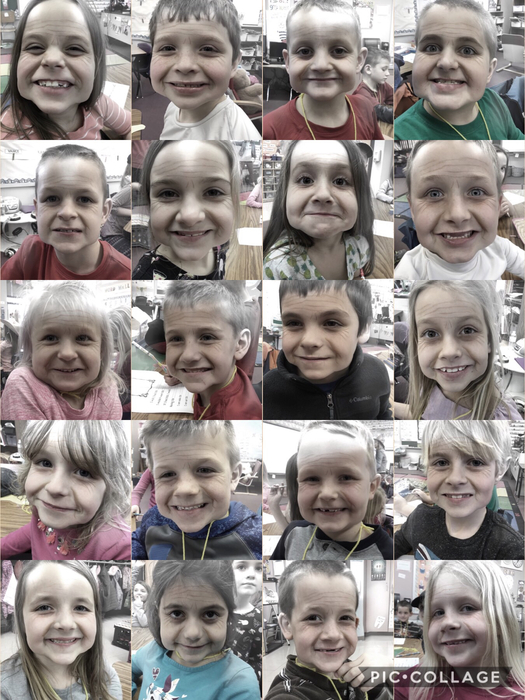 Mrs. Drollinger’s class loved celebrating 120 day and are the cutest 120 year olds ! 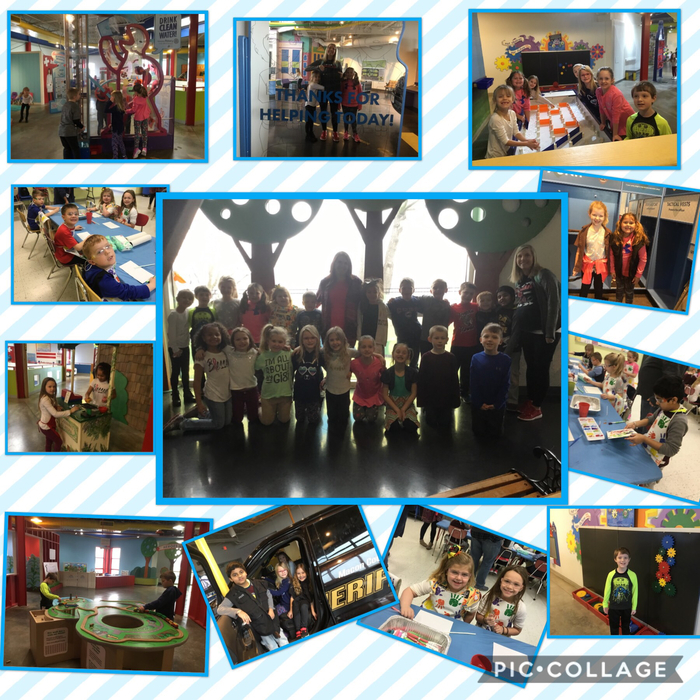 Mrs. Becker’s class had a great time on our field trip to the Children’s Museum! We were lucky enough to have a grant pay for our trip. The students had a great day making art and playing! Today is the County wide Spelling Bee. 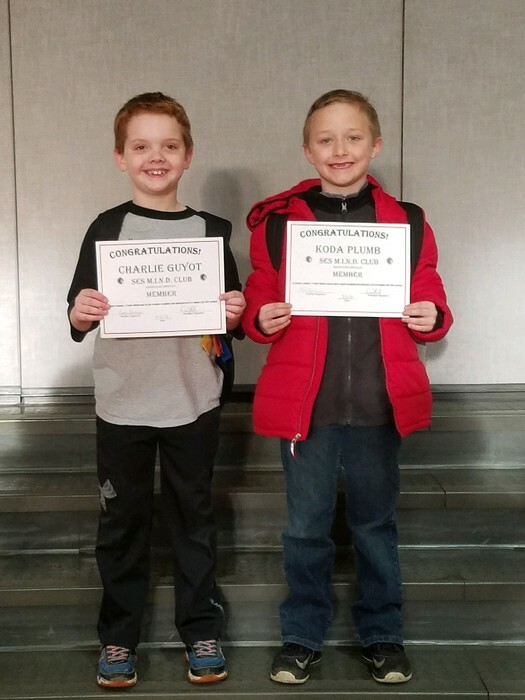 Join us at the Little Theater at 4pm to watch Sullivan and Lovington compete for top Speller. 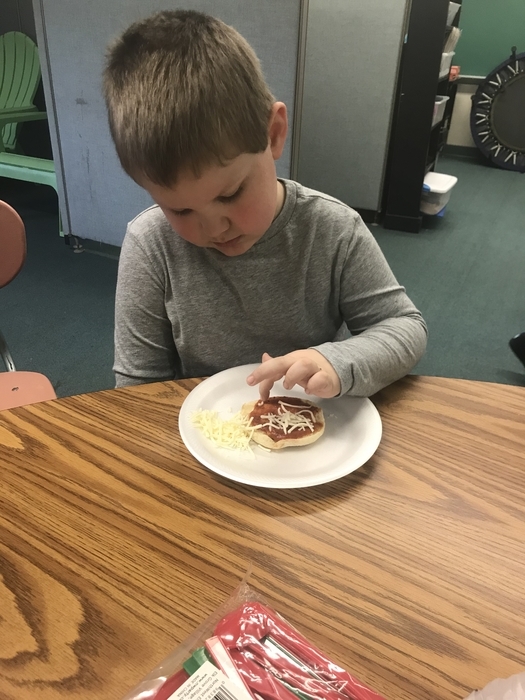 Mrs. Grohler and Mrs. Guyot’s students enjoyed finishing their pizza unit with making English muffin pizzas. On Friday, March 1st, students of SES will be participating in "Read Across America" Day. 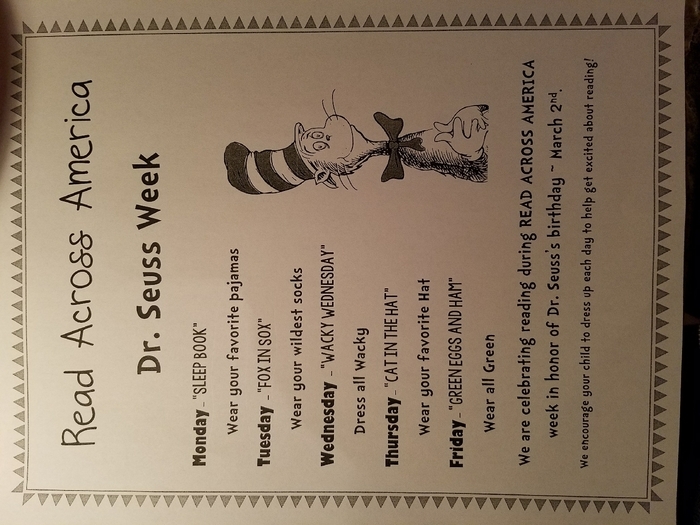 Students are encouraged to dress up on this day as either a Dr. Seuss character or as their favorite character from any book. Don’t forget to order your 2018/2019 yearbook !! Money can be turned into the office or you can order online ! The schedule/bracket for the remainder of the Future Redskins Tournament. 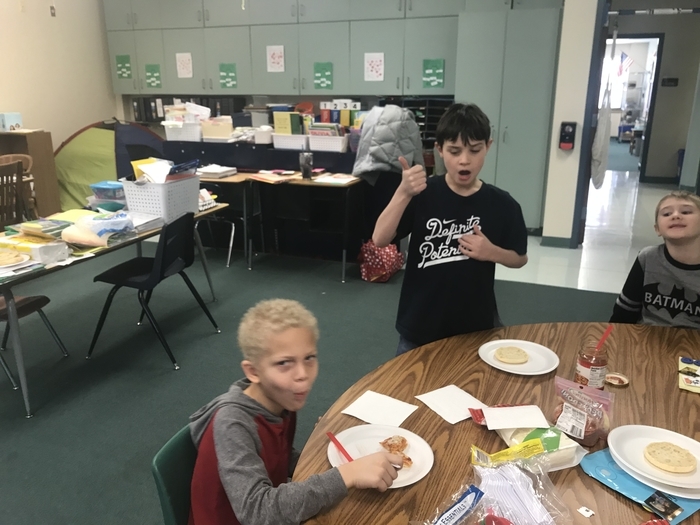 Mrs. Grohler’s students enjoying Valentine games. 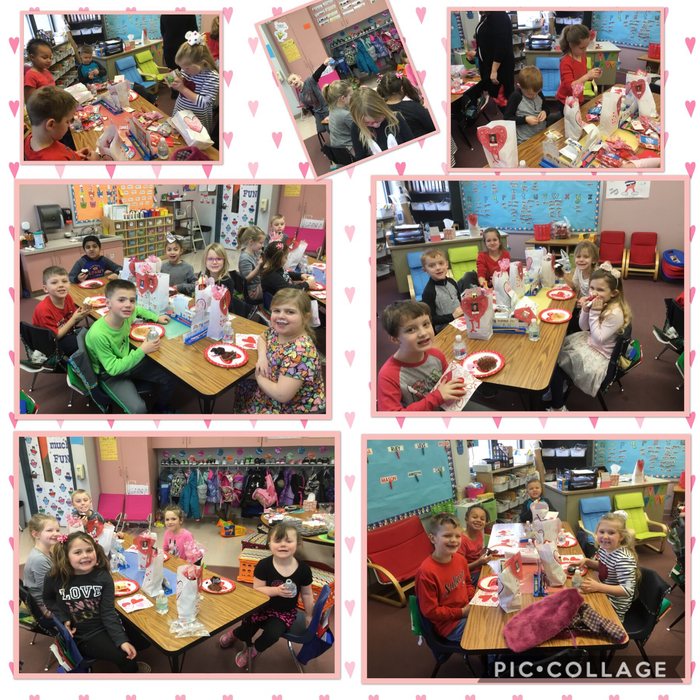 Happy Valentines Day from Mrs. Becker’s class ! 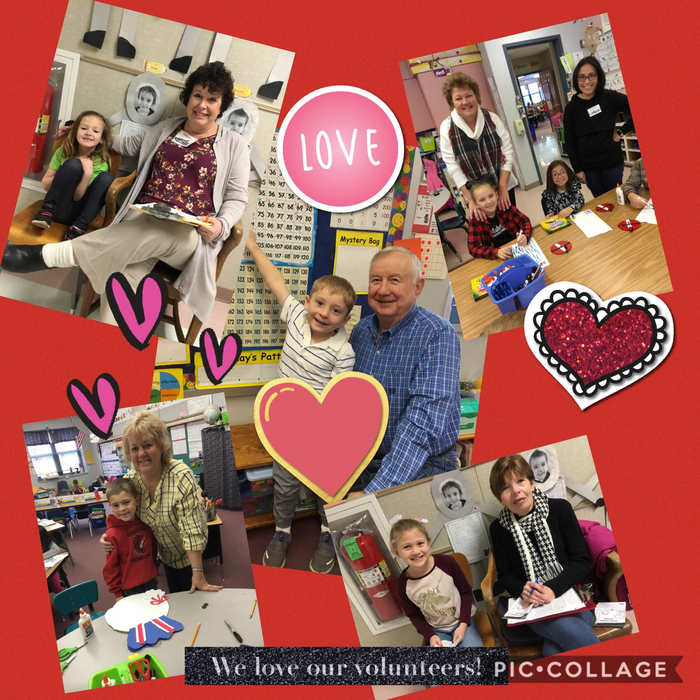 Mrs. Drollinger’s class loves our volunteers! 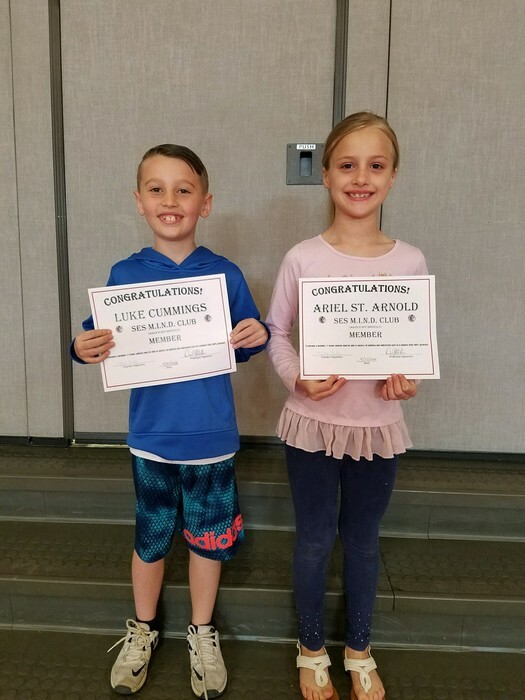 Congratulations to the newest 2nd Grade members of the MIND Club (Math Is Not Difficult)! 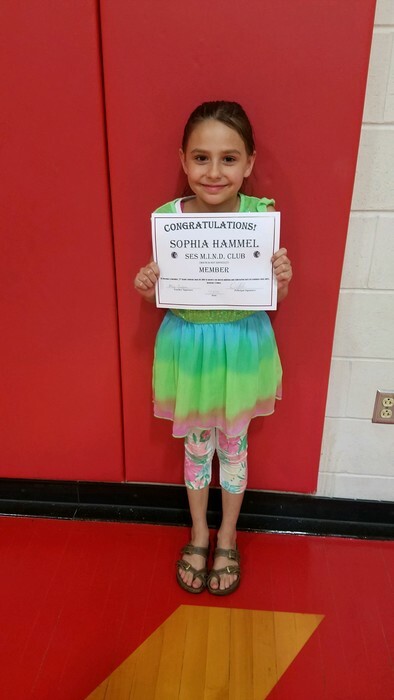 Congratulations to the newest 1st Grade member of the MIND Club (Math Is Not Difficult)! 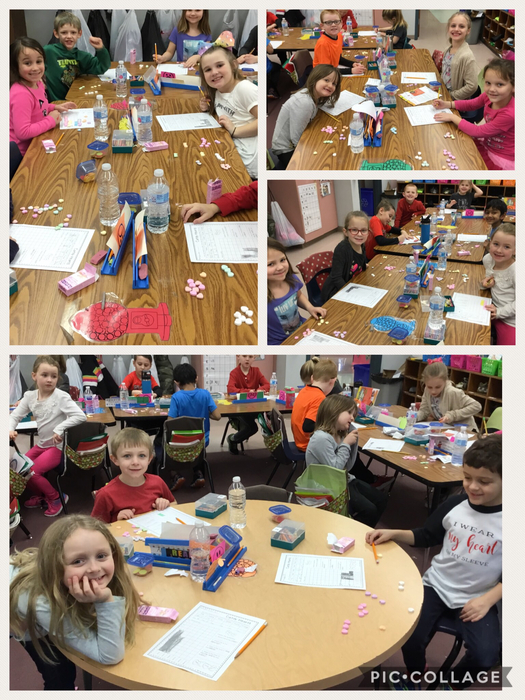 Mrs. Becker’s class loved celebrating Valentine’s Day and studying graphs. 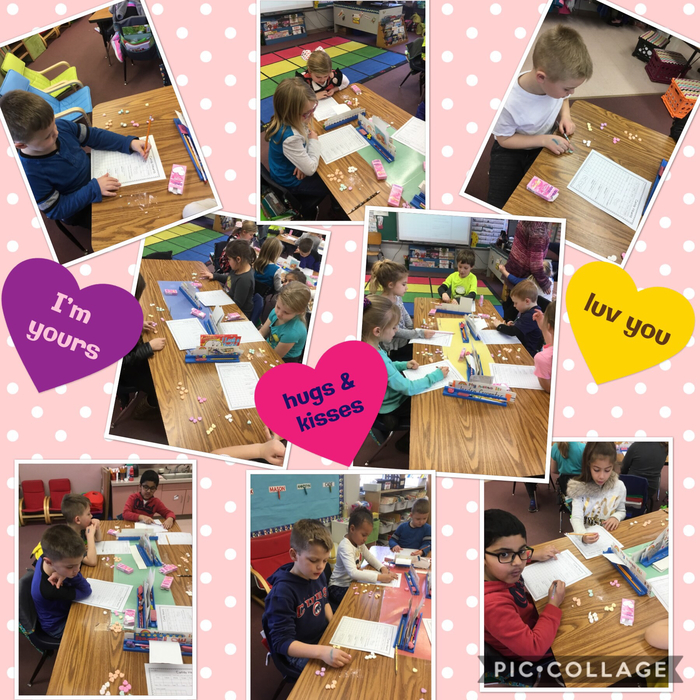 We used our candy hearts to make a tally chart and bar graph ! 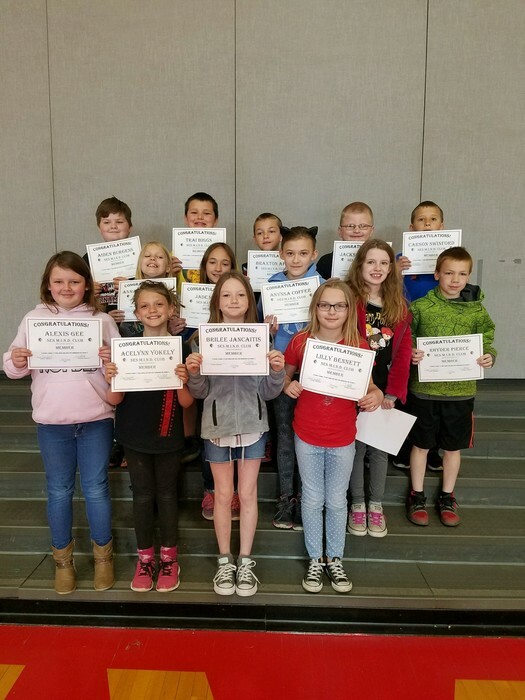 Every month, Sullivan Elementary School celebrates students who have received "Gold Slips" for going above and beyond expectations. 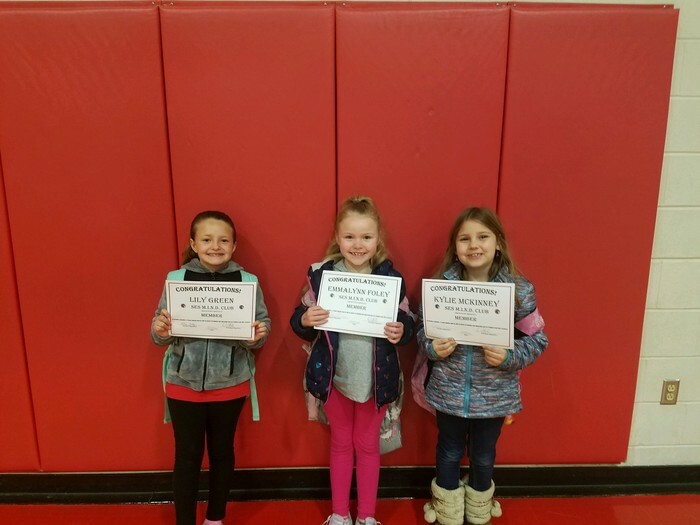 Here are the Gold Slip winners from the month of February (from left to right): Cali Szabo, once again, showed her kindness when she jumped in to help another student. A young boy had dropped a lot of things in the hallway. Without hesitation, Cali knelt down by him and helped him pick up everything he dropped. The best part was that Cali did this from the kindness of her heart, not because she thought she would get a reward! In fact, she never looked to see if her teacher caught her being kind! 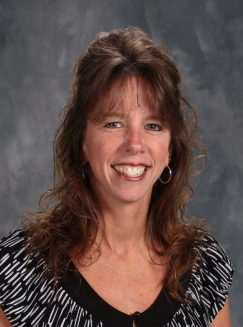 Molly Owens waited on an adult that had trouble walking into the school by holding the door open. She followed the adult into the building to open the second door so they could come into the office. 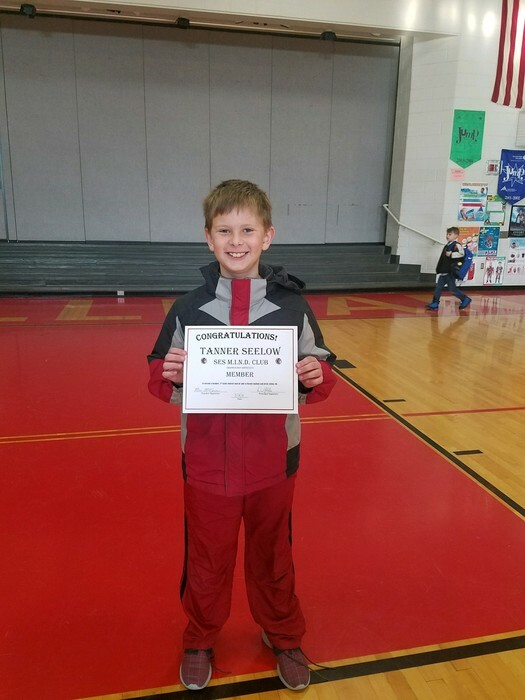 Liam Coil had the special privilege of being first and leading the line of students because he was the "Student of the Week." As he was leading the line, he spotted a younger student in the hallway who had dropped everything he was carrying. Liam immediately bent down to help. This caused Liam to lose his line leading position. The best part is that Liam didn't look around to see if anyone was watching. He was just extremely kind! Addison Hullum saw that another student had spilled his milk and walked away. Addison saw the spill and cleaned it up without anyone telling him to. Way to go! Nathan Bishop, day after day, can be seen taking time to show respect for our classroom. He works neatly, but also helps clean up after others. This is always with a big, bright smile! Nathan is so kind and helpful and is a wonderful classmate! Ryder Saul noticed that several children threw their lunch trays up into the dishwasher window in the wrong direction. Ryder fixed them all without being asked, even though they were covered in food. He was very respectful and responsible as he did this. Natalie Stinson shows great leadership at school. She serves as a role model for others in her behavior, actions, academics, and attitude! Natalie is very responsible and easy to rely on. Often, she sees that something needs to be done and takes care of it before, or without, being asked. Natalie is an amazing asset in the classroom! 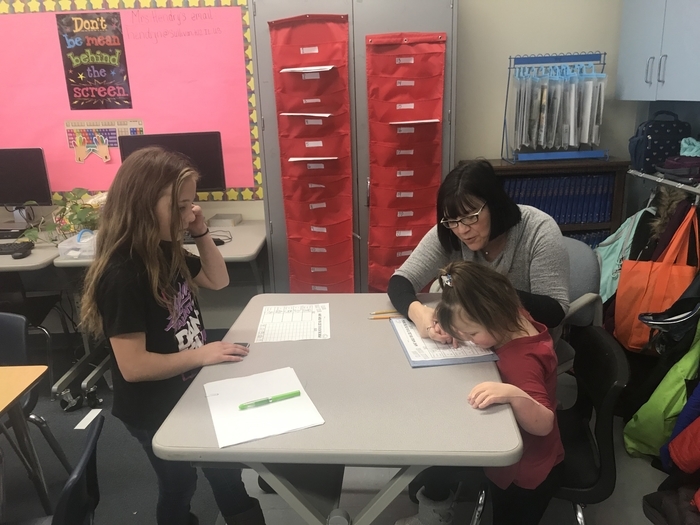 Kinlee Agney (not pictured) has been a great help to classmates who need extra help understanding their assignments and completing them successfully. She is very calm and patient. She is a great help to others! Great job students! 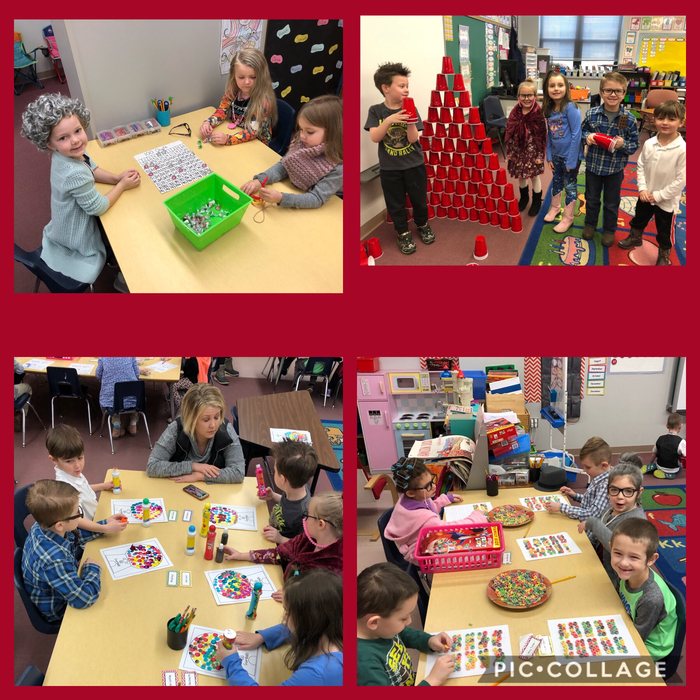 Kindergarten was full of activities involving the number 100 today. 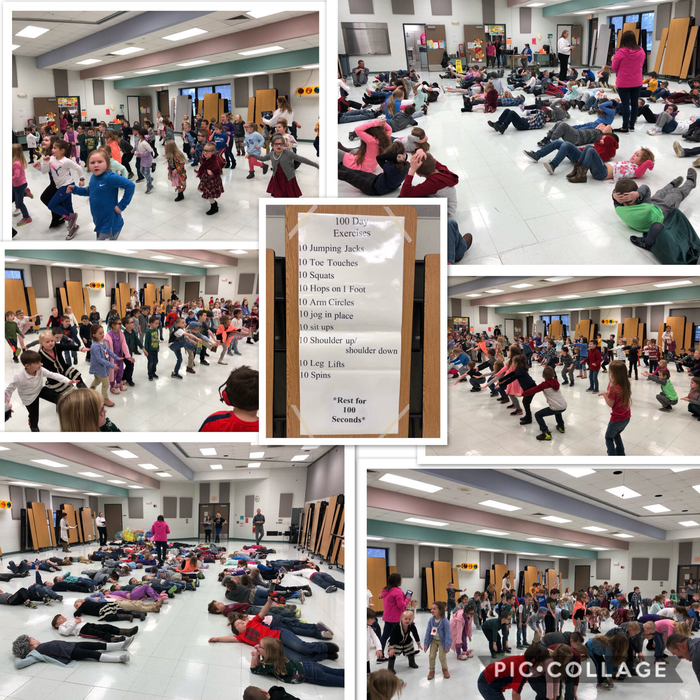 All kindergarten classes met in the cafeteria this morning for a 100 day workout! Kindergarten teachers are ready to welcome their Kindergarteners on their 100th day of school! 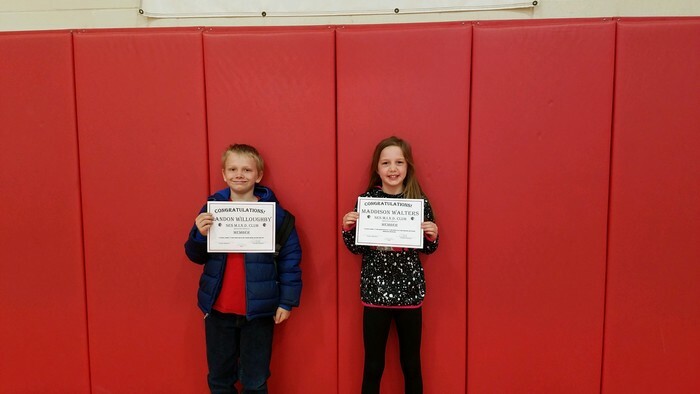 Congrats to our 3rd and 4th grade Spelling Bee winners. They will advance to the District Bee held Feb.6th in the HS commons. 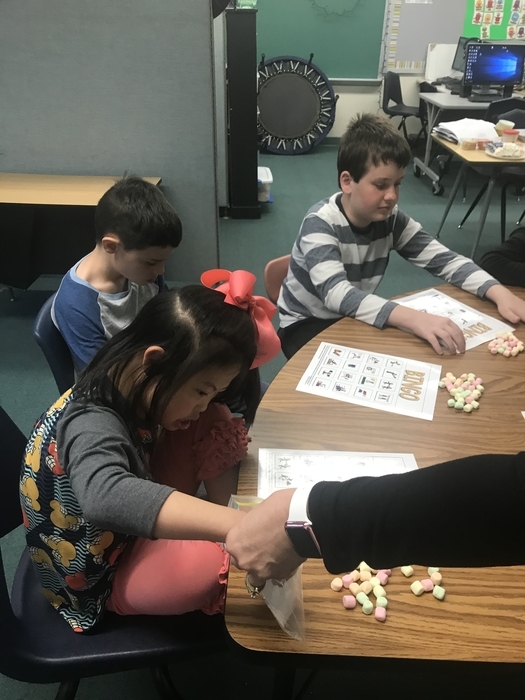 4th graders in Mrs.Hendry’s class warm up their fraction work with colorful candy hearts! We Love Math! 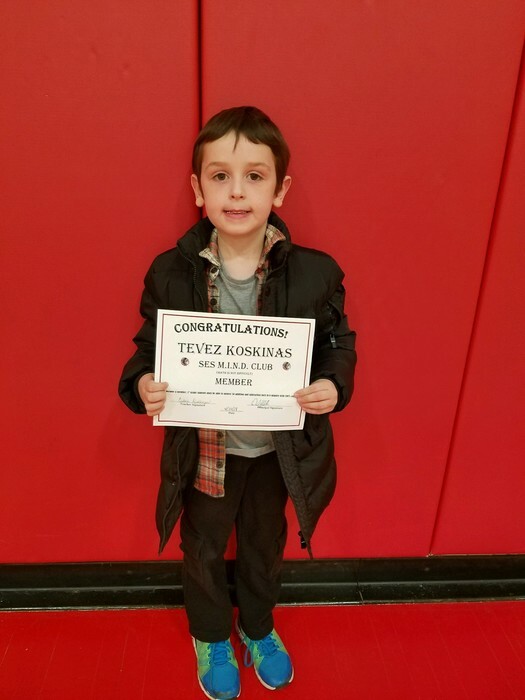 Congratulations to the newest 2nd Grade member of the M.I.N.D. (Math Is Not Difficult) Club! Congratulations to the newest 3rd Grade members of the M.I.N.D. (Math Is Not Difficult) Club! 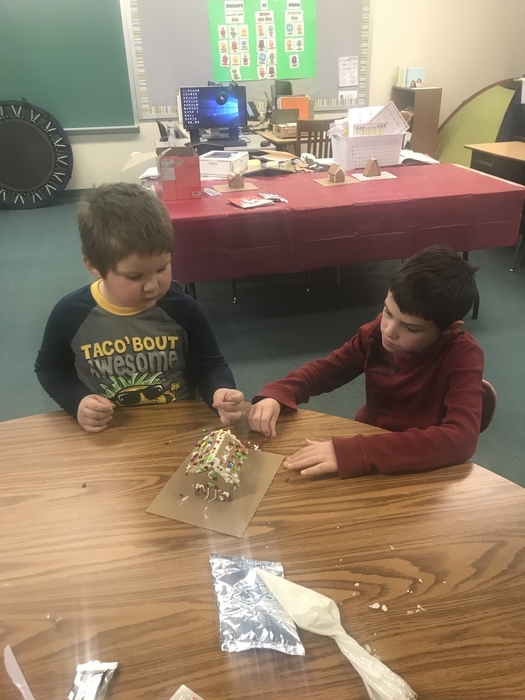 Mrs. Grohler’s students enjoyed two fun-filled weeks of snow themed activities. They finished the unit with making hot chocolate. 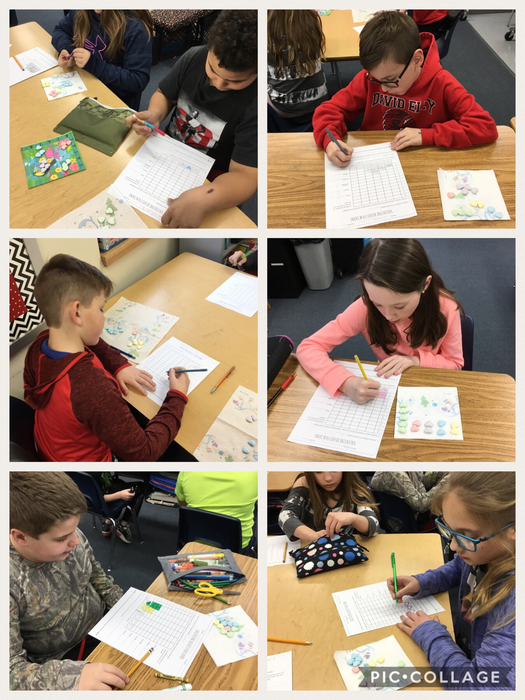 Mrs. Grohler’s students enjoyed surveying the fourth grade students about their favorite snowy day activities and then graphing the information. 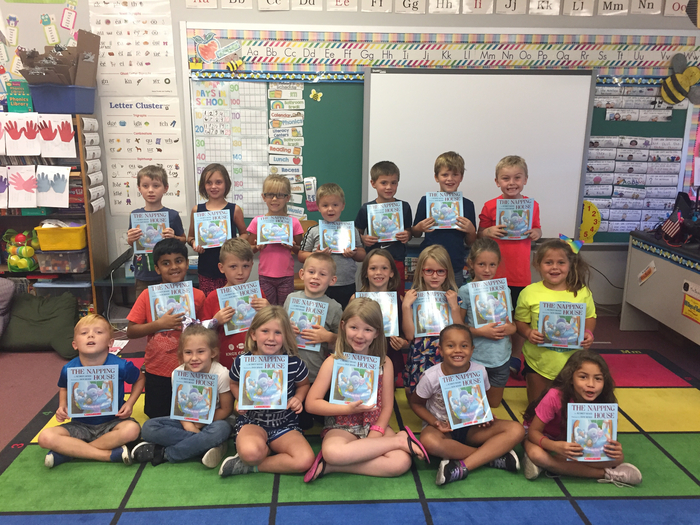 Mr. Haegen’s class enjoys reading their new book donated by the Scholastic Book Sponsorship Program! Mrs. Fleming makes library exciting with exceptional learning experiences. 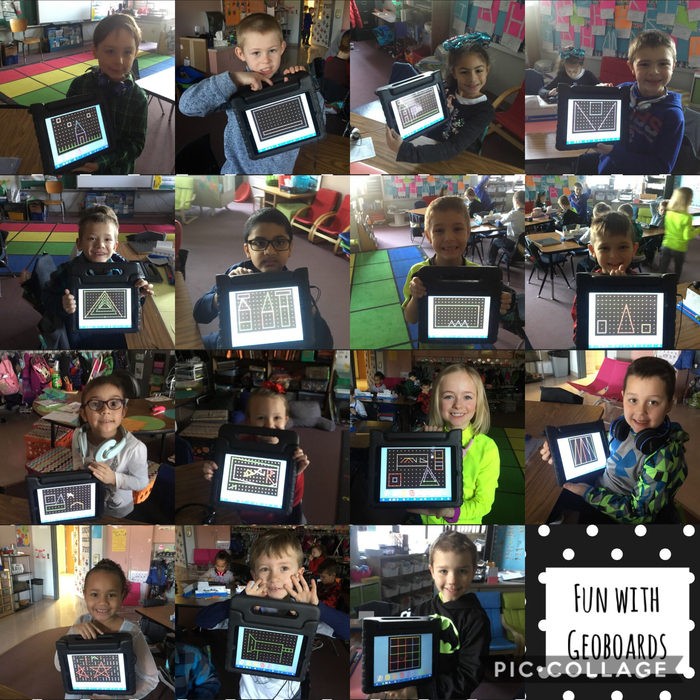 Mrs. Becker’s RTI group had a great time making pictures with our geoboard app ! 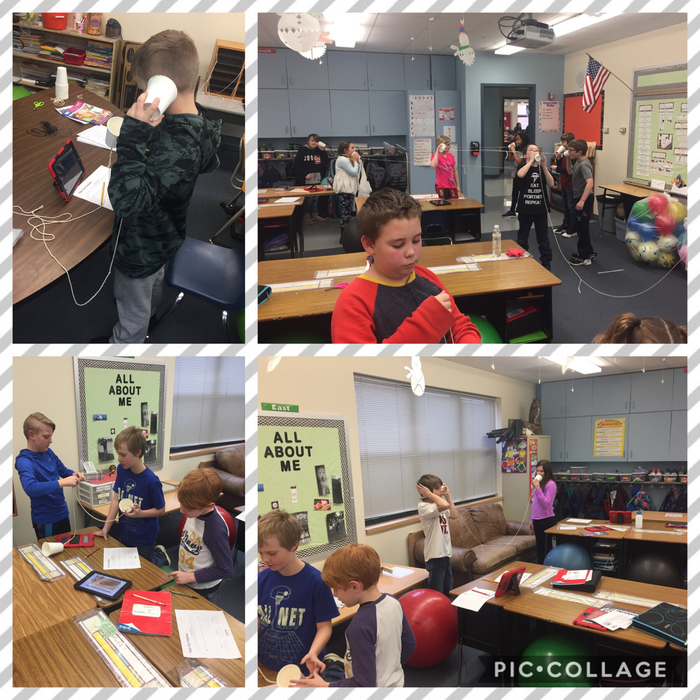 Today in Mr. Campbell’s science class, students built paper cup telephones to investigate the connection between sound and vibrations. 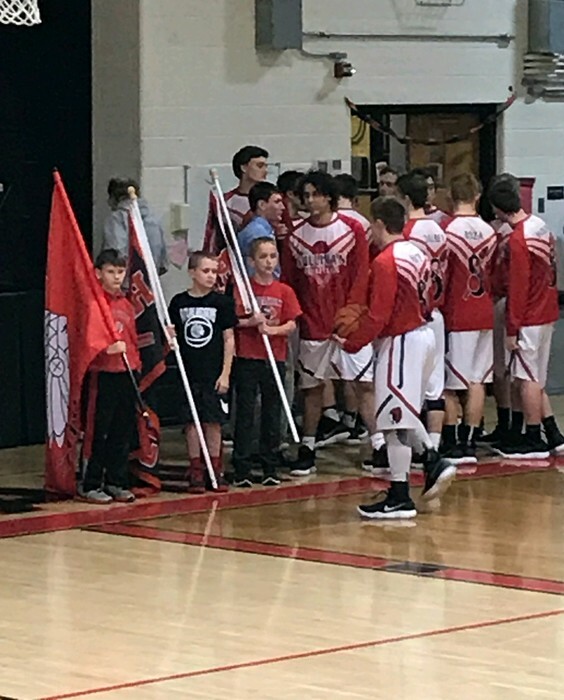 As a result of showing respect, Alex Fultz and Keegan Betts were chosen to lead the varsity boys basketball team onto the court before their game against Charleston. Great job boys! These Redskin Rowdies are ready to cheer on our Redskins !!! 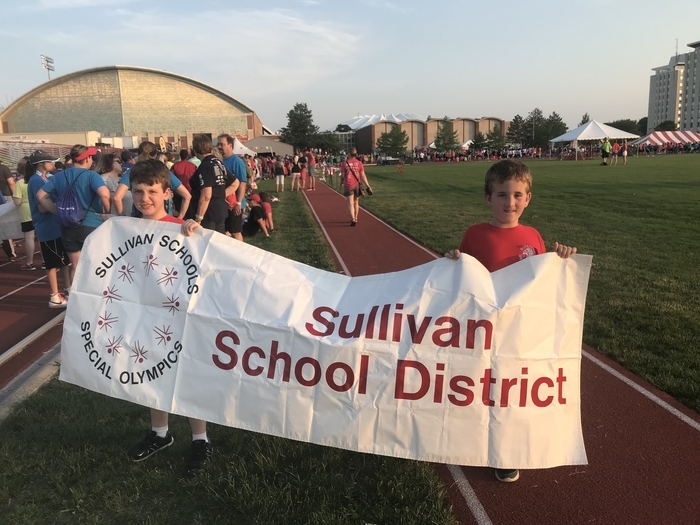 Go Sullivan Redskins !!! Yikes ! Our snowmen have melted ! 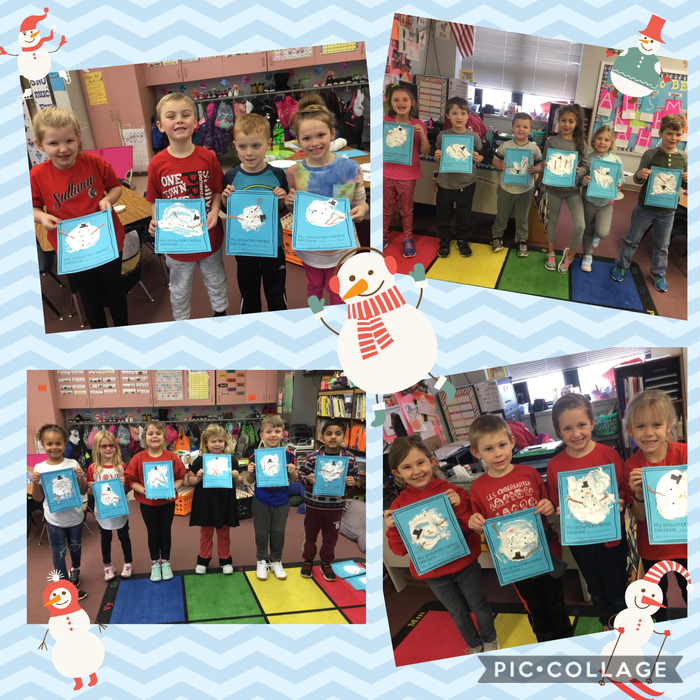 After reading the book Sneezy the Snowman, Mrs. Becker’s class wrote how their snowman would melt. Then, they painted their own melted snowman ! Congratulations to the newest members of the 4th Grade M.I.N.D. (Math Is Not Difficult) Club! Congratulations to the newest members of the 3rd Grade M.I.N.D. (Math Is Not Difficult) Club! 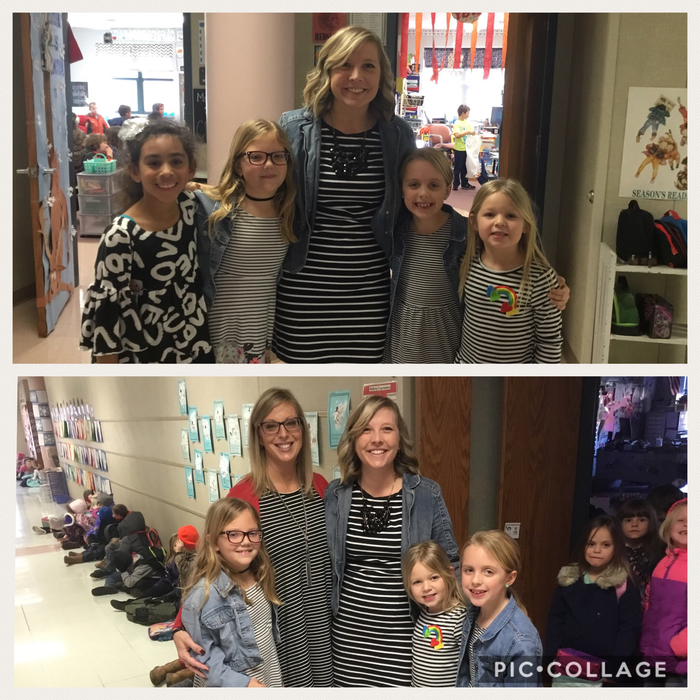 Congratulations to the newest 2nd Grade M.I.N.D. (Math Is Not Difficult) Club! 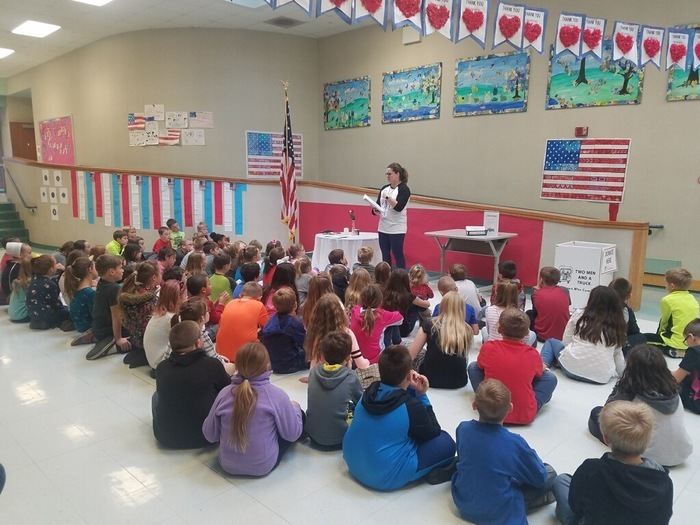 Mrs. Grohler’s students were engaged in a fun lesson about hygiene presented by two FCCLA students from the high school. Future Redskins will be running the original Week 2 schedule this Saturday, January 19th. More information regarding making up Week 1's games will be released at a later date. 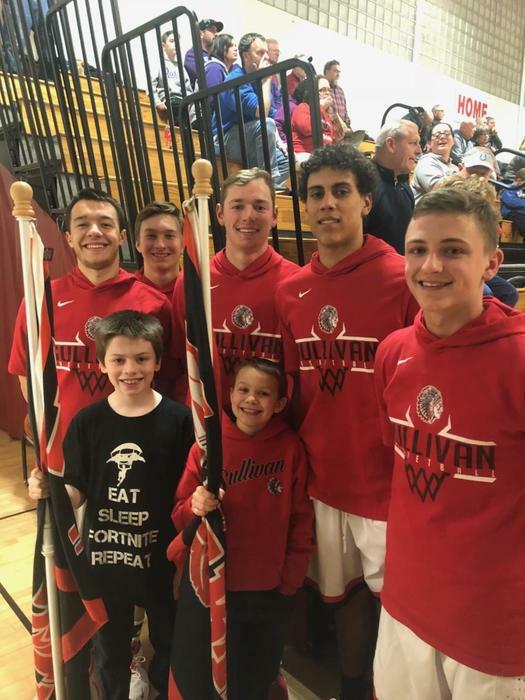 As a result of showing respect, Aiden Villalobos was chosen to lead the Sullivan varsity boys basketball team onto the court in their game against Meridian. 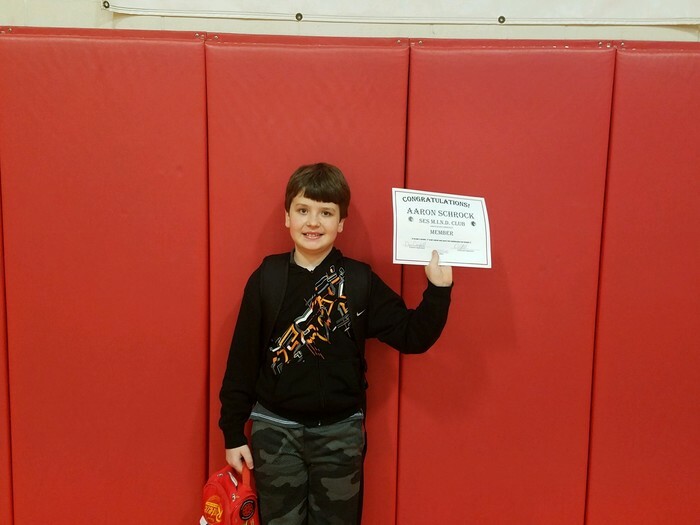 Great job Aiden! SES loves twinning and cheering on the Redskins ! 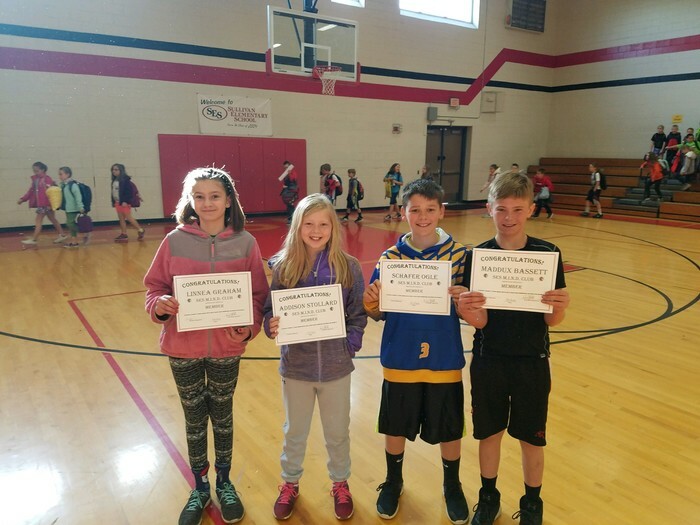 Congratulations to the newest members of the 4th Grade MIND Club! Congratulations to the newest 3rd Grade members of the MIND Club! 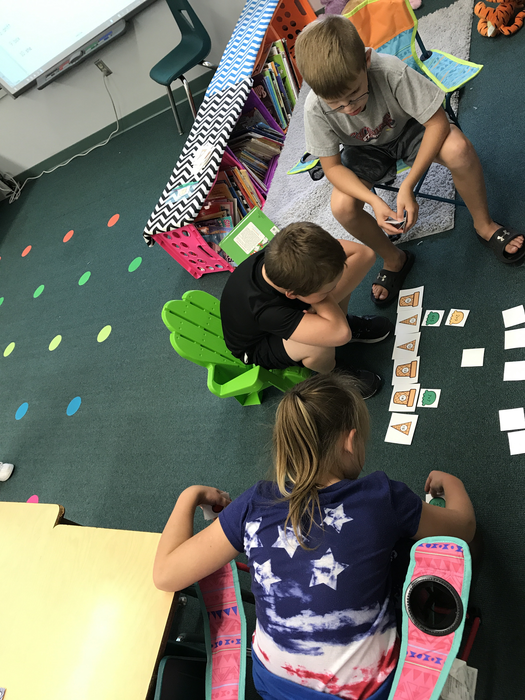 To be a member of the MIND Club in 3rd Grade, a student must be able to do 20 2/3 digit addition, 20 2/3 digit subtraction, and 50 mixed multiplication/division facts. 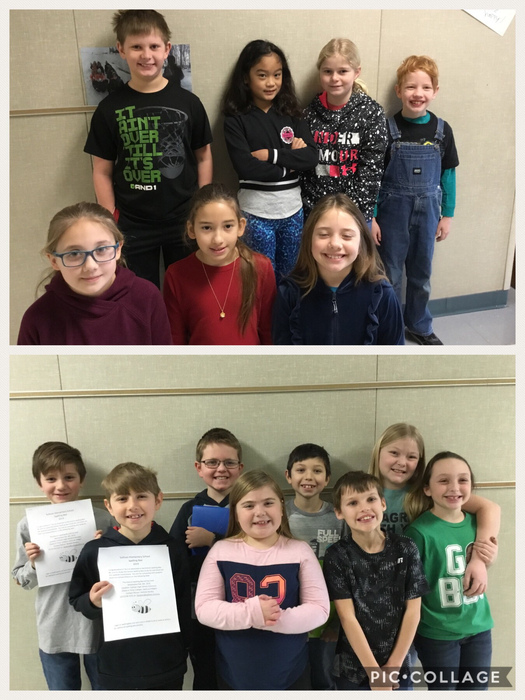 Congratulations to the newest 2nd grade members of the MIND Club! 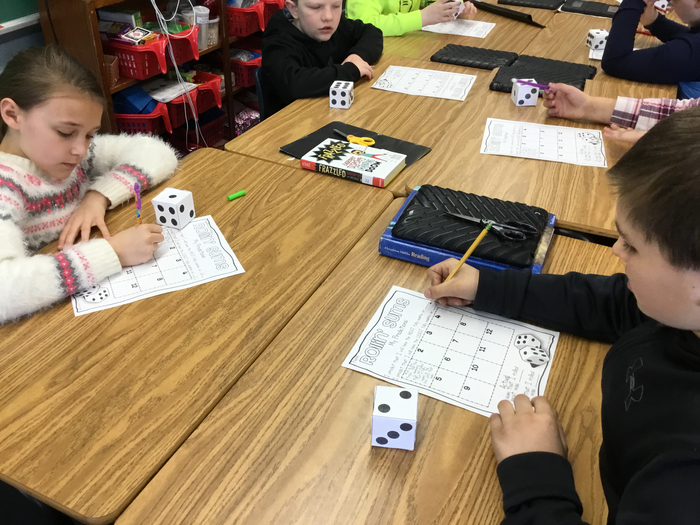 To make the MIND Club, 2nd graders have to be able to do 100 mixed addition and subtraction facts in 6 minutes with 100% accuracy. They must do this successfully three times! 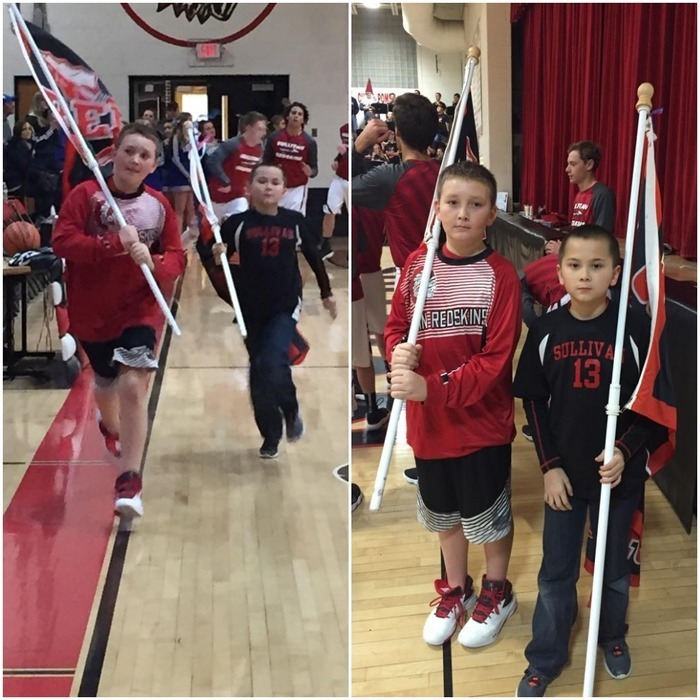 As a result of showing respect, Keegan Newberry and Aidan Clough were chosen to lead the varsity boys basketball team onto the court in their game against Shelbyville. Great job boys! 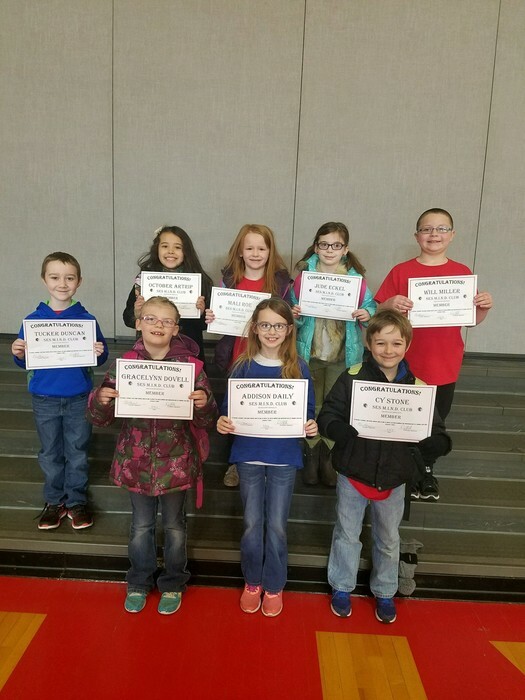 Every month, Sullivan Elementary recognizes students who go above and beyond expectations by awarding them "Gold Slips." 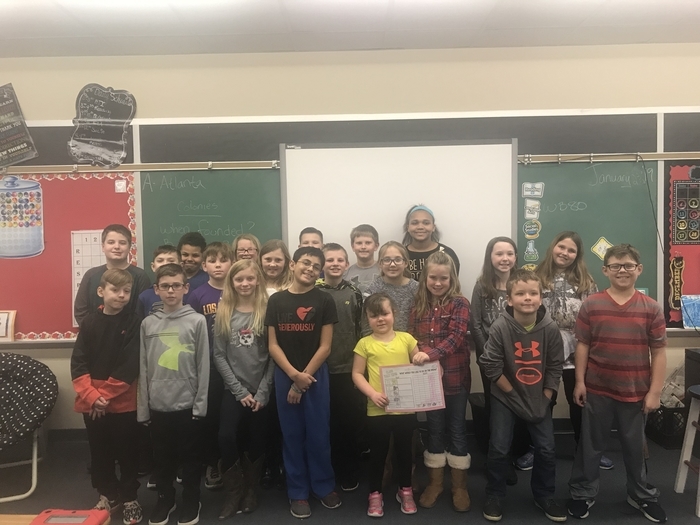 Pictured are the gold slip winners from the month of December: Karen Szachnitowski has been very helpful to her peers who have needed some extra guidance in math. She has offered to help during class time and even recess. She has been helpful all month! Christian Ogle was awarded a book to take home for winning a game. He picked one and then said he got it for his sister because those books are hard to find. Great job students! 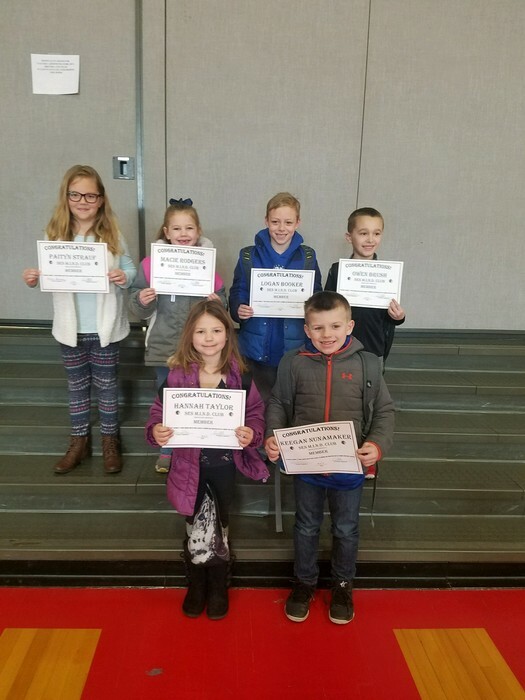 Congratulations to the newest 4th grade members of the MIND Club! To make the MIND Club, 4th graders have to be able to master their multiplication facts through 12! 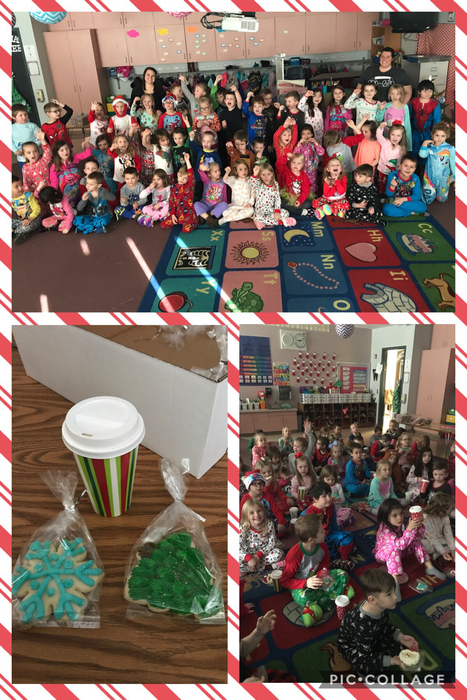 Mrs. VanDeursen & Mrs. Watkins’ classes took a trip on the Polar Express today in their pajamas. They were spoiled with hot chocolate and cookies. To finish the morning, Mr. Allen delivered envelopes straight from the North Pole! Both classes received bells from Santa’s sleigh (and they were still cold)! What an exciting morning for Kindergarten. 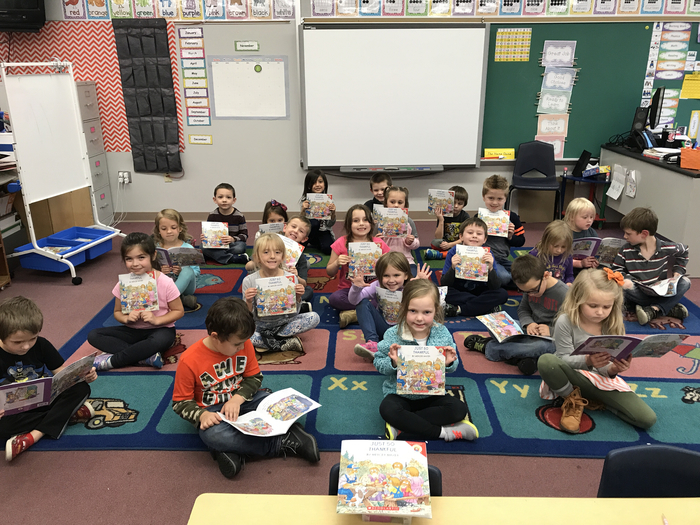 Mrs. Watkins’ students enjoyed coloring in their jumbo books that they received from their middle school helper, Mr. Paul! We are so lucky to have Paul working with us! 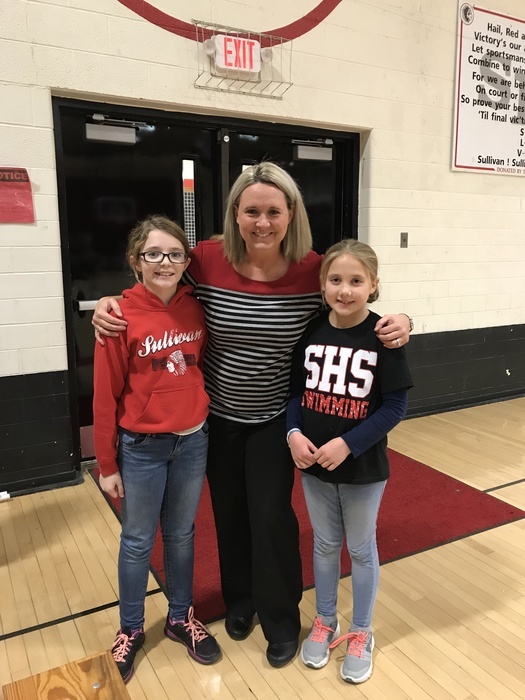 As a result of showing respect, Sophia Smith and Lena Emel were chosen to lead the varsity girls basketball team onto the court before their matchup against Mattoon. Great job girls! 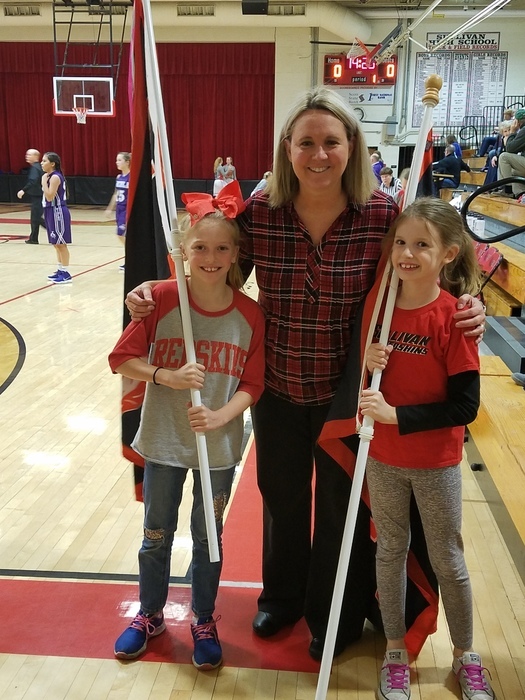 As a result of showing respect, Julia Moody was chosen to lead the varsity girls basketball team onto the court tonight in their matchup against Okaw Valley. Way to go Julia! Want to remember the single greatest fine arts performance in history? Good news, there will be DVDs of the 2018 SES Christmas Program available for purchase! You can pick up an order form at the performance or at the SES office the following days. Order forms will be due back to the SES office by Friday, December 14th. 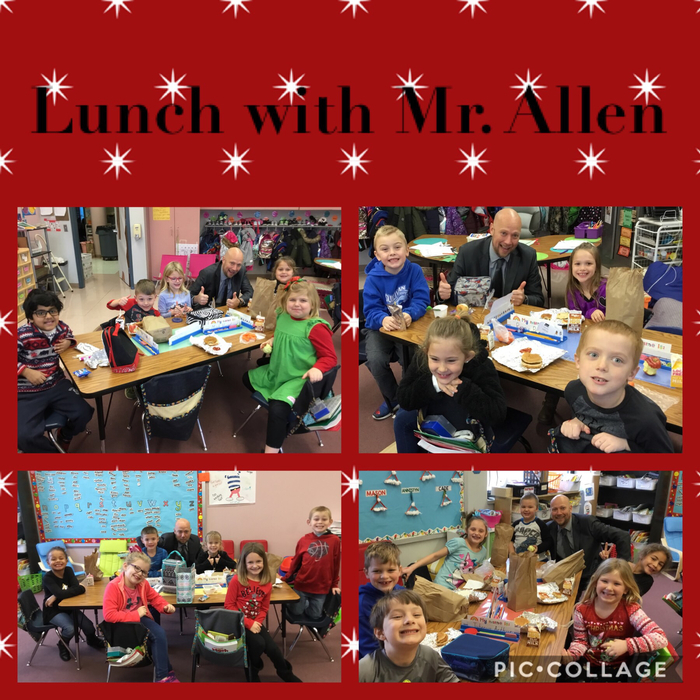 Mrs. Becker’s class won a box top competition and enjoyed lunch with Mr. Allen ! Thank you for the cookies ! 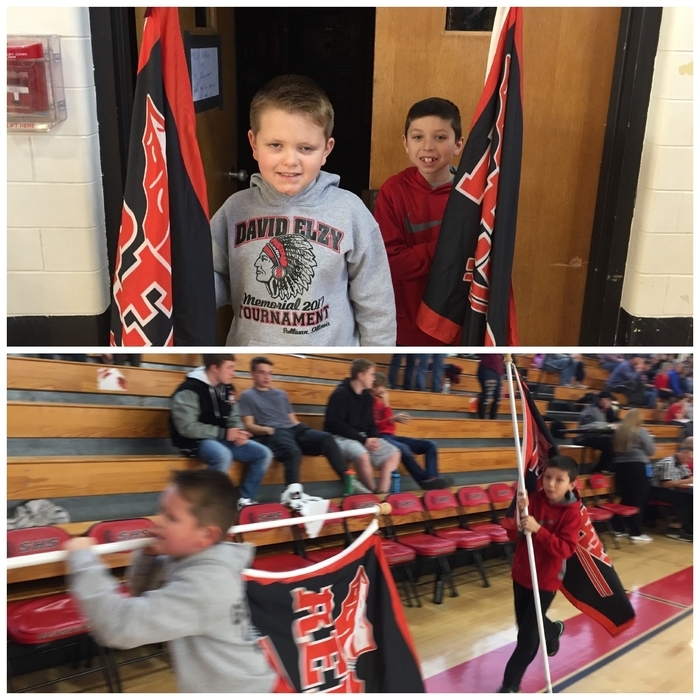 As a result of being respectful, David Eaton and River Polley led the varsity boys basketball team onto the court before their game on Saturday. Way to go boys! 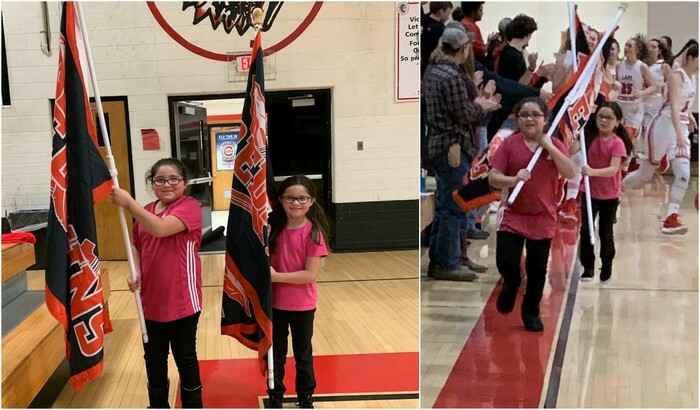 As a result of being respectful, Gabriela and Sofia Vieyra got to lead the varsity girls basketball team onto the court before their game against Warrensburg-Latham. Great job girls! 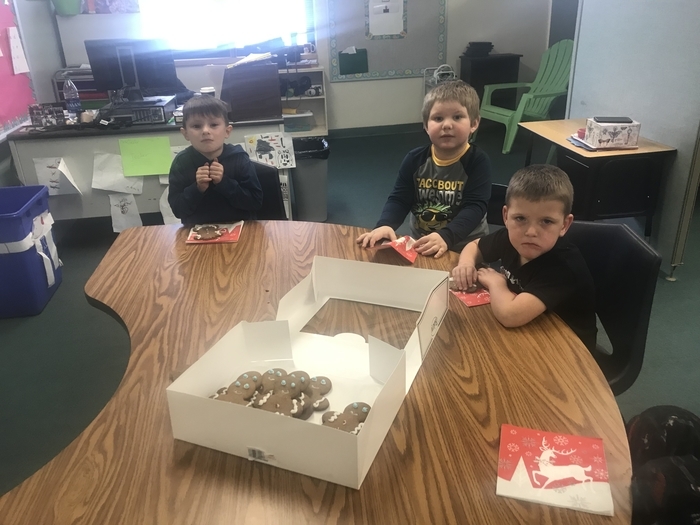 Mrs. Grohler’s students enjoyed ending their gingerbread thematic unit with a day of gingerbread bingo, gingerbread word hunt, building a gingerbread house and eating gingerbread cookies. 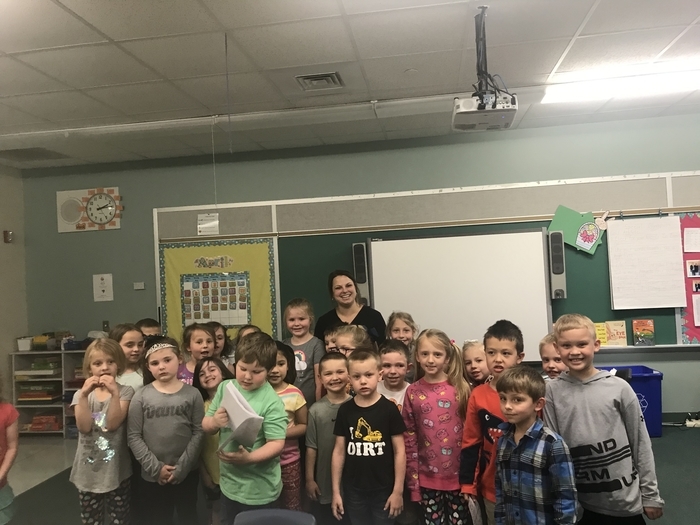 Sullivan Elementary School secretary and registered nurse, Erica Lehman, was the final guest visitor for Mrs. Seeley's class as we wrapped up our November: Community Helpers unit. Nurse Lehman brought her stethoscope, a thermometer, bandages, and other items a nurse might use to help patients. Some students even volunteered to be bandaged! 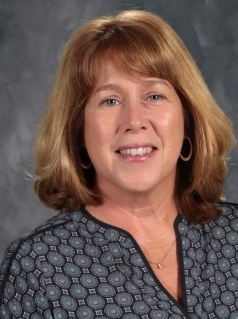 Thank you, Mrs. Lehman. The Early Childhood and Project HELP classes are so glad you visited! Teamwork makes the dream work! Mr. Campbell and Mr. Allen did not hesitate to jump in and help out a couple of colleagues. This is just one example of how we truly are One Tribe. Don't miss the best show around! 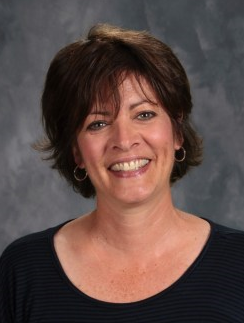 This year's Kindergarten through 2nd Grade Christmas program is shaping up to be special with Mrs. Leach at the helm! 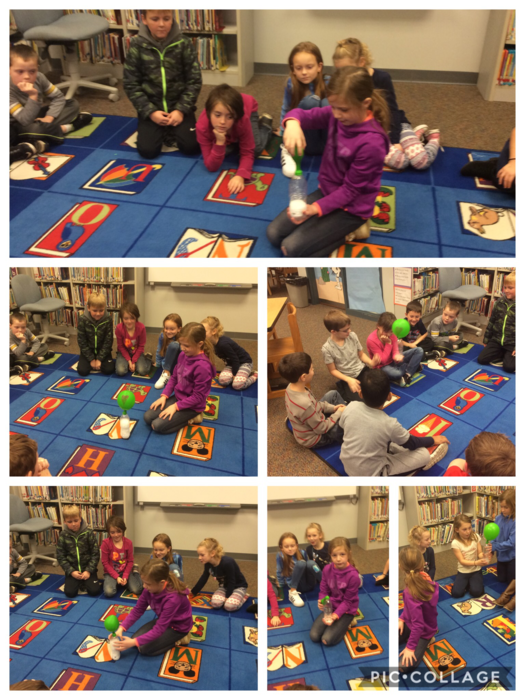 Mrs. Becker’s class had a great time in library today. 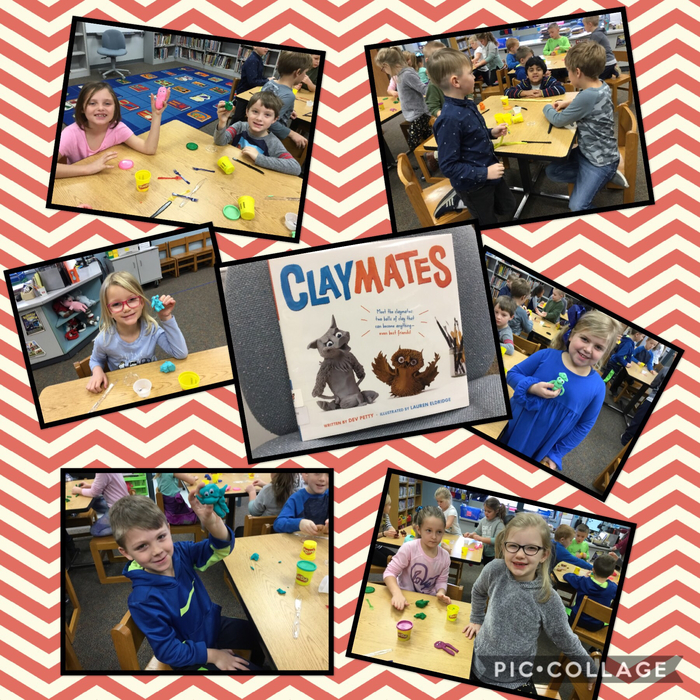 We heard a great story and made our own “claymates “ ! 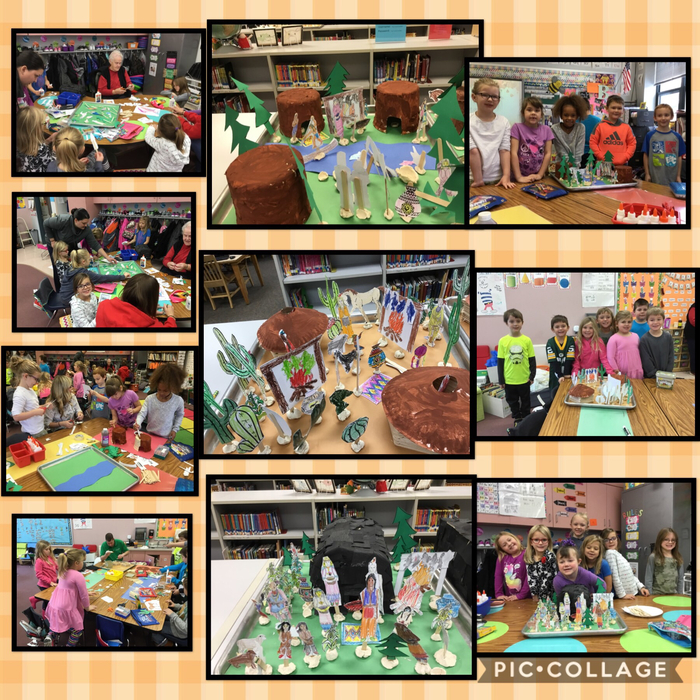 After learning about different types of Native American homes, first grade spent a day making our own. The students had a great. This day was a huge success due to having so many wonderful parents and volunteers! 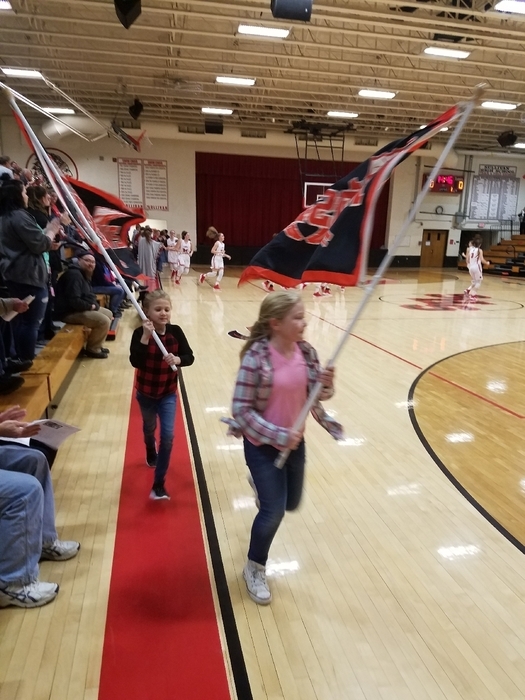 As a result of being respectful, Daisy Richardson and Emma McCain led the Lady Redskins onto the court in tonight's game against Teutopolis. Great job girls! 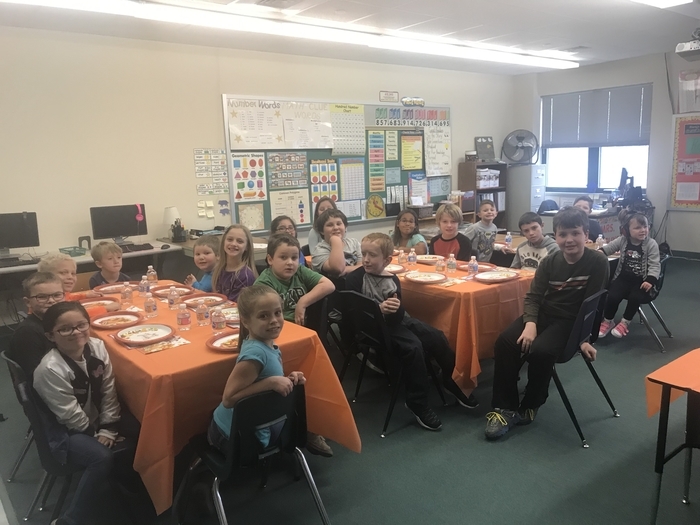 Mrs. VanDeursen and Mrs. Watkins’ classes came together today to share in a Thanksgiving feast. 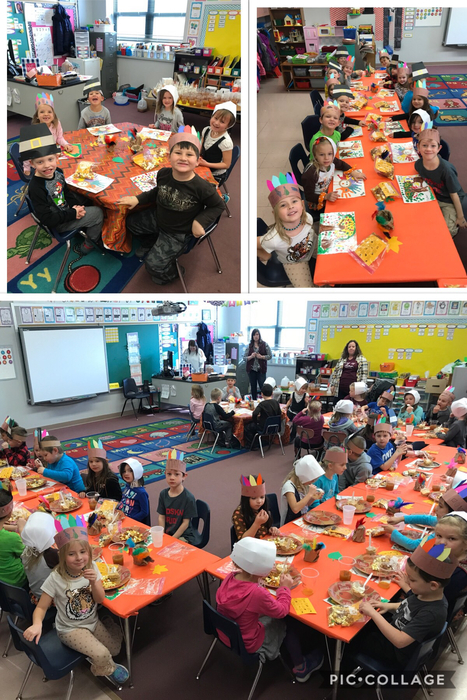 Mrs. Grohler, Mrs. Florey, and Mrs. Guyot’s classrooms got together to make and partake in a delicious Thanksgiving meal. 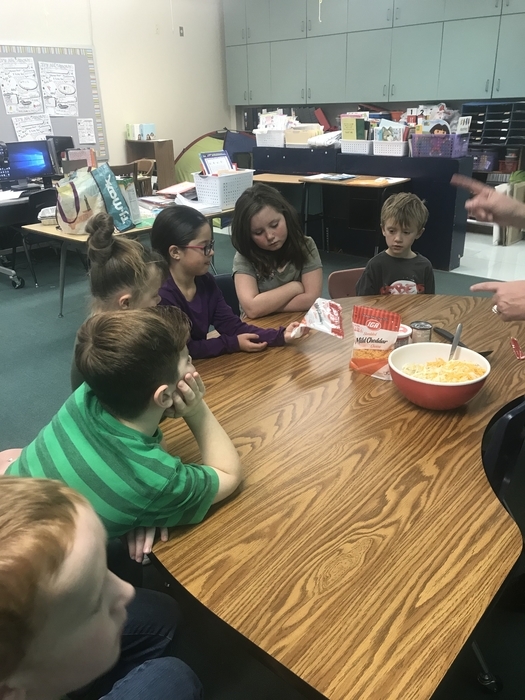 Students helped measure, stir, and read directions for the four recipes. 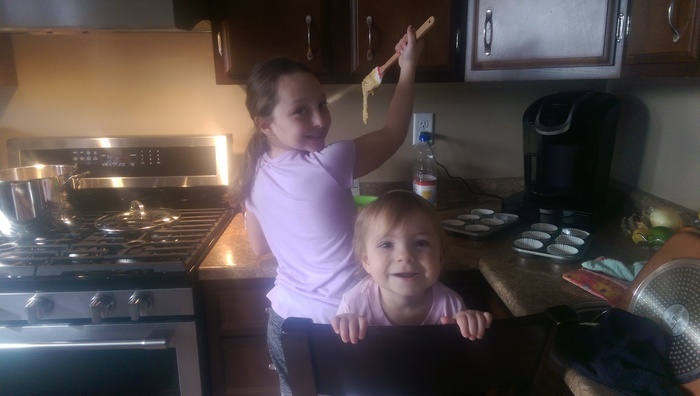 They enjoyed learning new recipes and trying new foods! 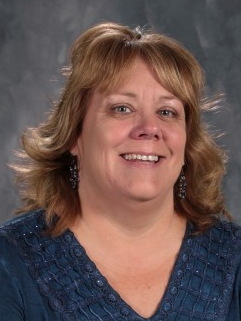 The staff of SES expressed their gratitude to Mrs. Tarr for her years of service at the school. They are sad to see her 'leaf'. Come walk the plank! Family Reading Night is tonight from 6-7. See you there, mateys! 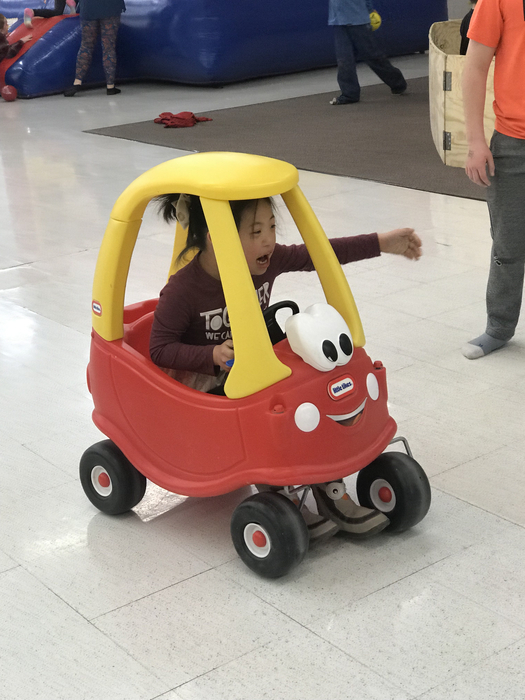 We arrrrrrrre getting ready for family reading night. Hope to see you there. The fun is from 6:00- 7:00 pm at SES. 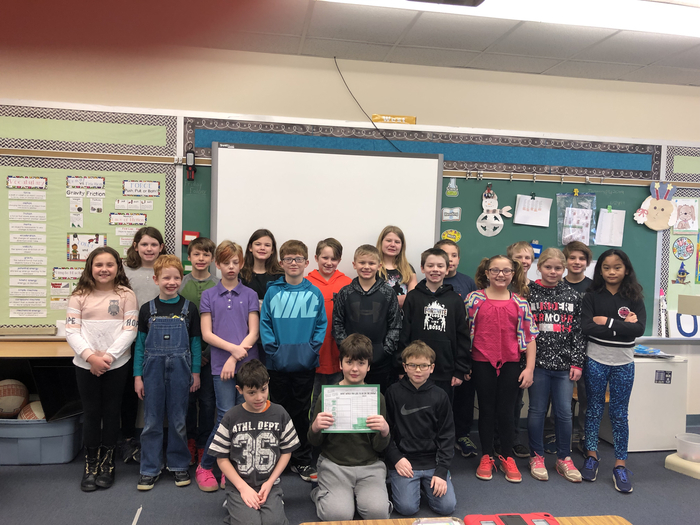 Each month, Sullivan Elementary School honors students who go above and beyond expectations by awarding them a "Gold Slip." Below are the Gold Slip winners from the month of October. From Left to Right: Nixon Dundee was in the middle of a race during recess when his competitor fell to the ground. Nixon stopped racing and went back to see if the other student was okay. Way to go Nixon! 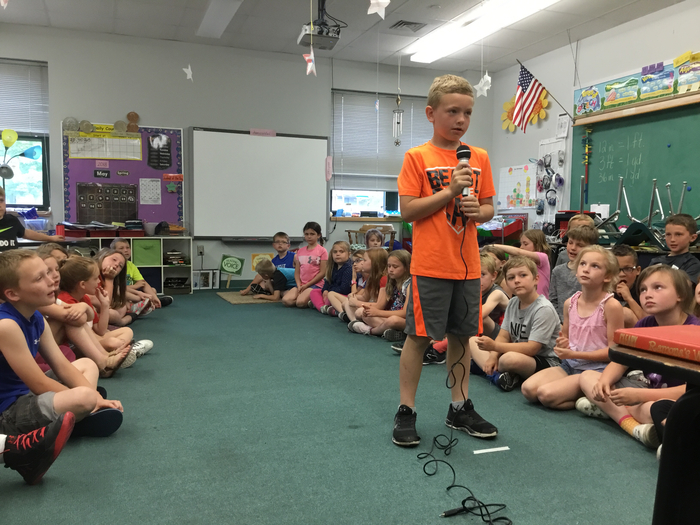 Bryar Cowger was playing "Around the World" with the class. He was doing very well, as he is a math facts Whiz! 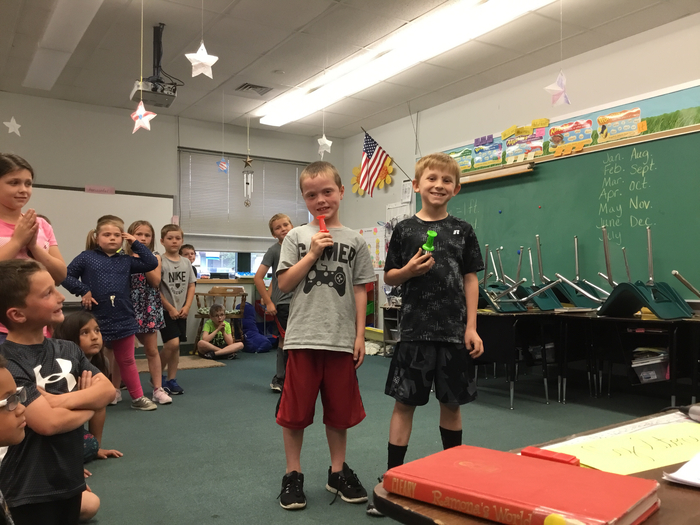 After competing against many students and winning, a classmate finally beat Bryar by saying the answer before Bryar did. Bryar calmly sat down since his turn was over, but then reached out to "high five" the girl who beat him. 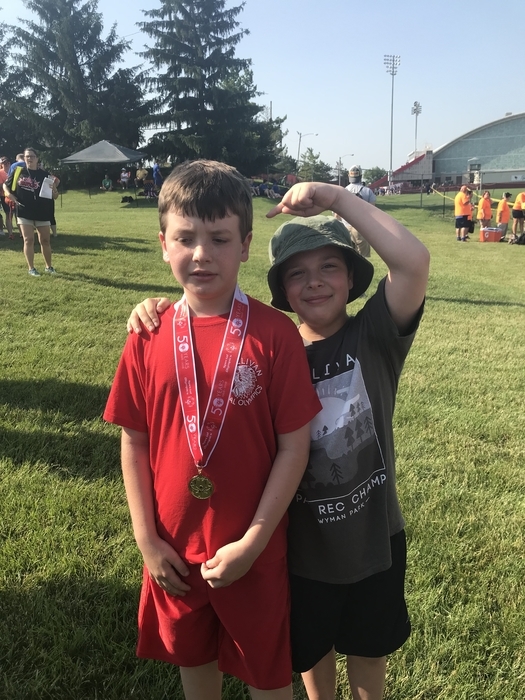 Super sportsmanship, Bryar! 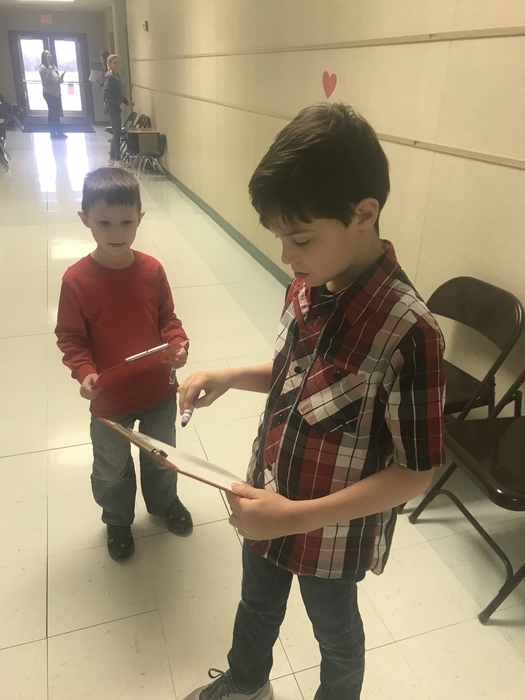 Koda Plumb offered to help another student with his math activity since the other student needed someone to explain the process to him. Koda was patient and helpful. As her class was headed to the restroom, Paityn Strauf noticed that a student from another room had spilled paint. She offered to clean it up without anyone even asking her to. The hallway was clean as can be when she was done. 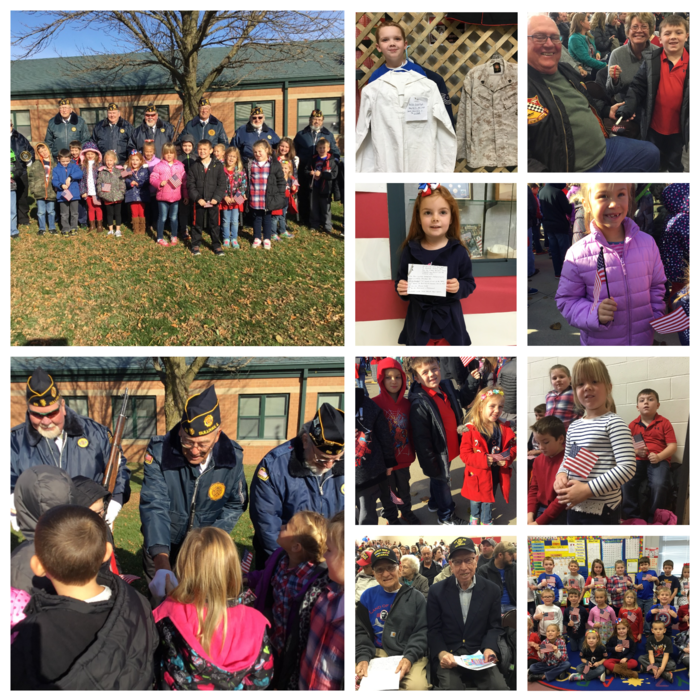 We were proud to honor veterans at SES today! Thank you for your service! 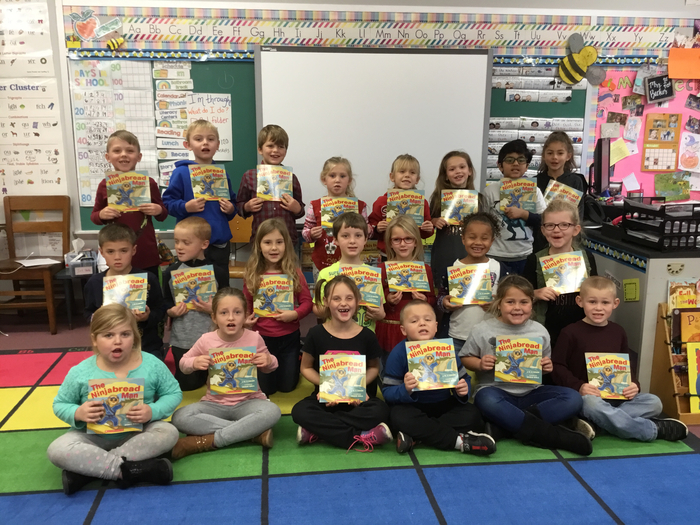 Mrs. Becker’s class loved getting their November book. Thank you to everyone who donated. The students were so excited to get a book they had never read before ! 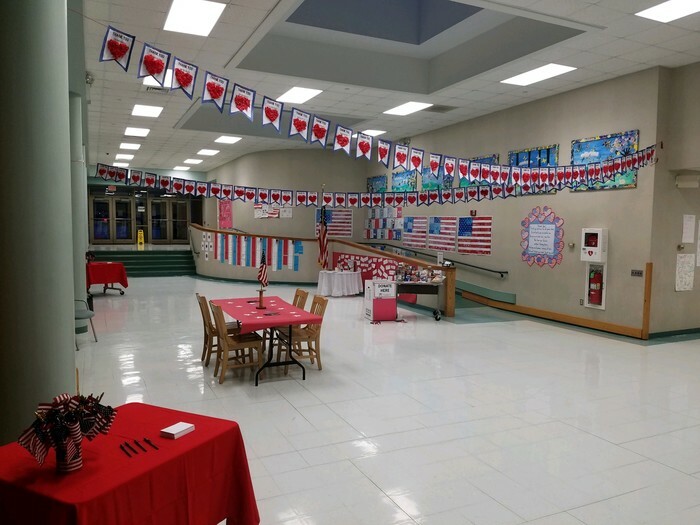 The lobby of Sullivan Elementary is ready to welcome the brave men and women who served our great country today. The program starts at 8:30, then head over to the high school at 10:15 for another moving program! 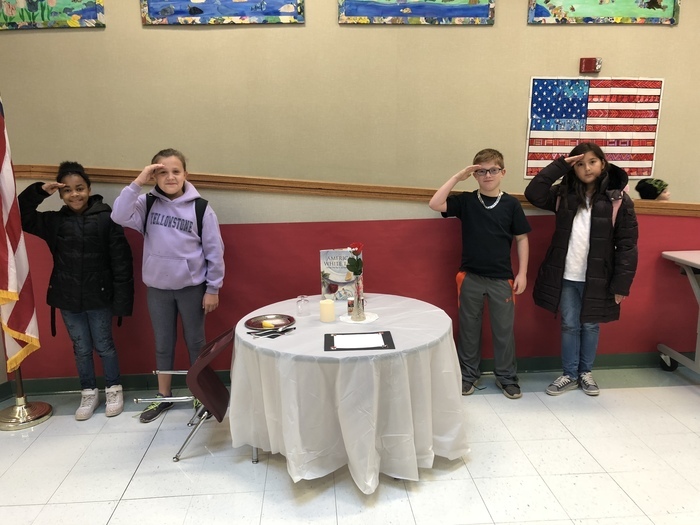 SES sets the POW/MIA table to honor all Veterans, especially those held prisoners of war and those missing in action. Thank you all for your service! 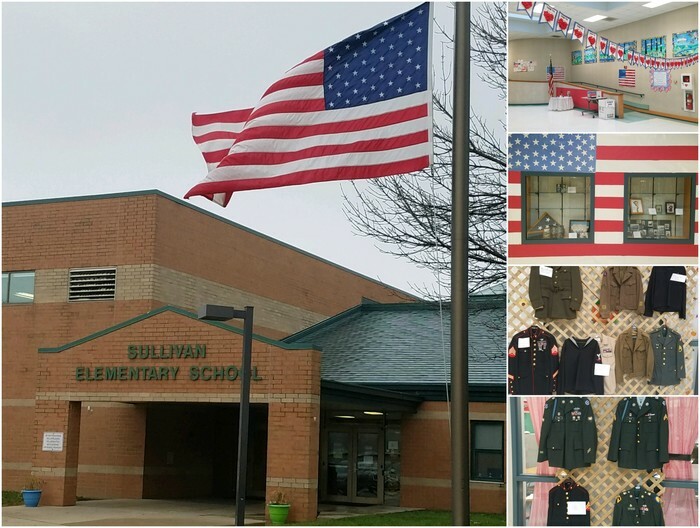 Just a reminder that Sullivan Elementary School's Veterans Day program will begin at 8:30 on Monday morning, November 12th. 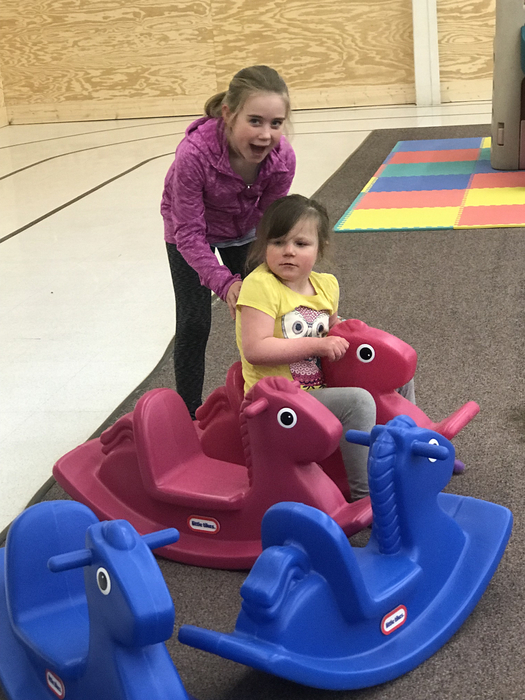 We will have utility vehicles (courtesy of Sloan Implement) available to shuttle people to the elementary school from the armory, American Legion, and other nearby locations when the school parking lots fill up. This program is shaping up to be a fantastic show under the direction of Mrs. Leach, so don't miss it! Also, if you have canned goods or would like to donate money to our Day of Giving drive, please bring those with you. The food and money collected will go to local food pantries. We will have a station set up for collection. 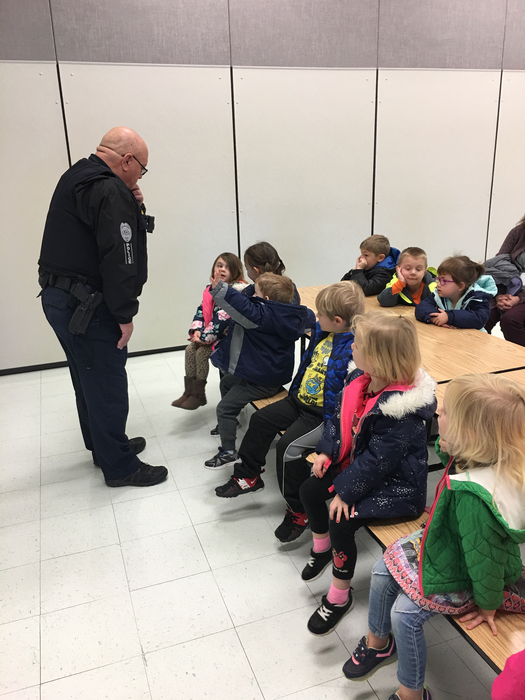 The Early Childhood and Project HELP classrooms would like to say a big "thank you" to Officers Waggoner, Pistorius, and Collins for visiting us on Wednesday. 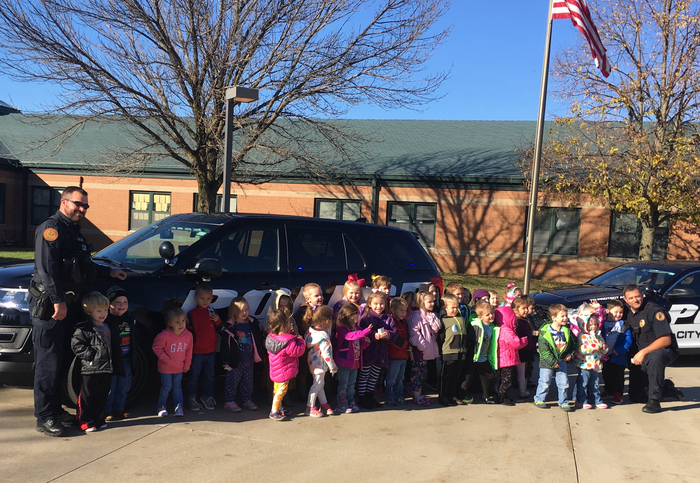 The police officers spent time talking with the children, followed by an opportunity to check out their squad cars! 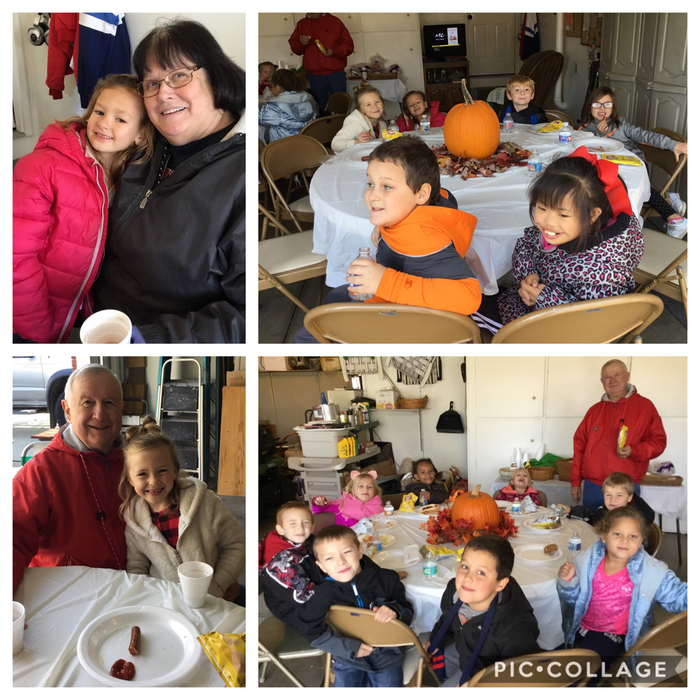 Thanks to Dave and Sharon Walker for hosting a lunch for Mrs. Drollinger’s first grade class! What a treat! 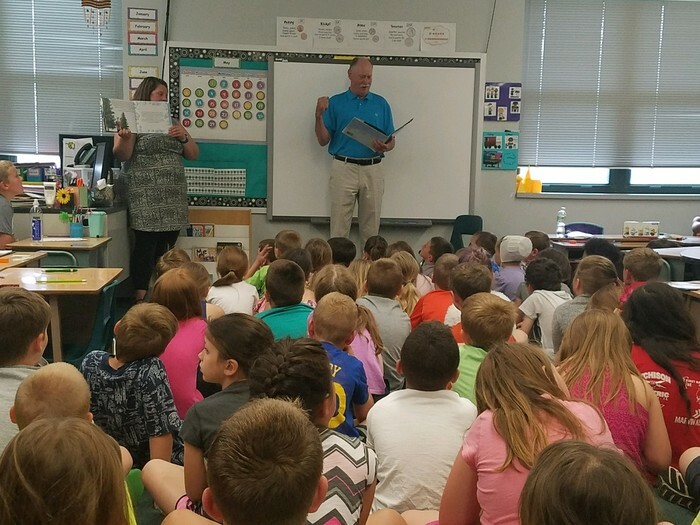 Dave is a reading volunteer with this class and we appreciate all he does for Sullivan schools! Here are the updated Sullivan community dropoff points for the Day of Giving: IGA, VFW, Sullivan Eyecare, Oakwood Apothecary, Sullivan First United Methodist Church, and the Vineyard Church. 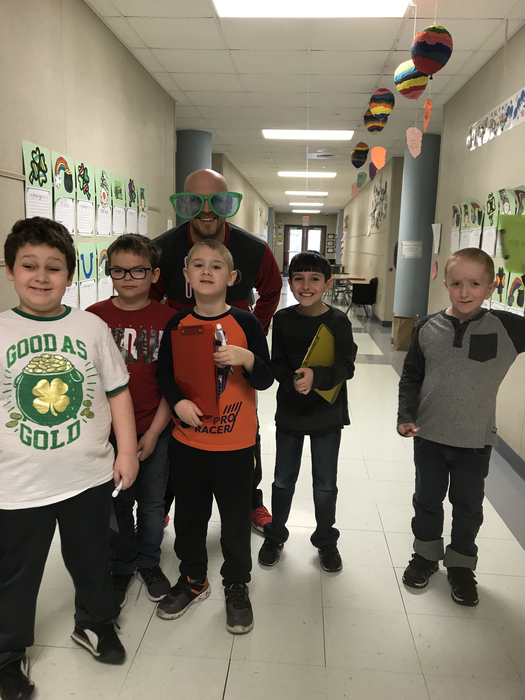 An even better option is to send your donations with an elementary student, so they get to see Mr. Ogle get a pie in the face, courtesy of Mr. Allen. 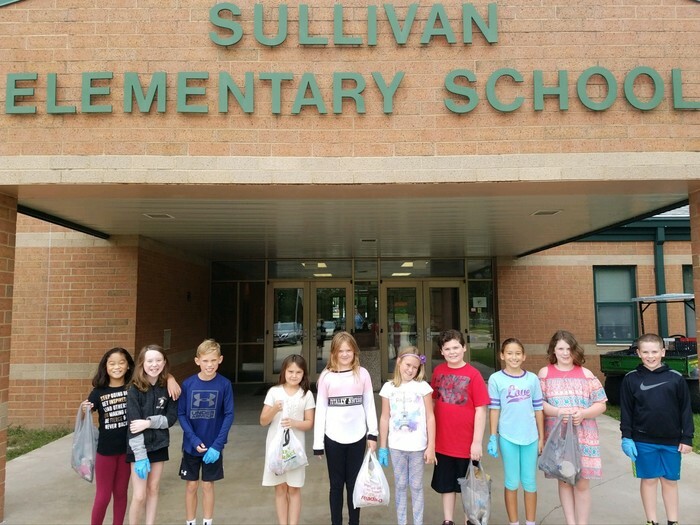 Over the next few weeks, Sullivan Middle School and Sullivan Elementary School will be competing to see who can raise the largest number of meals for the local foodbanks. The winning school will get to see their principal hit the losing school's principal in the face with a pie! 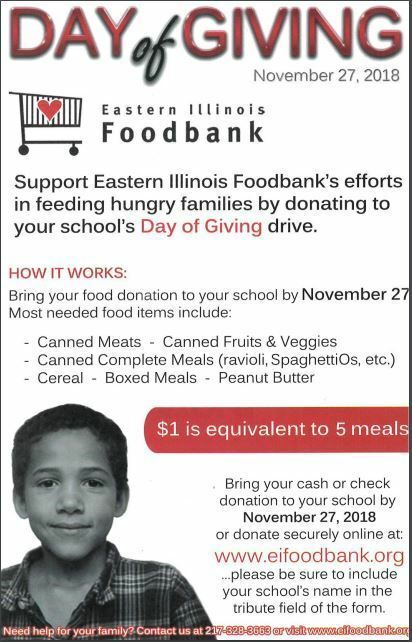 If you wish to donate, please send money or the listed food items with a student to their school (preferably elementary) or to another designated location. Other locations that are collecting include: Sullivan IGA, Sullivan VFW, United Methodist Church, and more locations to be announced at a later time. Please check back for those and please share! Please join Sullivan Elementary School for its Veterans Day program on Monday, November 12, from 8:30 to 9:30 a.m in the SES gym. Mrs. Leach has put together a tremendous program which will end in plenty of time for those who wish to also attend the high school program at 10:15 a.m. in the SHS gym. 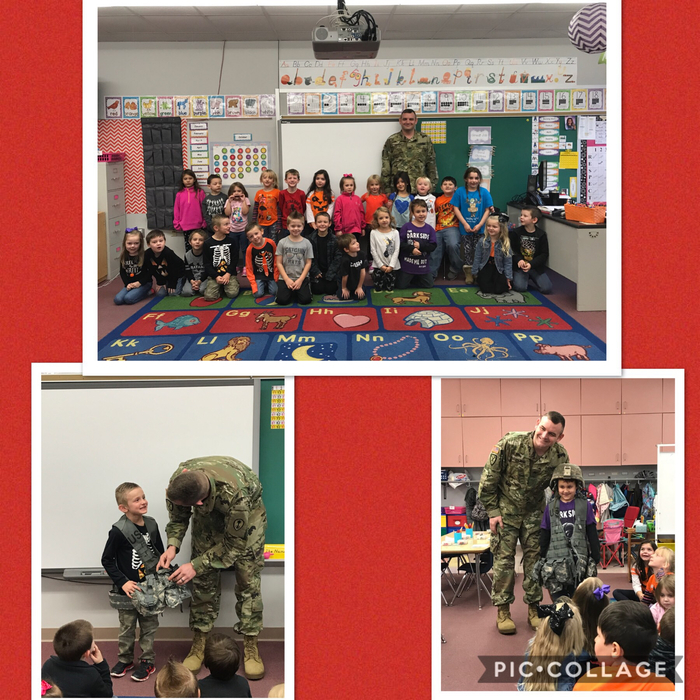 Mrs. Watkins’ kindergarten class enjoyed another guest speaker in honor of Veterans Day. SGT Sean Clark shared his experience in the Army. He brought some of his equipment and medals to share as well. Thank you for your service Sean! Just a reminder that the spooktacular PTO Monster Mash is November 1 from 6:00 p.m. to 7:00 p.m. in the SES Gym. This event is for SES Kindergarten through 4th grade students only, and parents must stay with their children throughout the dance. Costumes are encouraged, so long as they are school appropriate. We are looking forward to having a frighteningly good time! Students in Mr. Campbell’s science built “bumper coasters” today. 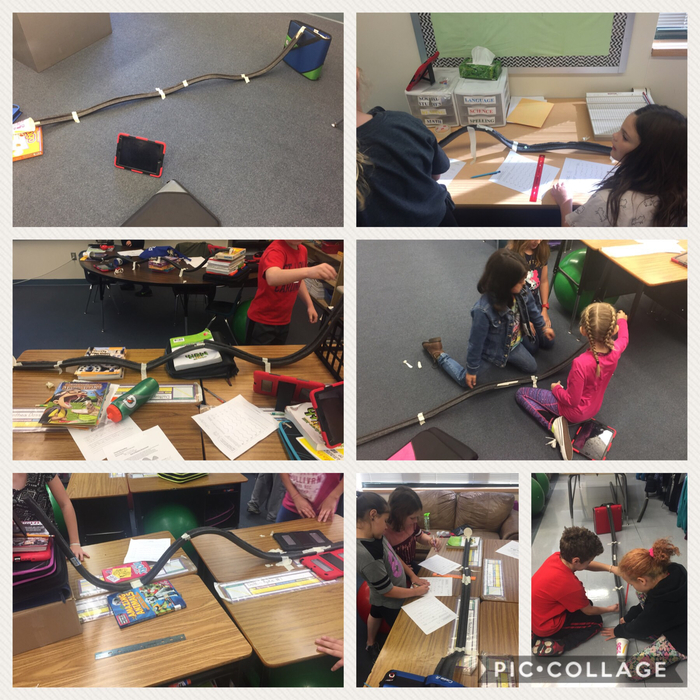 During this activity students were able to investigate and discover how height of hills give roller coasters energy. 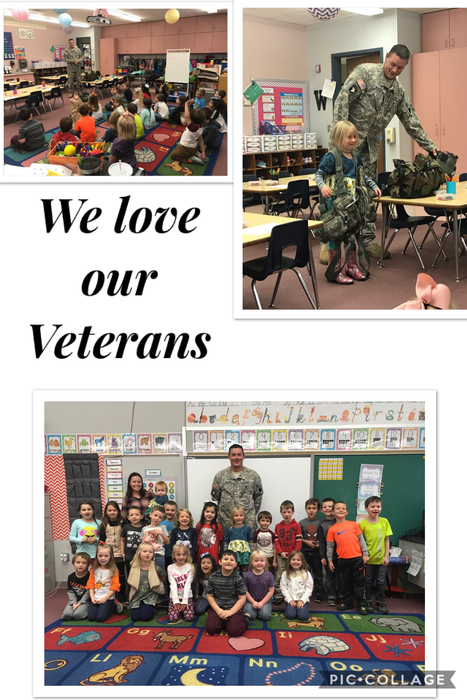 Mrs. Watkins’ kindergarteners loved having guest speaker (in honor of Veteran’s Day) Joshua Perrott. They enjoyed listening to him share about his job as a helicopter pilot. We want to thank both Joshua and his wife, Jaime for their service! 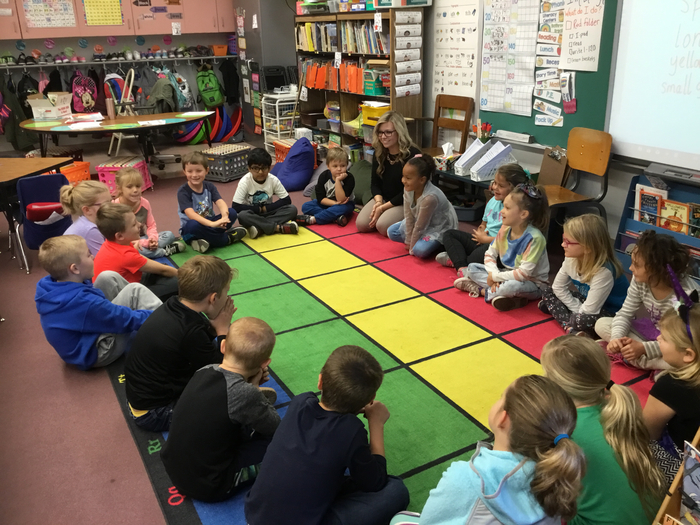 Mrs. Becker’s class was excited to get to know our EIU practicum student ! 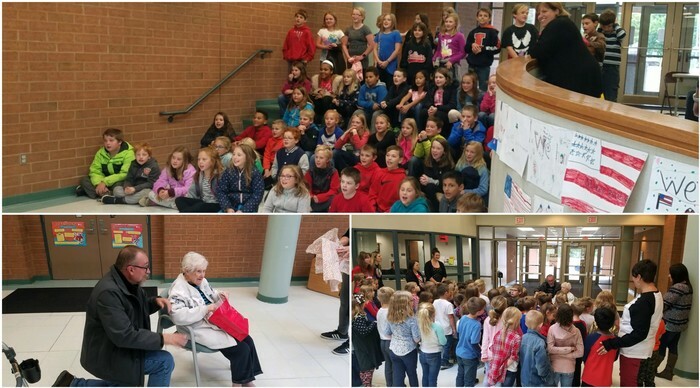 Some Sullivan Elementary Students got to sing happy birthday and make cards for Doris Featherling who will turn 101 years young tomorrow! Happy Birthday from your friends at SES, Doris! 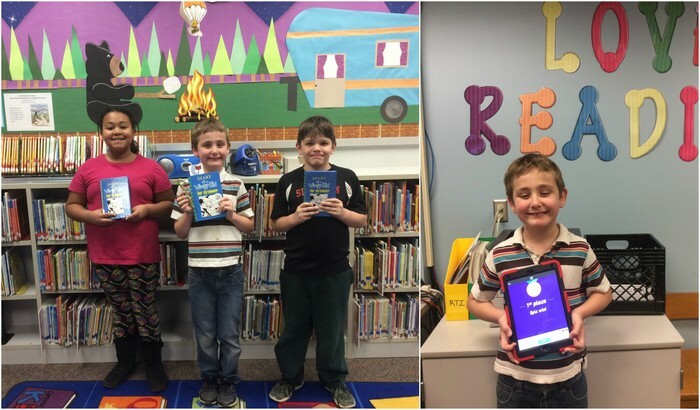 Students in 3rd and 4th grade enjoyed “tasting” each of twenty 2019 Illinois Bluestem Award nominated books at the “SES Bluestem Cafe.” The Bluestem cafe was complete with the ambiance of, flowers on the table, a cozy fireplace (on the smartboard) and dinner music (played on an IPad). 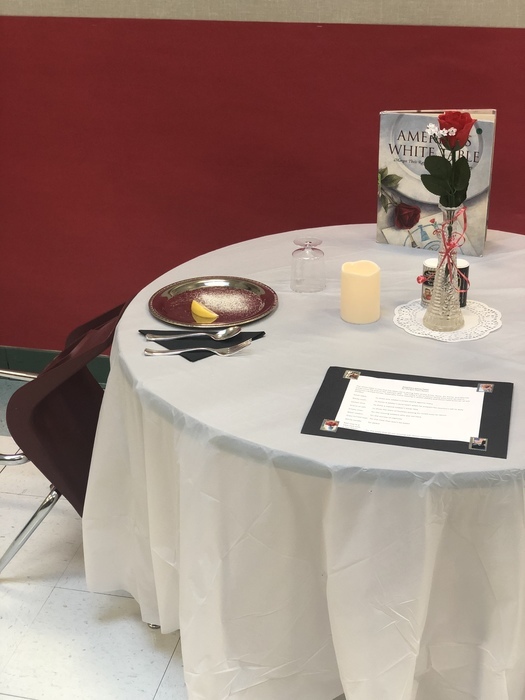 While “tasting” the books students used their best restaurant manners. They then marked on their menus the books they were most interested in reading. Students who read four or more Bluestem nominated books by March will be eligible to vote on their favorite book, along with other students in Illinois. 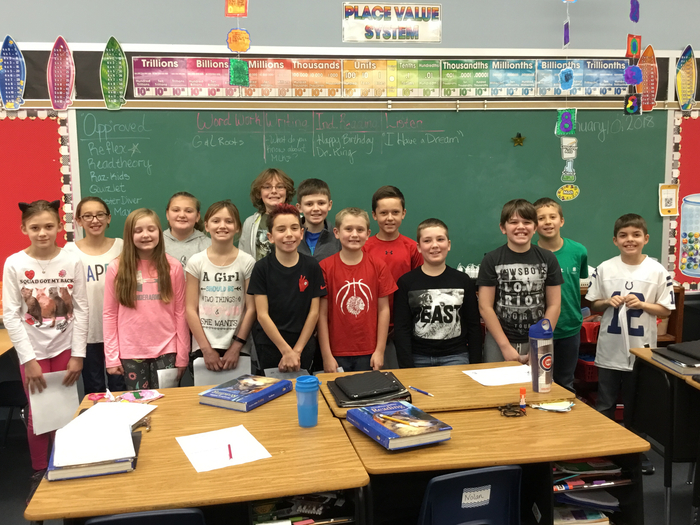 Pictured is Mr. Friese’s 4th grade class. Scholastic Book Sponsorship update! Due to some tremendous efforts by our teachers (notably Mrs. Dickens and Mrs. McCain, who raised not only enough money for their classrooms but enough for several other classrooms as well), we are down to having just 38 students needing sponsored! We cannot begin to tell you how appreciative we are to both the businesses (Aspen Creek and Sarah Bush Lincoln) and community members (and alumni) who have contributed to this cause! Because of your generosity, we are closing in on getting all of our nearly 500 students one book a month for the rest of the school year! Reminder: Fall Fundraiser pickup at the elementary school is this afternoon. The east entrance will be open at 2:30 and the west entrance at 3:15. All items must be picked up by 6:00. First grade has recently been learning about insects. We spent a morning making insects, learning how to eat like an insect, and exploring for insects. A HUGE thank you to Mr. V, Mr. Palmer, Mrs. Lehman, and many others ! 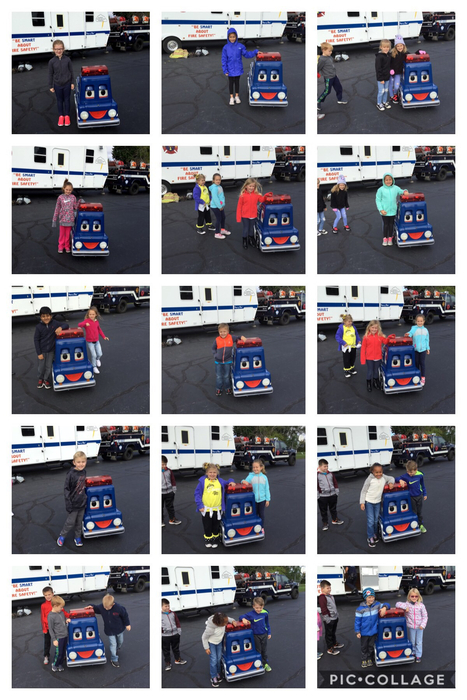 Mrs. Becker’s class loved learning about fire safety from Freddy the fire truck ! 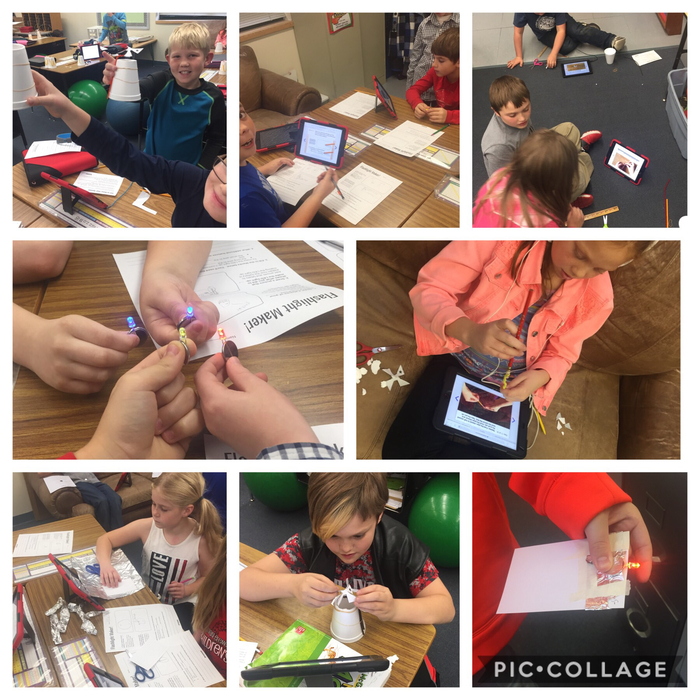 This week in Mr. Campbell’s science class, 4th grade students explored how energy can make things go. 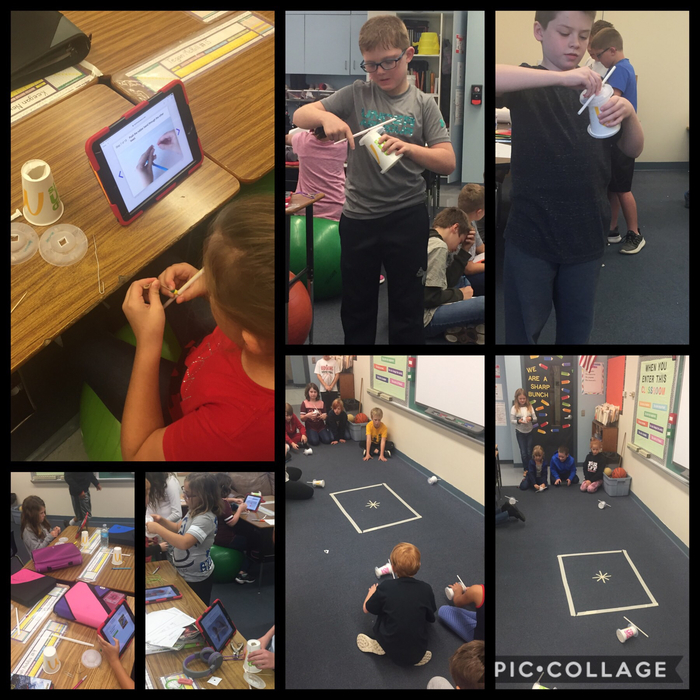 Students created and experimented with rubber-band cars to figure out how much energy the cars needed to end up in the designated box. 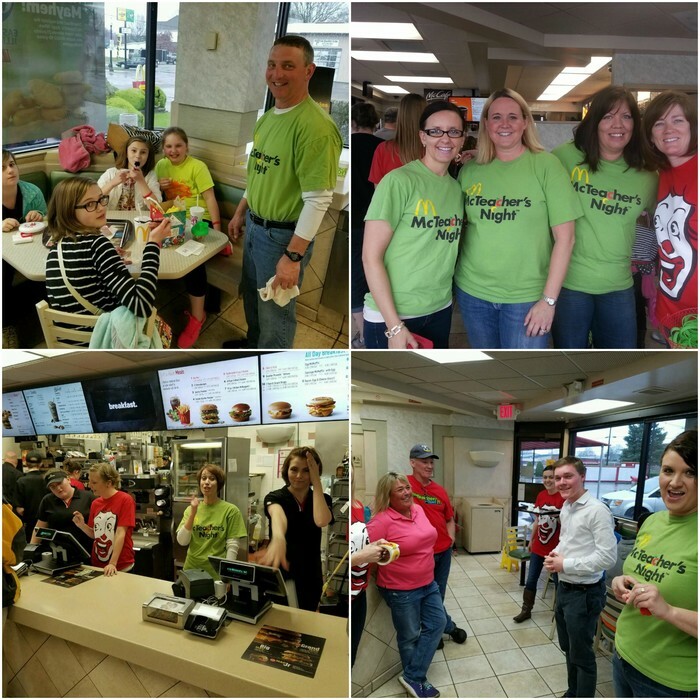 Also, a huge shout-out to Angie Matlock of McDonalds in Sullivan for donating the majority of the items needed to complete this activity! Thank you! This money and note were brought to Sullivan Elementary to help sponsor a student for a book a month from Scholastic. It was given to us by an alumna's kindergarten son who heard about our Facebook post. 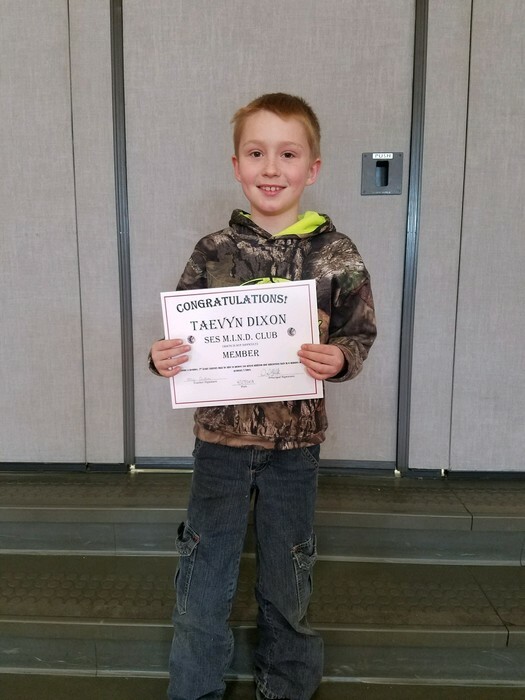 He wanted to give one of our students an opportunity to get books, so he got $8 from his piggy bank and sent it to the school with his grandma. We are still taking sponsorships ($8 per student) to get students 1 book a month for the year from Scholastic Books. 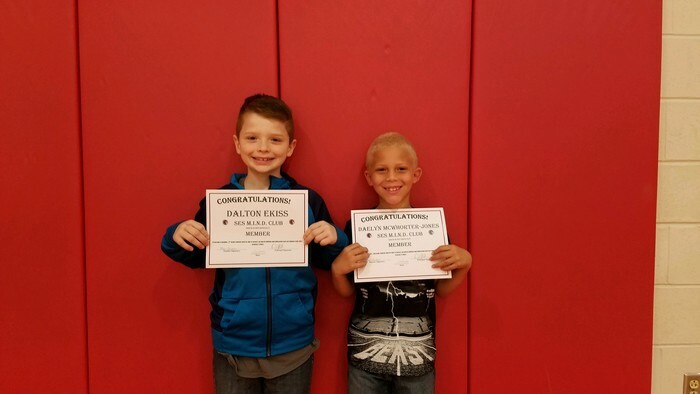 Checks can be made out to Sullivan Elementary School and sent to SES, attention Daniel Allen, 910 N. Graham St., Sullivan, IL 61951. 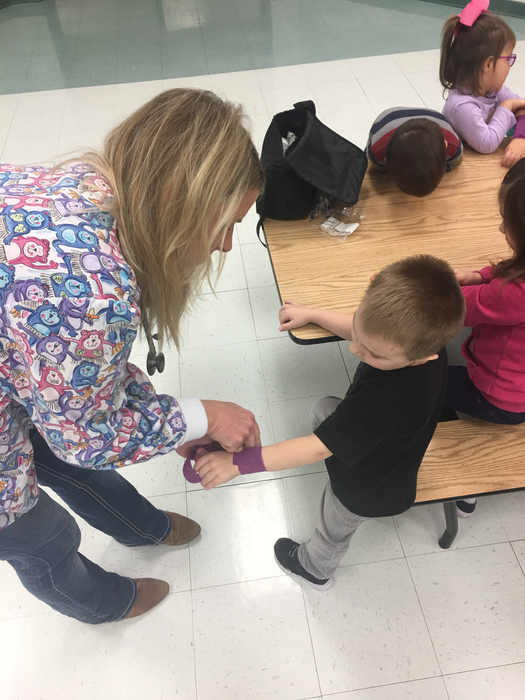 Mrs. Becker’s class has been learning all about the human body. 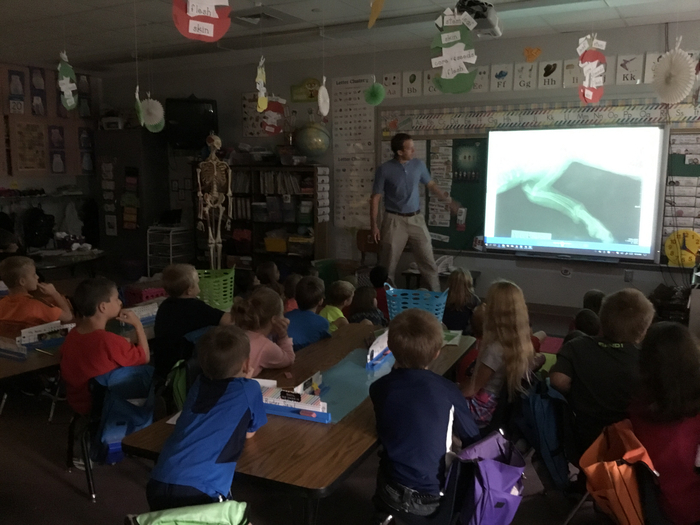 The students loved having Mr. Bones in our class to help learn about the skeletal system! A huge thank you to the high school science department for letting us borrow it. Even mistakes can create something beautiful. 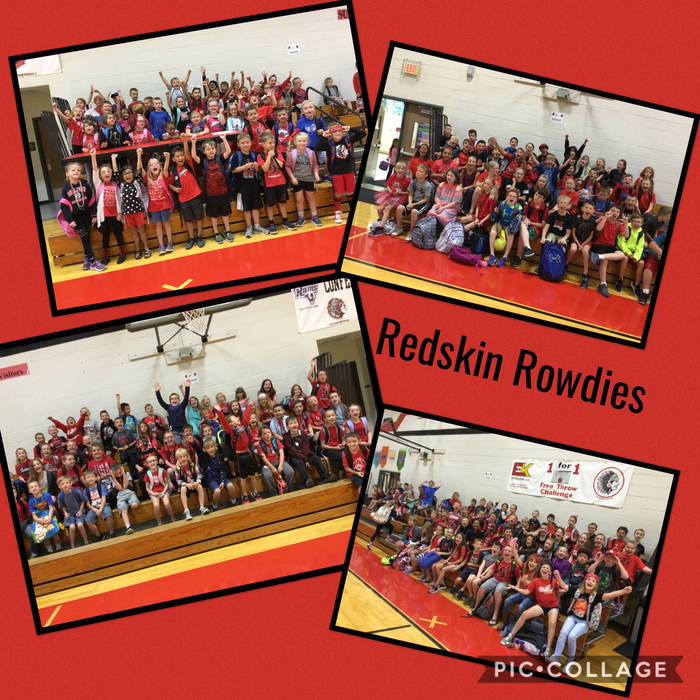 The elementary school is ready to cheer on our Redskins !!! 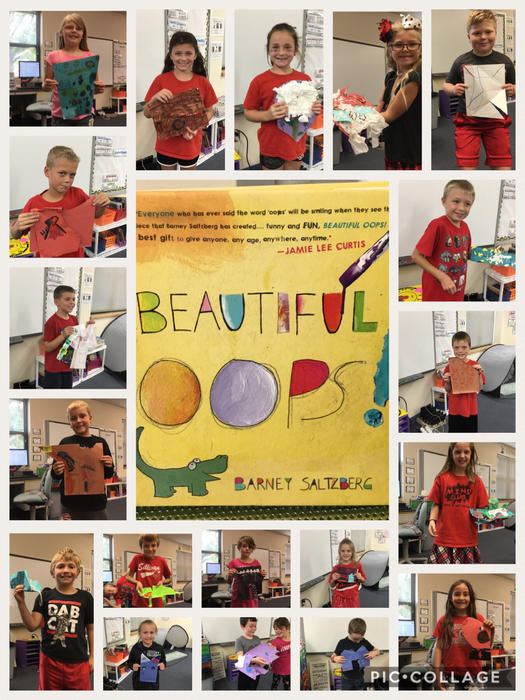 Mrs. Becker’s class was lucky enough to be sponsored by many wonderful people to receive a new book each month. The students were so excited to get their first book. Thank you to all who sponsored! First grade has finished our unit on the growing cycle of the apple. 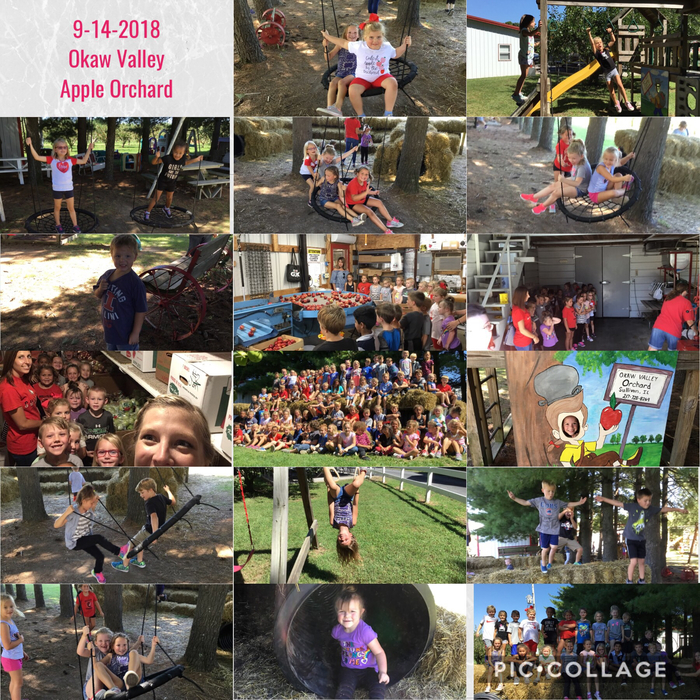 We finished the unit with a trip to the Okaw Valley Apple Orchard. 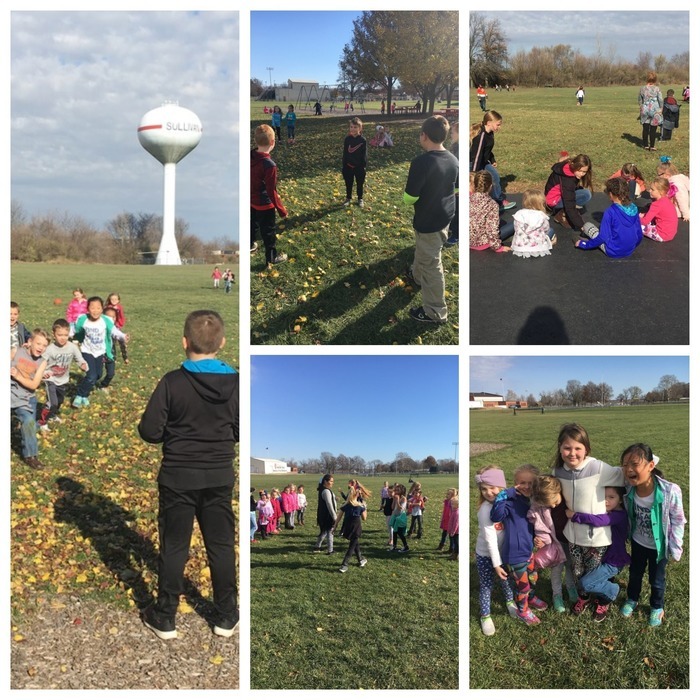 Mrs. Becker’s class had a grade day searching for apples, learning to make apple cider, and playing at the orchard. Mrs. Becker’s class had a great day celebrating good behavior at Hawaiin Day ! 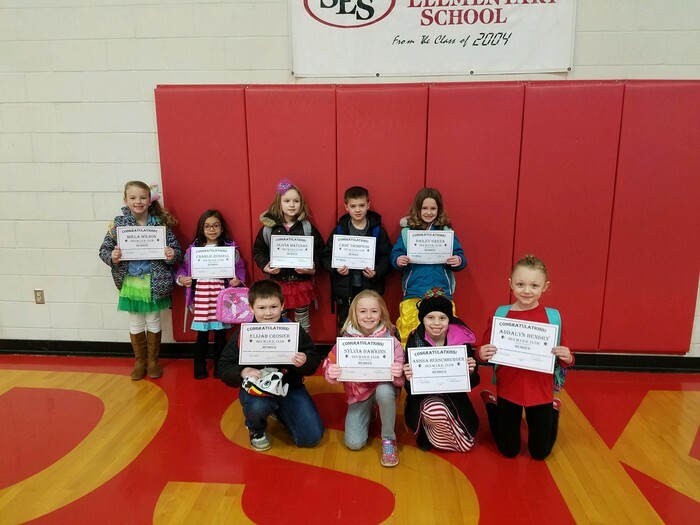 Each month, Sullivan Elementary School recognizes students who go above and beyond expectations by awarding them "Gold Slips." 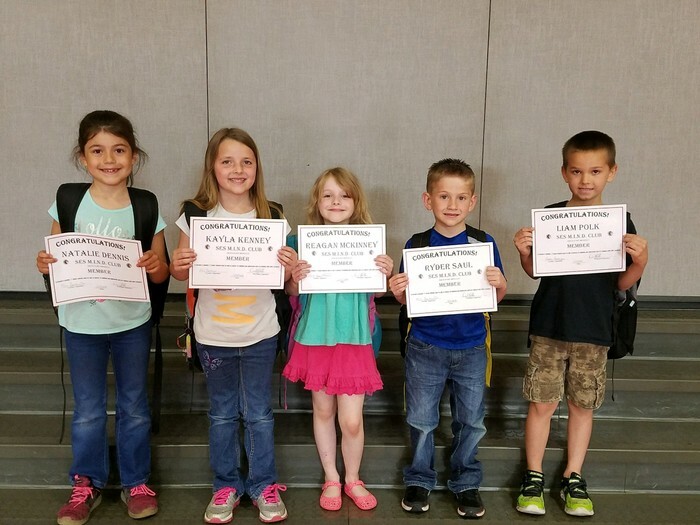 Pictured are the students (from left to right) who were awarded Gold Slips for the months of August and September:Kayla Kenney always makes a point to find students with no one to play with and then plays with them. She is always smiling and happy to help! 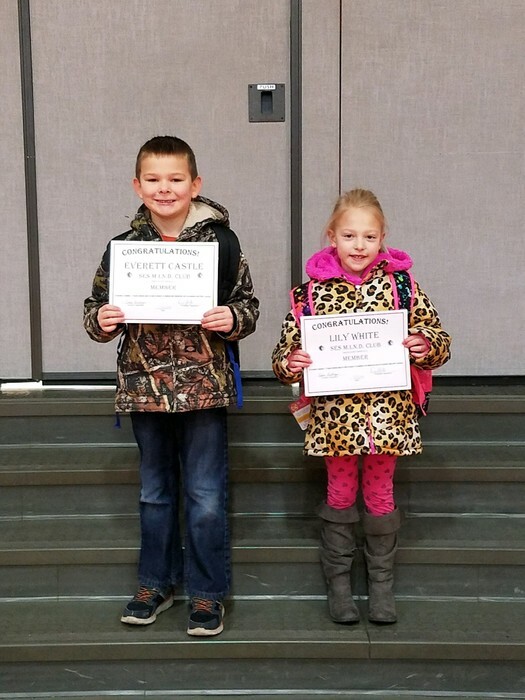 Levi Risley and Gracelynn Dovell are always very respectful and set a great example for others. 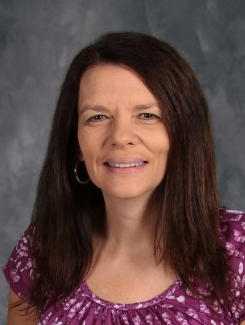 Lorelei Parker respectfully accepted a student's apology after being disrespected by them. She even wrote them a letter to accept their apology and gave them suggestions on how to treat one another. 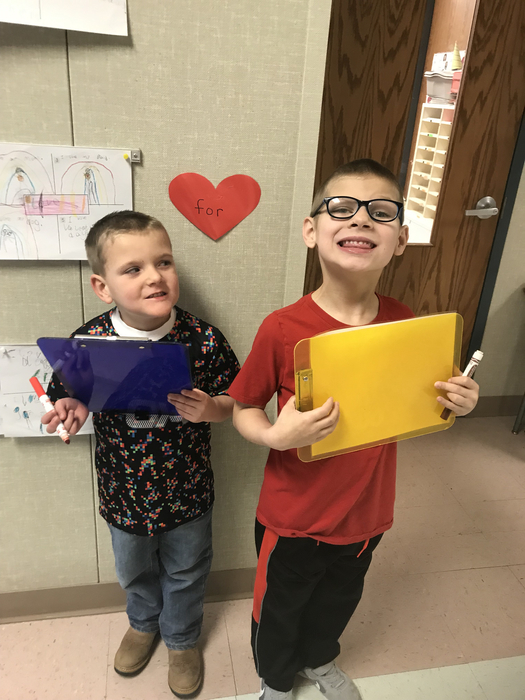 Weslee Allen was walking with a friend and his little sister after school when the friend realized he forgot his take-home folder in the classroom. 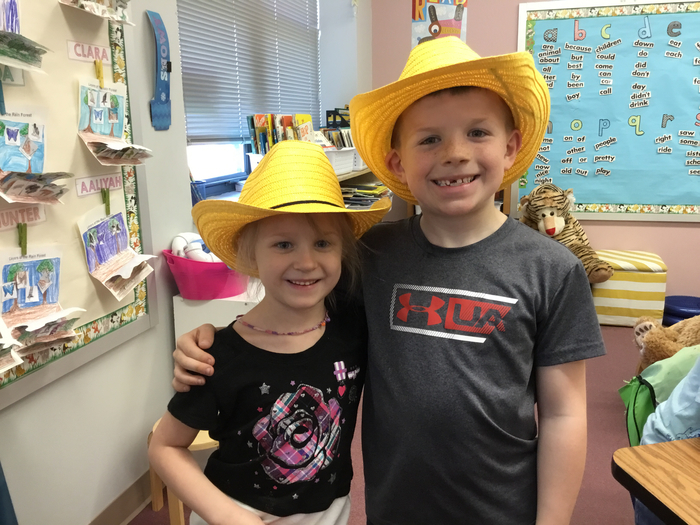 Wes volunteered to run back to the classroom and get it so his friend didn't have to leave his sister. What a great friend! Daisy Richardson volunteered to help a student who was struggling to keep his binder organized. 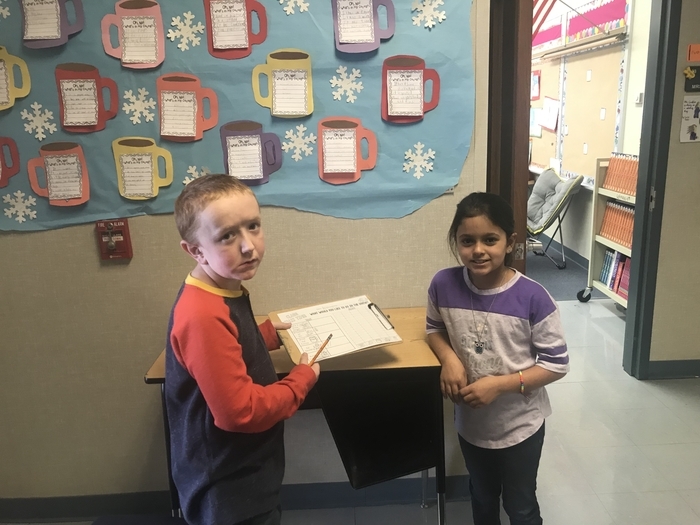 She gave up her entire recess to work with him to get everything in order and even took time to teach him helpful tips for staying on task and organized. Daisy is helpful and kind! Lily Betts has picked up trash (with latex gloves on) all week from the playground. She has done this on her recess time without being asked. Hawaiian Day doesn't happen without these two special people! Coach Typer has been busy all week preparing and was here at 5:00 this morning to get set up. Mrs. Graham also spent all week planning and preparing, making sure we had all the materials we needed. 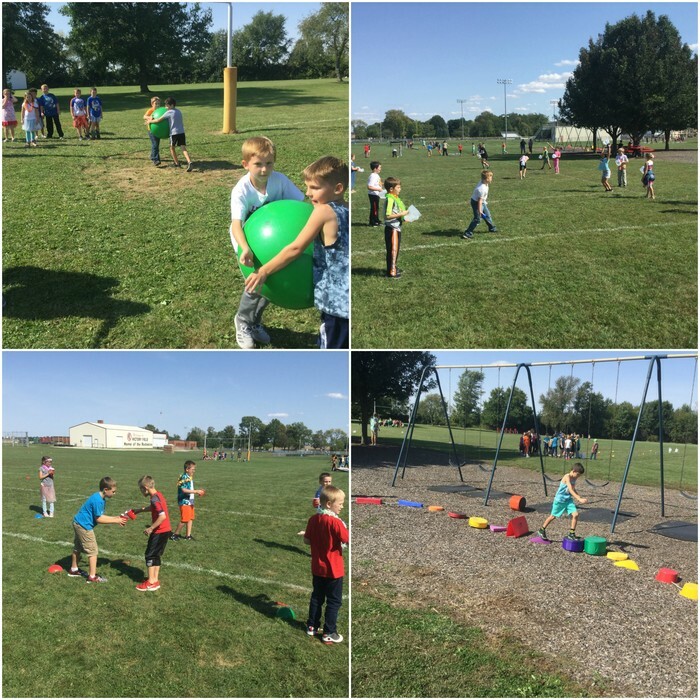 Beach ball relay, milk jug ball toss, pass the water and cross the lava at the SES Hawaiian Day Good Behavior Celebration! Throwing bags, landing frisbees in the hula hoops, and many other fun activities at Hawaiian Day! Students at SES enjoyed a great Good Behavior Celebration during Hawaiian Day. 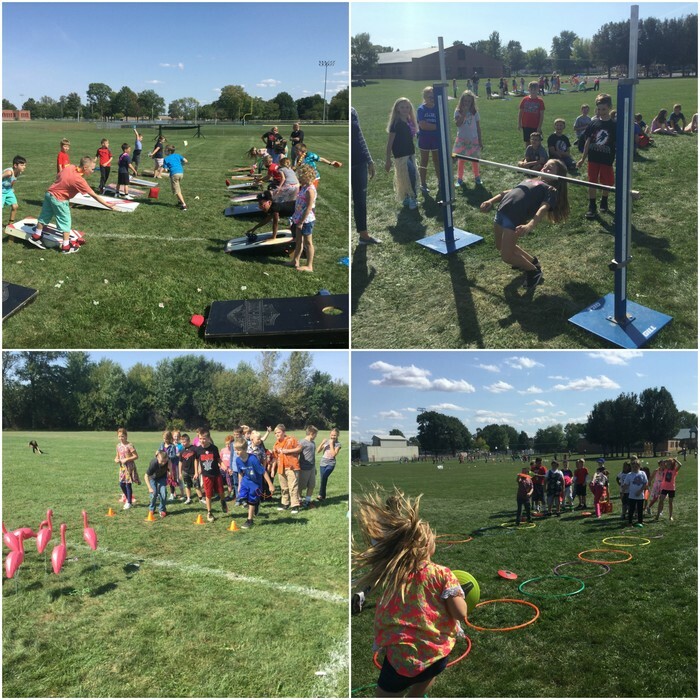 They got to play various games such as musical beach towels, tug-o-war, bags, and limbo. Big shout out to the fantastic PTO for providing volunteers to help run the games today! 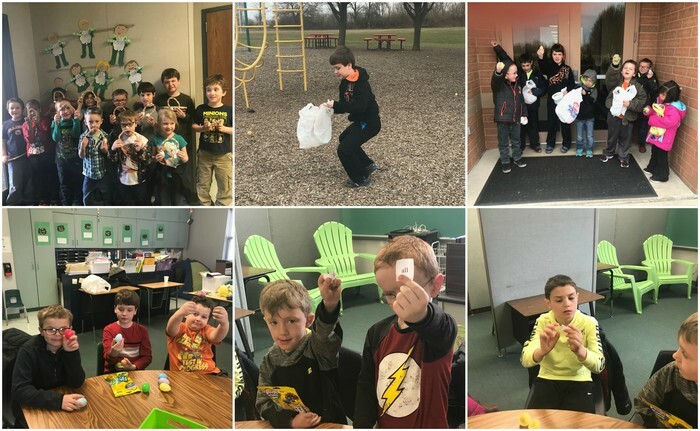 These 4th grade students showed a great deal of school pride by sacrificing their recess to pick trash up around the elementary school. Way to go! 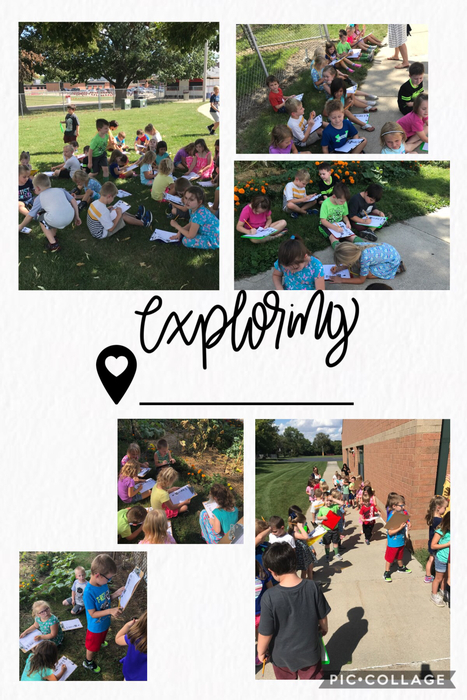 Mrs. Watkins’ and Mrs. VanDeursen’s Kindergarten classes went on a nature walk today. They explored the outdoors using their five senses. 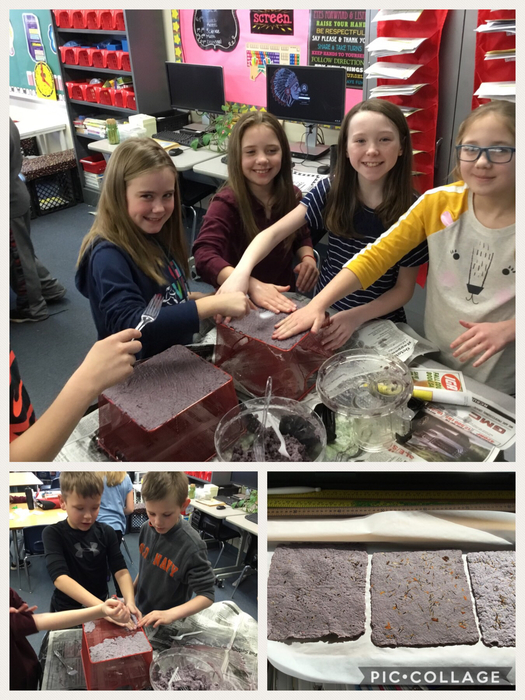 Students in Mr. Campbell’s class explored how rocks break apart into smaller pieces. 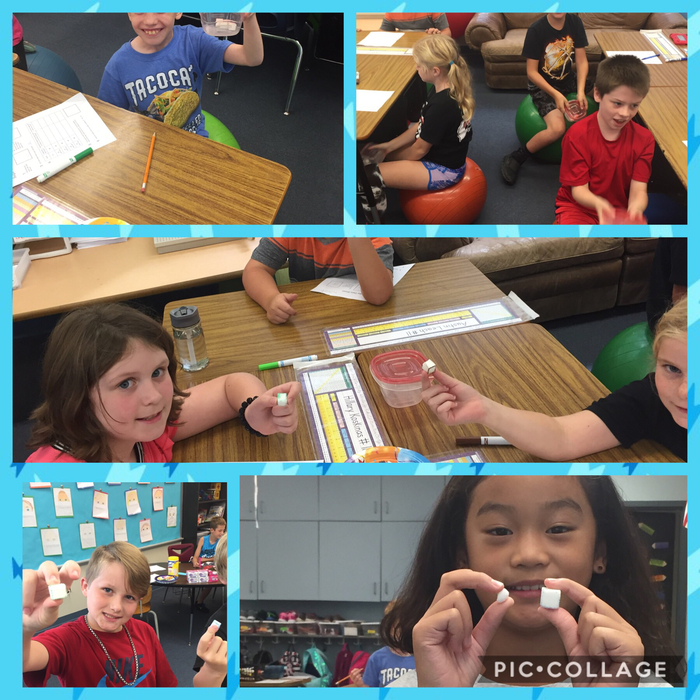 In this activity, students modeled how rocks tumbling and crashing into each other by shaking sugar cubes in containers. 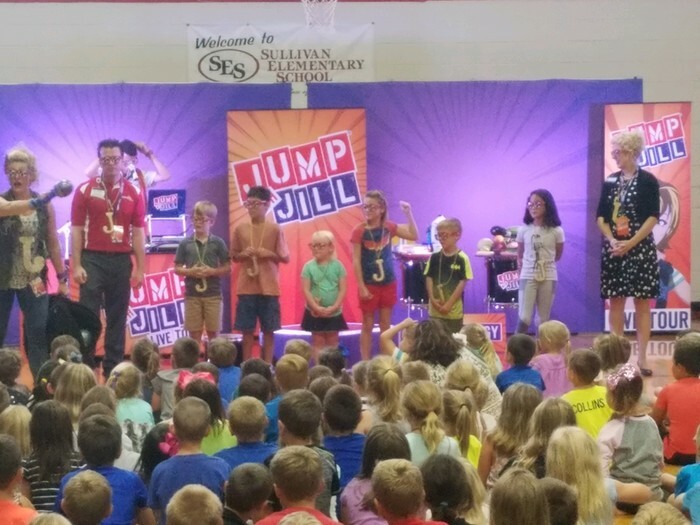 Sullivan Elementary students were treated to a great assembly today put on by "Jump for Jill." The show revolved around eating healthy and being active. Students were highly engaged throughout the assembly. 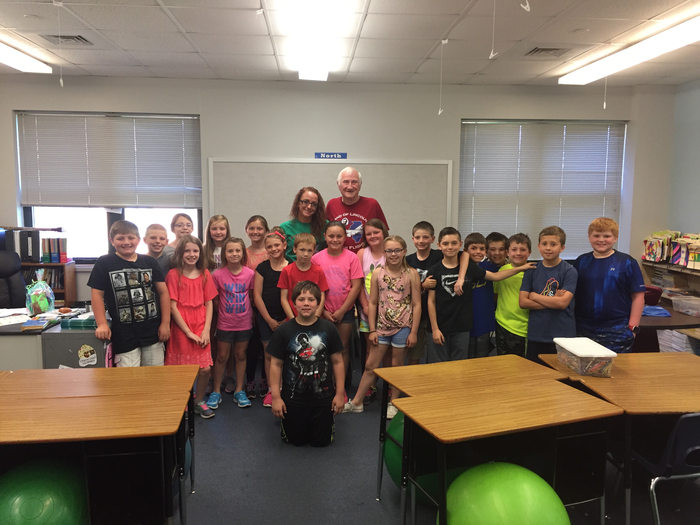 "Jump for Jill" was sponsored Sarah Bush Lincoln who also comes to our classrooms to teach students about leading a healthy lifestyle. 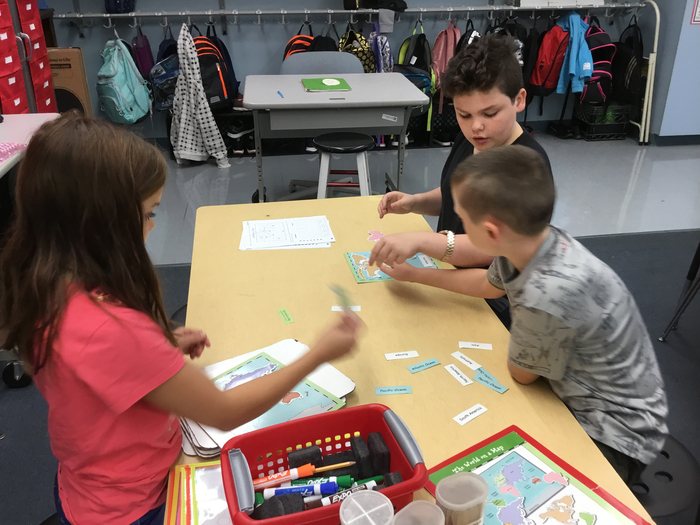 4th grade students practice continent and ocean locations during Mrs.Hendry’s social studies block. 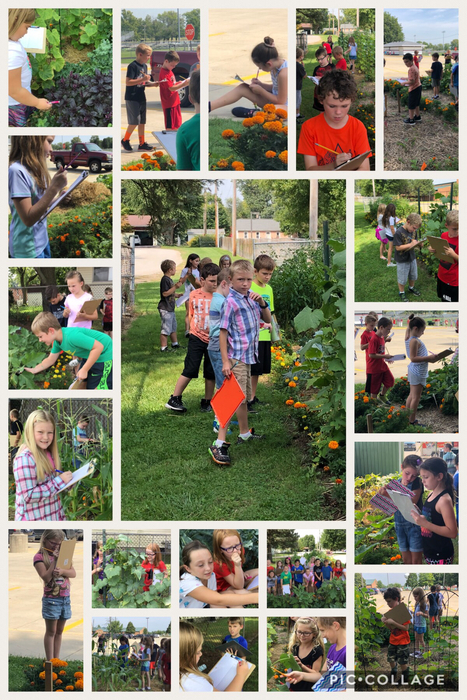 3rd grade takes reading to the garden with “I noticed” and “I wondered” statements. Mrs. Watkins’ Class would like to say thank you to everyone who sponsored a student in this classroom!!! We received our first book today! First grade spent the last week reviewing letters and letter sounds. 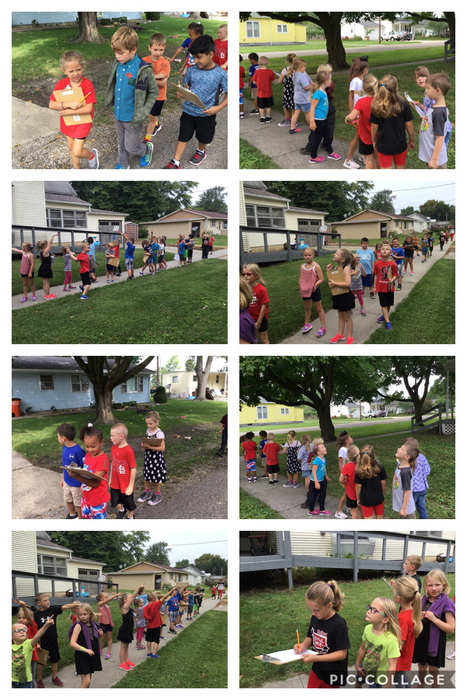 To top off the week, the students went on a ABC walk and hunted for items that started with their given letter ! 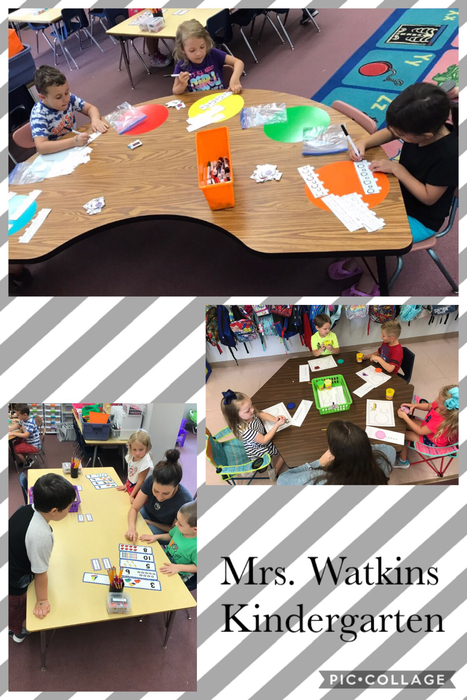 Mrs. Watkins’ Kindergarteners kick off another week with centers focusing on letter and sound identification, color and shape recognition, name writing, and Lexia. 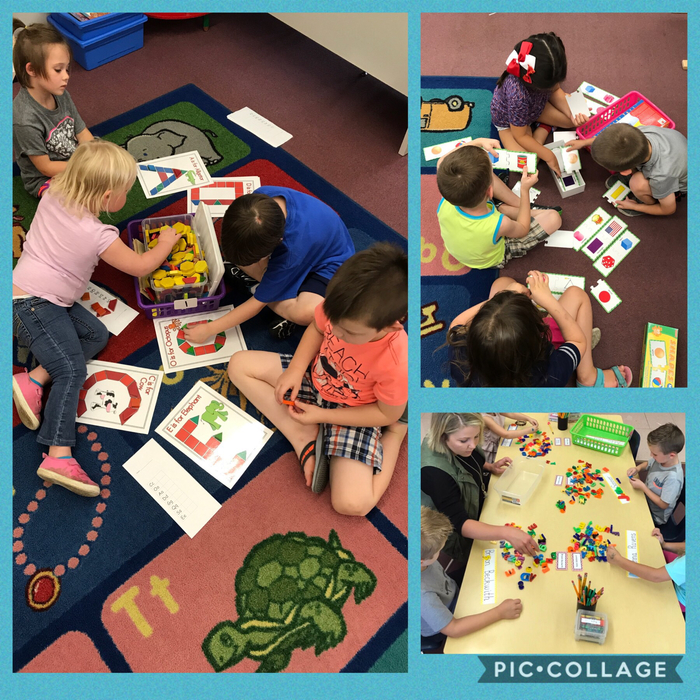 Mrs. Watkins’ kindergarten class began working in centers today. 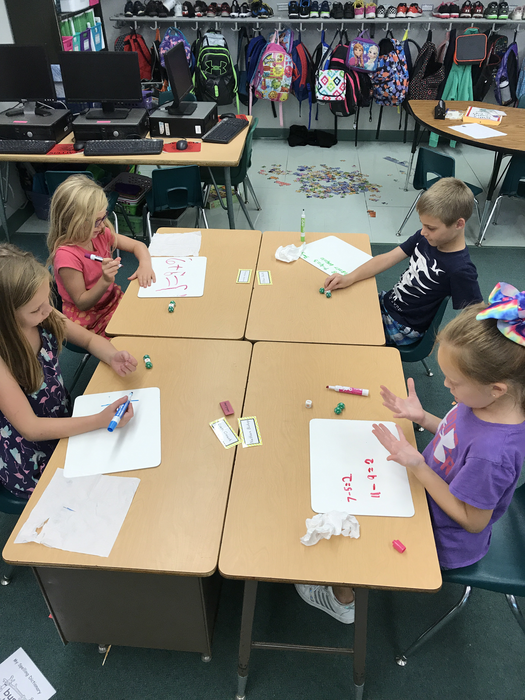 They were excited to participate in hands-on activities to practice letter identification, sounds, numbers, shapes, and their names. Name: Haley Seeley Grade Level: Early Childhood Years of experience: 18 years Hometown: Bethany, IL Favorite band: I love music! Too hard to choose just one! 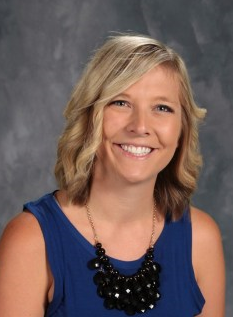 Favorite movie: Home Alone Favorite sports teams: U of I; St. Louis Cardinals; Chicago Bears Favorite color: Green Favorite subject: Reading and Social Studies Favorite teaching memory: I absolutely love seeing former students years after I have had them in class. I always want to hear how they are doing in school, how their families are doing, what they have been up to, etc. I love teaching because... I love spending time with kids! What I want most for my students is... to look back at their time in school and remember it as being one of the best parts of their lives. 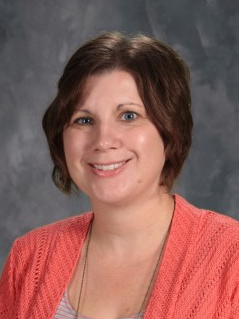 Name: Mrs. Watkins Grade Level: Kindergarten Years of experience: 4 Hometown: Forsyth Favorite band: Goo Goo Dolls Favorite movie: Matilda Favorite sports teams: STL Cardinals & Green Bay Packers Favorite color: blue Favorite subject: math I love teaching because I enjoy sharing my love for learning with others. What I want most for my students is for them to love learning and be excited to come to school each day. Name: Erin VanDeursen Grade Level: Kindergarten Years of Experience: 6 years Hometown: Mattoon, Illinois Favorite Singer: Carrie Underwood Favorite Movie: Beauty and the Beast Favorite Sports Team: Chicago Cubs Favorite color: Pink Favorite Subjects: Reading and Writing Over the past five years, my favorite memory is watching each of my students succeed and complete tasks/activities her/she once felt were too tricky or challenging. I love teaching because I have the opportunity to inspire kids and help them develop a passion for learning! What I want most for my students is for them to look forward to coming to school, knowing that they are cared about and excited to learn something new each day! 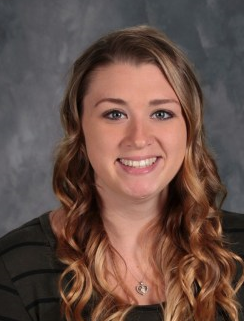 Name: Sara Dickens Grade Level: Kindergarten Years of experience: 24 Hometown: Sullivan, IL Education: University of Illinois Favorite band: Rascal Flatts Favorite movie: E.T. Favorite sports teams: Cubs Favorite color: Purple Favorite subject: Math Favorite teaching memory: I will never forget when we were learning about the heart. We were running in place for one minute to make our heart beat faster. When the minute was up, I told the kids to be really quiet and try to listen and feel their heartbeat. After a couple of seconds, one little boys blurts out in a panic, "Mrs. Boyer!! Mrs. Boyer!! I can't feel my heart!! I think it needs new batteries!!" I quickly helped him find his heartbeat, but on the inside I was laughing hysterically!!! Kids really do say the darndest things!!! I love teaching because... I absolutely LOVE watching kids grow, and change, and learn!!! I LOVE it when I see that light bulb turn on and they finally "get" something they have been working so hard on. I LOVE the confidence that beams from their smiles! I LOVE to help make a positive difference in their lives! (And I ESPECIALLY LOVE all of the HUGS I have received over the years....definitely one of my favorite parts of teaching Kindergarten!!) What I want most for my students is... to have SO MUCH FUN learning that they don't even know they are doing it!!! I want them to embrace a LOVE FOR LEARNING and to know that SCHOOL IS FUN!!! Name: Jake Haegen Grade Level/Subject: Kindergarten Years of experience: 16 Hometown: Sullivan Favorite band: 311 Favorite movie: Point Break Favorite sports teams: St. Louis Cardinals and Fighting Illini Favorite color: Green Favorite subject: Science Favorite teaching memory: I have several, but here are some of my favorites. I once explained a math problem to a kid and his face lit up like he understood! I said, “So, do you get it?” He said, “No, but your breath stinks!” Another time we were learning about the color white and a student seemed confused. So, I asked, “What color are my teeth?” She said, “Yellow!” And finally, my mother-in-law asked a student how they liked kindergarten. She said, “Mr. Haegen is a real good teacher, ain’t he?” I love teaching because... I’m a kid at heart and kids like to have fun! What I want most for my students is...to love to come to school! Name: Joellen Mars Grade: First Years of experience: First year! (and super excited!) Hometown: Shelbyville favorite movie: Sweet Home Alabama Favorite Sports team: STL Cardinals Favorite color: teal blue or neon pink Favorite subject: Reading Favorite teaching memory: Although I'm new to this, my favorite memory from student teaching was seeing that lightbulb moment when a student finally got it! I also love hearing students say that I made them feel comfortable or excited to learn. I love teaching because it truly makes an impact on the future. Seeing the excitement in kids' faces makes my heart happy. I teach because I love kids and I want to make a difference. What I want most for my students is for them to feel loved and accepted. I want them to grow academically and socially. I hope to instill values in them and create memories that will stay with them forever. Name: Cassie Becker Grade Level:1st Grade Years of experience: 4 years Hometown:Gibson City College: Eastern Illinois University Favorite band: The Beatles Favorite movie I watch with my kids: The Little Mermaid Favorite sports teams: Sullivan Redskins and The Cubs Favorite color: Pink and Teal Favorite subject: Math !!! Favorite School Supply: Post-its and Coffee Favorite teaching memory: Dunking at the Wizards Game I love teaching because... I love teaching because every student is different, every day is different, and every day there is a chance to learn something different. What I want most for my students is for my students to fall in love with learning and want to keep learning for the rest of their lives. Name: Eudora Drollinger First Grade Years of Experience: 36 Hometown: Sullivan Alma Mater: Eastern Illinois University - Bachelor's Degree Southern Illinois University - Edwardsville - Master's Degree Favorite Concerts: Garth Brooks, Billy Joel, Michael W.Smith/Amy Grant Favorite Sports Teams: Fighting Illini, Chicago Cubs Favorite Colors: Blue, Lime Green Favorite Pizza Place: Monical's Favorite Vacations: Washington D.C., Canadian train trip, any National Park, beaches One of the reasons I love teaching is because I get to share to books, books, and more books with kids everyday. What I want most for my students is that they love school, have character, and are blessed with people in their lives that will always help them and support their educational journey! Teaching memory: When I went to interview for my first job, the man outside sweeping the sidewalks directed me to the principal's office. A few minutes later I discovered that man was the principal. The message I got was to be willing to jump in and do what needs to be done and to be respectful to everyone. That makes for a great school! On a lighter note: One afternoon at around 2:40, a parent arrived at my classroom door and said she was removing her child from our school to homeschool him. The next morning, around 8:20, that student walked into my classroom and said "I'm back!" 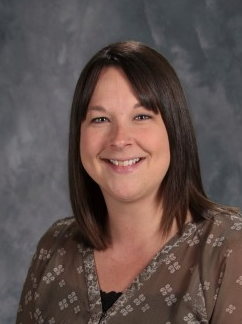 Name: Leslie Auten Grade Level:2 Years of experience: 30 Hometown: Shelbyville, Illinois Favorite band: No favorite, but I enjoy listening to lots of artists. 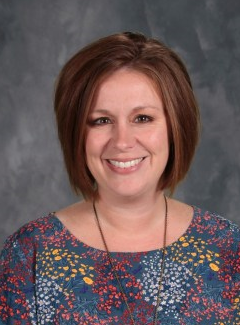 Favorite movie: the Harry Potter movies Favorite sports teams: Sullivan Redskins Favorite color: purple or navy blue Favorite subject:math and science Favorite teaching memory: There are too many memories to have just one! Everyday, I look forward to the smiles and accomplishments of my students. I love teaching because... I enjoy being around children with all of their enthusiasm to learn and I enjoy leading them to gain new knowledge. What I want most for my students is... to feel successful, proud, and have that eagerness to learn. Name: Amber Saul Grade Level: 2nd grade Years of experience: 13 years Hometown: Oreana, IL Favorite band: Hmm.. 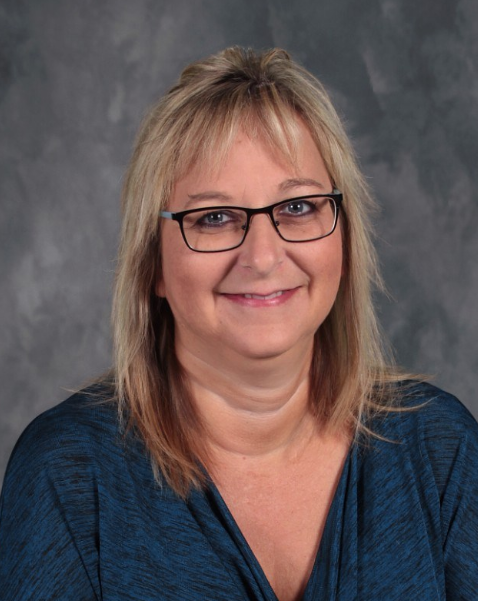 I like to listen to any live music Favorite movie: Pretty Woman Favorite sports teams: St. Louis Cardinals Favorite color: Yellow Favorite subject: Math Favorite teaching memory: Too many to name just one! I love teaching because... everyday is different! What I want most for my students is... to feel loved each and every day in our classroom! Name- Ashley Hussong Grade-2nd Years of Experience-14 years Hometown-Lovington Favorite Movie-Pitch Perfect and Elf Favorite Sports Team-Cubs Favorite Color-Blue Favorite Subject-Math Favorite Teaching Memory-I have so many teaching memories, but my favorite would have to be when we paper mache' pigs as we read Charlotte's Web. 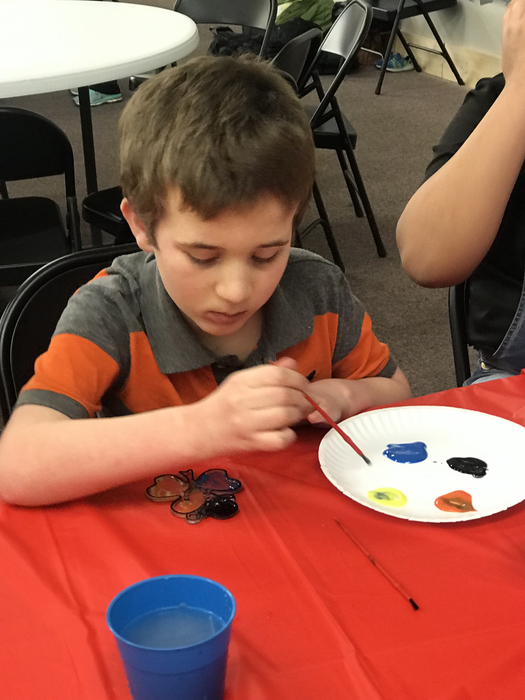 It is a long process that includes blowing up balloons, covering the balloons with 2 layers of paper mache', adding legs, painting the pig, hot glueing ears and tails on, and then naming each pig! It is a messy process that is so much fun!! I love teaching because everyday is a new adventure. I also get to spend my days with about 20 kids that look up to me, laugh at my corny jokes, hug me, and want to spend time with me!! What I want most for my students is for them to know that I truly care for them and want to see them succeed. Melissa Haegen 2nd Grade 11 yrs in 2nd grade at SES Sullivan graduate Fav Band: 80s and 90s Monster Ballads Fav Movie: I can't pick just one but I love Breakfast Club and Dirty Dancing Fav Sports Team: St. Louis Cardinals Fav Color: all colors of the rainbow Fav Subject: I enjoy teaching reading Fav teaching Moment: I love when former students come back and share memories with me about times in 2nd grade. I love to see how they have grown and matured. It's a great reminder of why we do what we do and that each and every year is important to our students. What I want most for my students is to give them the confidence to be themselves. I want them to feel safe in my classroom and know that they always have a place here. Name: Jennifer Hobbs Grade Level/Subject: 3rd Grade Years of experience: 9 Hometown: Lincoln, IL Favorite band: Dixie Chicks Favorite movie: The Notebook Favorite sports teams: Bears and Cubs Favorite color: Purple Favorite subject: Reading Favorite teaching memory: "Mrs. Hobbs, I love that you love teaching us. I always know we are going to learn something new from you." I love teaching because... the world is full of mysteries and opportunities, you just have to seek them out. 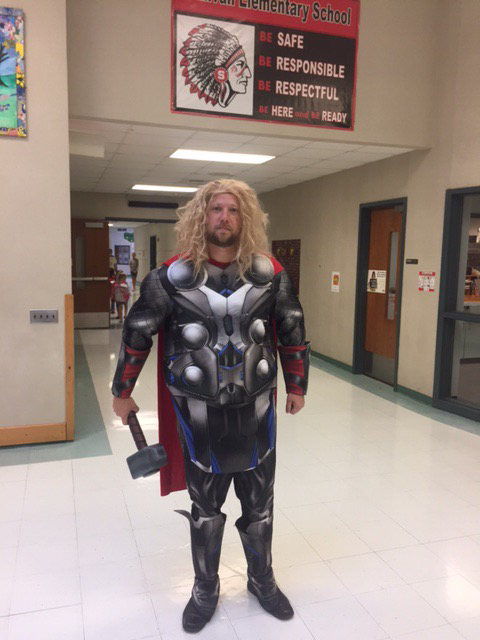 What I want most for my students is...to know they are more precious and valuable than gold...or Fortnite. Name: Allie Wright Grade Level: 3rd Years of experience: 2 College: Illinois State University Hometown: Mattoon, IL Favorite artist: Thomas Rhett Favorite movie: The Blind Side Favorite sports teams: Cardinals Favorite color: Black Favorite subject: Math Favorite teaching memory: I'm new to this, but I would say my favorite teaching memory was leaving the 3rd grade class that I student taught. Although it was extremely sad because I got so close to the students, getting to see them upset that I was leaving made me feel like I really left an impact on their lives. I love teaching because... of the relationships I can form with the children. It is amazing to watch them understand concepts and have those "light bulb" moments, but what I love most is getting to have nearly 30 eight year old friends. What I want most for my students is... not only growth and development while in my classroom, but also to feel loved and appreciated every day. Name: Drew Campbell Grade Level: 4th grade Years of experience: 14 years Hometown: Oakland, IL Family: Haley, Tenley (6), Presley (4), and Khiry (2) Favorite band: Dave Matthews Band Favorite movie: Gladiator & Toy Story Favorite TV show: Game of Thrones Favorite sports teams: Indianapolis Colts, St Louis Cardinals, & Chicago Blackhawks Favorite color: Blue Favorite subject: Math Favorite teaching memory: My first year, on my first day, and with my first class. I'll never forget that day as I closed the door behind me with 22 pairs of eyeballs staring straight through me, while I nervously utter the words "Good morning, I'm Mr. Campbell your 4th grade teacher!" At that very moment, I'm not sure who was more terrified, the students or me! Needless to say, we all learned, laughed, and grew together! A snapshot I share with every class, every year! I love teaching because...I get to act like a kid! I get to be silly and goofy with the students, I get to eat lunch with them, or jump around the room when we need a brain break. But most of all, I get the privilege of watching them grow academically and mature into big, bad 5th graders! What I want most for my students is...growth, both in the classroom and outside of the classroom! I want them to become better readers and writers! I want them to explore and discover the joys of science and community! I want them to become confident and fluent with numbers! I want them to respect themselves and become more confident! I want them to be more considerate and thoughtful of others! I want them to challenge themselves to learn new things! I will provide them the resources, the support, and the avenues to find that growth! Let's GO! Kurt Friese 4th Grade Experience: 9 years Hometown: Strasburg Favorite Band: 3 Doors Down Favorite Movie: Any of the Fast and Furious Movies Favorite Sports Teams: Detroit Tigers, Philadelphia Eagles, Boston Celtics Favorite Color: Green Favorite Subject: Math I love teaching because everyday brings a new experience. What I want most for my students is that they want come to school and learn in my class. Name: Nichole Hendry Grade Level: 4th Years of experience: 9 years Hometown: Palmdale, CA Hobby: coaching the SBD Swim Team Favorite music genre: 90's Alternative Favorite movie: Anything funny Favorite color: Purple Favorite subject: Social Studies Favorite teaching memory: I love reading aloud Historical Fiction and watching students realize the books they are so in love with are events from our US history. I love teaching because...I get to meet and positively influence so many unique students. What I want most for my students is...for them to be confident that they can achieve their dreams with hard work and a desire for success! Name: Kay Lehman Grade Level: Fourth Years of experience: 14 Hometown: Mattoon, Illinois Favorite band: Eagles, Alabama, and Little Big Town Favorite movie: Gone with the Wind Favorite sports teams: Chicago Cubs!! Chicago Bears! Favorite color: purple and orange Favorite subject: Reading Favorite teaching memory: Every time a former student sends me a note or comes back to visit me and tells me how much they loved being in my class in the fourth grade and how being in my class made them want to come to school each day. I love teaching because... there is no better feeling than when you see that lightbulb go on in a child's head when they " get it ". Their "aha" moment! What I want most for my students is... to love coming to school, feel safe, have fun, and to learn and retain something new everyday that will help them later in life. 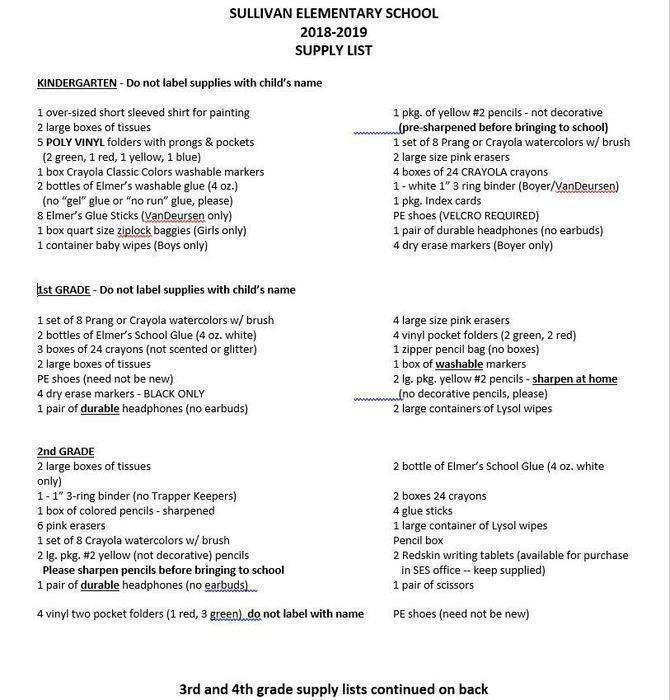 Here are the supply lists for K-4 again. 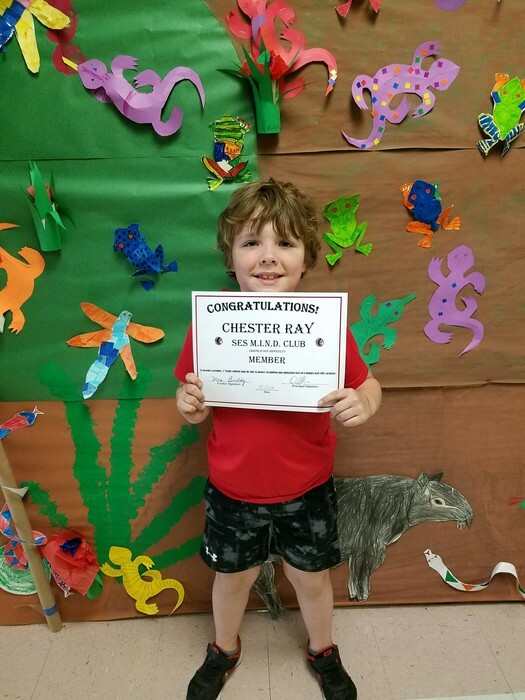 Elementary class lists will be posted at 3 p.m. at the east and west entrances of SES on Tuesday, July 31st, so make sure you have them registered ASAP! 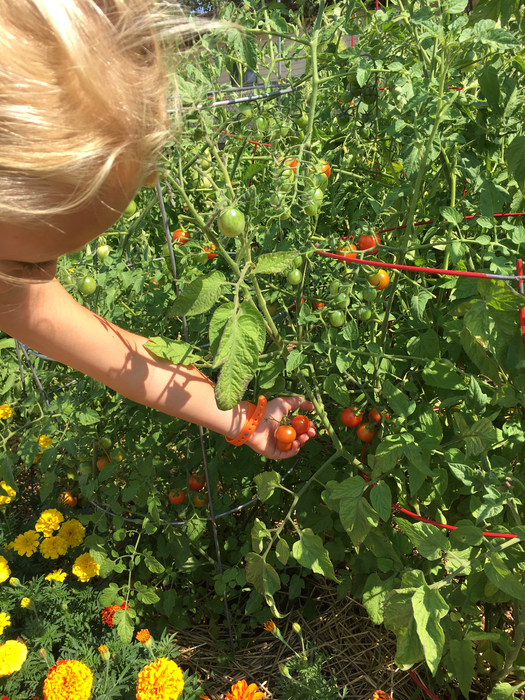 Join us Wednesday 4:30-6:30 as we continue to grow in the garden. 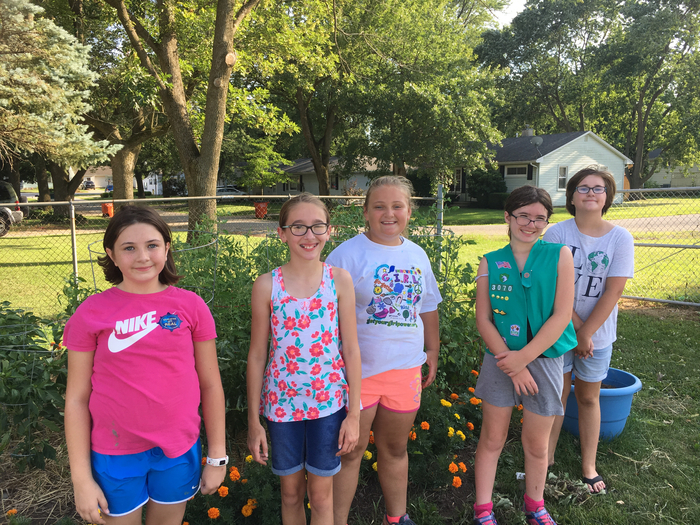 Local Girl Scouts volunteered in the garden pulling weeds, planting new seeds, watering, and painting our tool shed. 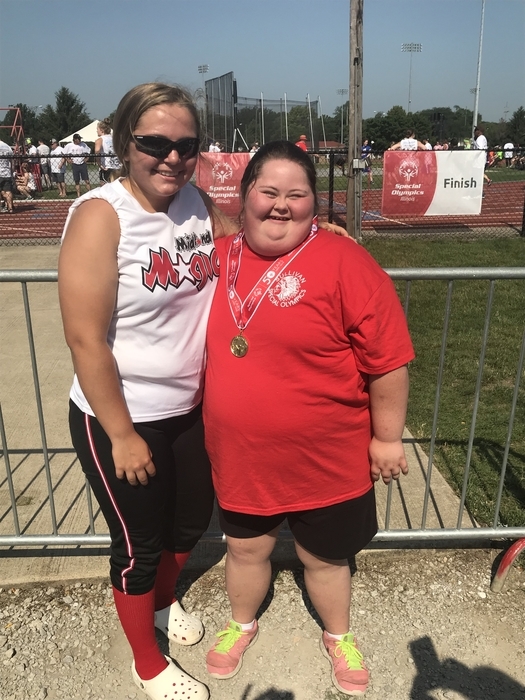 It was a hot weekend at IlliniosState University for the Track and Field events at the state level for Illinios Special Olympics, but that didn’t stop these athletes or their families from cheering them on from the stands. 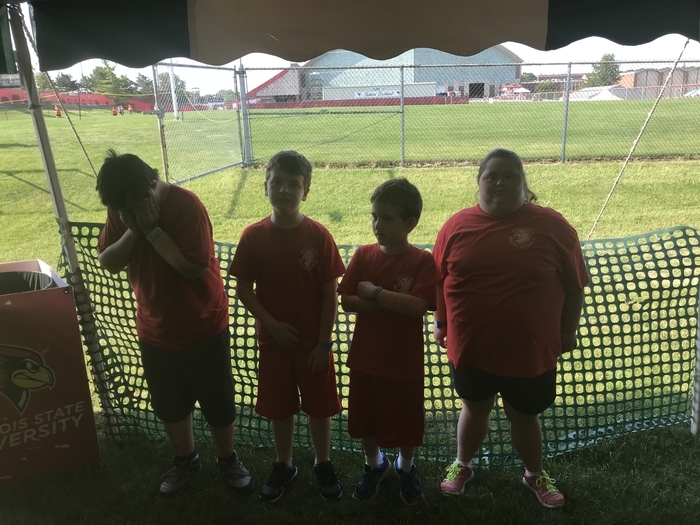 Our Special Olympians are very excited about participating at the state level events at ISU this weekend. Thanks so much to our adminstration for the awesome send off with goodie bags! 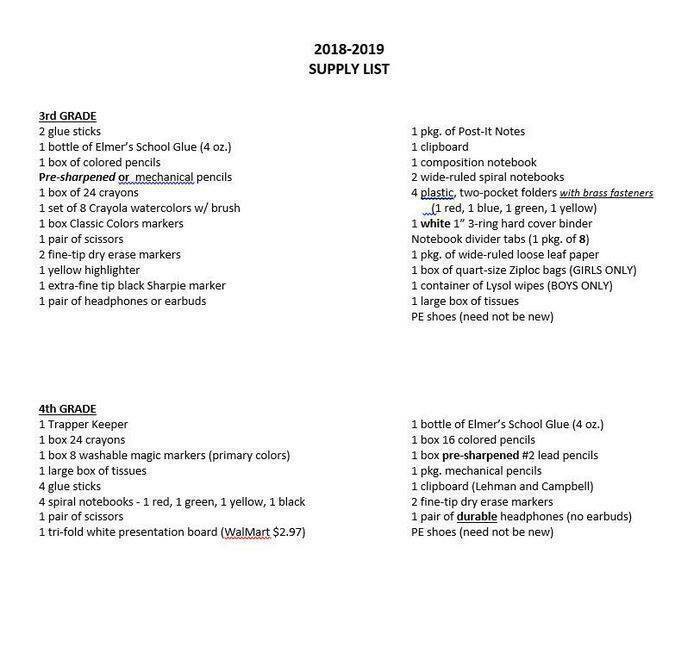 For all you bargain hunters, here are the classroom supply lists for kindergarten through 4th grade! 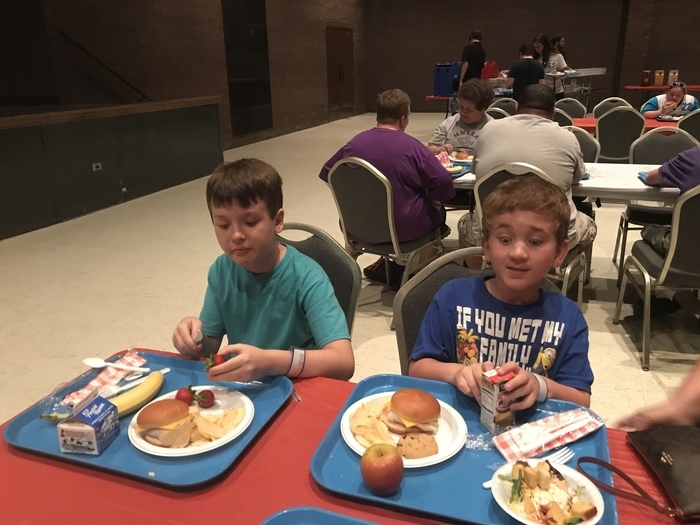 Also a reminder that if your student receives free/reduced lunches and you need help with acquiring school supplies, the school supply program (funded by the Sullivan Ministerial Association) fliers that were sent home with students are due in to the school NO LATER than June 15 (there is a box for them in the East entrance of the school). 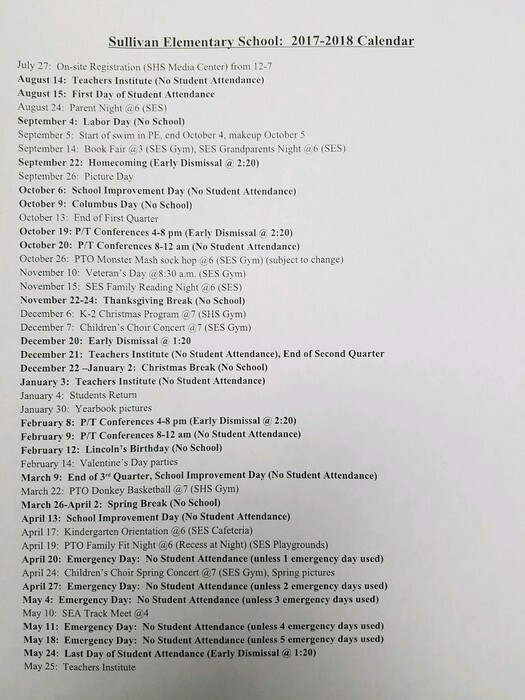 SES parents, here is the preliminary calendar for next year. Dates in italics are subject to change. Dates in bold involve student attendance. 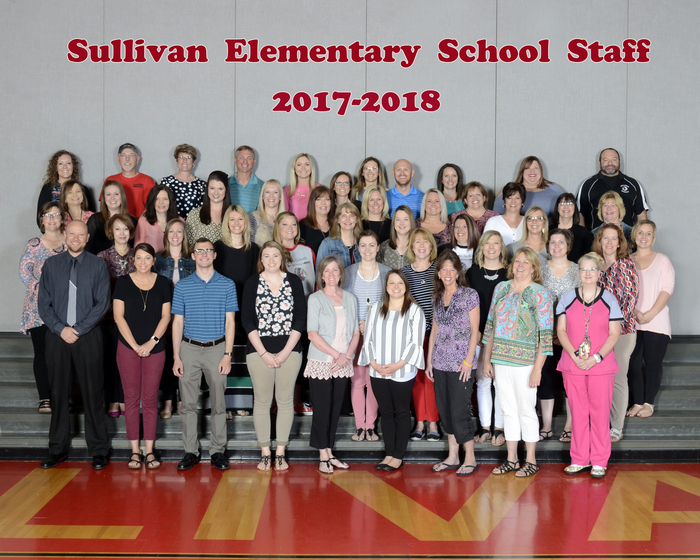 With 5th Grade moving to the middle school, Sullivan Elementary wanted one last picture as a team. We are sad to see them leave but we are excited that the middle school is getting three excellent and caring teachers in Mrs. Wilson, Ms. Heddins, and Mrs. Yoder. 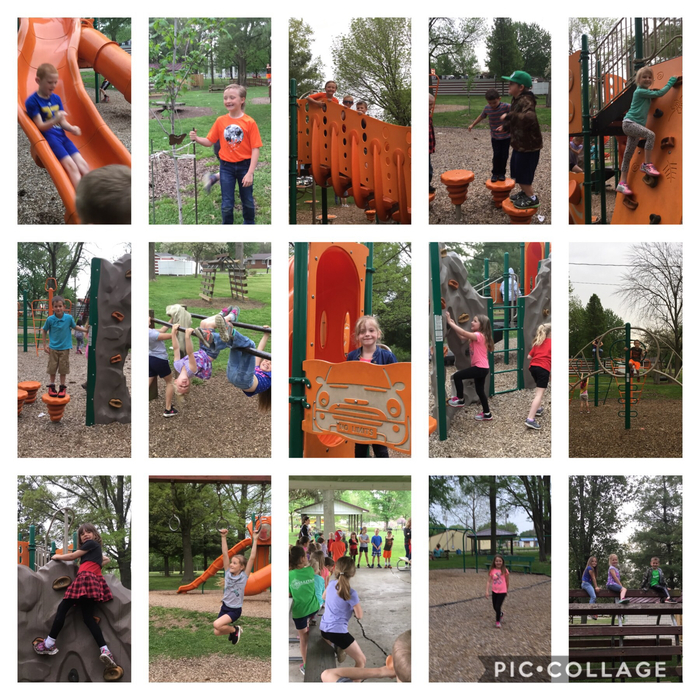 More highlights from the first grade field trip ! 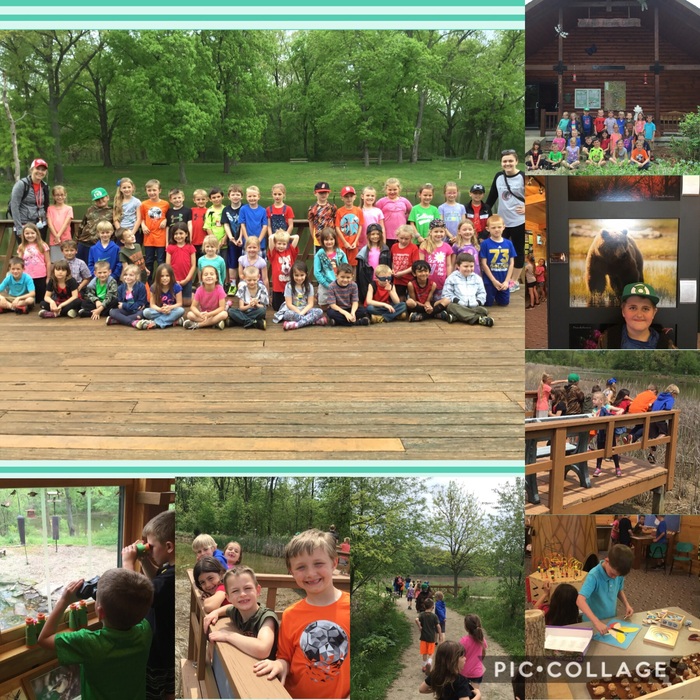 Sullivan's first grade recently went on a field trip to Ballard Nature Center in Altamont. They spend the day exploring and learning about Illinois habitats. This is all thanks to the Illinois Biodiversity Grant. Thank you to The Danial and Ada Rice foundation, The Independence Tube Corporation, D.F. and M.T. Grohne Foundation and others for providing this opportunity . 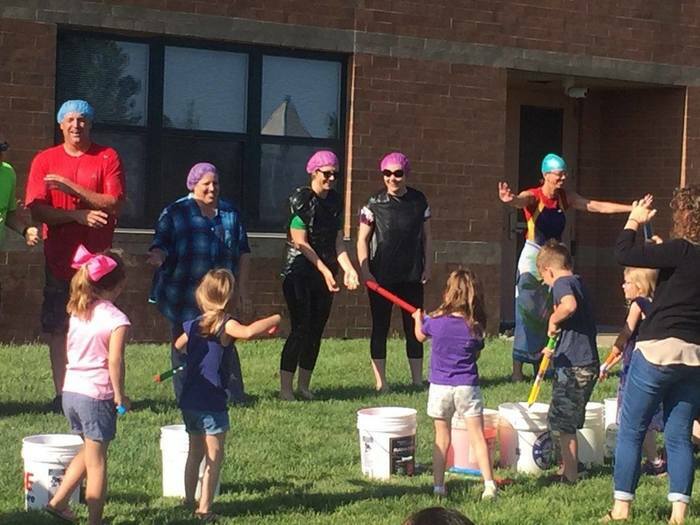 The top fund raisers for this year's Jump Rope for Heart got to soak teachers with paint after the end of the year assembly! 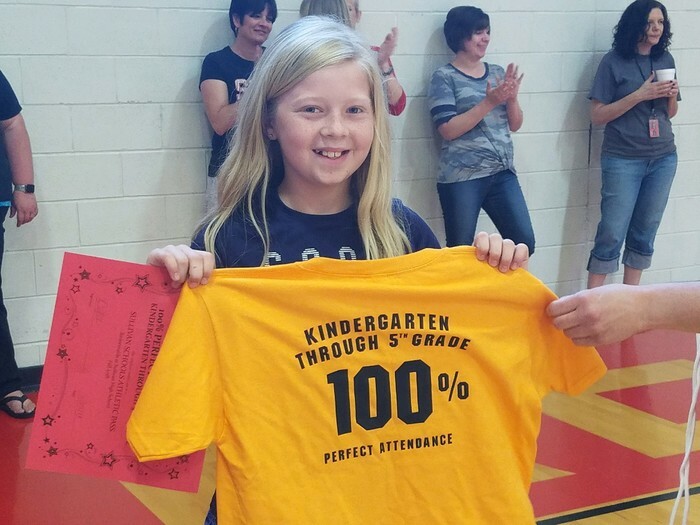 Today at SES, students who had perfect attendance this year were awarded t-shirts commemorating the achievement. 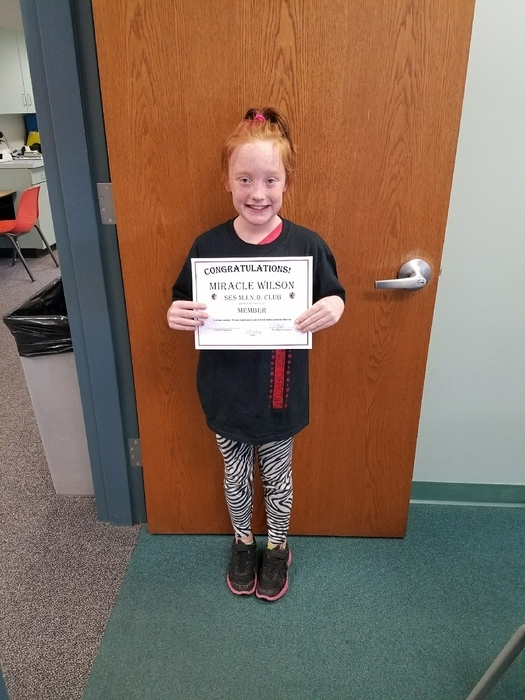 5th Grader Addison Stollard received extra recognition as she will be leaving the elementary school without having been absent in all six years she has been in school! Great job! 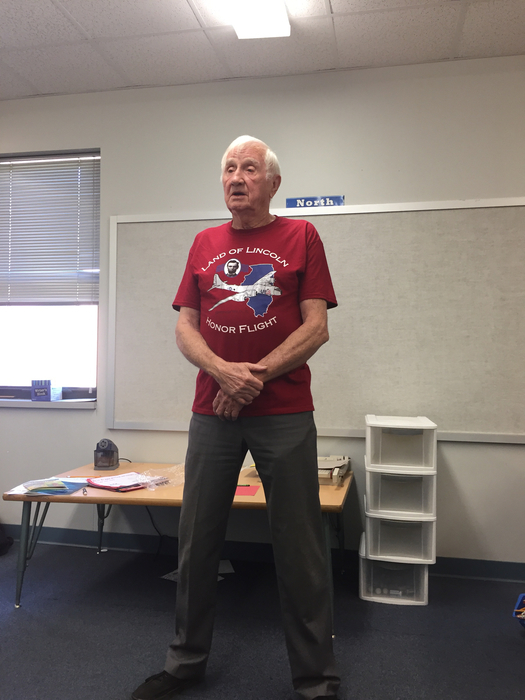 In October, Mr. Campbell’s students wrote letters to veteran, Ron Fairley, who was preparing to travel on the Honor Flight from Springfield to Washington DC. Today, Mr. Fairley, his wife, and his grandaughter (who accompanied on the flight) came to SES to meet the students, to thank the students, and to share memories of their trip. Thank you Mr. Ron Fairley for your service! 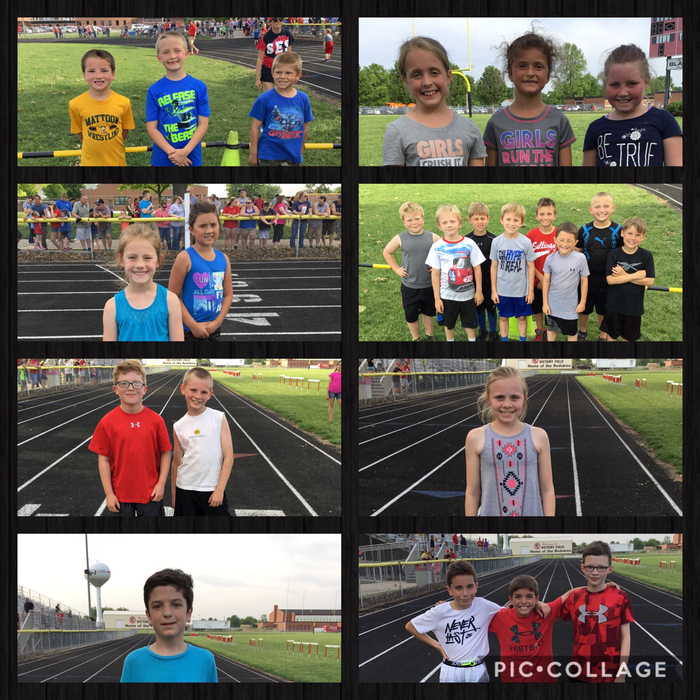 More highlights from the SEA track meet !! Last week at the SEA track meet, there were many students who ran the trifecta! They ran the 200, 300, and 400! Great job !! This is a simple reminder that tomorrow, Thursday, May 24th, there will be an early dismissal. The elementary school will dismiss at 1:20 and the middle and high schools will dismiss at 1:30. 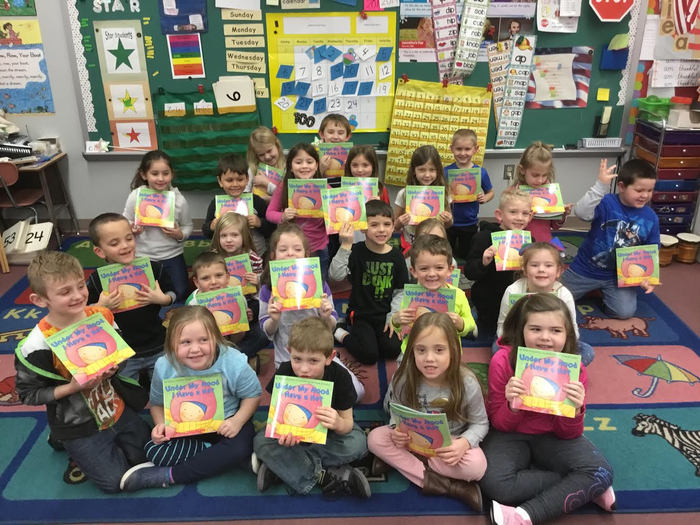 Mrs. Atchison’s class read “Q is for Duck”. Then they made their own animal riddles to present to other classes ! 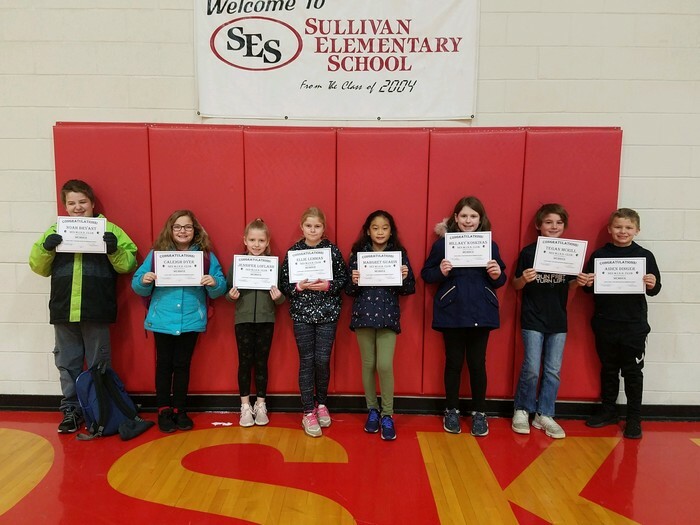 Sullivan Elementary School honors students who go above and beyond expectations at school by awarding them "Gold Slips." 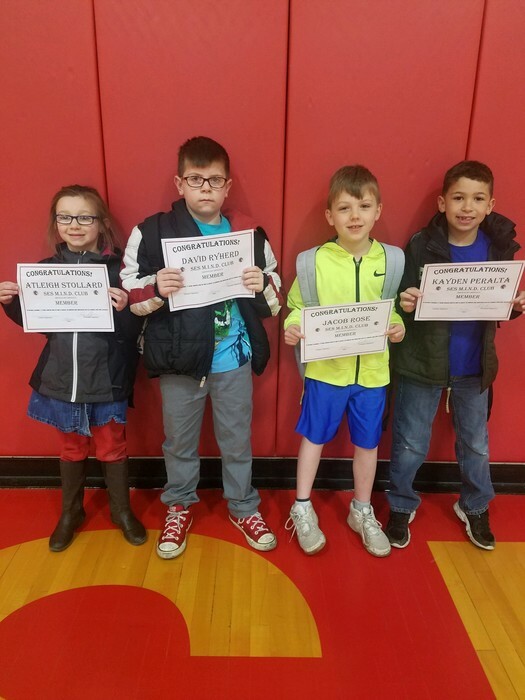 The following are students who were awarded gold slips in the month of May (from left to right): Kaiden Smith was kind and respectful to the kitchen staff throughout the year, always saying please and thank you, which they greatly appreciated. Mason Booker and Hayden Righter started picking up trash under the bleachers between their events at the SEA track meet. 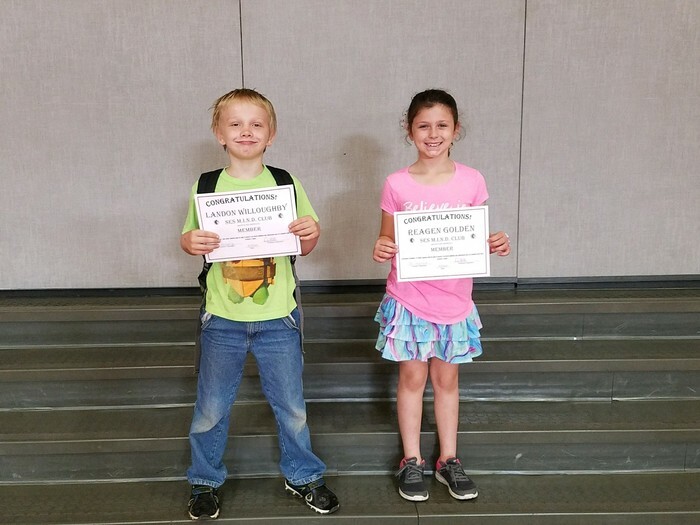 Carter Standerfer and Gracelynn Johnson jumped in to help another student who had spilled bird seed in the hallway at dismissal and they stayed until it was all cleaned up! 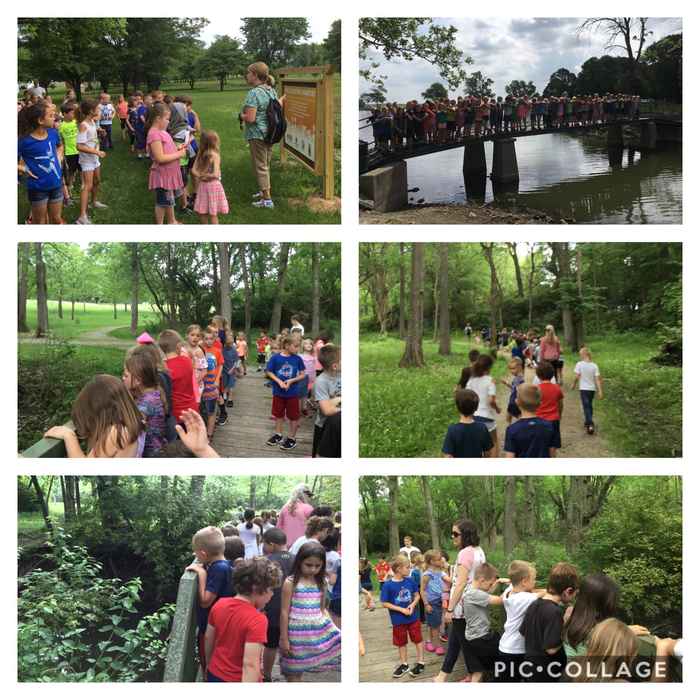 First grade had a beautiful day for our spring walk. We have gone on a walk for each season and then write about the differences we see ! 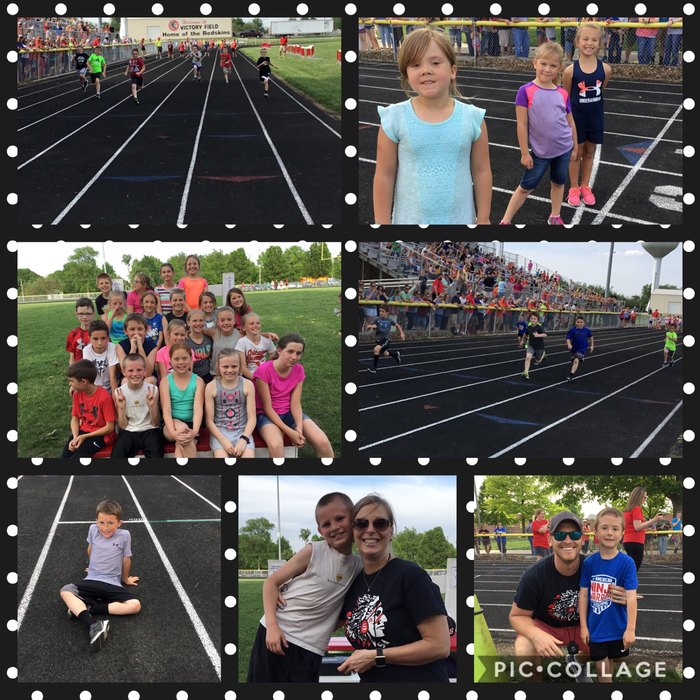 First grade sent our middle school helper, Ben, off to the State track meet in Style! 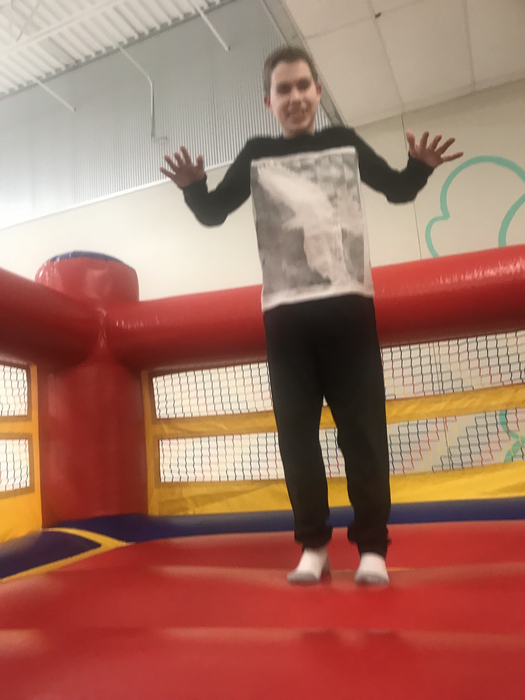 Jump High Ben !!! 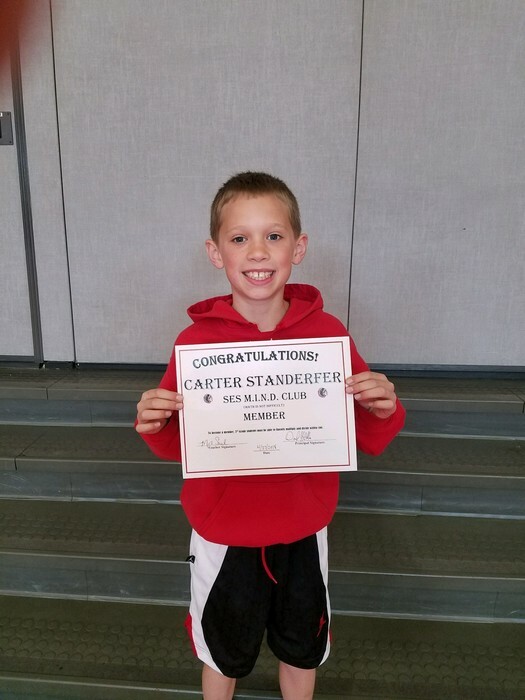 Congratulations to the newest 3rd Grade member of the MIND Club (Math Is Not Difficult)! 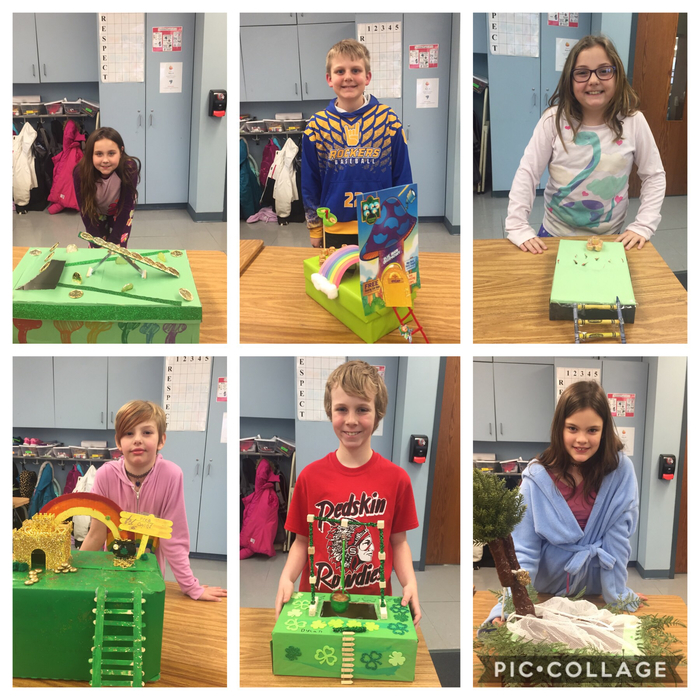 SES students show fantastic citizenship! 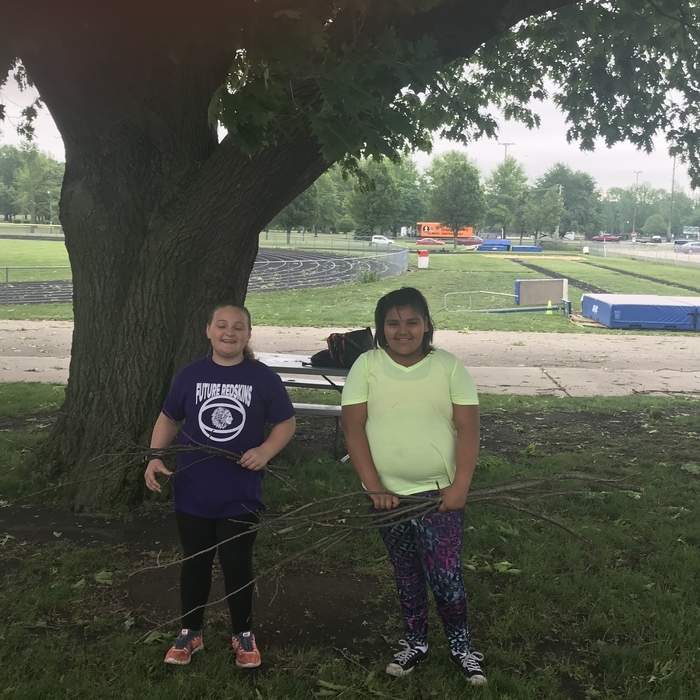 These two students were spotted cleaning up debris from the storm before school started. 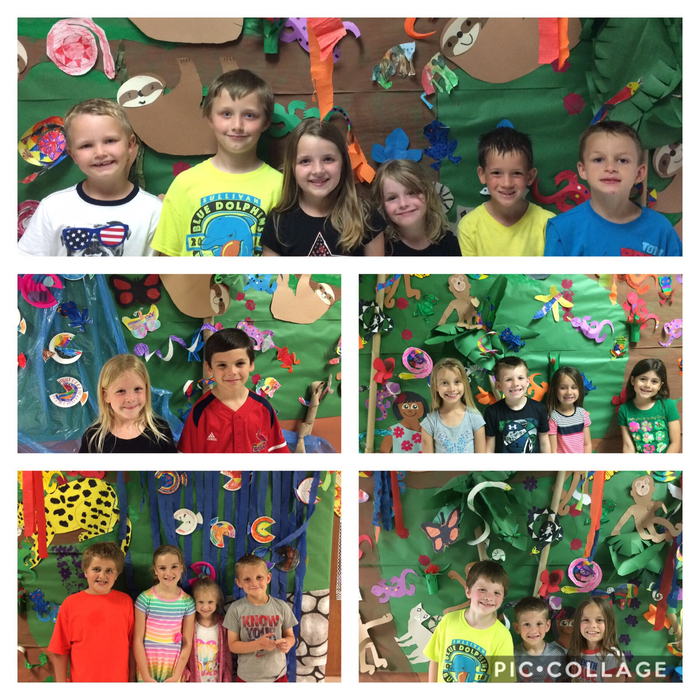 Mrs. Becker’s class had a great time learning about the rain forest ! 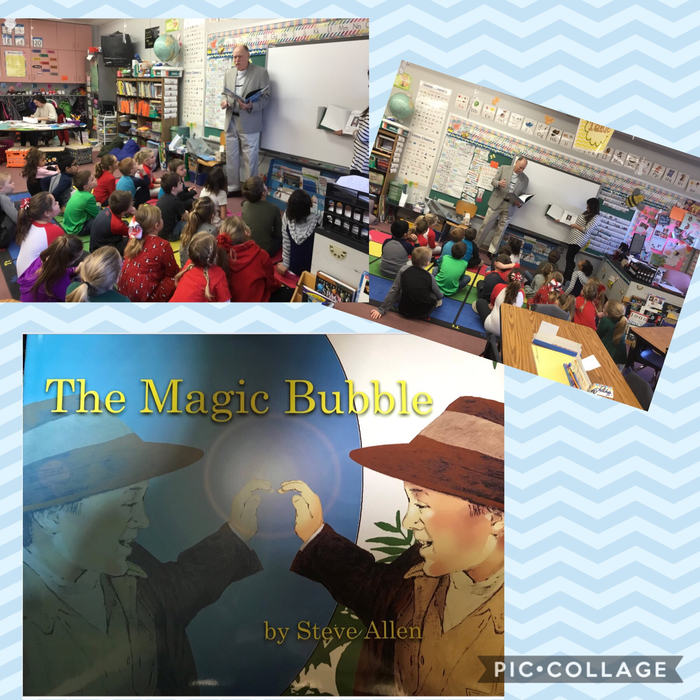 Steve Allen, author of "The Magic Bubble," visited Sullivan Elementary to read his book and do a corresponding lesson for the 2nd Grade and Mrs. Becker's 1st Grade class. 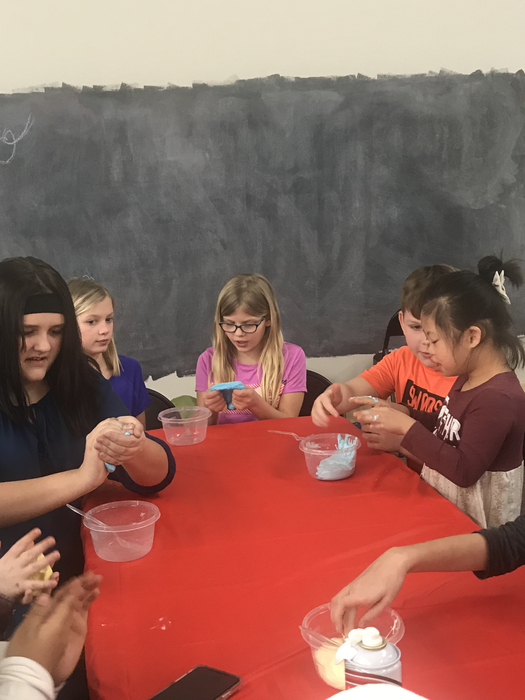 The lesson taught students how to use their imagination in a healthy way to deal with negative emotional situations or for other purposes. Students were highly engaged throughout the lesson! 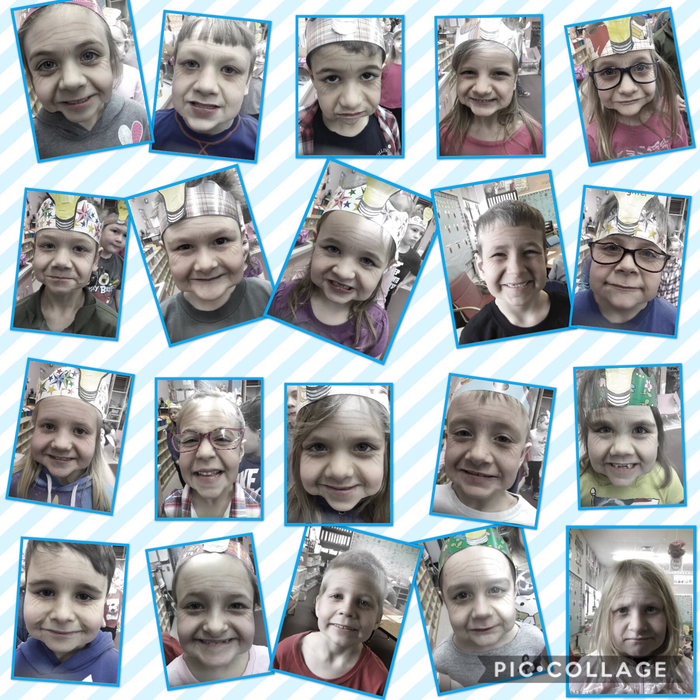 Mrs. Rarick’s class had a royal ball to wrap up their Kings and Queens unit. They had a crowning ceremony, knighting ceremony, tea party, and dance! A fun day in kindergarten for sure! 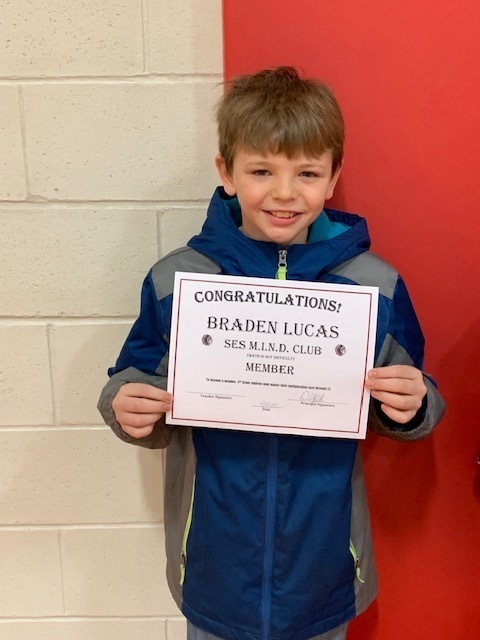 Another new 1st Grade member of the MIND Club (Math Is Not Difficult)! 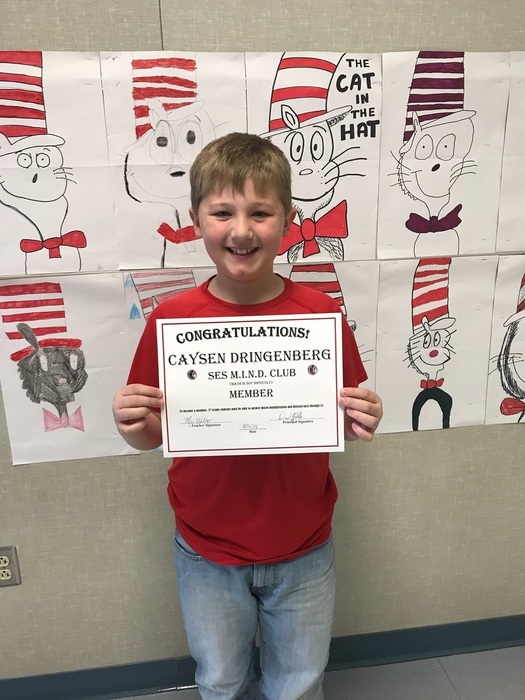 Congratulations to the newest 4th Grade member of the MIND Club! Congratulations to the newest 3rd Grade members of the MIND Club! 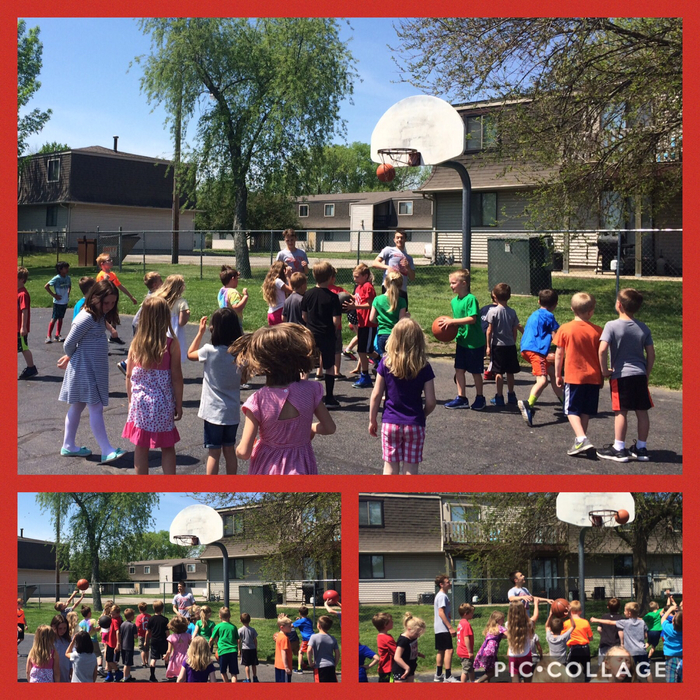 Kindergarten and first grade students had high school basketball players stop by recess to play !! They showed the students how to dribble and shoot. Be on the look out, summer camp papers come home today ! Planting Day! 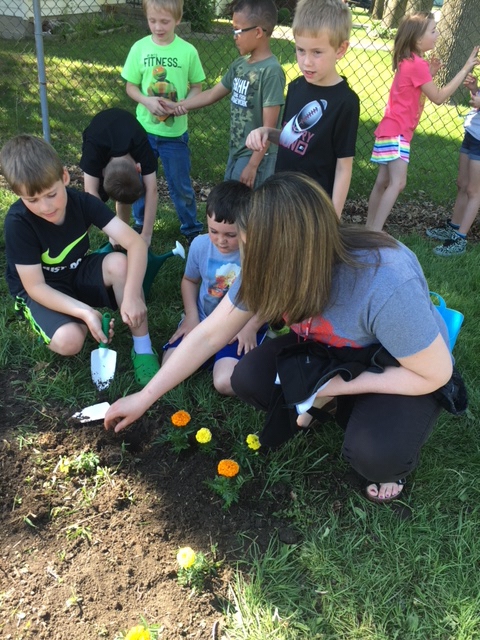 Erica Lehman and Dave VanDeursen are helping each student plant a marigold to border our vegetable plants. 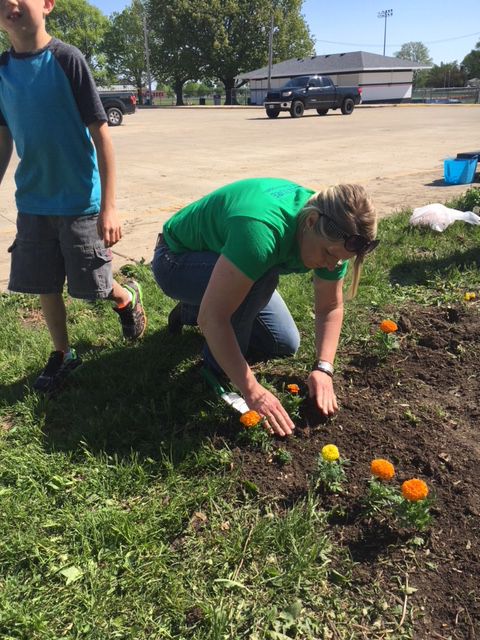 Thank you Buxtons for our veggies, thank you FFA for our marigolds. Pictured is Mrs.Hussong's 2nd grade class. 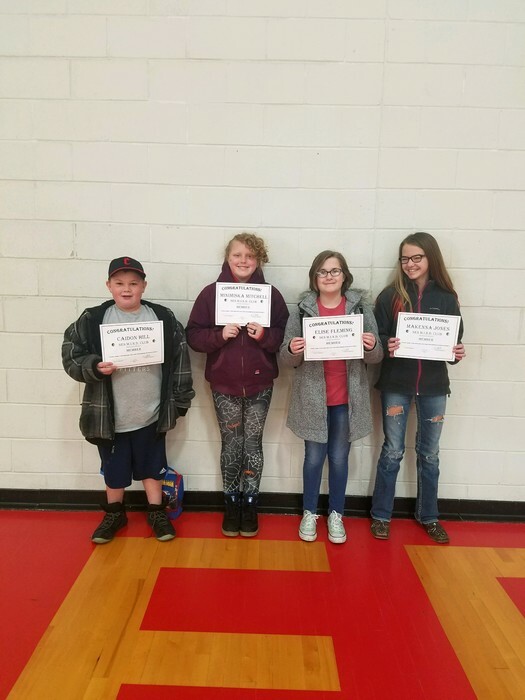 Congratulations to the newest 5th grade members of the MIND Club (Math Is Not Difficult)! First grade has spent the last few weeks learning about animals and their habitats. 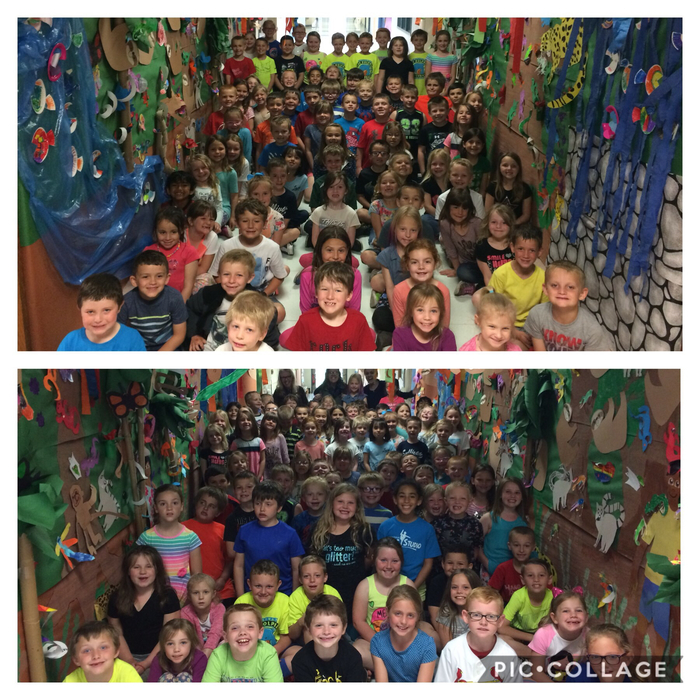 We have focused on the rain forest and built one of our own ! 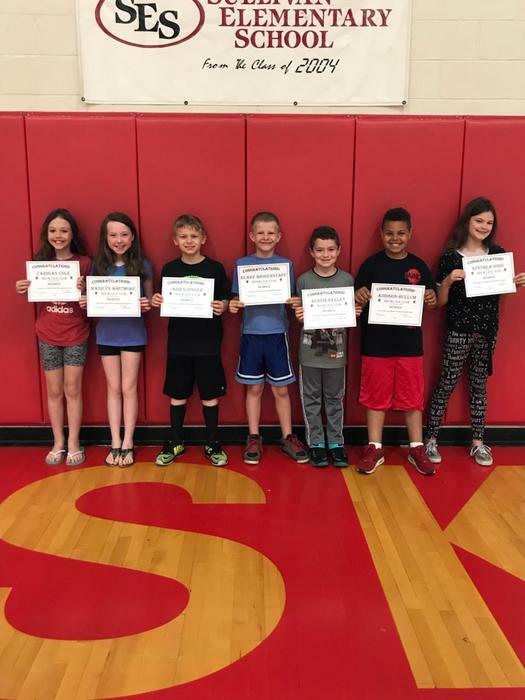 Congratulations to the SES Gold Slip winners for the month of April! From left to right: Julia Moody is always willing to jump up and help other students when they need assistance. She does this without ever being asked. Yesterday, she helped a student on the computer and helped several others who had issues with their iPads! Levi Souders didn't feel like playing at recess; he wanted to pick up trash. He felt it was important to keep our area clean. He picked up 2 pockets full of trash and deposited it in the can on the playground, which he said was a great idea to have! Riley Gentzyel was having breakfast in the cafeteria when a younger boy was starting to cry because he didn't get breakfast. Riley gave him her breakfast bar that she had... a very kind and thoughtful gesture. 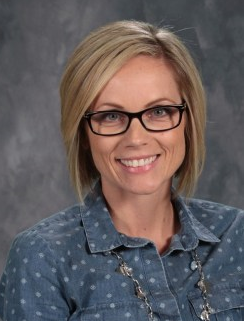 Kharli Kelly noticed a kindergarten student struggling with the drinking fountain and stepped up to help. Addy Hendry is strong, brave, determined and dependable. Her teacher can always count on her to be on task and following directions. Today, she worked extra hard to use her left hand to complete her activities because she could not use her right hand due to an injury. She did this without any complaints! 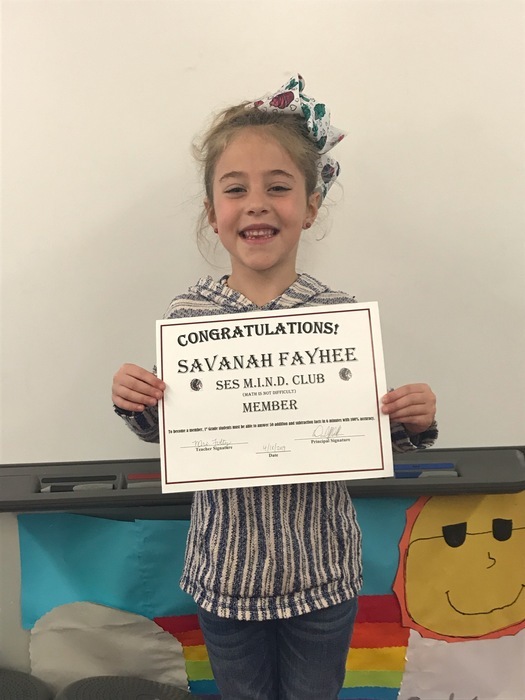 Savanah Fayhee is respectful and honest. Her teacher can always count on her to set a good example for other students in her class. She is always willing to help her friends! Margret Guarin noticed a student sitting by themselves at lunch and asked to go sit with him. Gavin Helmuth was in the lobby when he heard the students in the gym saying the pledge. He stopped what he was doing to say it with them and made sure a younger student did the same! Dylan Ray asked another student at recess (who was looking for someone to play with) to play with him and his friend. The teacher was very proud of Dylan for this! 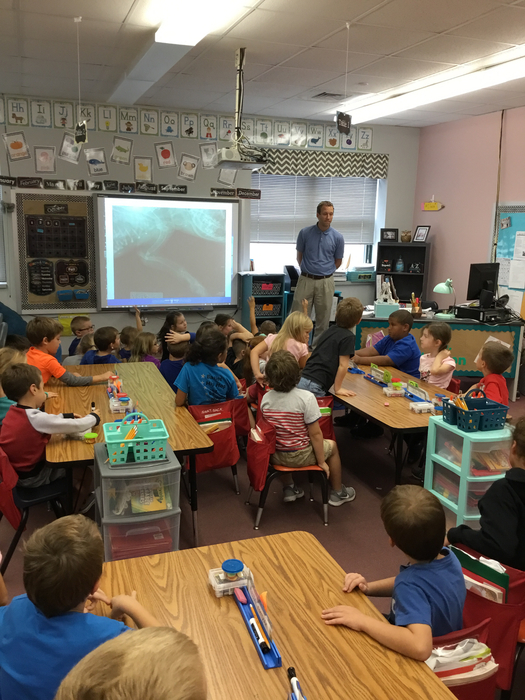 Mrs. Becker’s class spent all week talking about ways to take care of the Earth. We ended the week by picking up trash. 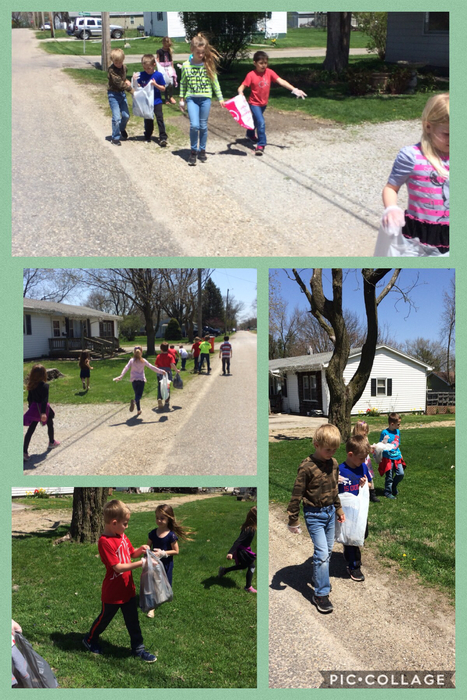 The students filled all of their bags and had a great time helping the Earth. 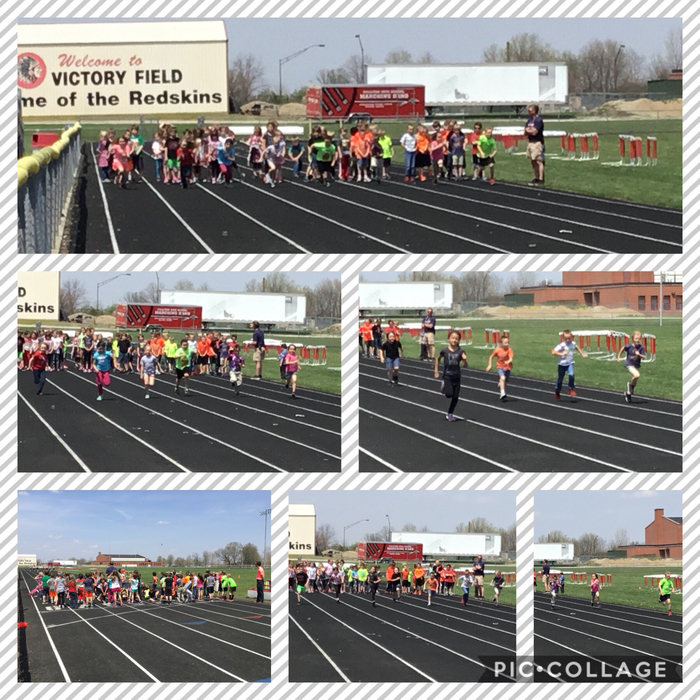 All of SES students have been working hard to get ready for the SEA track meet !! Please be sure to send your sign ups back to school by Thursday May 3rd !!! 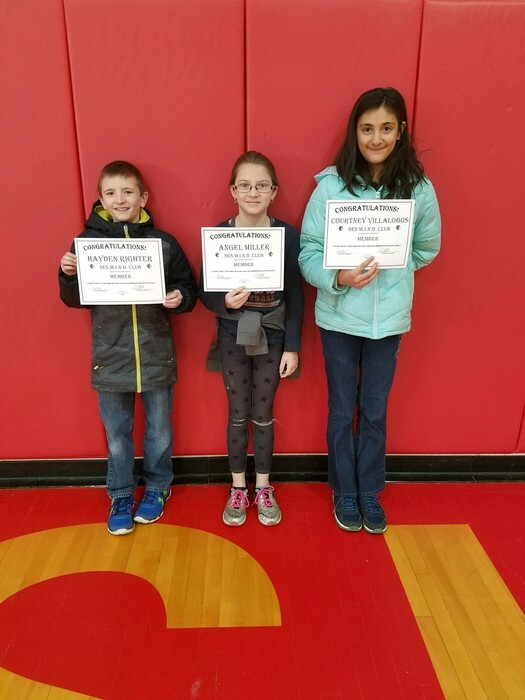 Congratulations to the newest 4th Grade members of the MIND Club (Math Is Not Difficult)! 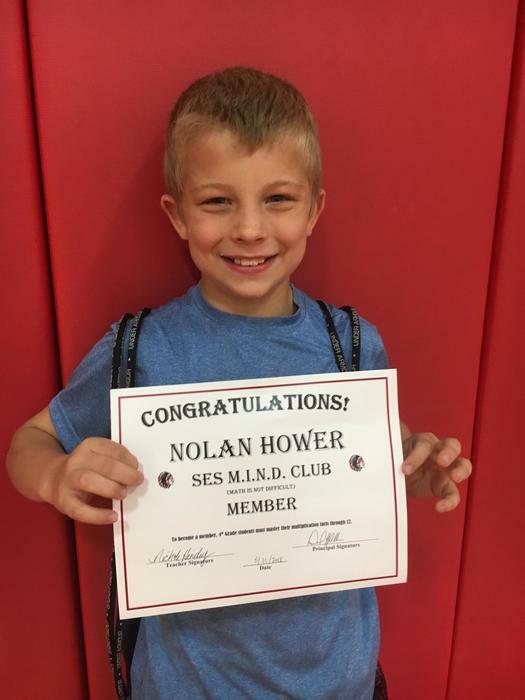 Congratulations to the newest 2nd Grade member of the MIND Club (Math Is Not Difficult)! 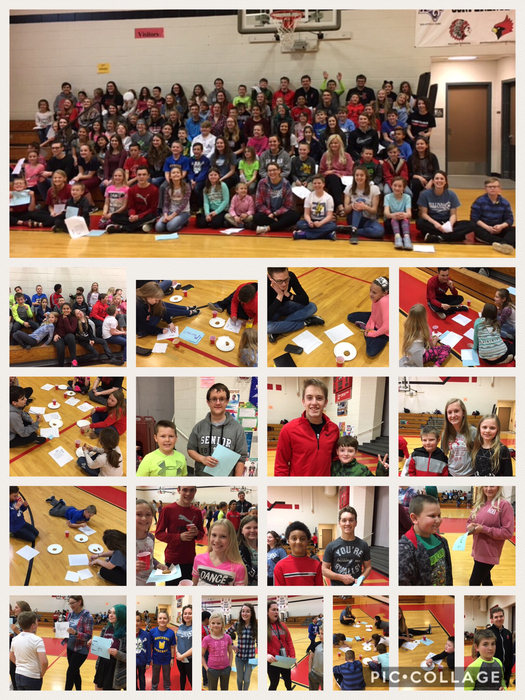 Fourth graders had a great visit with their NEHS pen pals. Mrs.Hendry's (4th) and Ms. Wright's (5th) classes partnered together to study customary measurement using QR codes. Lucky winners from the FFA petting zoo !! 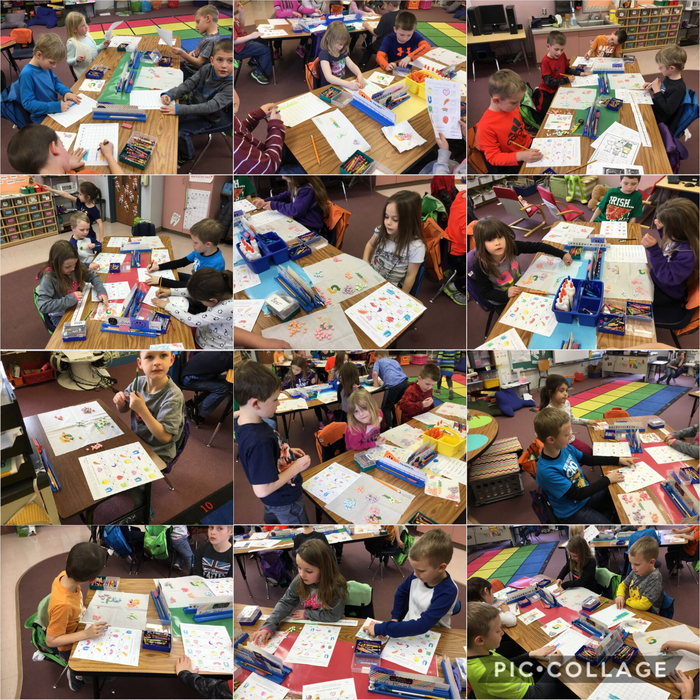 Mrs. Becker’s class loved getting to meet their pencil pals. All winter long the students have been working on their letter writing skills and loved getting letters in return. Mrs. Becker’s class is so proud of our high school helper, Andrew. He was crowned prom king and brought in his crown for all to see ! 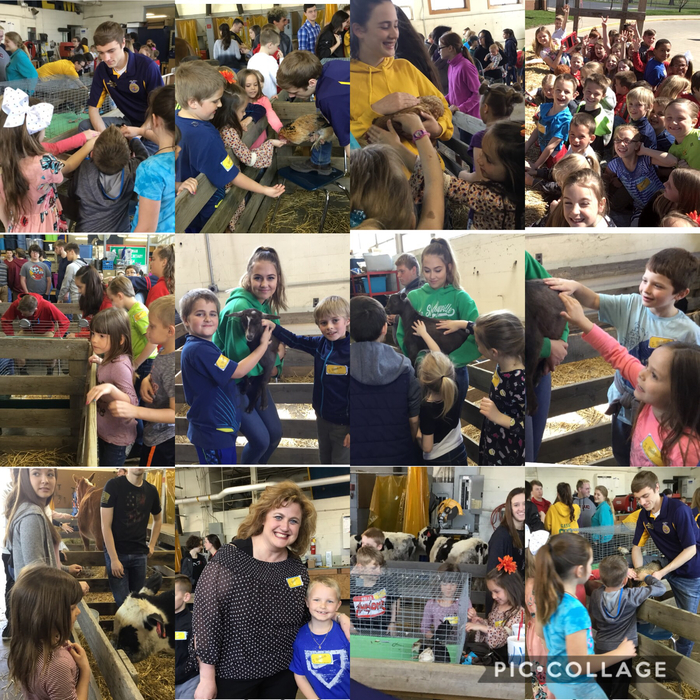 Mrs. Becker’s class loved the FFA petting zoo and wagon ride. It was great for students to get to see and feel the animals we have been readibg about. Thank you Sullivan FFA!!! 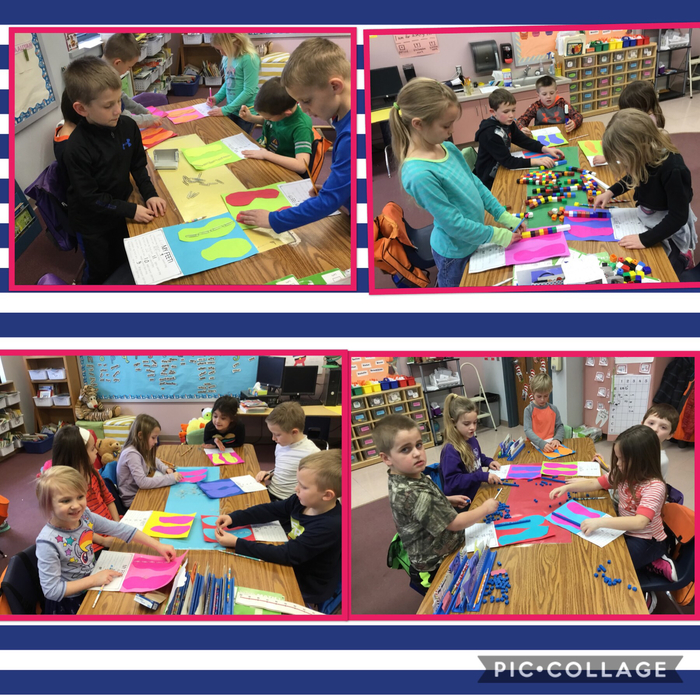 Mrs. Fultz’s class loved getting to meet their pencil pals. All winter long the students have been working on their letter writing skills and loved getting letters in return. 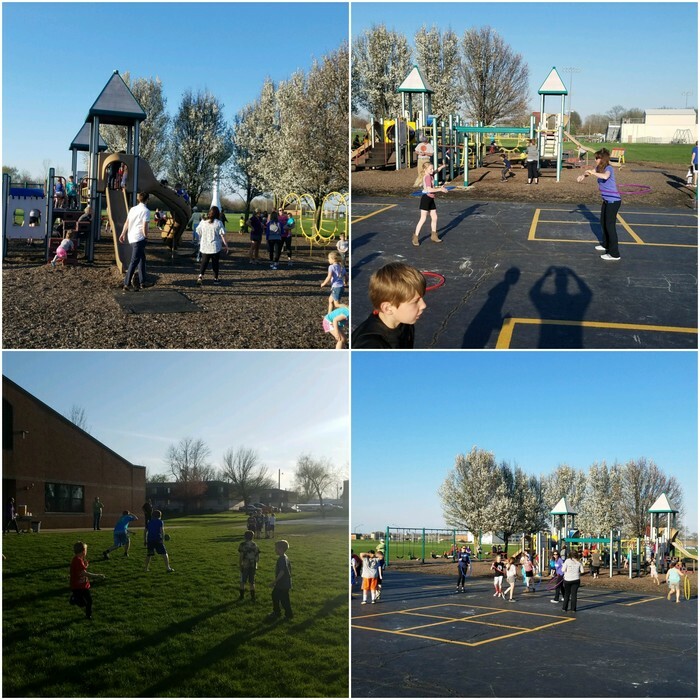 Don't forget that Recess at Night is tomorrow evening (April 26) at 6 pm at the SES playgrounds! It is always a great time, so please bring the family out and enjoy the nice weather (allegedly)! Parents will need to stay with the students. 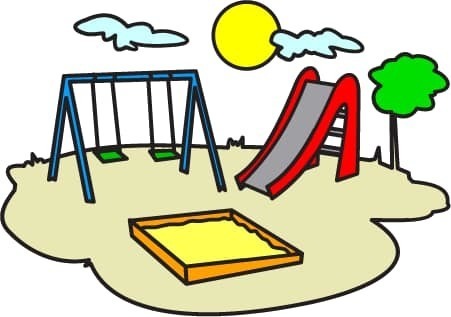 Due to the cold conditions and wind expected for this evening, the PTO "Recess at Night" will be postponed until next Thursday, April 26th, at 6 pm at the elementary playgrounds. Please note the time change for the Children's Choir Spring Concert. It will take place at 6 pm on Thursday, April 24th in the SES gym. Please come out and enjoy this talented group's performance! This is just a reminder that Kindergarten Orientation is Tuesday, April 17th at 6 p.m. starting in the SES cafeteria. This is a PARENTS ONLY meeting. We look forward to seeing you there! 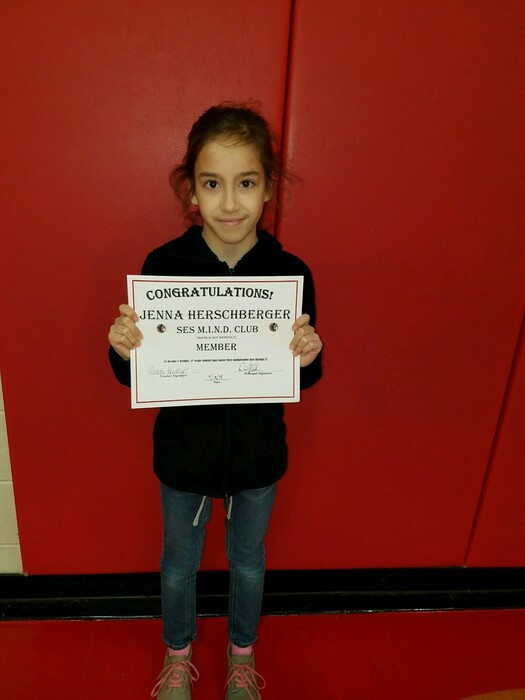 Congratulations to the newest 4th Grade member of the MIND Club (Math Is Not Difficult)! 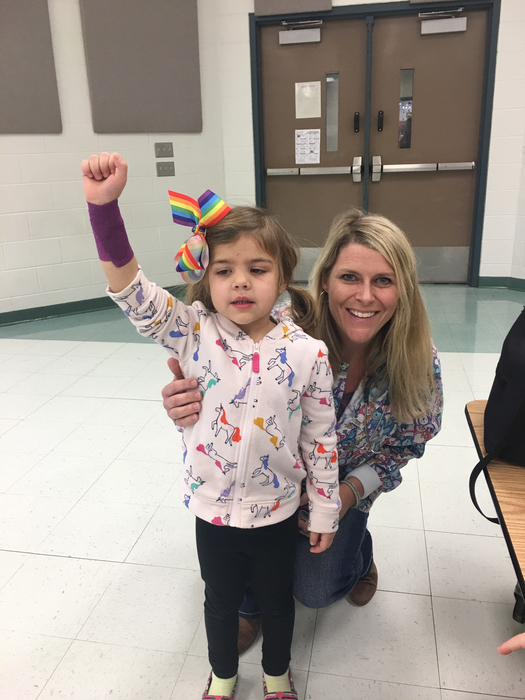 If you have a student ready to go into kindergarten in the next school year, come to the elementary school on Tuesday, April 17 at 6 p.m. to enroll them and get important information regarding drop offs, pickups, lunches, and more. 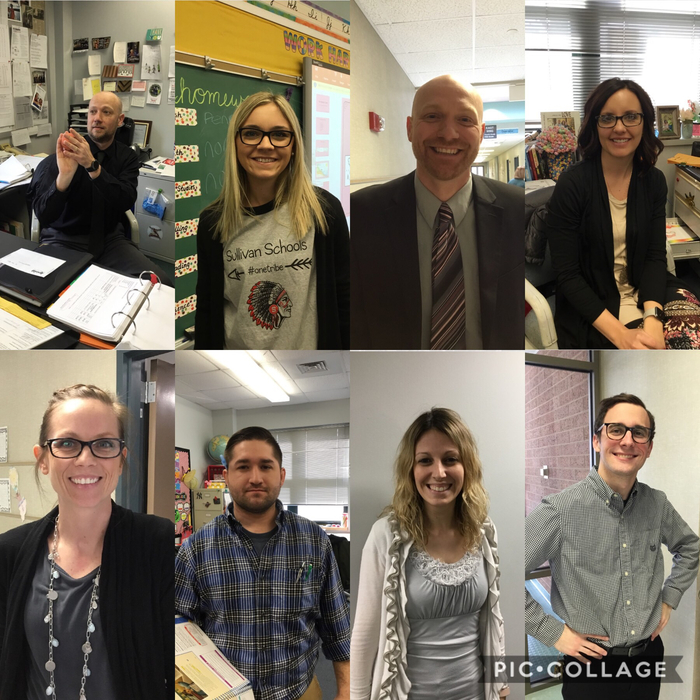 You will get to meet SES staff members and take a tour of the school, along with gaining valuable knowledge about your student's future school! 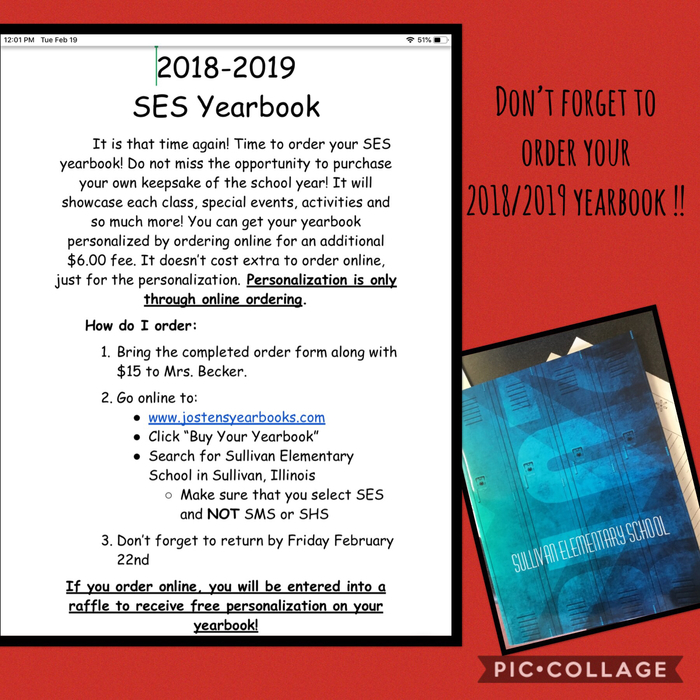 Here is an updated calendar for SES for the remainder of 2018. 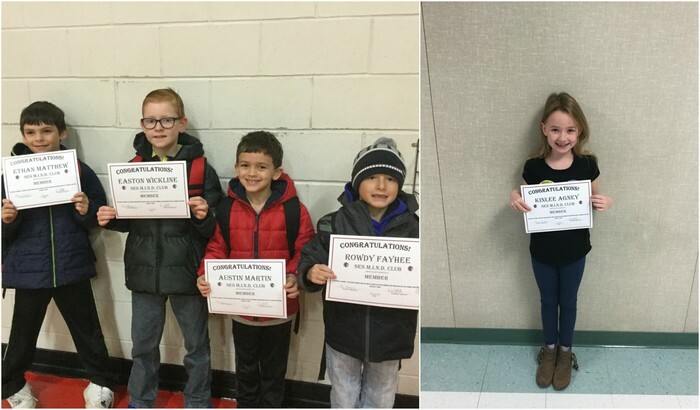 Students who go above and beyond expectations at Sullivan Elementary School are awarded "Gold Slips." Three students were recognized for this honor in March. 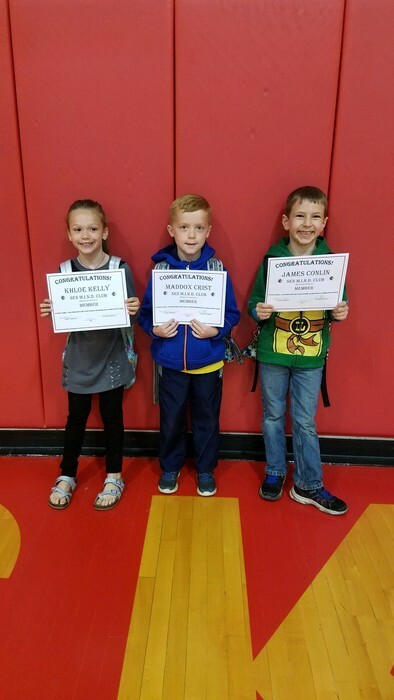 Cabella Williams (left) and Josh Bailey (middle) helped out their classroom teacher by getting pencils out of the back of a bookcase that the teacher could not get to. 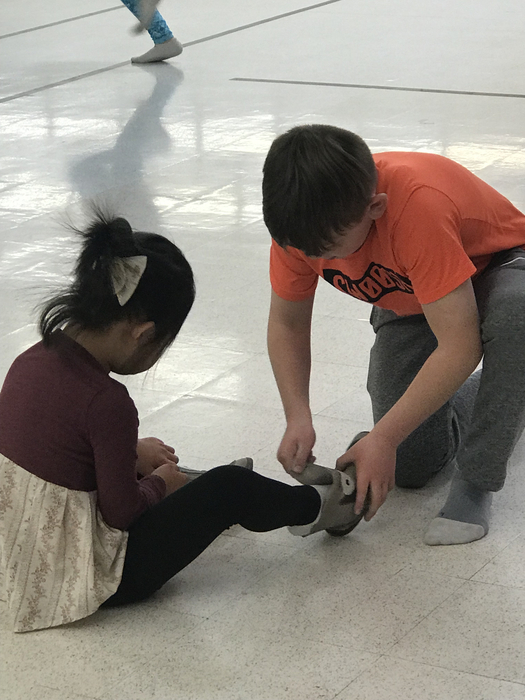 Emma McCain (right) stepped right in to help a student tie his shoe without even being asked. Congratulations to our newest 3rd Grade members of the MIND Club (Math Is Not Difficult)! 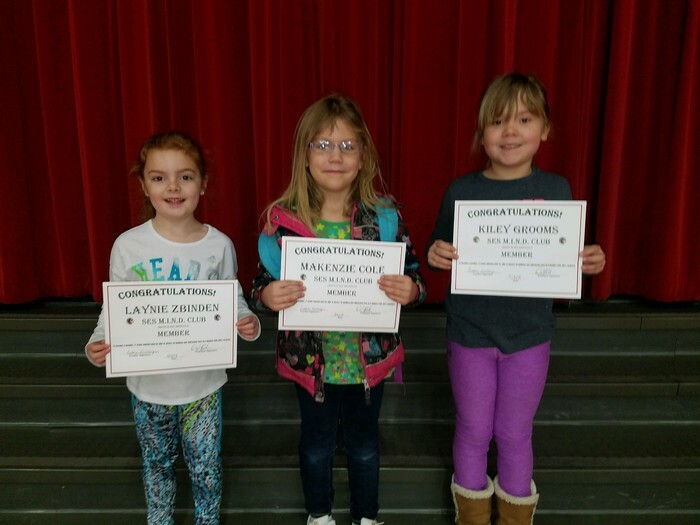 Congratulations to our newest 1st Grade members of the MIND Club (Math Is Not Difficult)! 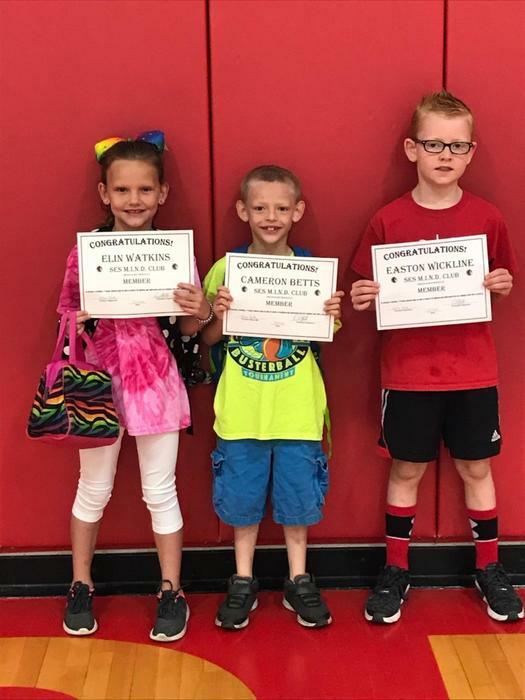 Congratulations to these students who won prizes from McDonald's! Students who attended McTeacher Night received a ticket and names were randomly drawn this morning. 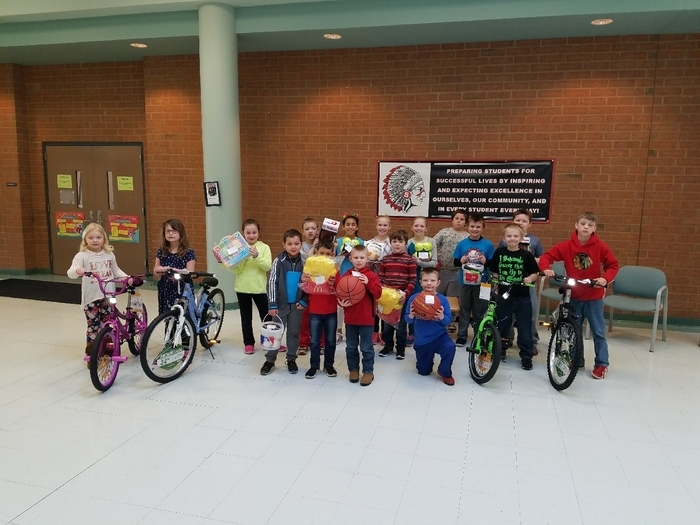 4 new bicycles and numerous other prizes were handed out! 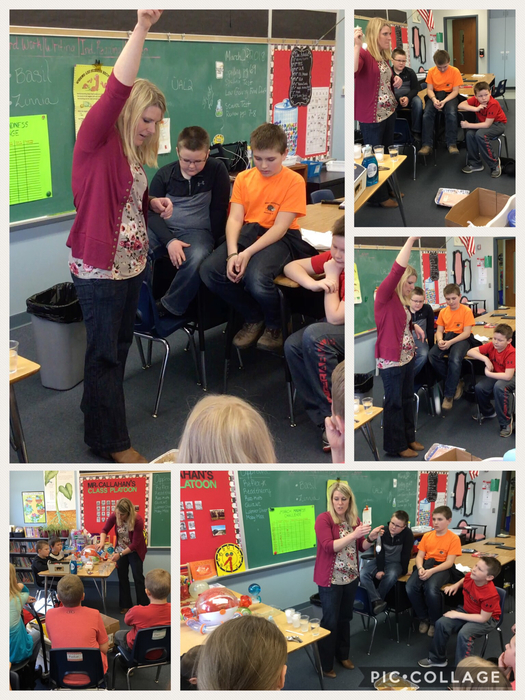 Mrs. Erica Lehman visited 4th grade to model a density lab with salt water and eggs. She then tested different materials to see which would safely land an egg from a six foot drop. 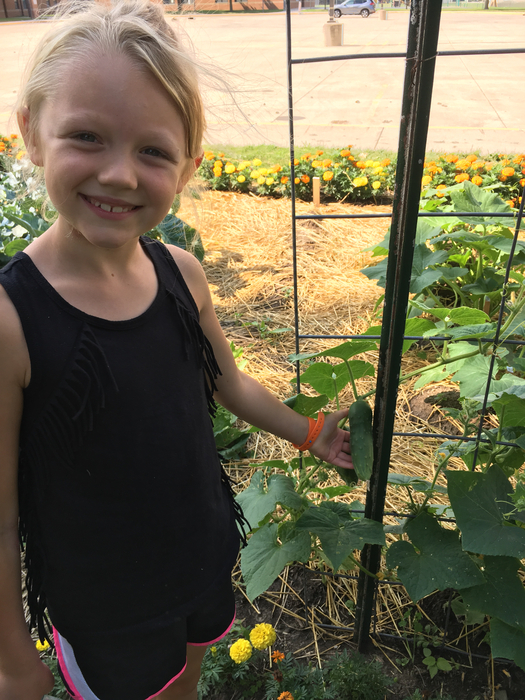 Students love her Ag in the Classroom activities. 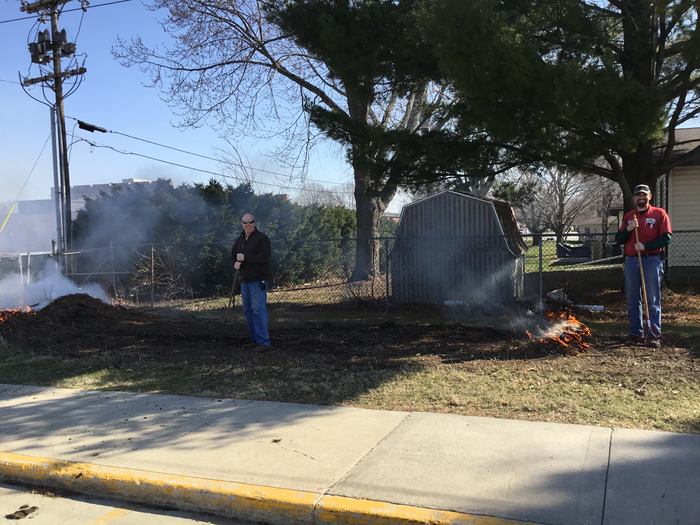 Mr.Landrus and Mr. Puyer burned off one of our prairie plots making way for the SES vegetable garden. Mr.Grohler then came behind and tilled it. Our plot is ready for planting!! Come out to McTeacher night at McDonald's from 4-6 Wednesday, April 4! This event brings money to the Sullivan PTO and students get to put their names in for a bike raffle and will receive other prizes at the door! 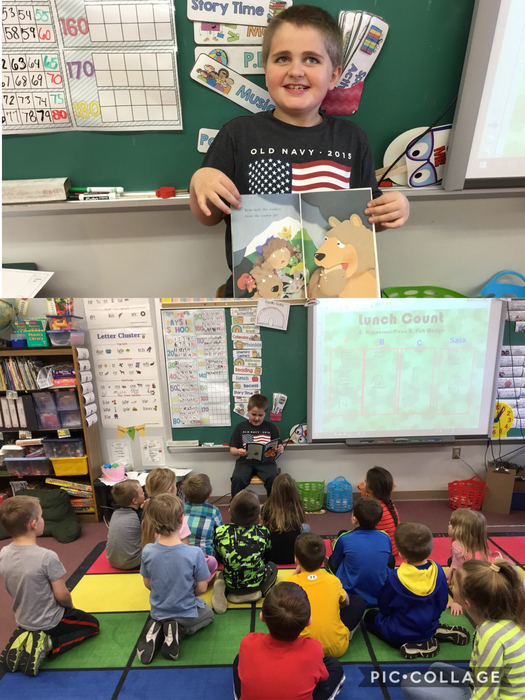 Mrs. Becker’s class enjoyed hearing a story read by Bear! He read “Who stole the cookies?” We loved that the bear stole the cookies ! 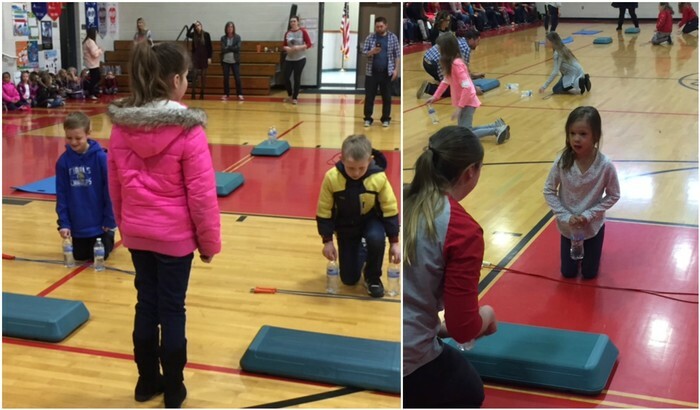 Coach Typer put together some great "Minute to Win It" games for students for their Good Behavior Celebration" on Friday! 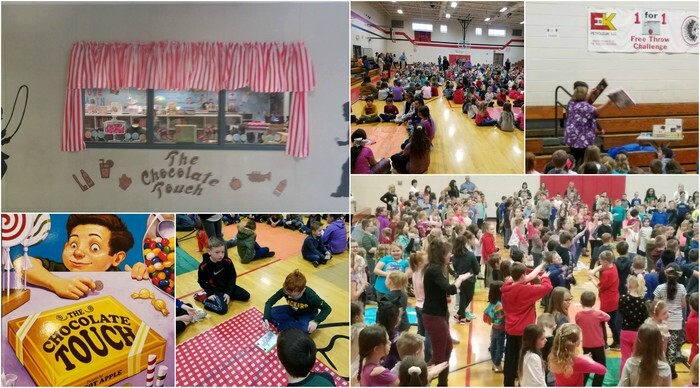 Mrs. Grohler’s students have enjoyed a variety of engaging activities throughout the month of March. 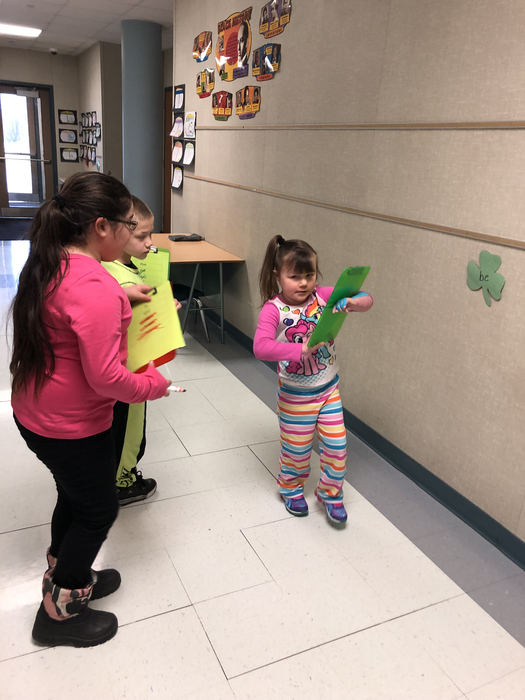 A couple of the favorites seemed to be the Shamrock Word Hunt, making rainbows, and Easter Egg Word Hunt. 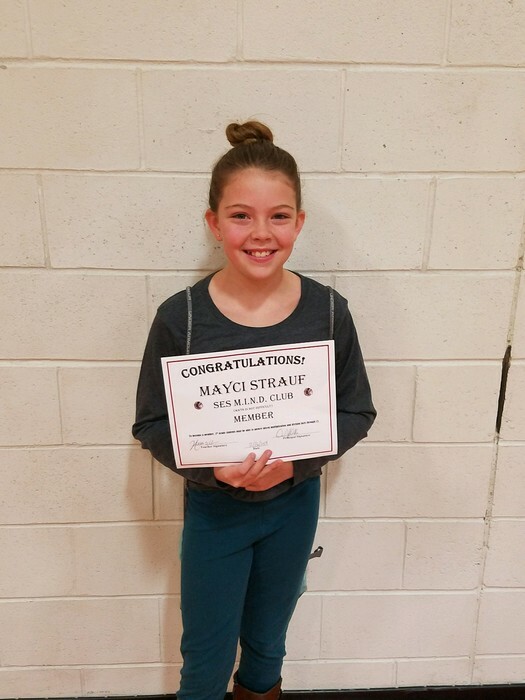 Congratulations to the newest 5th Grade member of the MIND Club (Math Is Not Difficult)! Mrs. Hendry's 4th graders measure the area and perimeter of our future Vegetable Garden. Look forward to more exciting news with our new Garden venture. 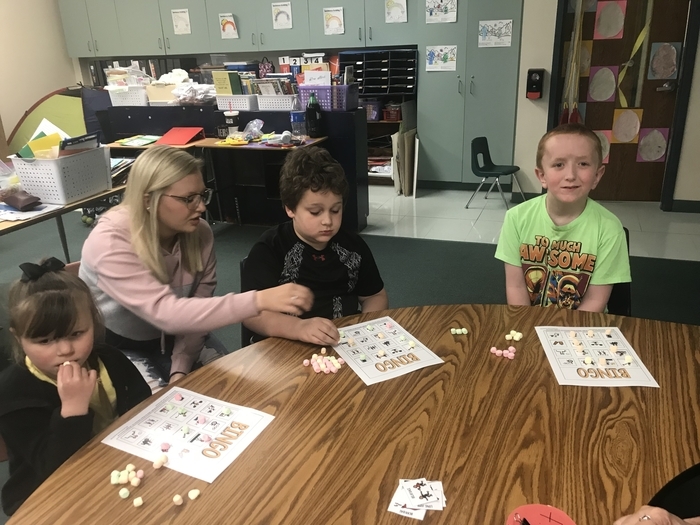 Mrs. Becker’s class had a great time practicing our math with lucky charm marshmallows! We measured, graphed, and added using the marshmallows ! 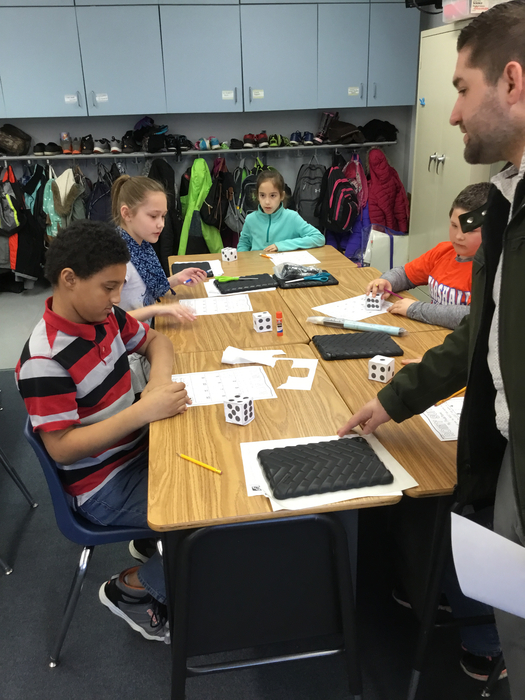 Fourth grade students rolled self made dice to practice probability during RTI. Mr.Callahan, a student teacher from EIU led the activity. Here’s a look at the SHS/SMS team for Donkey Basketball ! The fun starts at 6:30 Thursday March 22nd in the SHS gym ! Here’s a look at one of the SES teams for Donkey Basketball ! The fun starts at 6:30 Thursday March 22nd in the SHS gym ! 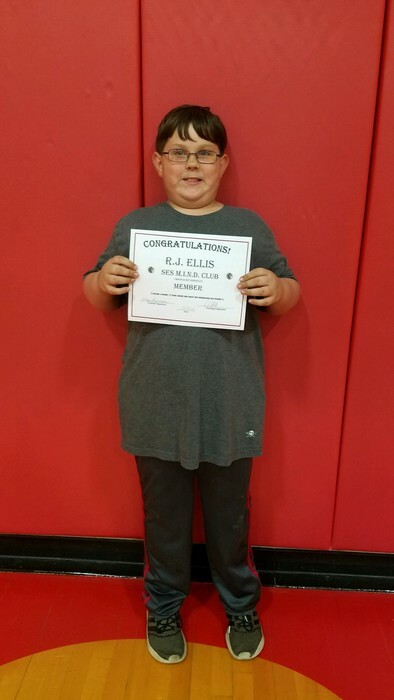 Congratulations of the newest member of the 5th Grade MIND Club (Math Is Not Difficult)! 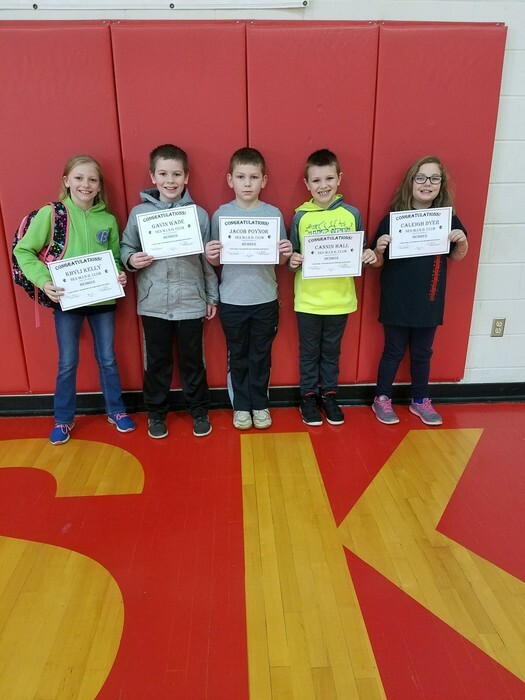 Congratulations to the newest members of the 5th Grade MIND Club (Math Is Not Difficult)! 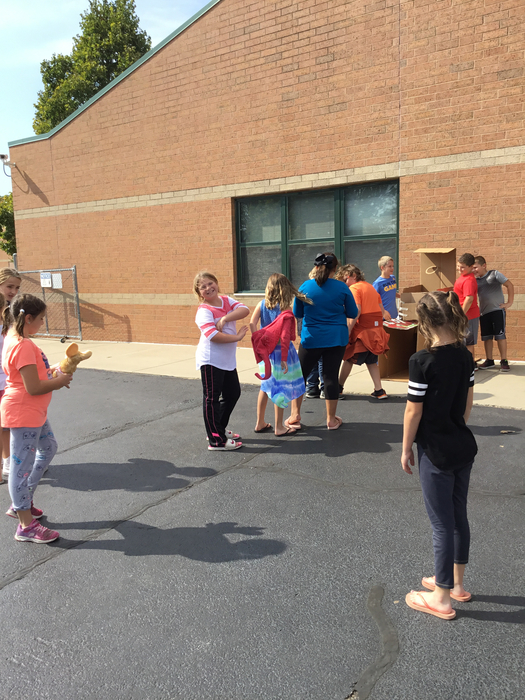 SES just finished raising funds for "Jump Rope for Heart." 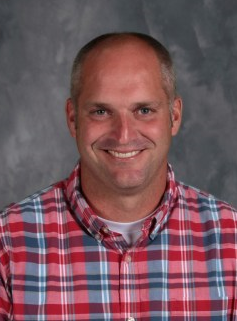 Coach Typer has been coordinating the school's efforts to help the American Heart Association for the last 16 years. 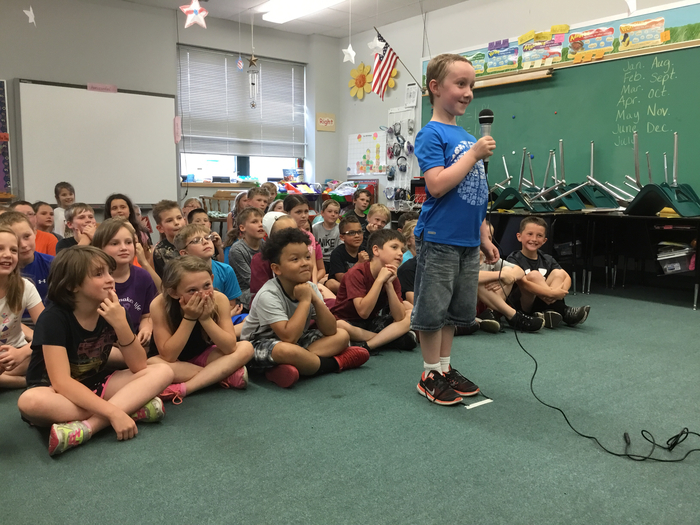 This year, the students of Sullivan Elementary were able to raise over $16,750! 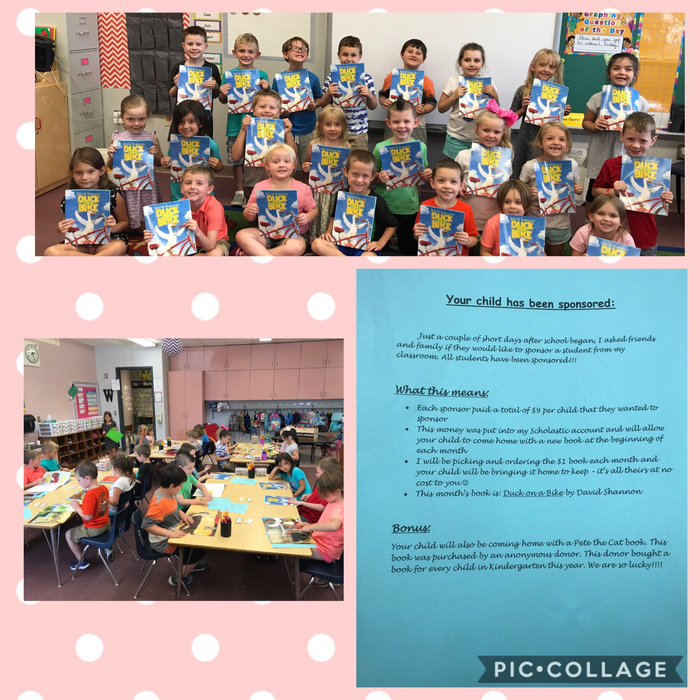 To wrap up our chapter on measurement, Mrs. Becker’s class read The Foot Book and measured our feet four different ways ! Happy 120 day !!! 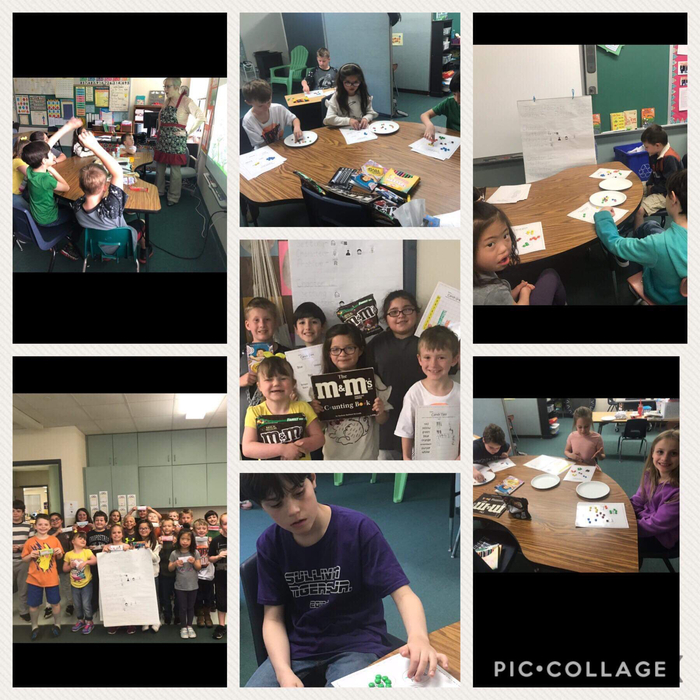 Mrs. Becker’s class celebrated by doing lots of fun writing and math activities all about the number 120! We also had fun turning ourselves old! 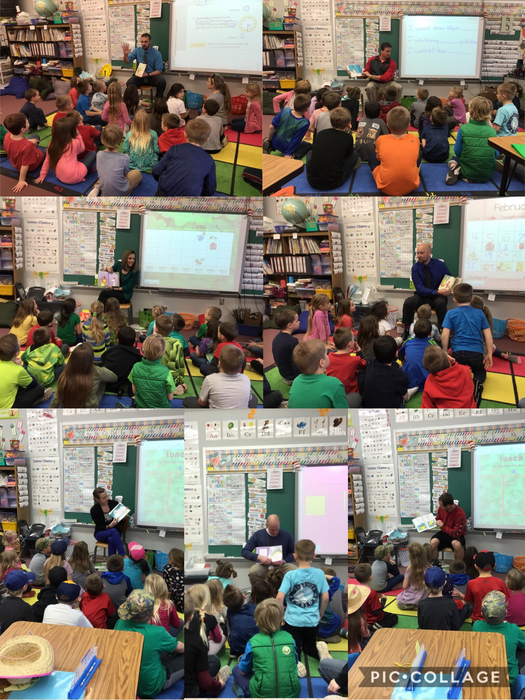 Mrs. Becker’s class had a great time during Read Across America week! We loved all our mystery readers ! 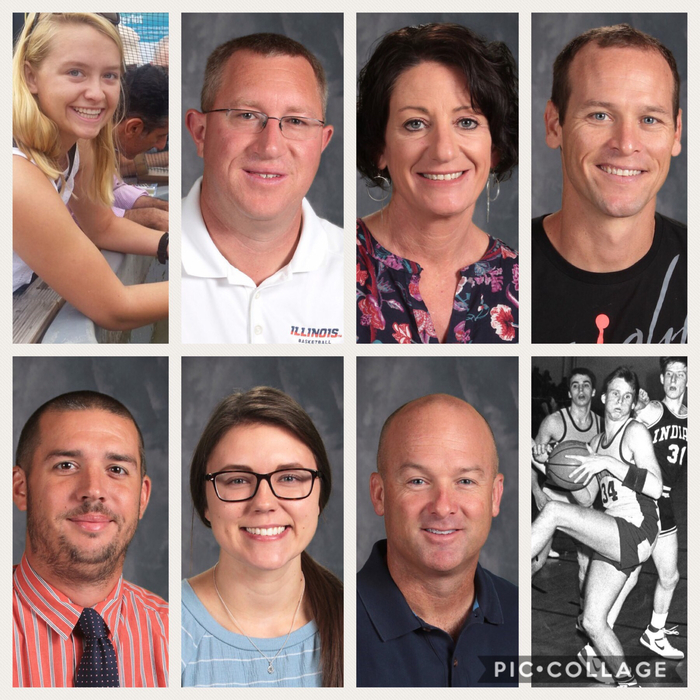 Thank you Mr. Allen, Mr. Young, Coach Becker, Coach Van Pelt, Mrs. Garrett, Coach Reeder, and Mrs. Reeder ! 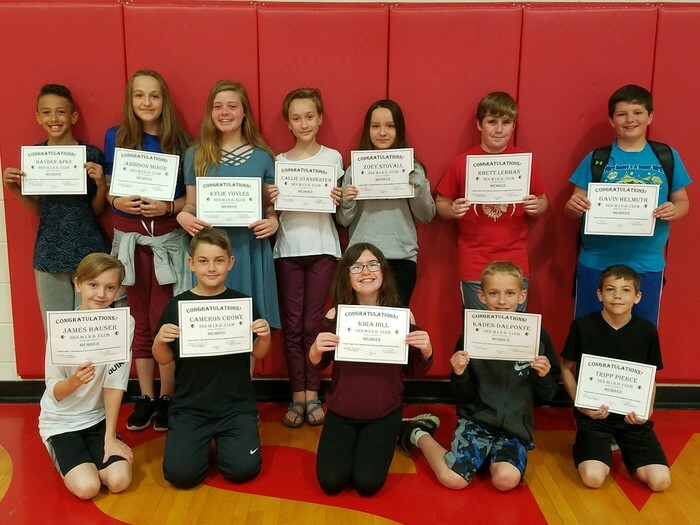 Each month, SES celebrates students who go above and beyond expectations in the classroom by awarding them "Gold Slips." 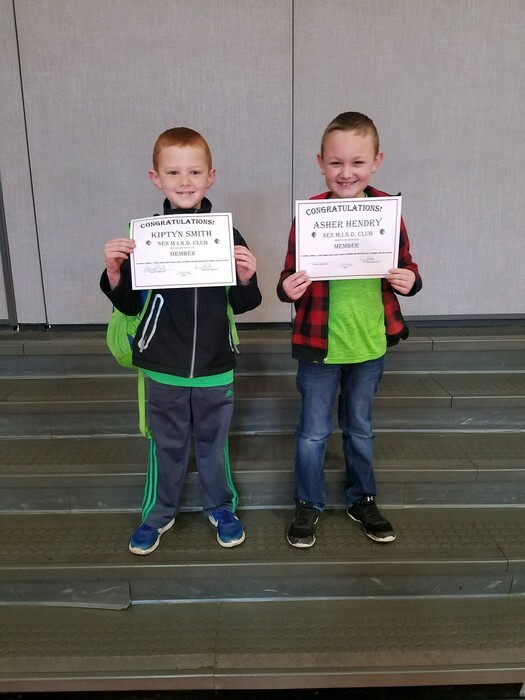 Here are the Gold Slip winners for the month of February (pictured from left to right): October Artrip and Avery Casteel were picking up trash from the bleachers before school. Way to help keep the school clean! Mikaeylah Cunningham immediately went up to a new student, introduced herself and asked to be friends! 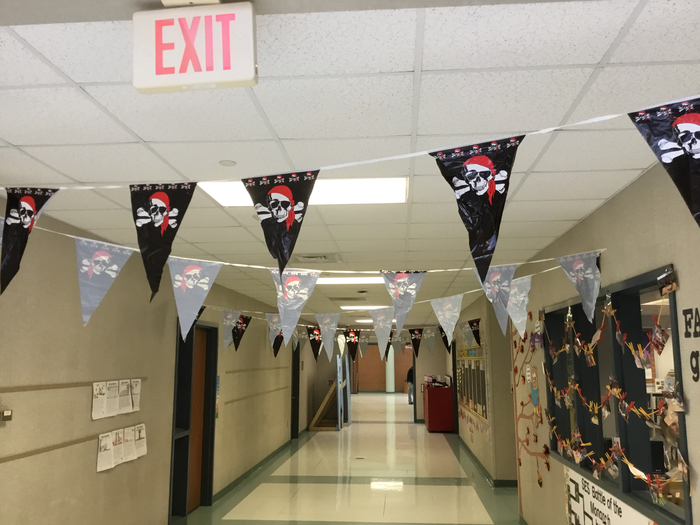 What a great way for a student to be welcomed! 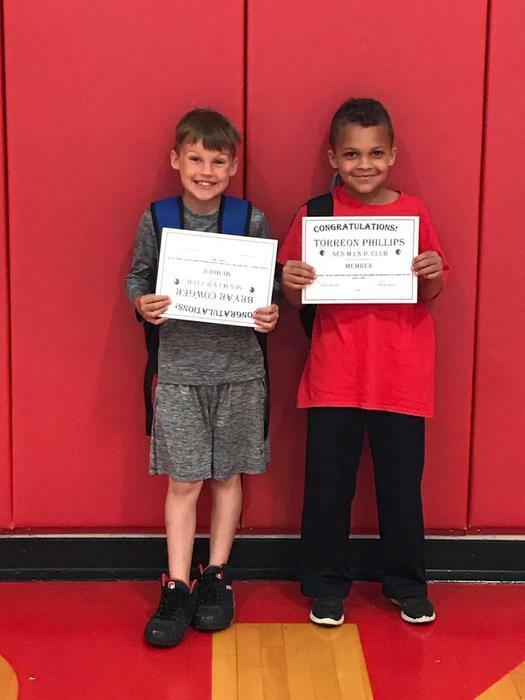 Canin Hall saw a teacher ask for a responsible student to help one of her students get back to his classroom. Cannin eagerly volunteered and was very kind to the boy, placing his hand on his back and guiding him gently while speaking reassuringly to him. Cannin showed great responsibility and concern for the boy's well-being. 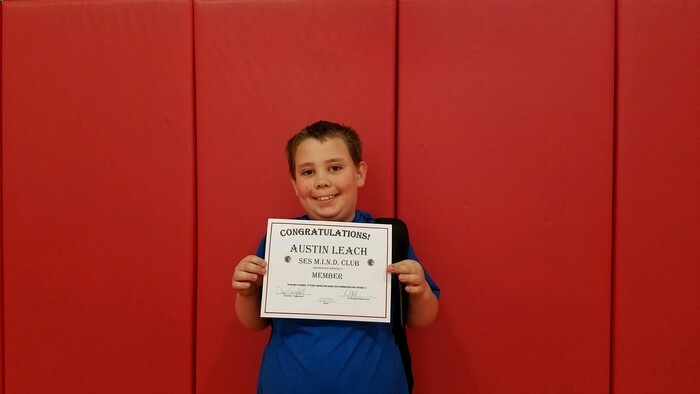 DaCorey Austin saw a kindergarten student trip and fall while leaving the cafeteria. He stepped out of line and helped her up. DaCorey checked to make sure she was okay! The students being treated to some great dancing by Green Eggs and Ham (Mr. Friese, Mr. Campbell, Coach Typer), and the Cat and the Hat (Mr. Walk) reading Green Eggs in Ham. Green Eggs and Ham,Thing 1 and Thing 2, and the Cat and the Hat made appearances at SES on Friday. 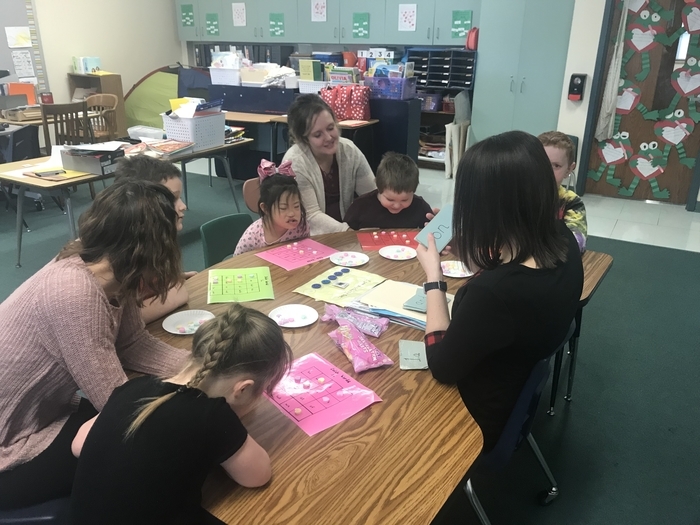 Mrs. Grohler’s students enjoyed reading Green Eggs and Ham with our student teacher, Miss Holthaus. They ended the activity with eating a sweet treat that resembled green eggs and ham. 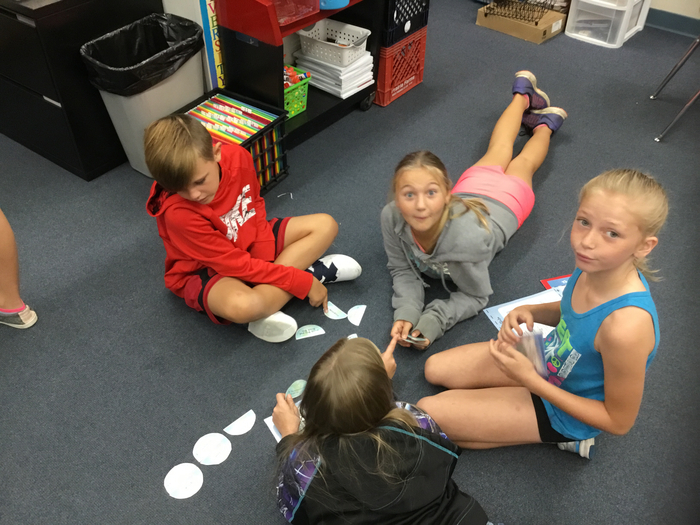 Some more new 5th Grade MIND Club members (Math Is Not Difficult)! 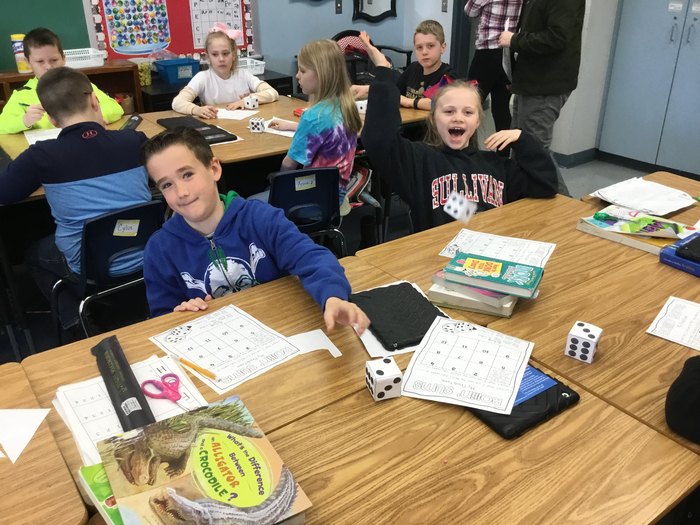 Some more new 3rd Grade MIND Club members (Math Is Not Difficult)! 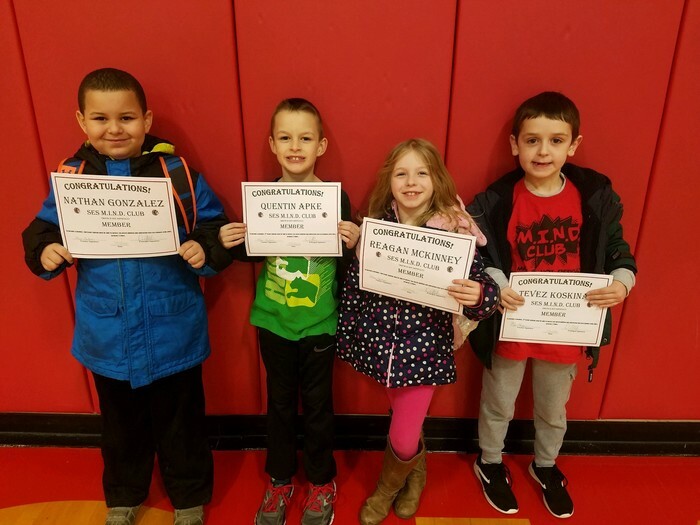 Some more new 2nd Grade MIND Club members (Math Is Not Difficult)! Another new 1st Grade MIND Club member (Math Is Not Difficult)! 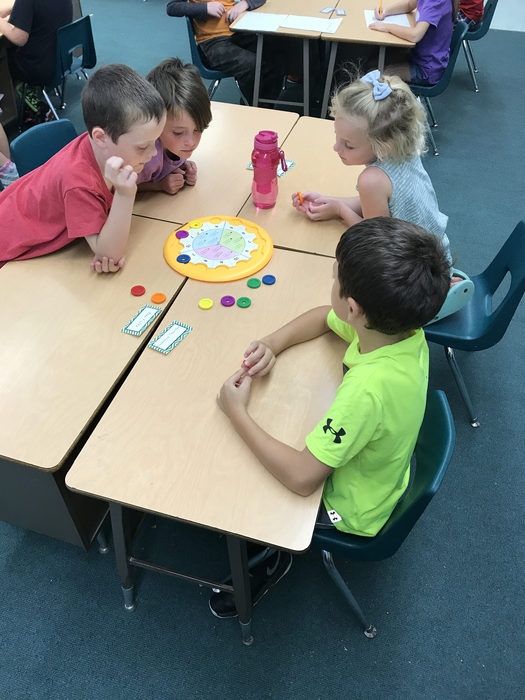 Some more new 1st Grade MIND Club members (Math Is Not Difficult)! 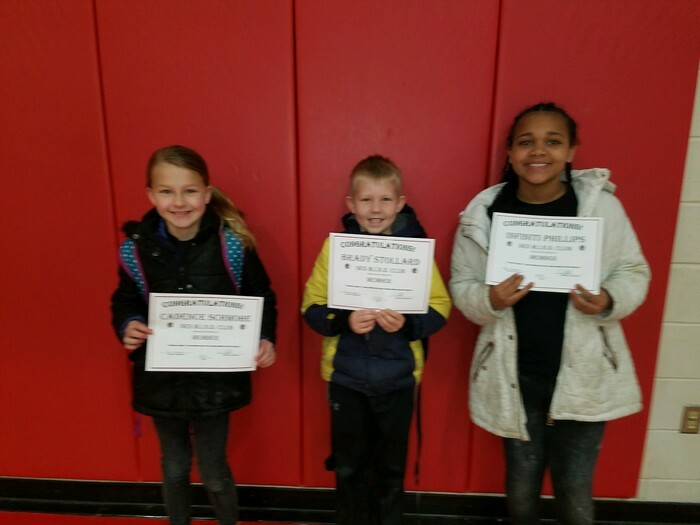 Congratulations to the newest members of the 3rd Grade MIND Club (Math Is Not Difficult)! 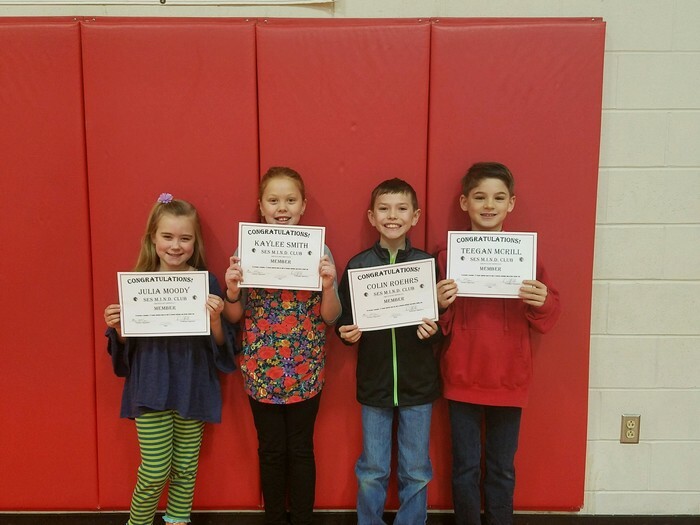 Congratulations to the newest members of the 1st Grade MIND Club (Math Is Not Difficult)! 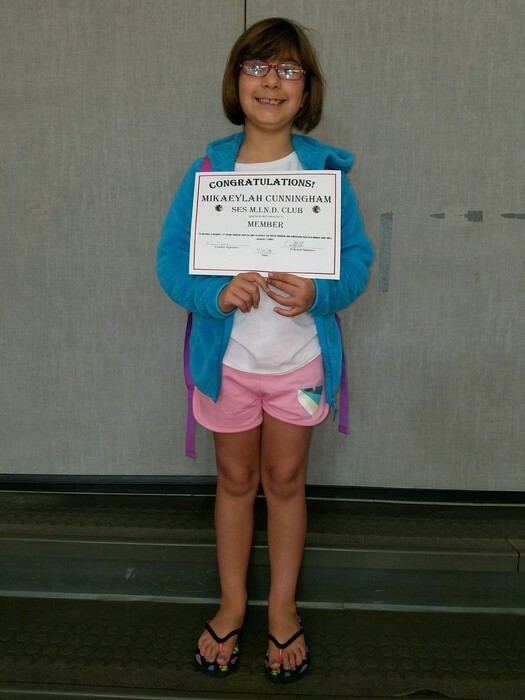 Congratulations to the newest member of the 2nd Grade MIND Club (Math Is Not Difficult)! 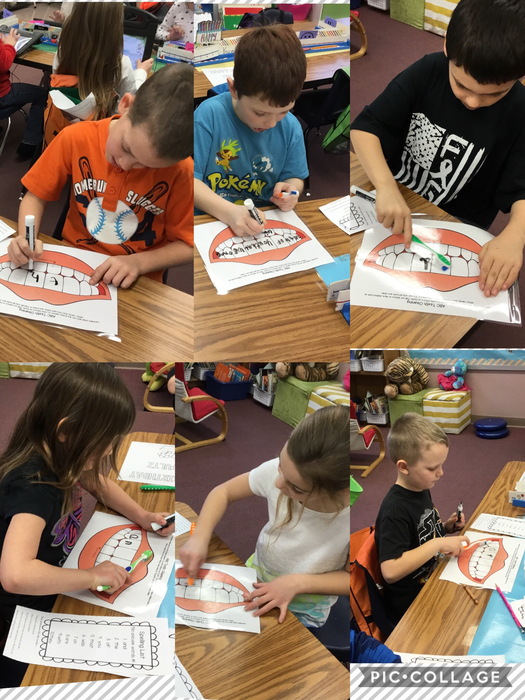 Mrs. Becker’s class practiced spelling words while practicing our teeth brushing in honor of Dental Heath Month ! We are beginning our celebration of Read Across America with “Drop Everything and Read”! 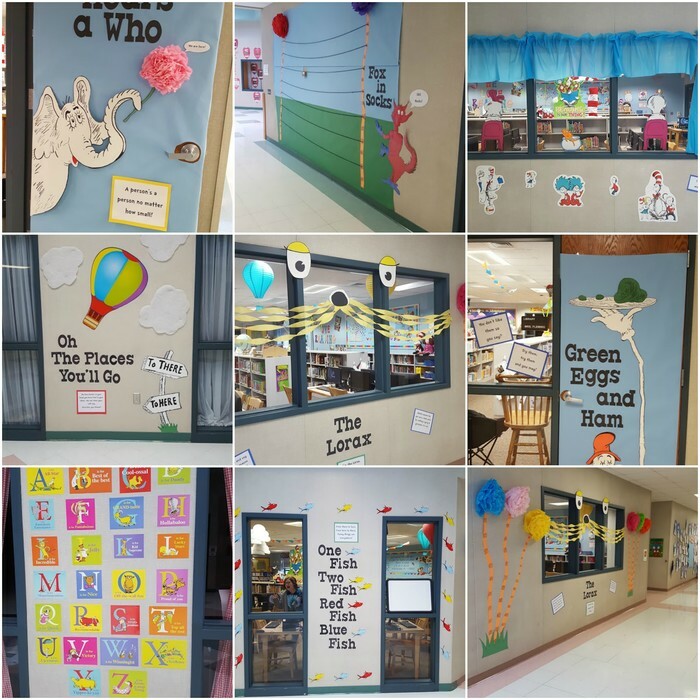 SES halls are ready for Dr. Seuss week.... Are you? This week at SES we celebrate Dr. Seuss, So grab your favorite book to read with a moose. We'll be doing lots of reading all of this week, Reading is the way to get through a winter that's bleak. So grab your favorite book and your favorite kid, And read and read until your heart is content. 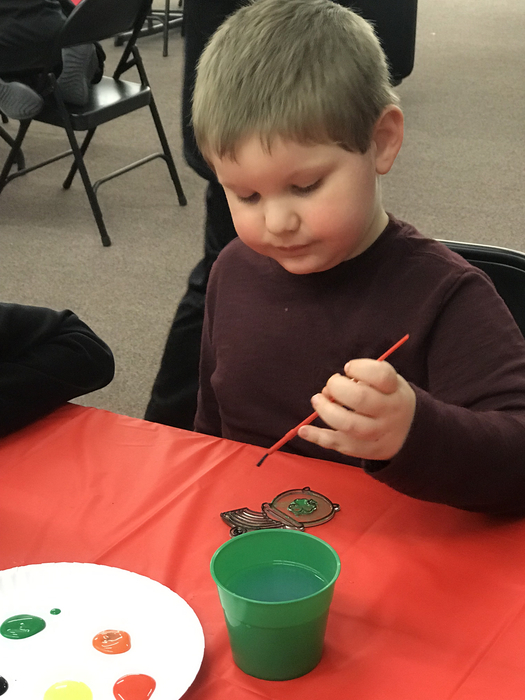 First grade has left their mark at Decatur’s Children’s Museum after receiving the Ulrich Family Book Bash scholarship. More pictures to come when the day of fun is done! 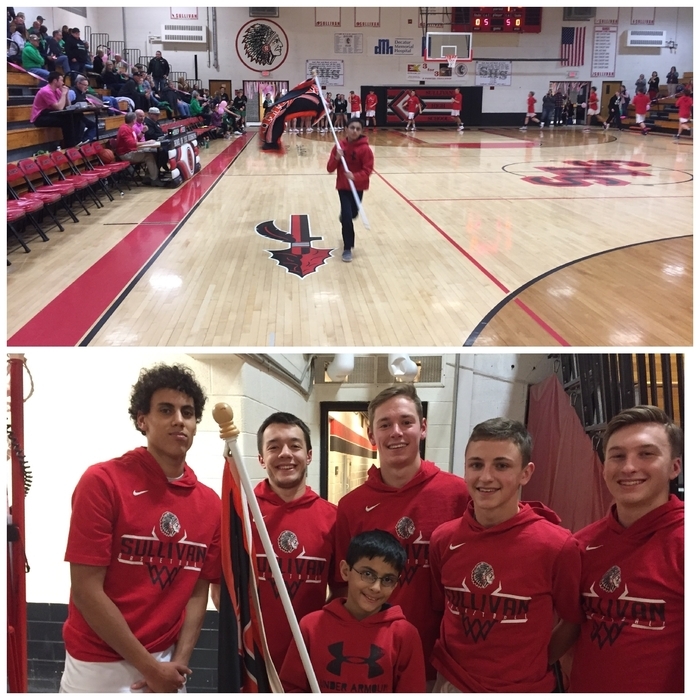 As a result of showing respect, Hunter Hackett, Caden Saul, and Kaden DalPonte got to lead the varsity boys basketball team onto the court before last Friday's game. 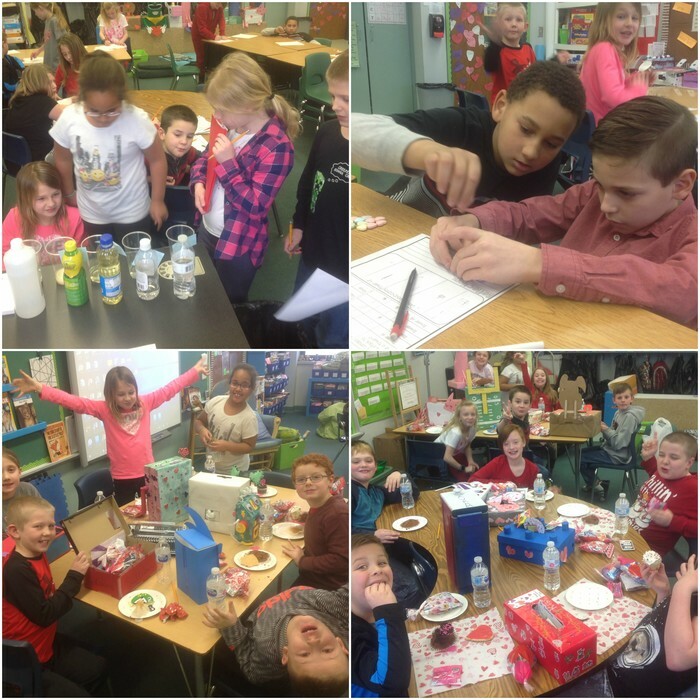 Third graders in Mrs. Harpster's Class enjoyed STEM projects and science experiments on Valentines Day. 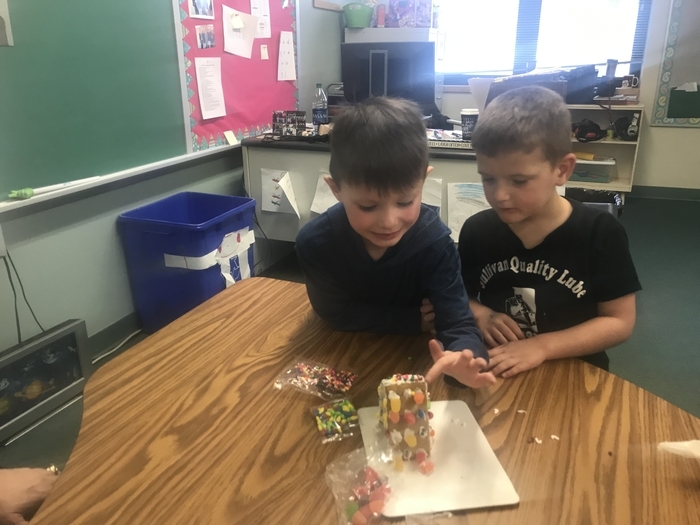 The students designed towers from candy hearts, made predictions about how tall the towers might be, and built the towers to test their designs. 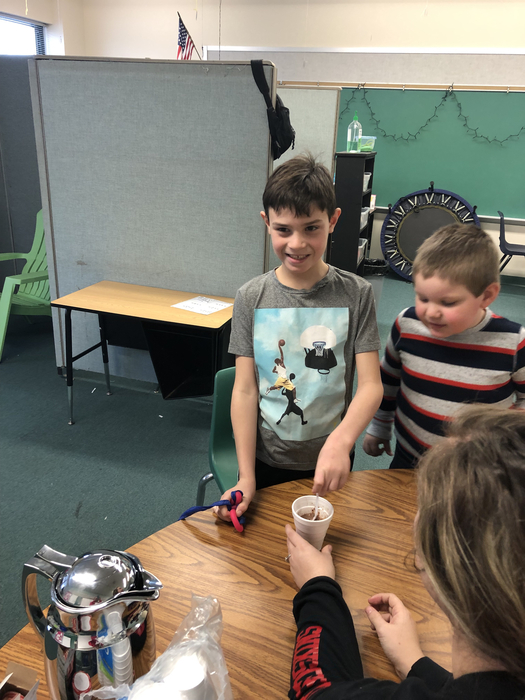 The class also decided to experiment with dissolving candy hearts in five different liquids: water, white vinegar, rubbing alcohol, vegetable oil, and lemon juice. Again, they used prediction skills to determine which liquids might dissolve the candy, and which would be the fastest. The next day the fun continued when the students decided it would be interesting to mix the candy-colored liquids from the previous day. They hypothesized that the liquids, colored by the dissolved candy, would combine to create new colors. (Sidenote: Happy accident! Something really amazing was formed when lemon juice was added to the oil. It was so exciting that many students grabbed their iPads to snap photos. Some started videos and continued to record the great discussions that developed from the experimentation!) Their suspicions about creating new colors were only partially correct. The attempt to combine the liquids led to a discovery that oil and water do not mix because their density is not the same. The students thought about how this could apply in "real life' and came up with oil tankers spilling oil into the ocean. 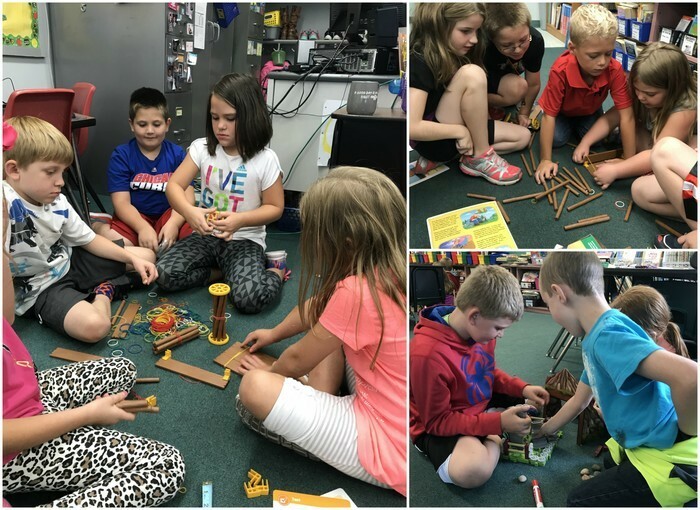 After several creative suggestions for removing oil from the ocean to protect its inhabitants, the kids gave it a try with the classroom model. They tried removing the oil with a straw, which didn't work. Using a Q-tip did work. Using this knowledge, they agreed they needed something larger with greater absorbency. 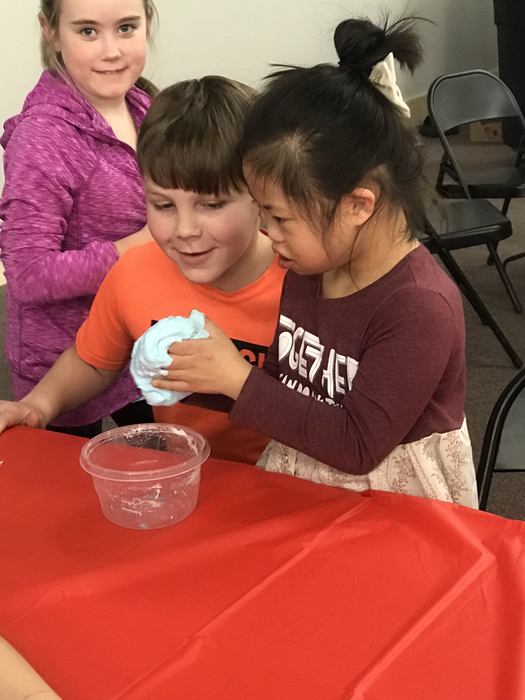 Placing several layers of folded Kleenex onto the top of the oil and water resulted in the "oil spill's " disappearance and left a clean liquid. The class also used a volunteer to try to remove a handful of oil from her hands with only water. It didn't work, so soap was added. This resulted in oil-free hands. They compared this discovery to a commercial they had seen on television and discussed how this, too, could help creatures affected by oil spills. We are quite certain that the kids in Room 16 are destined to be scientists and environmentalists with this kind of thinking! Congratulations to the newest Fifth Grade member of the MIND (Math Is Not Difficult) Club! Congratulations to the first First Grade members of the MIND (Math Is Not Difficult) Club! 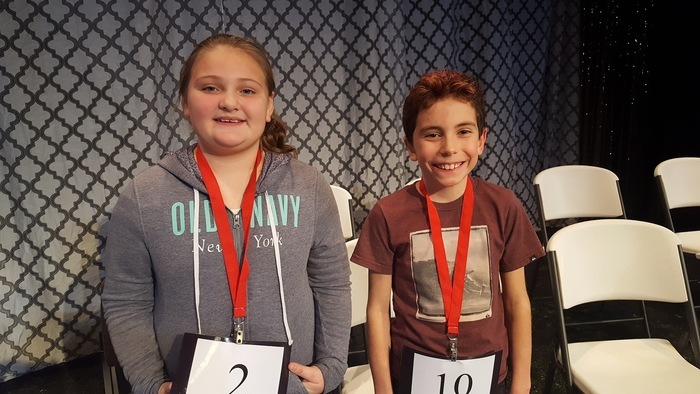 Congratulations to Johnathan Iacobazzi (4th Grade) and Hannah Creek (5th Grade) for their performance at the county-wide spelling bee! Johnathan won the competition and will compete at the regional level. Hannah finished second and will be the alternate. Great job! What better way is there to practice graphing than with candy hearts? First grade is so fun! 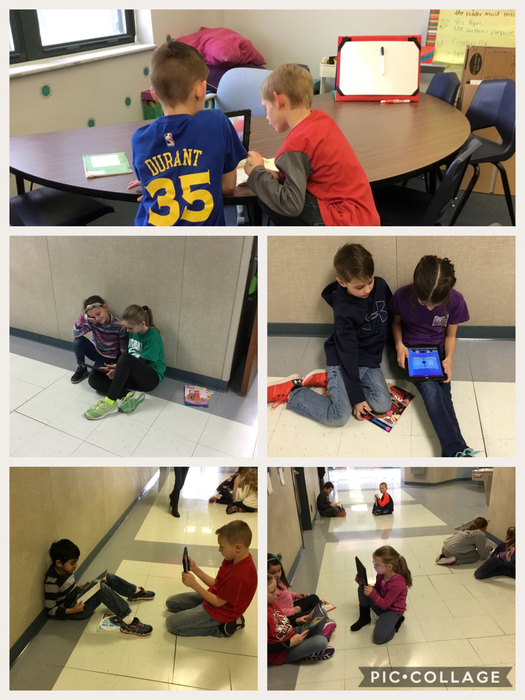 Mrs. Lehman and Mrs. Fultz’s reading buddies recorded each other reading their library books. This gave our 1st graders an idea of what kind of readers they are now, and a glimpse of the readers they will become in 4th grade! Mr. Campbell has an influence on everyone, including our student teachers! 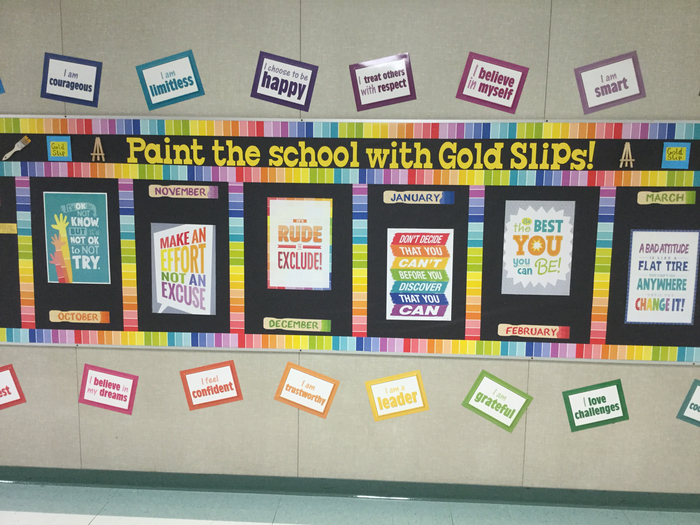 Sullivan Elementary School awards "Gold Slips" to students who go above and beyond expectations. 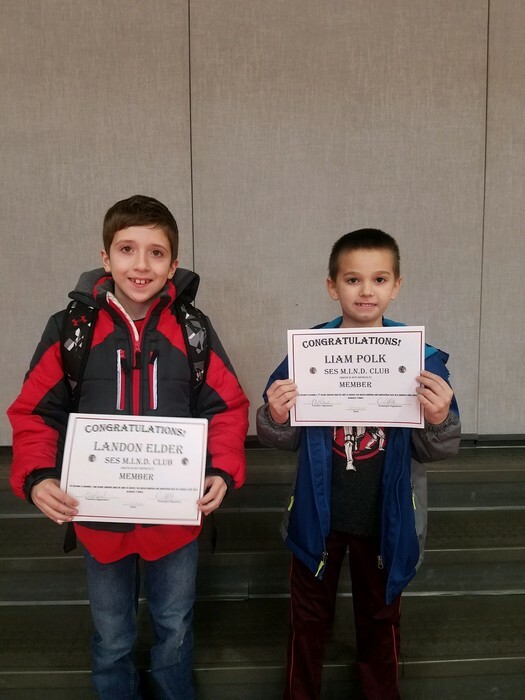 Here are the Gold Slip winners for the month of January (from left to right): Dylan Ray took the time to pick up hoola hoops that had fallen off the wall during recess while other students walked past them! Gavin Helmuth was the only 5th grader to stop and pick up a pair of gloves that someone dropped. He stopped, picked them up, and attempted to find the owner. Bravo! 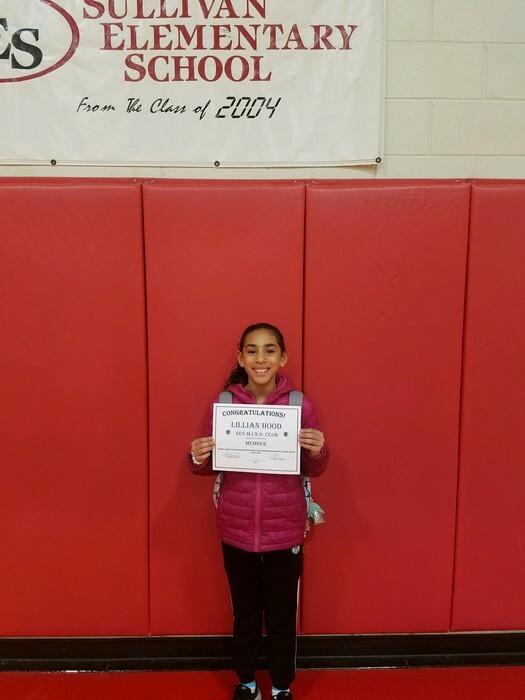 Kya Allen finished her math assignment early and instead of having free time on her iPad, she asked if she could help a couple of her classmates who were struggling! Way to go! Aubrey Martin noticed the incentives for the RESPECT board drawing were getting very low. She went and bought suckers with her own money so other kids would have a treat for being respectful! Christopher Henry is always helping and looking after another student during P.E.! Mrs. Becker’s class loves flashlight Friday! It’s a great way to read our stories ! 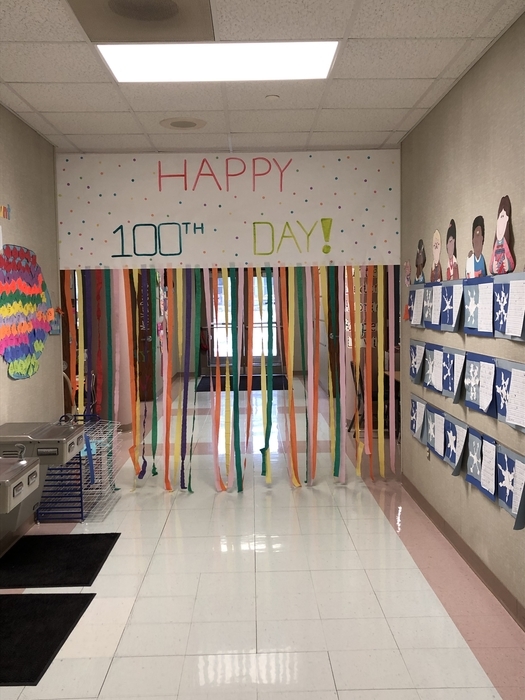 Today our kindergarten classes celebrated the 100th day of school! 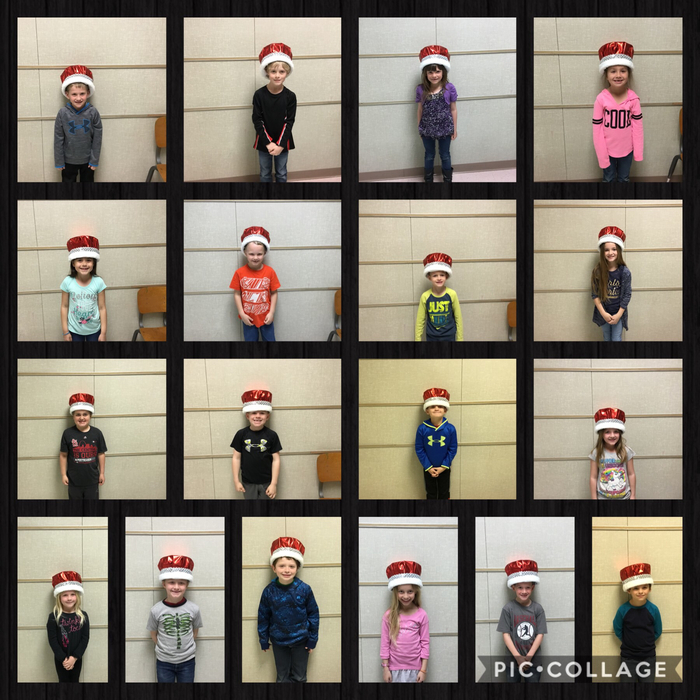 Here is Mrs. Boyer's class wearing their special hats for the occasion! 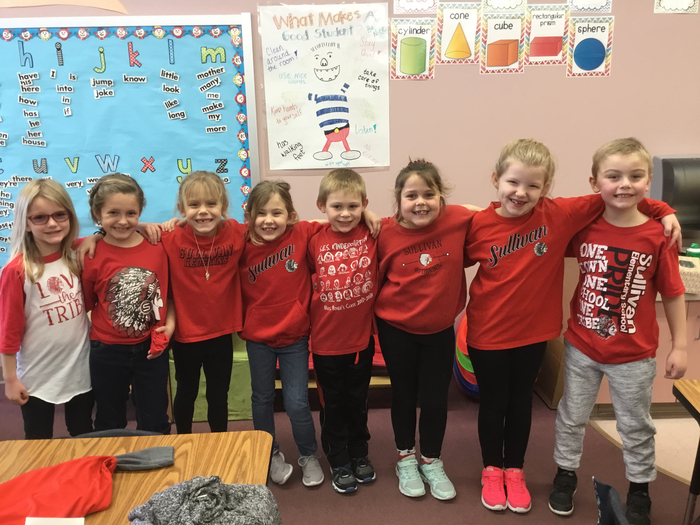 We love twinning at SES! Mrs. Becker’s class practiced their spelling words by writing them in shaving cream ! 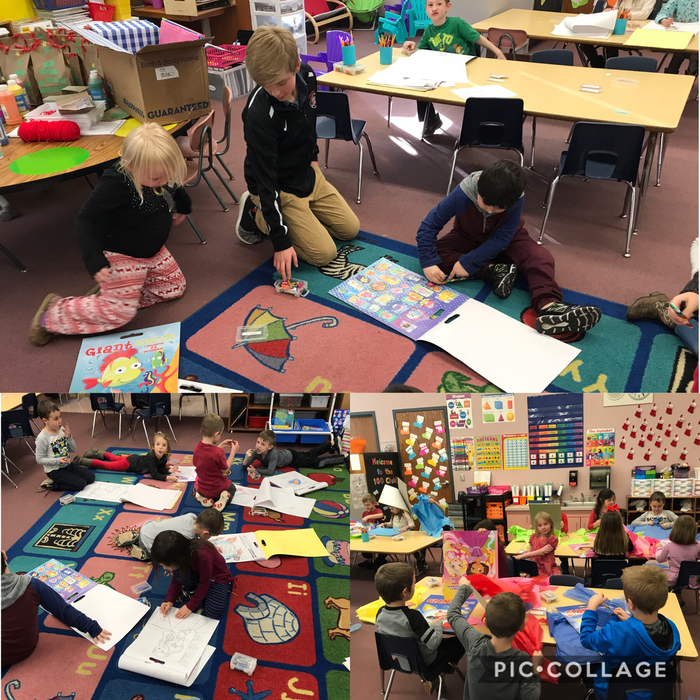 We had a great time making a mess and studying at the same time ! Looking for a challenging and rewarding job working with children? Come work in a friendly, fun, and positive environment. Sullivan Elementary School is currently looking for a One-to-One Aide to start immediately. If you love children, want to help make a positive change, and are a hard worker, this is the job for you. To apply, please mail or email a letter of application, resume, and contact information for references to Mr. Daniel Allen (allend@sullivan.k12.il.us), 910 N. Graham St., Sullivan, IL 61951 by 1/25/18. Please note the menu changes for Wed. Jan 17th at SES. 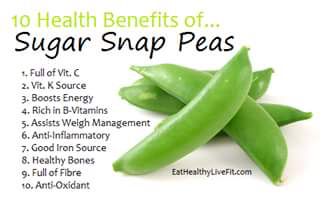 Breakfast will be French Toast Sticks or Option #2 Lunch Choices will be : Chicken Patty on Bun or Cheeseburger on Bun with Green Beans and fresh apple wedges. 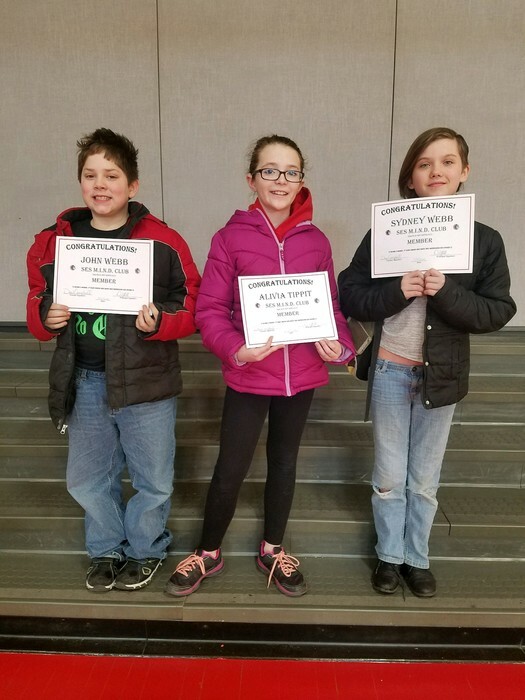 Fourth and Fifth grade students compete to advance to the District spelling bee. 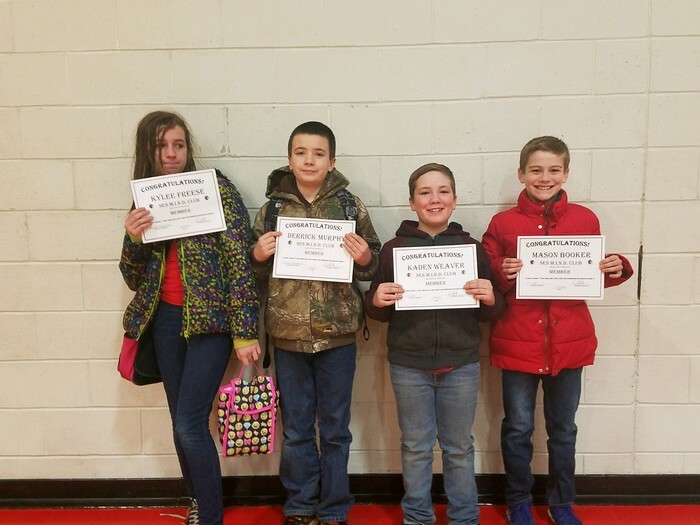 Pictured are the students who moved on to compete at the January 24th Bee. 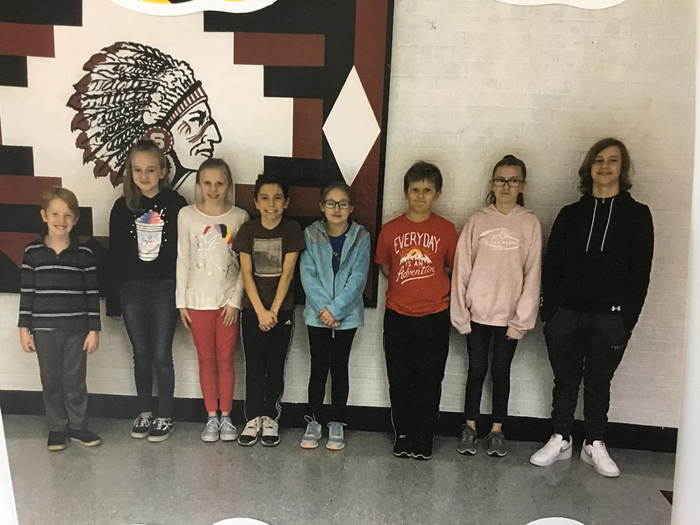 Anyssa Coffer, Addison Brush, Merien Garrett, Hannah Creek, Mikaela Guest, Ivan Moxley, Johnathan Iacobazzi, Gareth Coffer, Caden Saul, Camden Watkins, Kaden Weaver, Charlie Rubush, Carson Swinford, and Landon Jesse. First grade is ready to cheer on the Redskins with the help of some basketball players and coaches. They helped us paint and even showed a few drills. Go Redskins !! 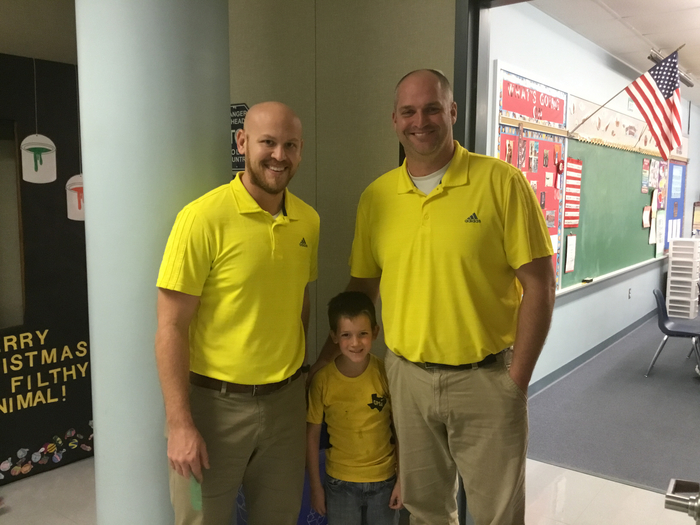 We love twinning at SES ! 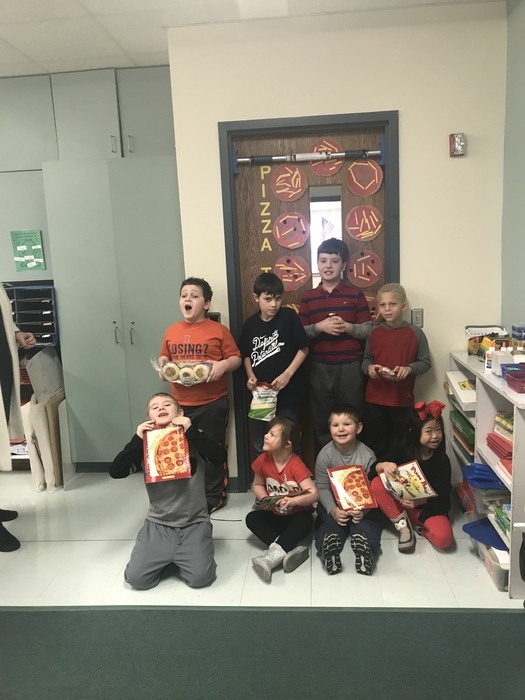 The students in Mr. Campbell’s 4th grade class, were given the option to have a class gift exchange or use the money usually spent on gifts to make a donation to a local outreach. The students, unanimously, chose to raise the money and make a donation. This year, the students and their families, raised $154 that has been donated to support the CEFS of Moultrie County! 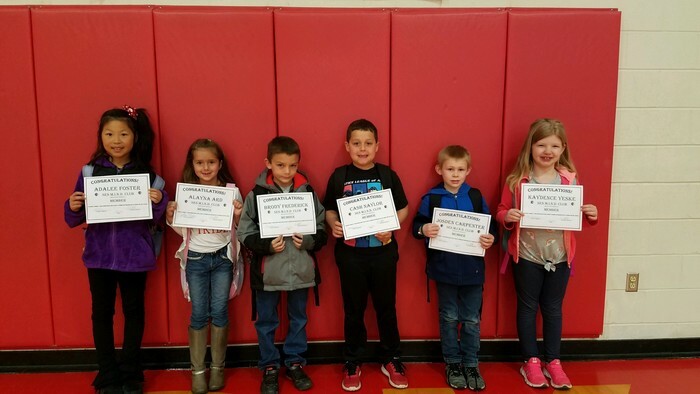 In back (left to right): Ivan Moxley, Gavin Helmuth, Caidon Hill, Nixon Dundee, Tessla Ashbrook, Kendall Penberthy, Nevaeh Marlow In front (left to right): Avram Bates, Aiden Dinger At Sullivan Elementary School, students who go above and beyond expectations are awarded a "Gold Slip." 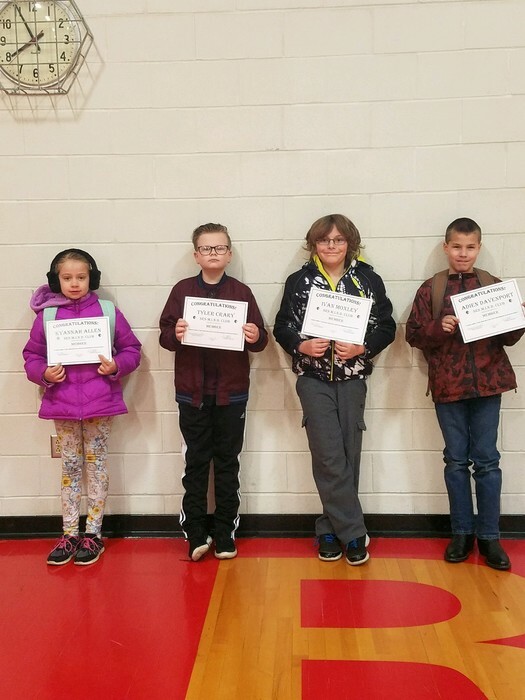 The following students were Gold Slip winners for the month of December: Ivan Moxley expertly shared his knowledge with another student who was needing help with a project direction. He was a wonderful student teacher on this day when a substitute teacher was in charge. Gavin Helmuth, Nixon Dundee, and Tessla Ashbrook noticed a trash can after school that had blown over in the parking lot. Without being asked, they put the trash can back in place and picked up all the trash that had spilled out of it. What a responsible and conscientious group of students! Caidon Hill knew that there was someone who was going through a difficult time. He gave up something that was given to him because he knew the other student needed it more. Caidon is a good friend! As a way to spread Christmas cheer, Kendall Penberthy and her family paid for another student's lost library book. Thank you, Kendall, for you generous gift! Nevaeh Marlow voluntarily spent her free time cleaning up her classroom during the class movie. She even cleaned everyone's desk! Avram Bates was listening to and discussing a book by Patricia Palacco. 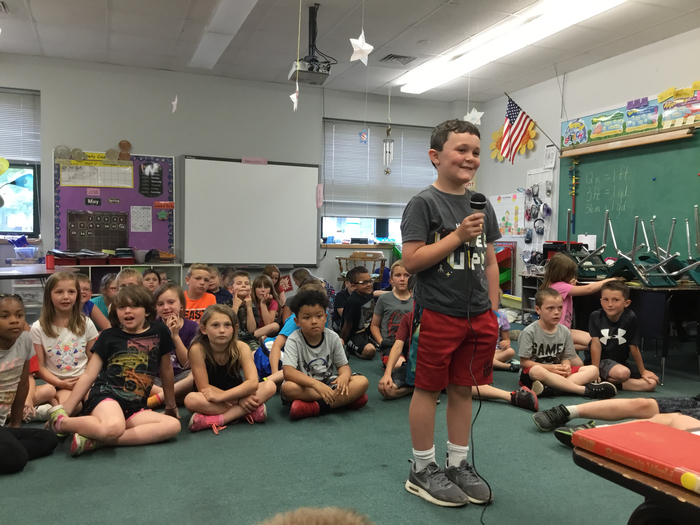 Avram connected with the book and shared his feelings about a student he thought had been treated poorly by others, leading to a wonderful class discussion and ways to help that student feel loved. Avram is so caring and has a big heart. 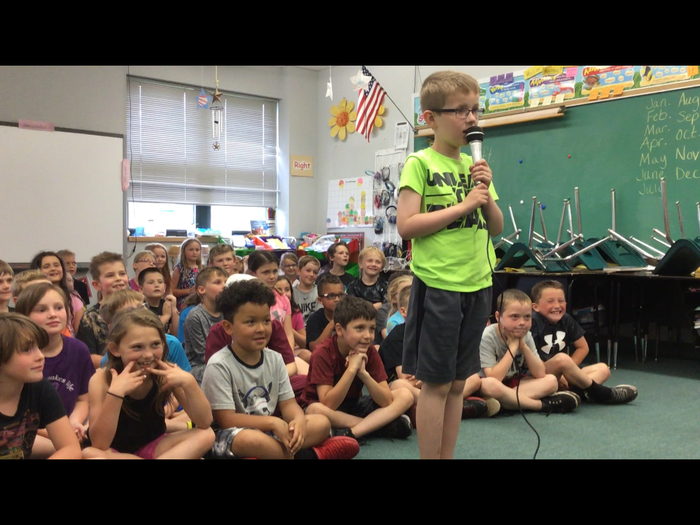 When a student was making fun of a student with special needs, Aiden Dinger stuck up for the student being made fun of! We are very proud of how Aiden put a stop to bullying! Elementary School report cards will be coming home today! Also, notes will be coming home for Parent/Teacher Conference sign ups. Some teachers are sending them with the report cards and others will be sending them separately within the next couple of weeks, so please be on the lookout! The votes are in! Congratulations to Mrs. Becker who received 80 of the 460 votes to win the SES People's Choice Door Decorating Contest! 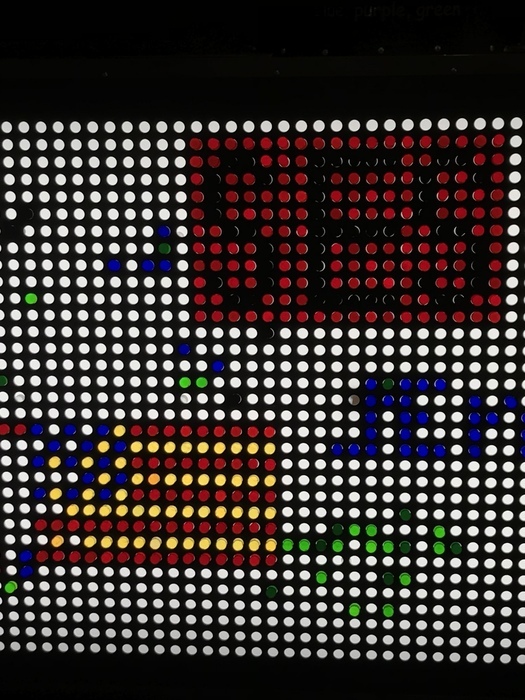 Mrs. McCain was a close 2nd with 78 votes. 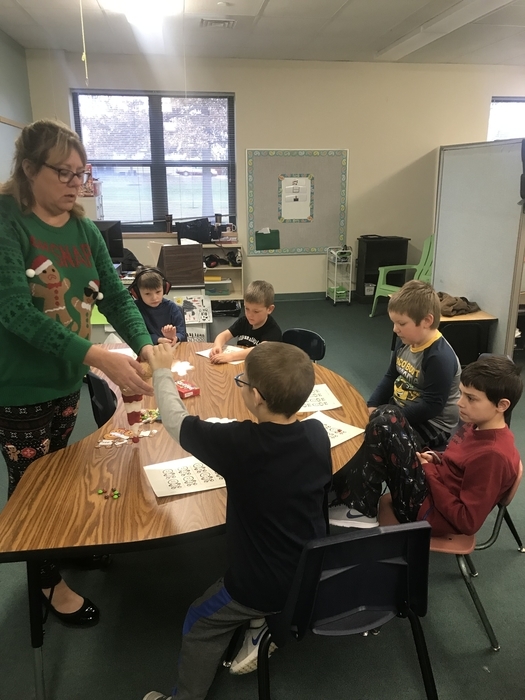 Last week in library class Mrs. Fleming shared the story, "How the Grinch Stole Christmas" After, students enjoyed a fun science experiment. 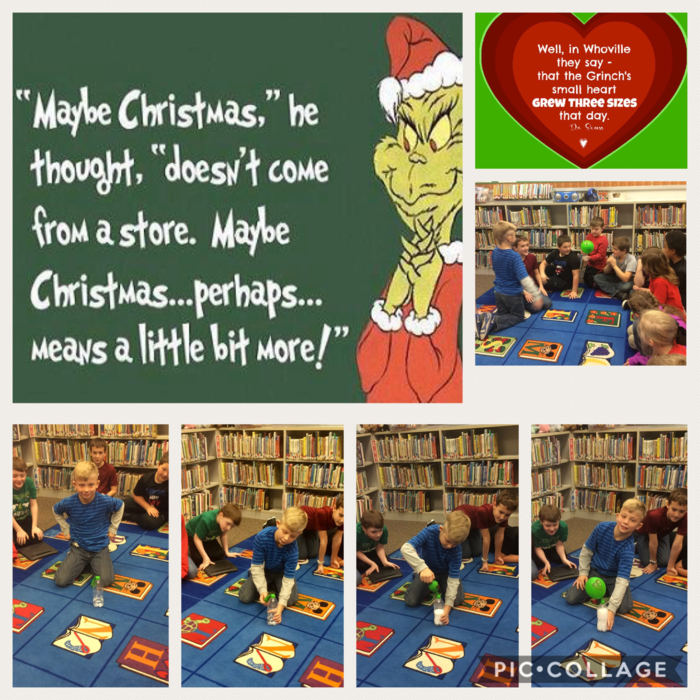 Using a bottle with some vinegar and a green balloon with a heart drawn on it, and some baking soda (inside the balloon), we grew the Grinch's heart three sizes. When the baking soda came in contact with the vinegar two things happened. The Grinch's heart grew because the chemical reaction created carbon dioxide which inflated the balloon. Also the "coldness" came out of his heart because the chemical reaction created a temperature change. This made our liquid much colder. 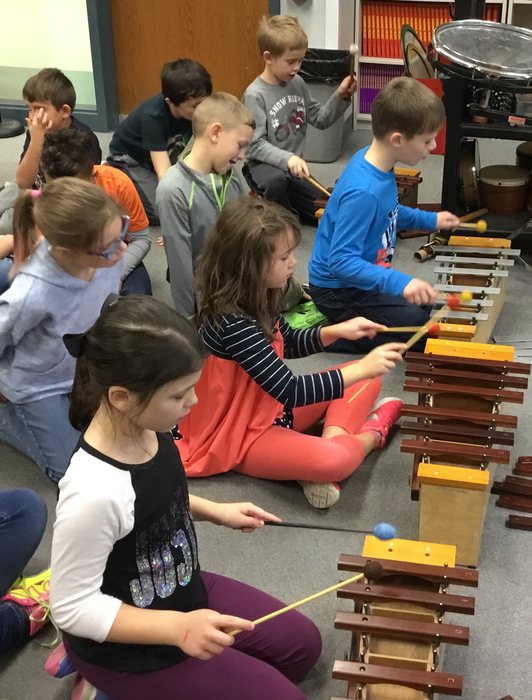 1st and 2nd grade students are learning about mallet instruments and musical improvisation with Mr. Schaefers. 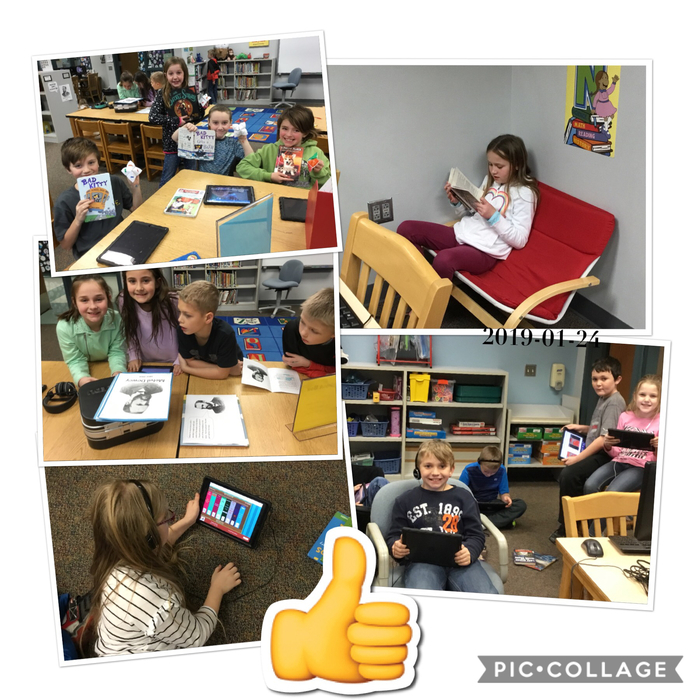 Last week in library the 3rd, 4th, and 5th graders played Kahoot, a review game on the iPads. 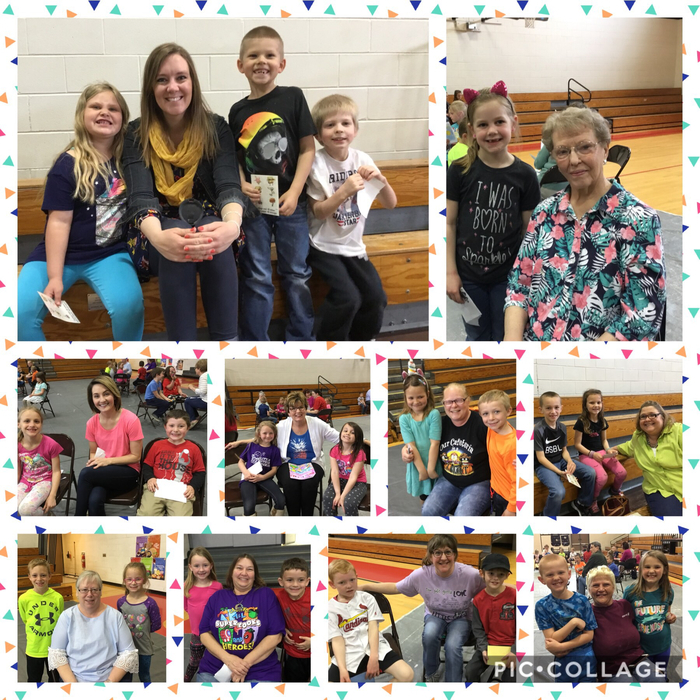 It was a review of everything they have done in the library since the beginning of the year Mrs. Fleming kept track of the scores and announced winners last Friday. She had assumed a 5th grader would win just because they are older and have been exposed to the information more than a 3rd grader, but she was wrong. 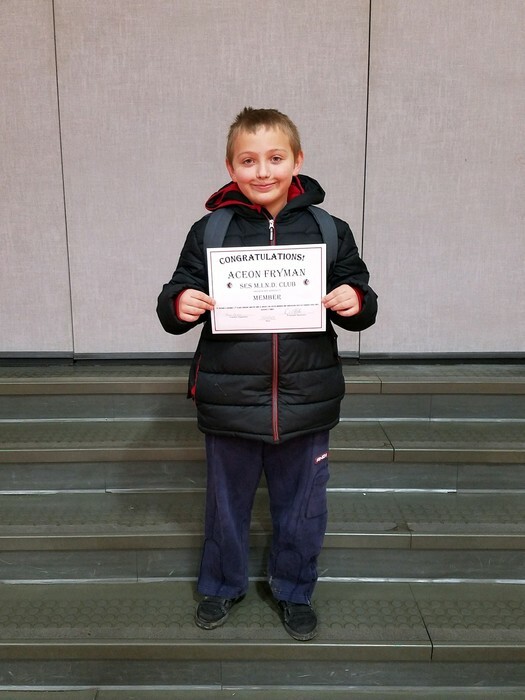 Third grader Odin Cunnigham had the highest score for all of the 3rd, 4th and 5th graders. Odin won a signed copy of the new Diary of a Wimpy Kid book, The Getaway. 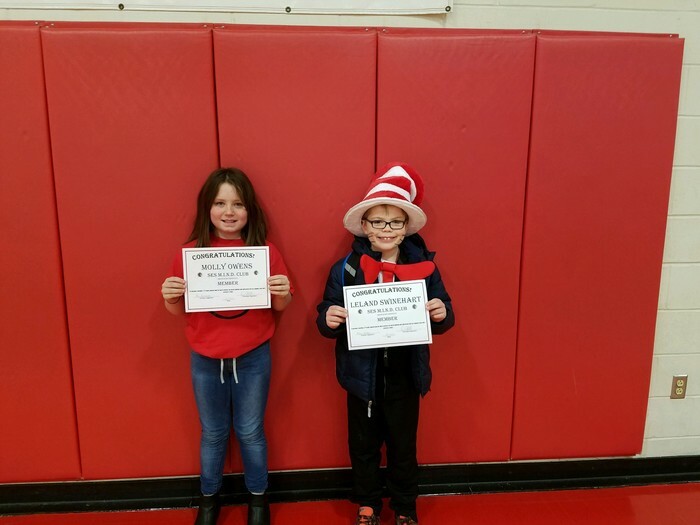 The 4th grade winner was Charlie Rubush and the 5th grade winner was Jazzlyn Coe. Charlie and Jazzlyn get the opportunity to be the first students to checkout the library copies of The Getaway. SES students and parents, don't miss this opportunity! This year the Sullivan Band Boosters is holding a fundraiser by hosting a Sugar Cone Christmas Tree Decorating & Movie Night for the SES students on Friday, 12/15 from 6-8:30pm. This night will give SES parents the opportunity to have a night free during the rather busy holiday season. The cost is $10 a student, and $6 for additional siblings. 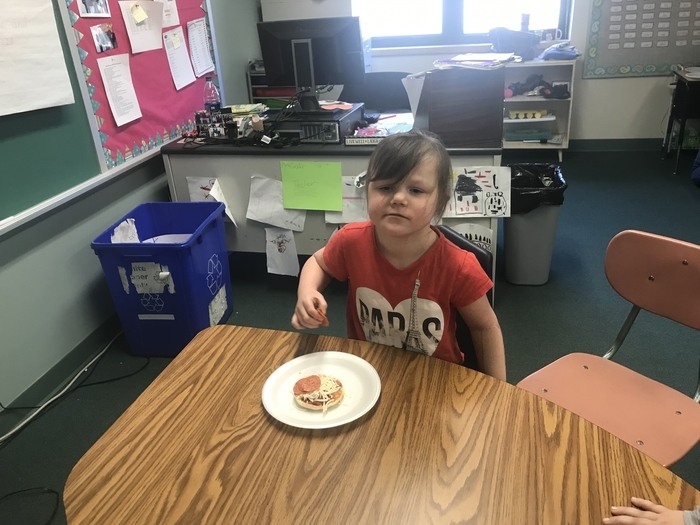 First graders in Mrs. Fultz’s class were reviewing the phases of the moon today in a fun (and tasty) way! 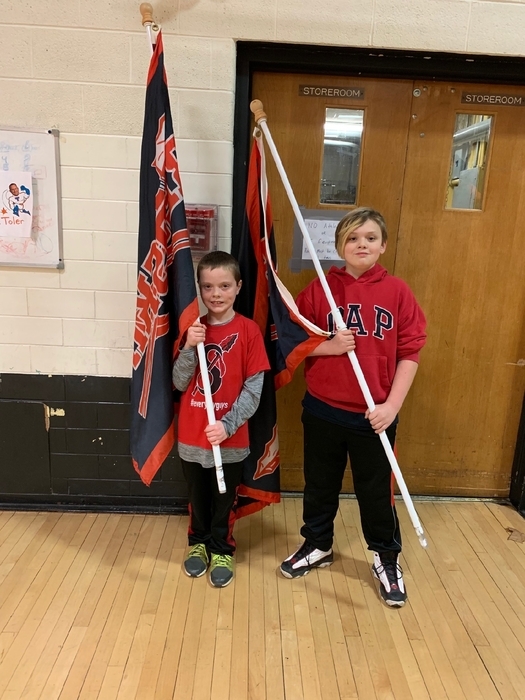 As a result of showing respect inside and outside of the classroom, Elijah Dalbey and Charlie DaPron were chosen to lead the varsity boys basketball team onto the court Tuesday evening. Way to go, boys! 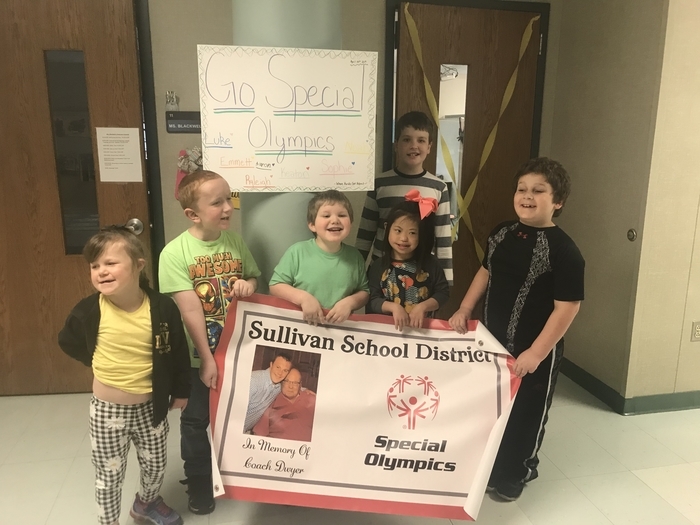 Each month, Sullivan Elementary School recognizes students who go above and beyond expectations by giving the a "Gold Slip." 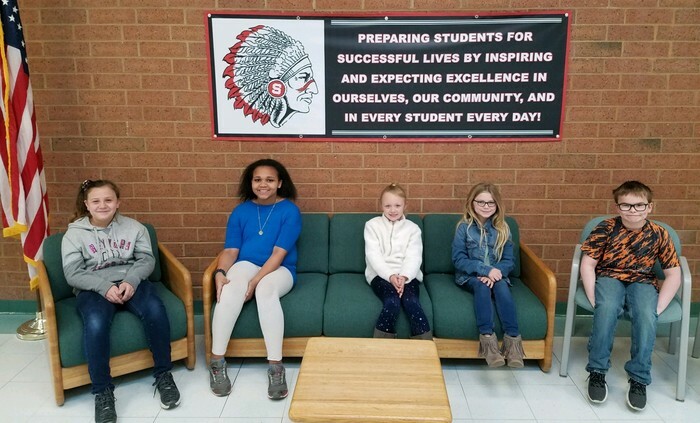 Following are the month of November's winners (from left to right): Tenley Stollard saw a student spill his drink on the floor. Without being asked, she immediately started cleaning it up, then picked up all the other trash around the trash can. She is very thoughtful and conscientious! 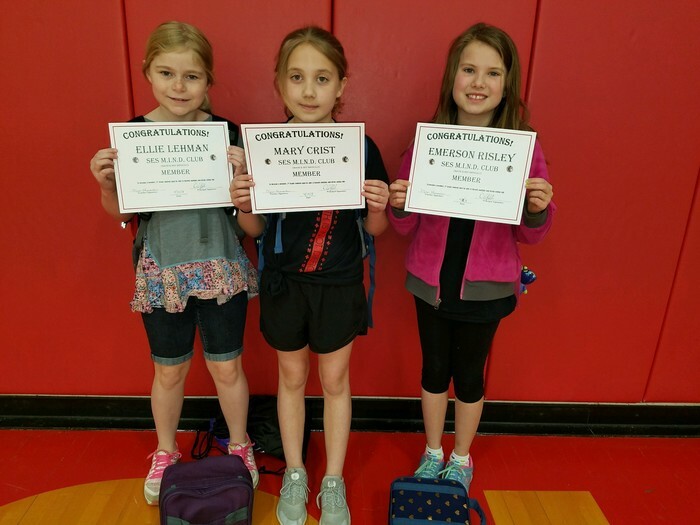 Ellie Lehman, Julia Moody, and Kaylee Smith helped clean up the cafeteria after the 2nd and 3rd grade lunch. It was very helpful considering there were 3 milk spills that day. 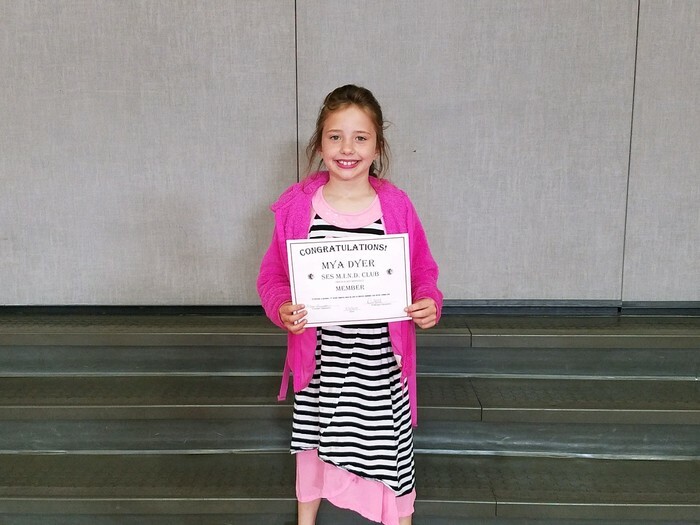 Madelyn Whitmore always sets a positive example for other students on the bus. The younger students enjoy sitting with her. She listens to them read and is patient. She is polite to the bus driver as she gets on and off the bus and always has something kind to say to other students. Infiniti Phillips noticed that the class supply of Redskin paper was running low and took it upon herself to go home and inform her mom about the situation. They sent paper in the following day for her class to use. 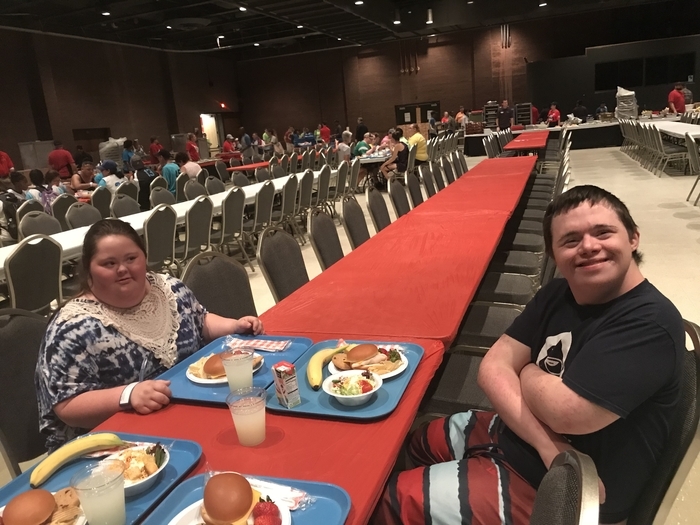 Cadence Schmohe noticed staff members wiping down the tables in the cafeteria and jumped in to help even though she was not one of the table washers that week! 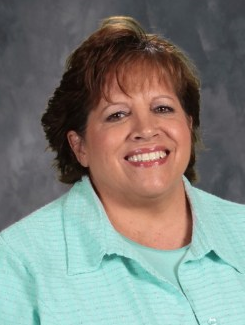 Mary Crist jumped in to help a classmate who was struggling with her work. Handwriting and composing were both difficult for the student, so Mary helped the student determine what to write then wrote it for him so he could neatly copy it for a final draft. 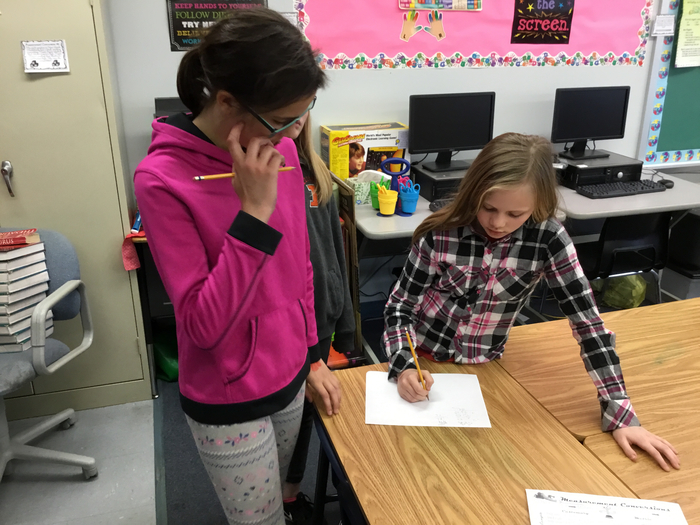 Mary always helps classmates in need, and often searches for ways to help. 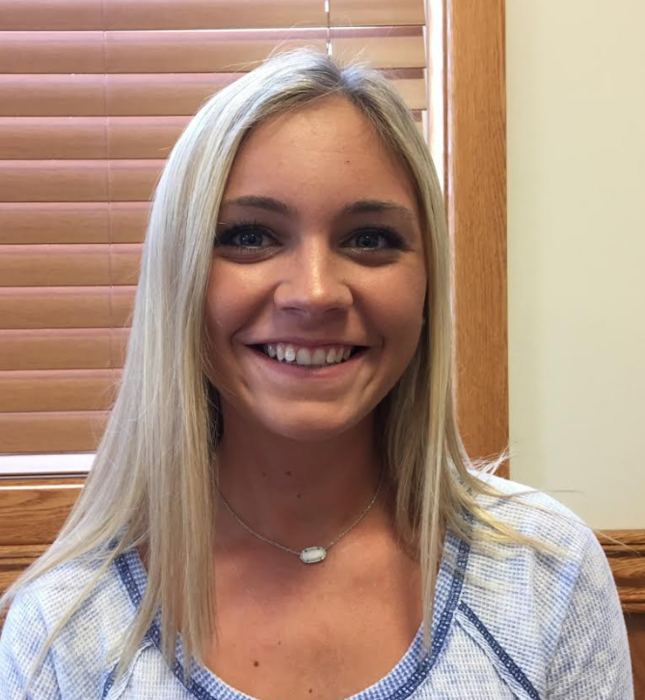 Olivia Hullum noticed staff members wiping down the tables in the cafeteria and jumped in to help even though she was not one of the table washers that week! Mya Dyer's class has been learning several new ways to use iPads in class. Mya always listens very carefully. This allows her to help classmates when they struggle. Mya willingly helps anyone in need. She has been a kind and quiet leader in the classroom. She is a little tech expert! 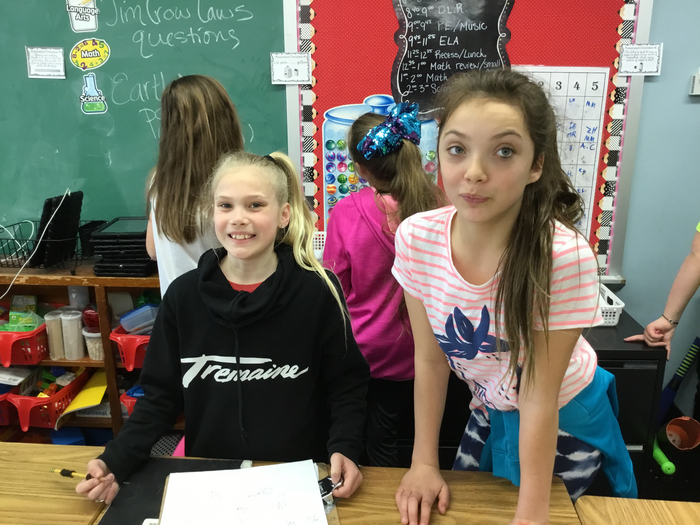 Kendall Penberthy, Isabel Donovan, and Elizabeth Gonzalez clean and organize their classroom everyday after lunch without being asked. Way to to students, you help make Sullivan Schools a great place to be! 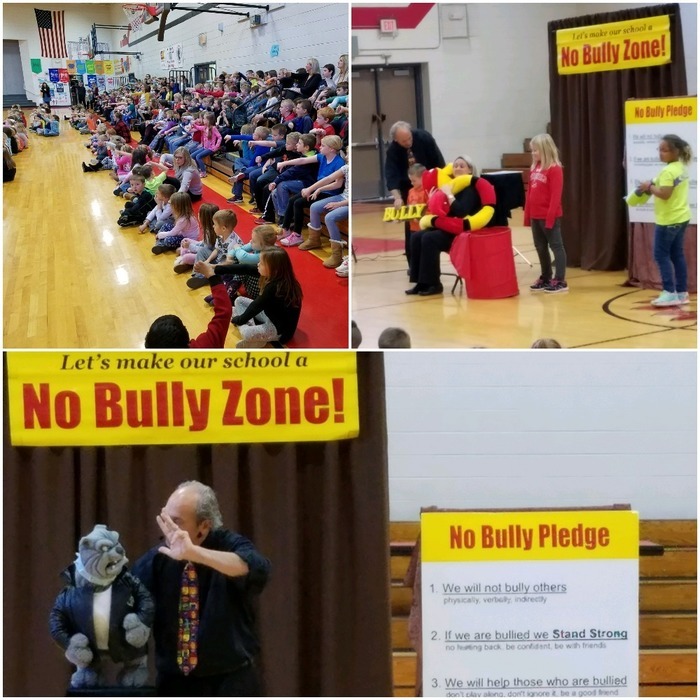 Kindergarten through 3rd Grade got to enjoy a fun and interactive anti-bullying show by Mr. Puppet, courtesy of our fall fundraising company Club's Choice. 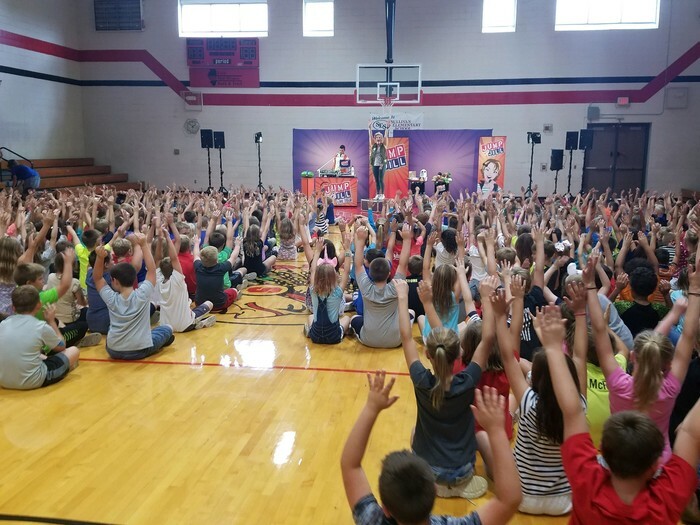 Students really enjoyed the show! 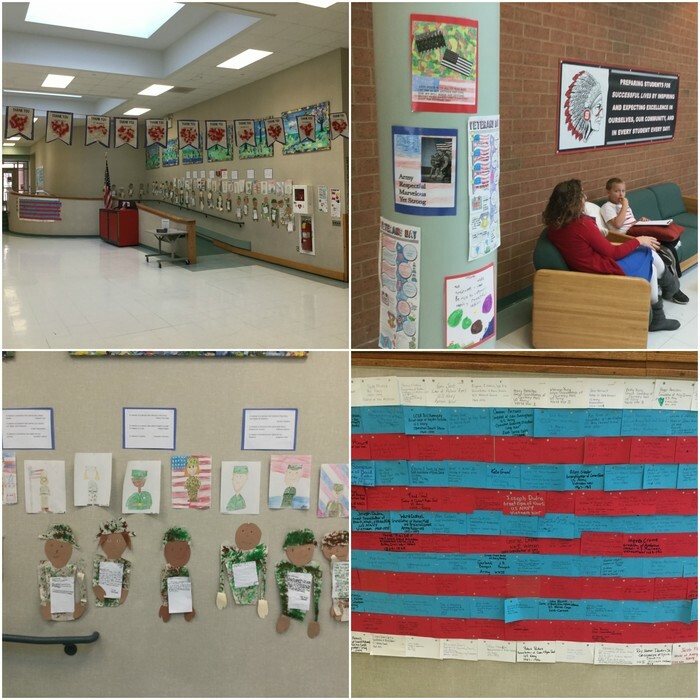 Here are some Veteran's Day pictures from Sullivan Elementary, including a picture of retired Sullivan teachers and WWII veterans John Ruscin and Norm Buckner. 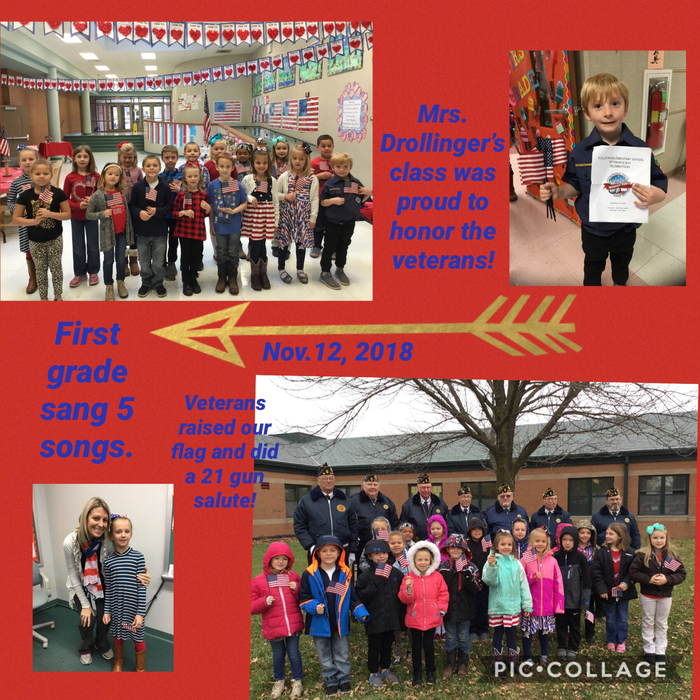 Photos are courtesy of Mrs. Drollinger and her 1st grade class. 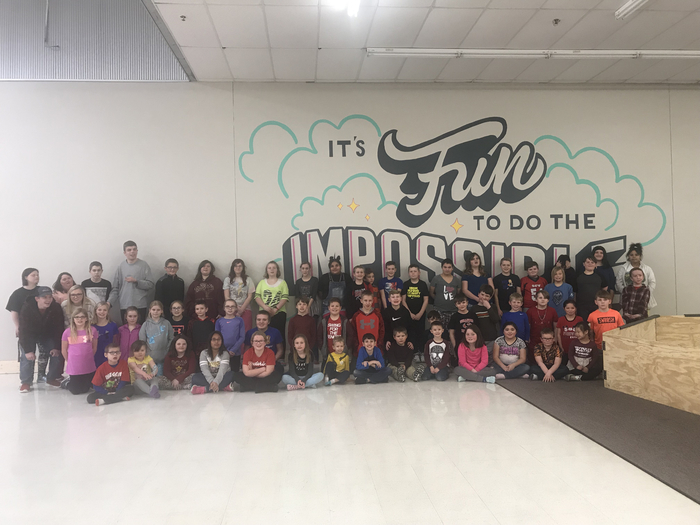 Fourth graders from Mrs. Hendry's class shared their recess with kindergarten and first graders to celebrate Giving Tuesday. Students came up with the idea to spread kindness throughout the day, but would like to put together a donation project for children in need. Congratulations to Khyli Kelly and Cora Emel for being named last week's respect board winners. 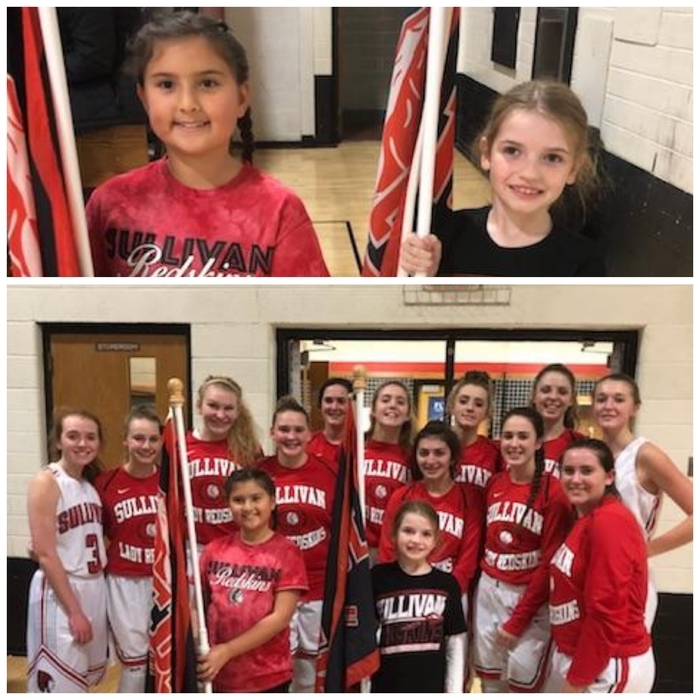 They led the Sullivan Lady Redskins out at Monday night's home game. Wishing you a Happy Thanksgiving from all the “turkeys” at SES! Each feather has a student's name and what they are thankful for. 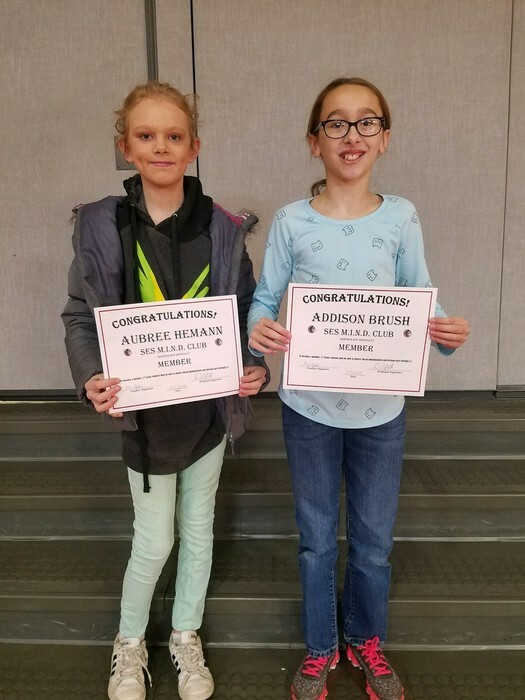 Congratulations to Mary Crist and Olivia Tippet for being the Respect board winners last week. 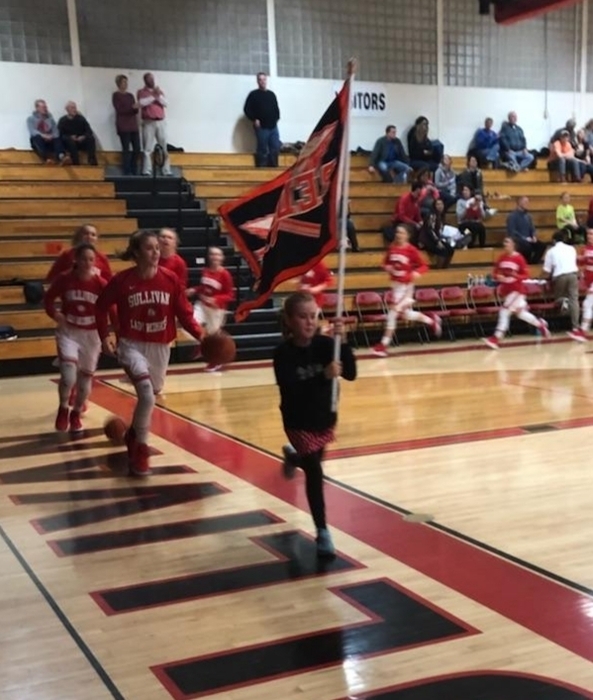 They led the Lady Redskins out onto the floor Tuesday night. SES is getting ready for family reading night ! We know the book is always better than the movie, so come find out for yourself ! The fun starts at 6:00 pm. 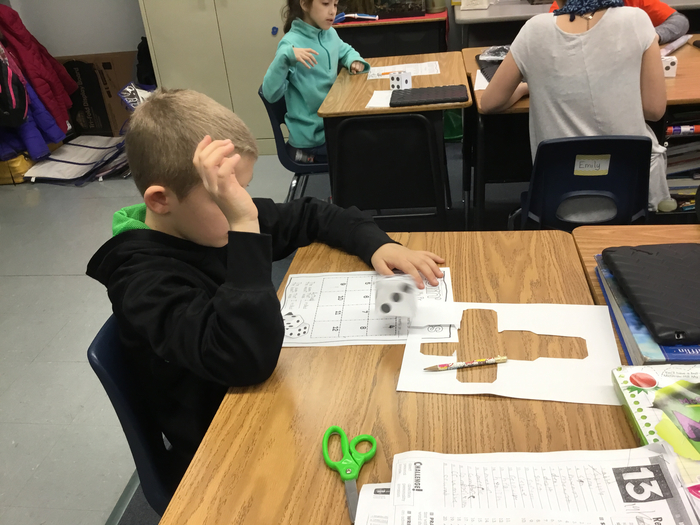 Mrs. Becker’s RTI group has been learning about 3D shapes. 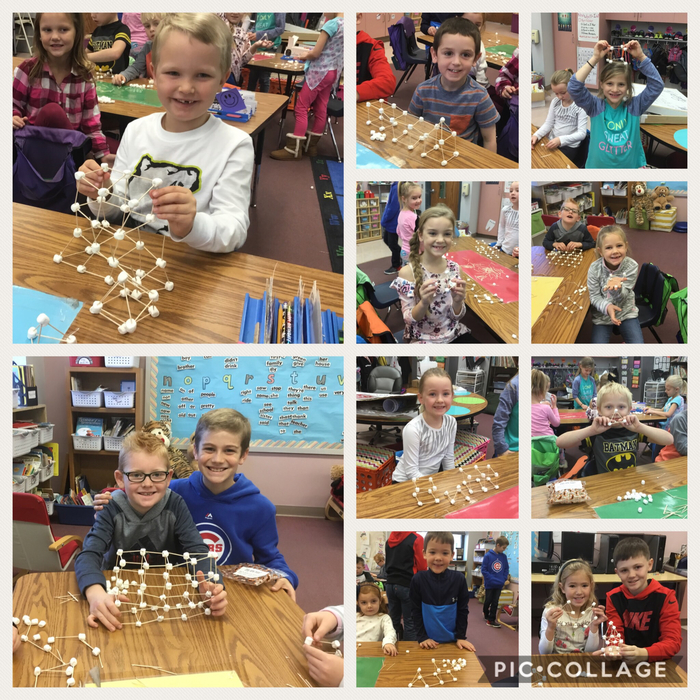 Today, we used marshmallows and toothpicks to make our own 3D shapes. Make sure you come out for Family Reading Night Thursday evening from 6-7 at the Elementary School. 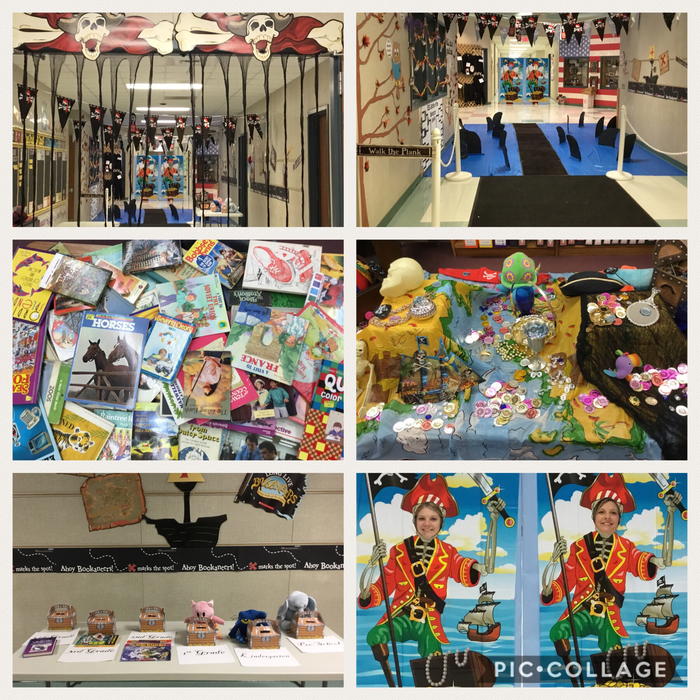 Our teachers have been working hard to put together a lot of fun activities to prove that the book is better than the movie! 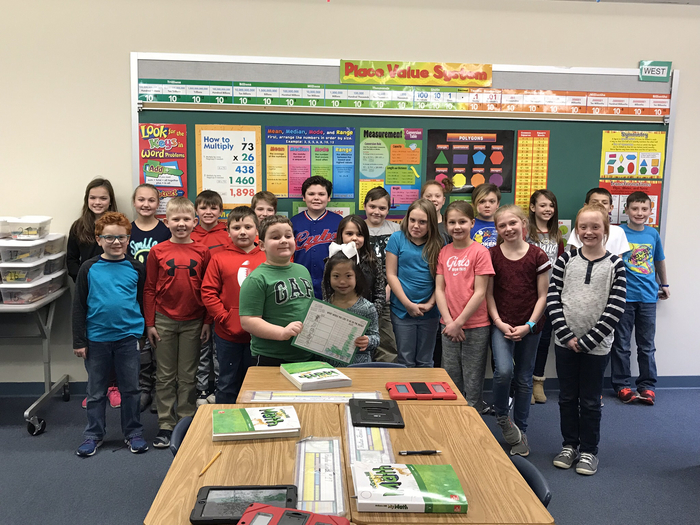 At Sullivan Elementary School, staff recognize students who go above and beyond expectations by giving them a "Gold Slip." 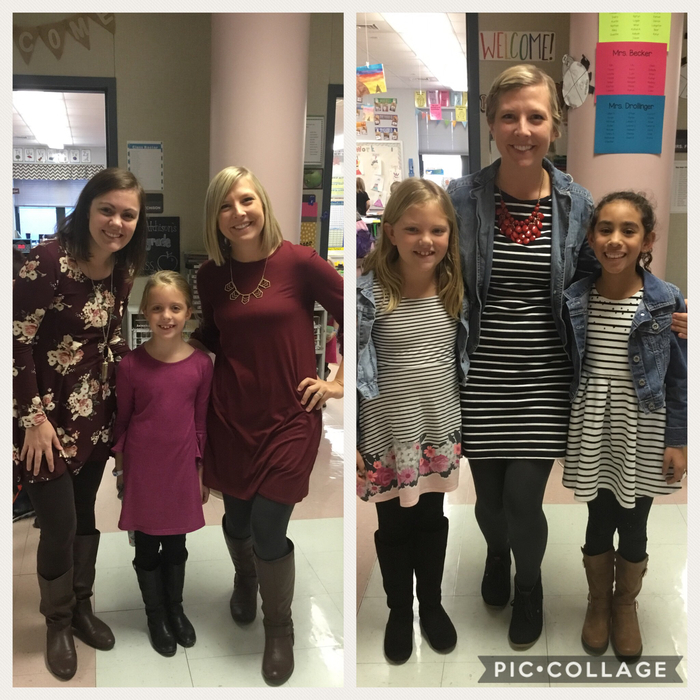 Gold Slip winners from the month of October are pictured. 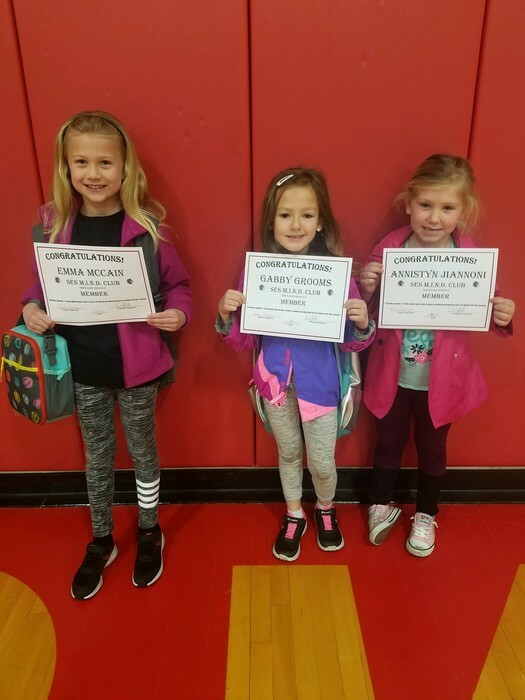 From left to right they are: Addison Hullum stayed after lunch to clean up someone else's ketchup spill to keep the cafeteria safe and clean. Elijah Dalbey noticed that a few students were sitting on the side at recess not playing. He kindly invited each student to play ball tag with him and his other friends. 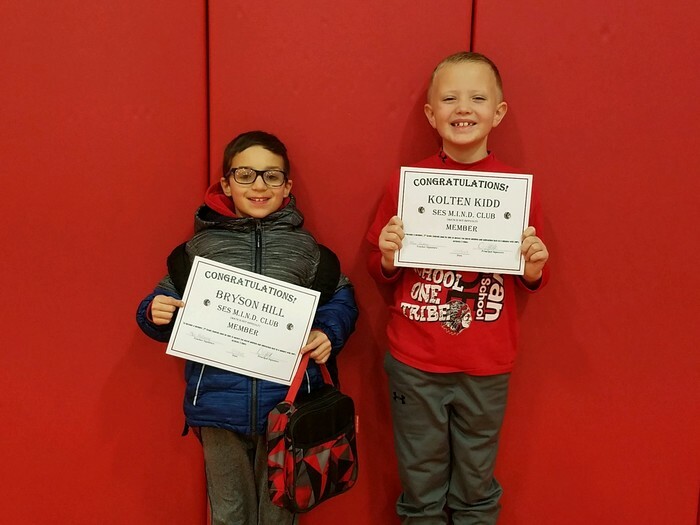 Donovan Collins and Brady Beck volunteered to write an extra Veteran's Day invitation, willingly giving up their recess to do so. 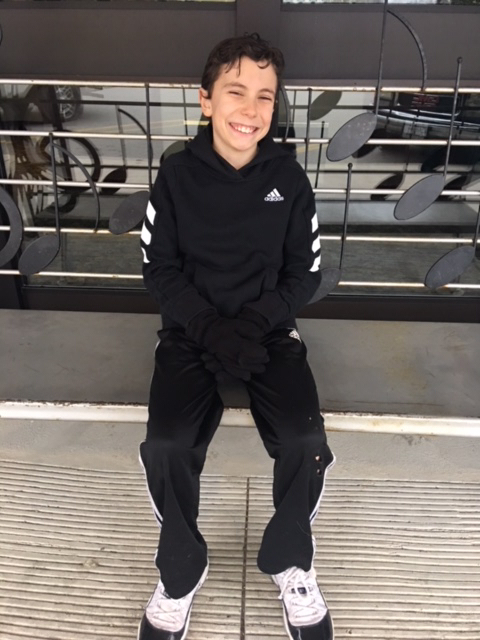 Issac Reider volunteered to give his jacket to a classmate that was very cold in their classroom. Such caring and responsible acts are what make SES a great place to be! 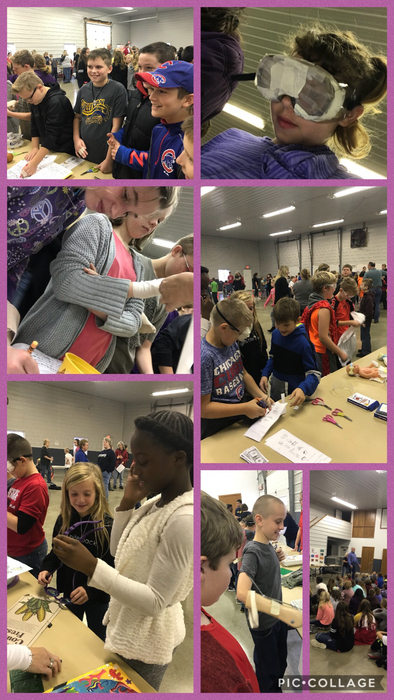 5th grade is live in action at Ag Safety Day at the Otto Center in Arthur! They had to test their reaction speed and now they are performing every day tasks with a disability simulation (loss of a finger, arm, leg, etc.) They are understanding the importance of being safe in their environment! 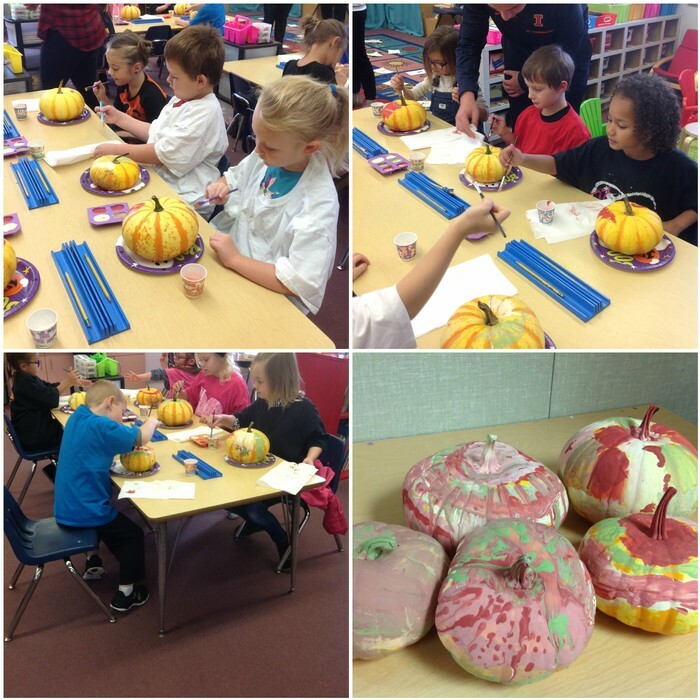 Mrs. VanDeursen's kindergarten class won the PTO's Box Top competition and got to decorate these pumpkins from Buxton's Garden Farm using paint from ACE Hardware! 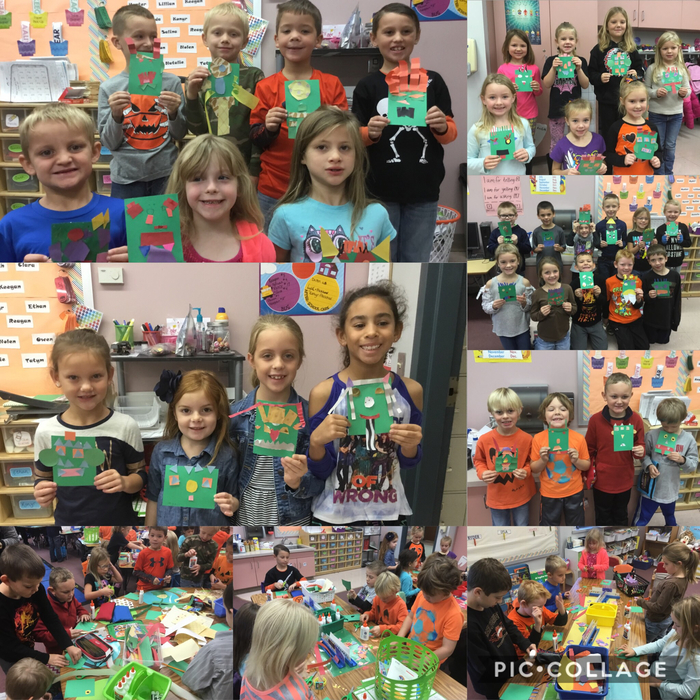 First grade RTI groups have been learning all about shapes so, in the spirit of Halloween, Mrs. Drollinger and Mrs. Becker’s RTI groups listened to the story “ Go Away Big Green Monster.” After the story, they made their own big green monsters out of shapes! Tomorrow evening, from 6 to 7, is the PTO Monster Mash sock hop in the ES gym. Bring your elementary students out and watch all the boils and ghouls dance the night away. Parents must remain present with there children throughout the dance. First grade had been working hard on learning our short vowel sounds. The students had a great time playing Race to the Pond while reading short vowel words. First grade has been learning all about insects. 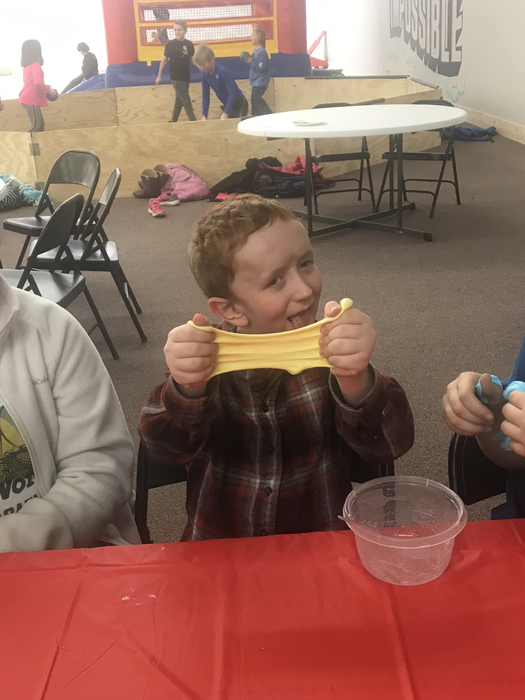 The students learned how to eat and see like an insect, made their own insect, and recreated the insect life cycle with pasta thanks to Erica Lehman, Verna Tice, and Sue Yarnell. 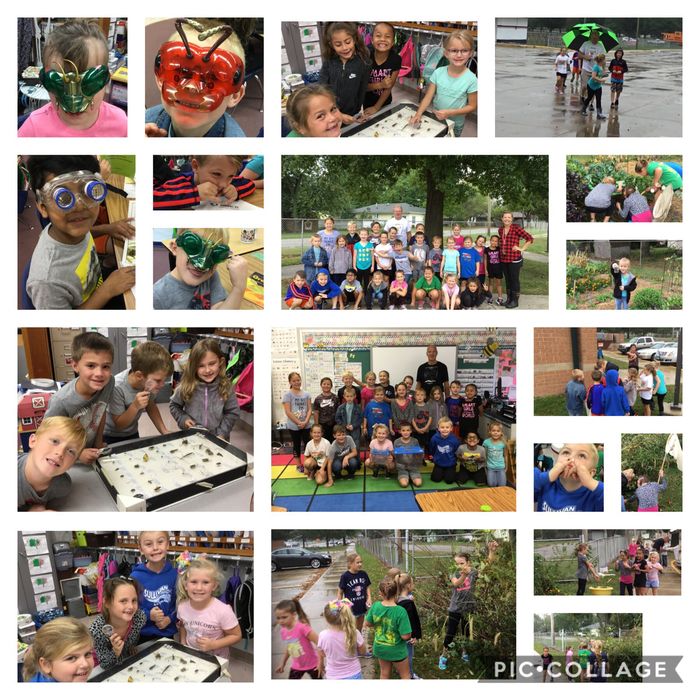 Then, with the help of Jim Palmer and Dave VanDeursen, the students were able to explore and look at insects in their natural habitat. They were excited to catch and observe the different insects we found ! This week during Library class, students in 2nd grade learn how to find a “Just Right Book.” Mrs. Fleming read Goldisocks and the Three Libearians. The book portrays the bears as "libearians" and Goldie Socks finds just the right book and the perfect place to read it. Students then practiced the 5 finger rule to find a just right book. The Sullivan PTO is looking for a few people to help with fundraiser distribution tomorrow (Wednesday, October 11) at the elementary school (you do not need to be a member of the PTO. Times we need your help are 12:30-3 and 3-5:30. If you can help during those times, or if you’re available part of the time please send the Sullivan Elementary School PTO a message on Facebook. Thank you in advance! 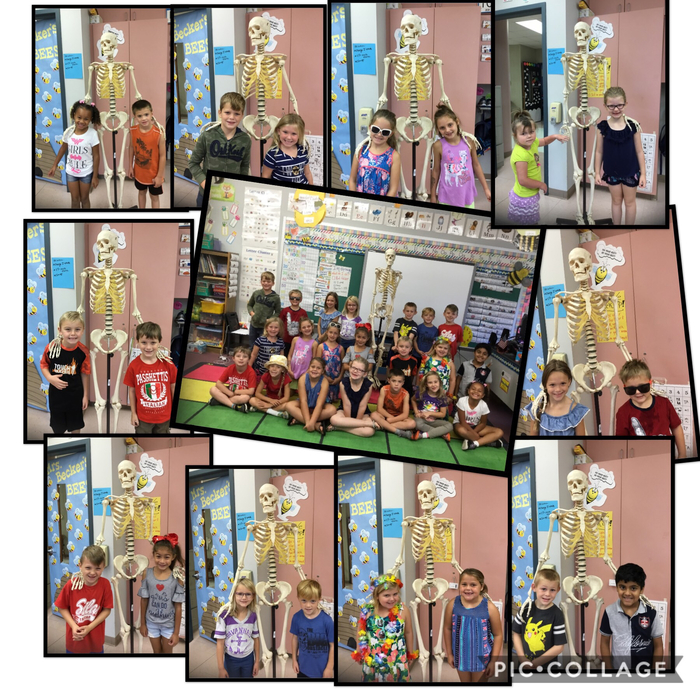 First grade has been learning all about the human body. 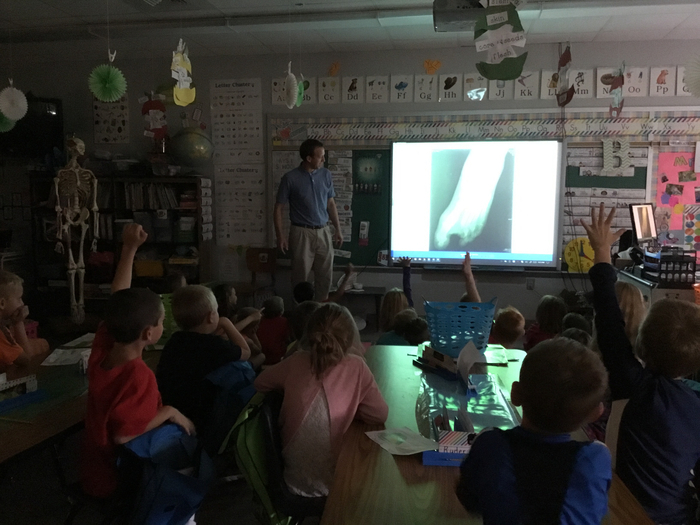 We were excited to have Doctor Florey come and show us some x-rays. The students were excited to idendify the bones they have learned about! 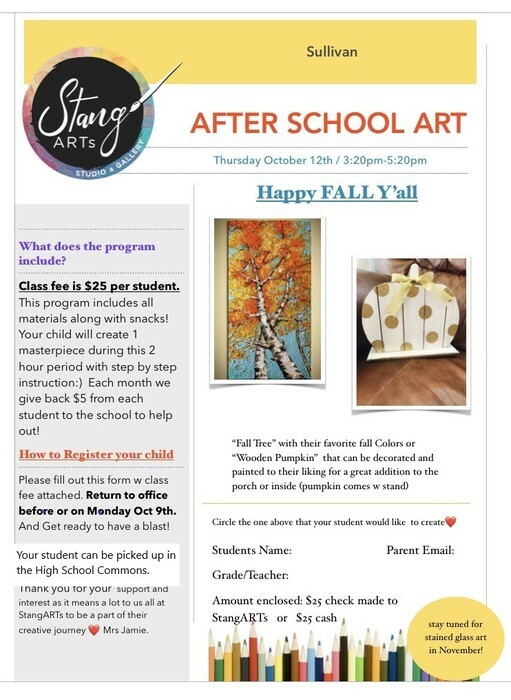 Here is the waiver for the after school art program that will take place on Thursday, October 12th. Students will be taken directly from school to the High School commons where they can be picked up at 5:20. Simply fill out this form and send it to school with the $25 fee by October 10 for your student to participate. This is a great opportunity for any student with an interest in art! The upcoming Honor Flight from Springfield to Washington DC has an old family friend of Mr. Campbell's on it, Ron Fairley! Mr. Fairley is a Korean War veteran. 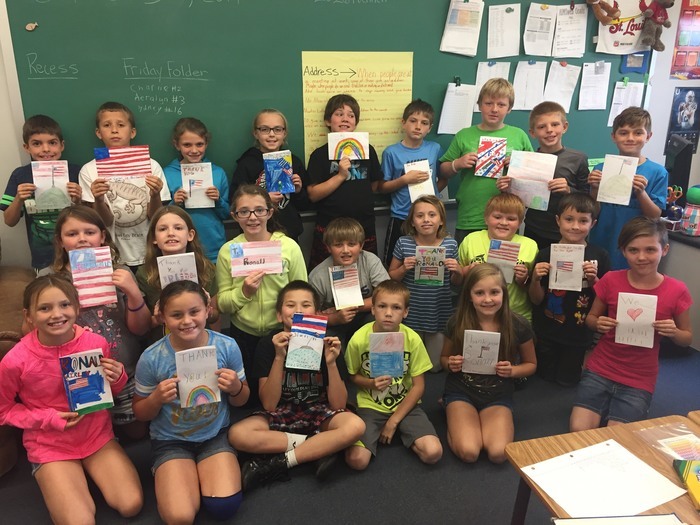 Our class spent some time discussing the flight’s purpose as well the importance of supporting our veterans and our nation! Today we mailed Mr. Fairley individual cards of appreciation and gratitude while wishing him peaceful and pleasant trip! 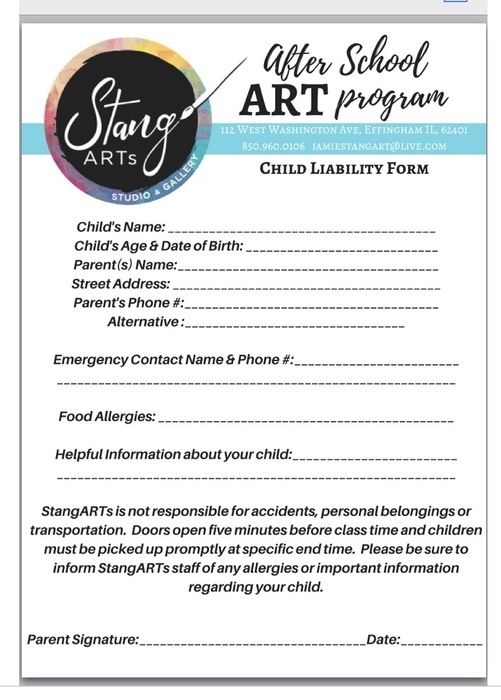 Have an elementary student that is interested in art? There will be an after school art class that will be conducted in the high school commons on October 12. Cost is $25. Please see the attachment for more details and check your students' folders for the flyer. Our Cardboard Challenge is underway. 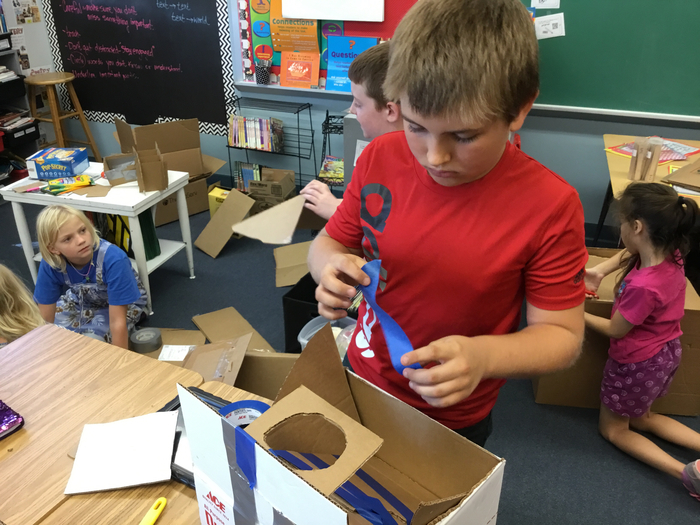 Students are excited to create Arcade Games using cardboard and other recycled materials. Sullivan Children's Choir is seeking an accompanist for the 2017-2018 school year. 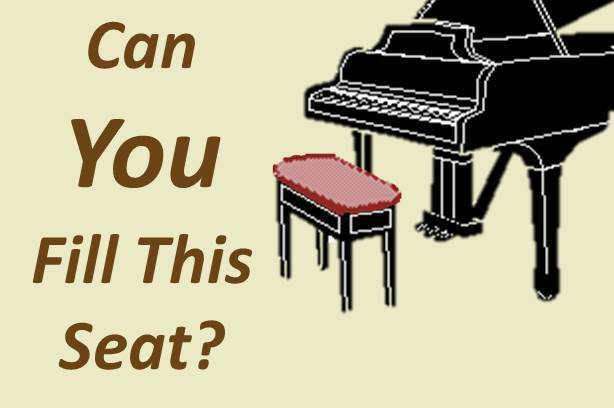 Pianist would need to be able to start immediately on Tuesdays, Wednesdays and Thursdays from 3:00-3:45 each day. In addition to the above, pianist would need to be able to attend special events that the Choir will be performing in. Some include Veteran's Day, Christmas concert, Singers invitational, an evening basketball game, spring concert etc. Please contact Mrs. Haegen (haegenm@sullivan.k12.il.us) or Mr. Allen (allend@sullivan.k12.il.us) with any questions. 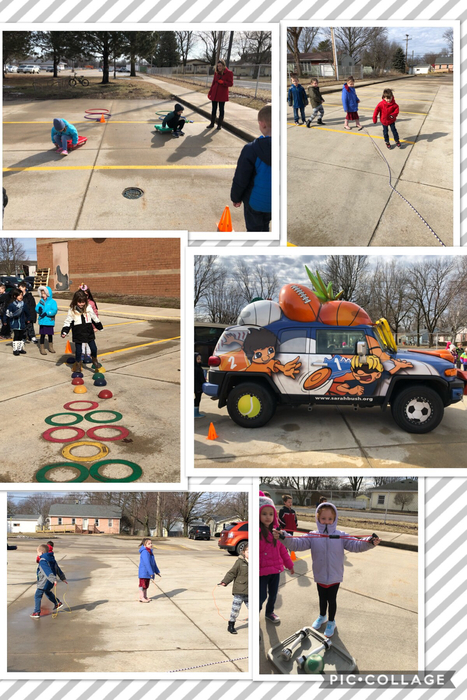 At Hawaiian Day at SES students had to land frisbees in hula hoops, did a Hawaiian dress up relay, played the classic tug of war, then finished with "Rolling Stones," where they rolled coconuts as close to the cones as possible. 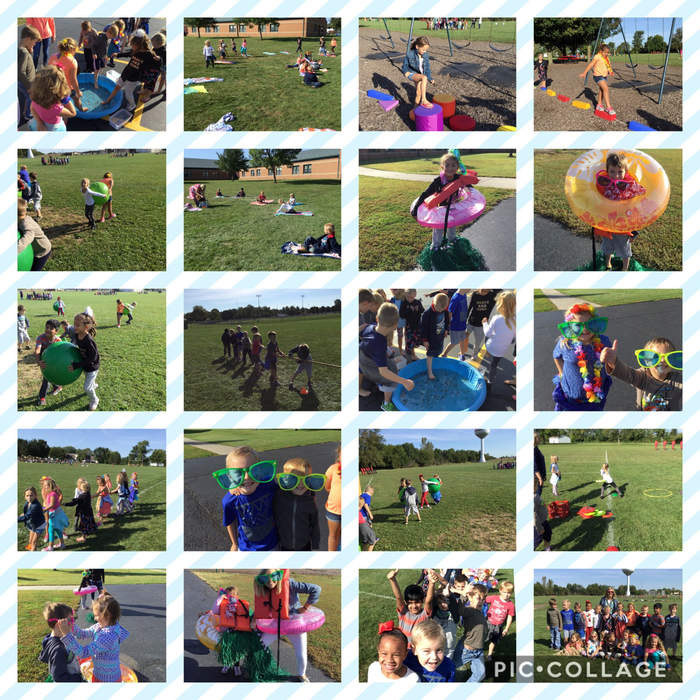 At the Hawaiian Day celebration at SES students did a beach ball relay where they had to carry a ball around cones and the goal posts with a partner using no hands. Next they played a game of bags. Then came pass the water where students had to dump water from their glass over their head into another student's cup behind them. Then came "Flamingo Ring Toss." A great time was had at the Hawaiian Day Good Behavior Celebration at SES today. 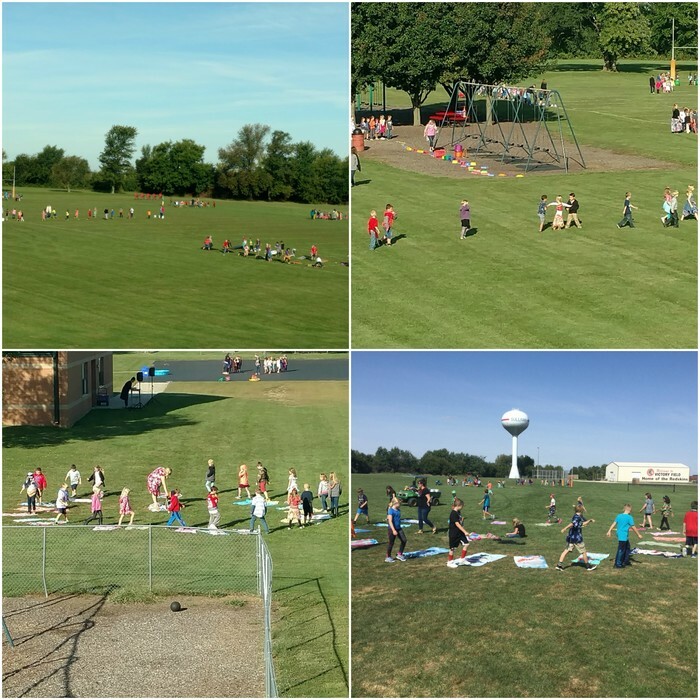 Here you see students doing the limbo, crossing "hot lava," finding marbles in the sand with their toes, and playing musical towels. 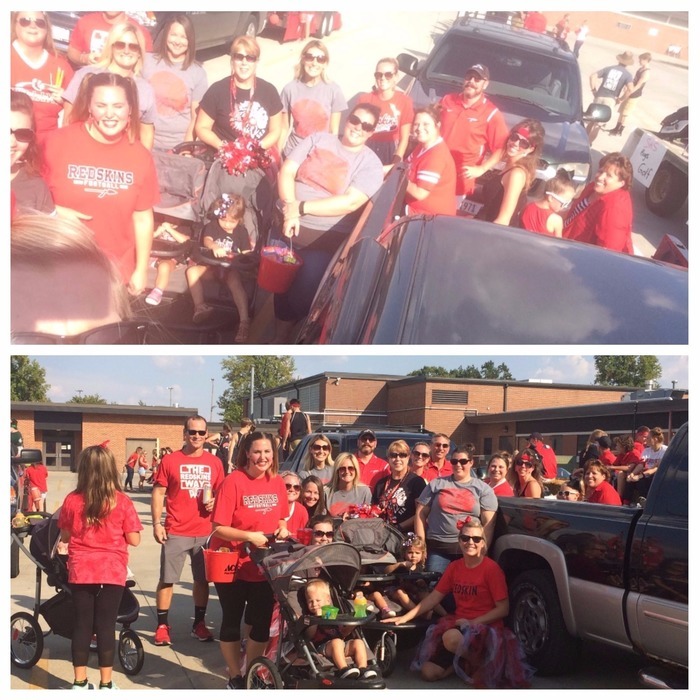 Teachers showed their school spirit while marching in the Homecoming parade! Here are the dress up days for the elementary school next week (Homecoming). *please note, these are different from the high school! Parents of Sullivan Elementary Students, we want to again cordially invite you to attend the family assembly featuring Daniel Lusk. It will be at 6 p.m. on Tuesday, September 19 in the high school gym. 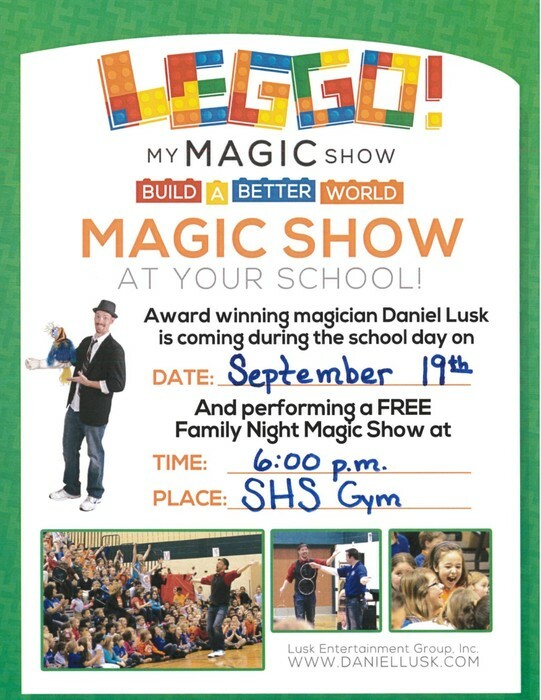 THE SHOW IS FOR SULLIVAN ELEMENTARY SCHOOL STUDENTS AND THEIR FAMILIES ONLY. We look forward to seeing you there! 4th Grade students are using QR codes to check math problems. 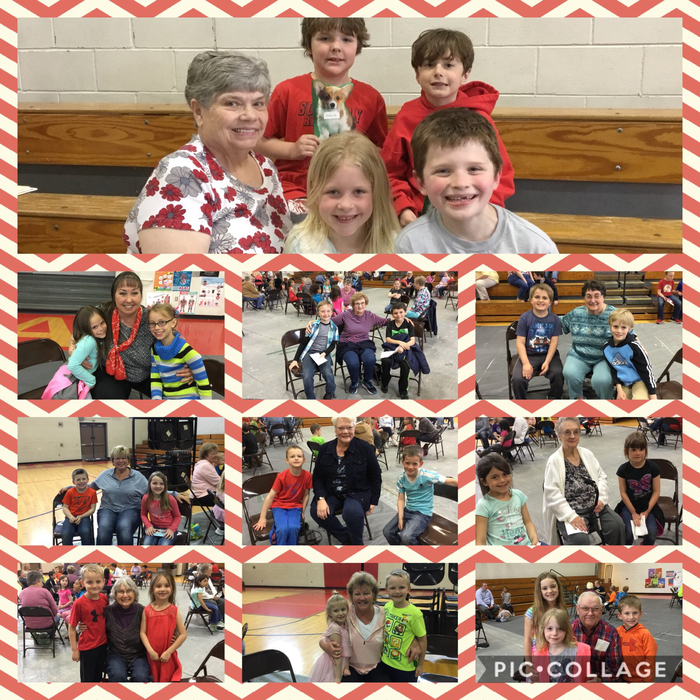 Grandparents Night is this Thursday from 6 to 7 pm at Sullivan Elementary School. This open house is always a wonderful event! Don't forget that this Thursday there will be a book fair at Sullivan Elementary School from 3 pm to 7 pm. A portion of the proceeds will be donated to a school library that was damaged by Hurricane Harvey. We hope to see you here! 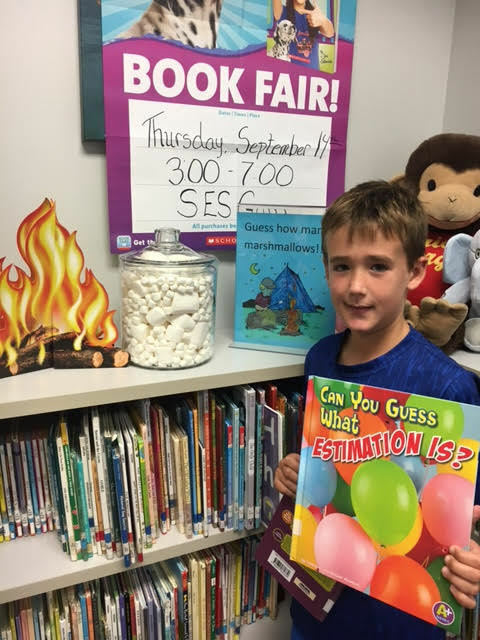 Fourth grader, Liam Donovan, wants to increase his chances of winning the marshmallow guessing game so he checked out this book. He's excited about the book fair, are you?? 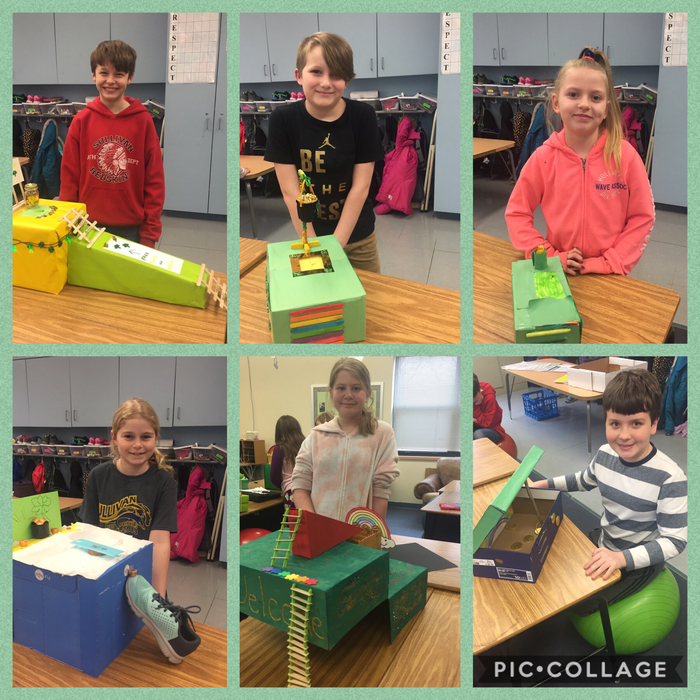 Mrs. Grohler's class just completed a thematic unit about pigs. They read many books about pigs, and used the information they learned in their writings. Overall, If You Give a Pig a Pancake was the students' favorite. The unit concluded with following a recipe to make pancakes for themselves. This picture is two-thirds of an amazing team of people who help make sure children are getting safely in their parents' cars after school. 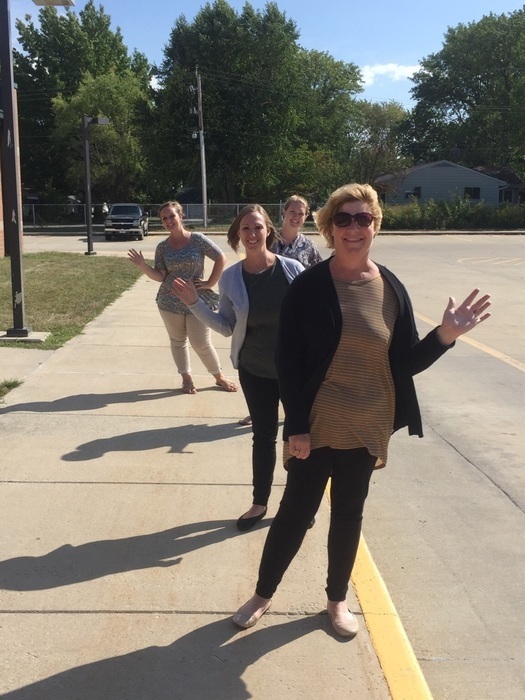 Not only do Mrs. Martin, Ms. Jancauskas, Mrs. Donovan, and Mrs. Bragg get the students to the cars safely (with the help of Mrs. Austin and Mrs. Graham who are not pictured), they also use this time as an opportunity to talk with the students and ask them about their day. They help make students leave school knowing they are genuinely cared for. Great job ladies!!! Looking for a challenging and rewarding job working with children? Come work in a friendly, fun, and positive environment. Sullivan Elementary School is looking for an RtI Aide. This position entails working with students in both small group and one-on-one settings. If you love children, want to help make a positive change, and are a hard worker, this is the job for you. To apply, please mail or email a letter of application, resume, and 3 letters of recommendation by September 12th to Mr. Daniel Allen (allend@sullivan.k12.il.us), 910 N. Graham St., Sullivan, IL 61951. 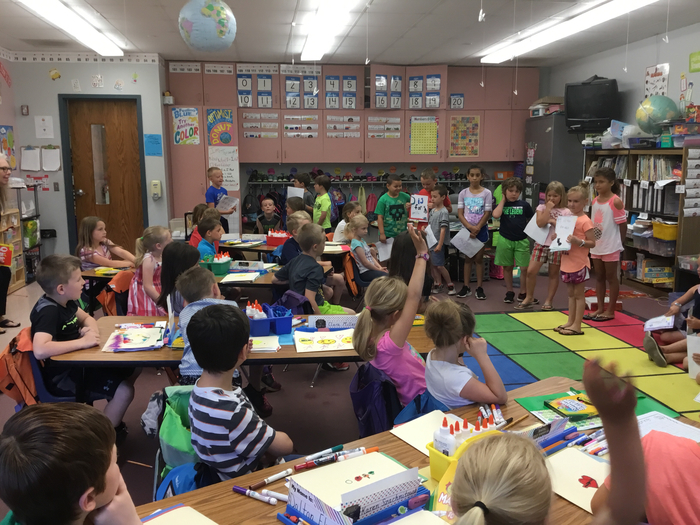 Students in Mrs. Haegen's 2nd grade class have been studying folktales during the first three weeks of school. 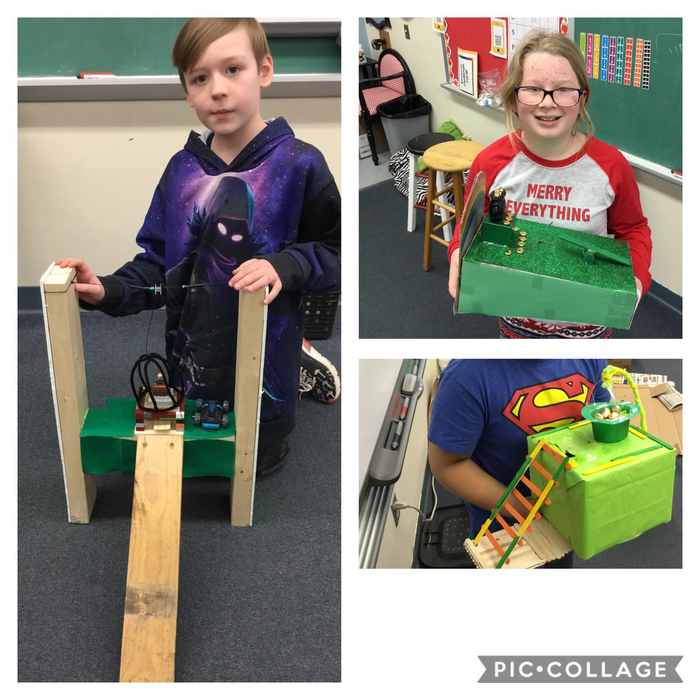 Today they got to use their hands to create a wagon for Paul Bunyan to carry his heavy knapsack and a conveyor belt that can haul rocks out of John Henry's way! Students in Ms. Heddins 5th grade class have been studying Growth Mindset vs. Fixed Mindset. 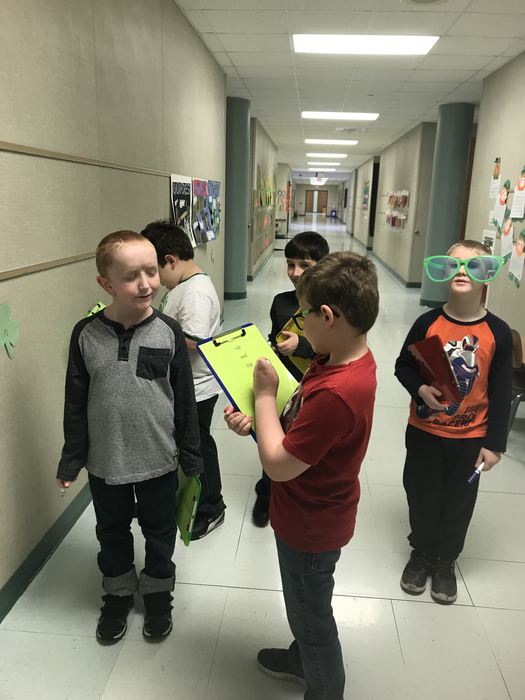 Students have developed skits in their groups to demonstrate what it means to have a growth mindset and to not give up when challenges get hard! They used different parts of the playground to come up with challenges and used their iPads to record the skits! 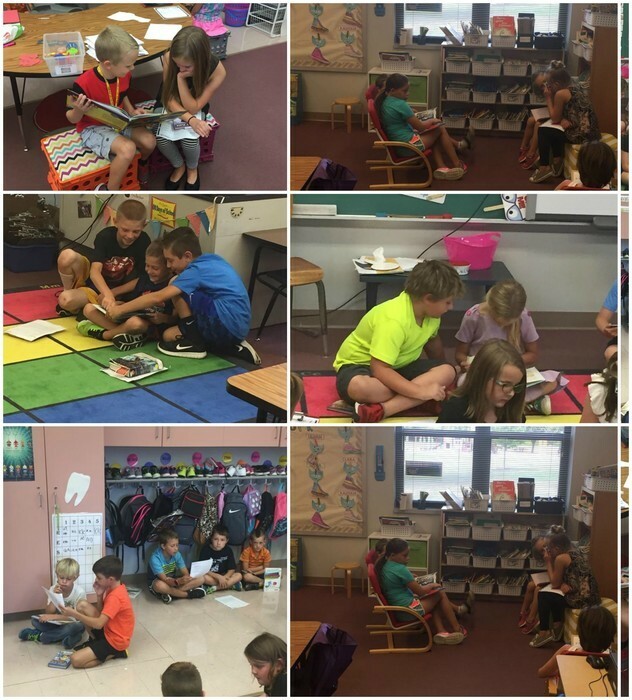 Mr. Campbell's class went down to Mrs. Becker's class to partner read. Her students choose books to read to his students and his students brought down their fluency paper they've been working on to read to Mrs. Becker's friends. We plan to continue this at least once a week. Today Mrs. Watkins' class jumped into hands-on math centers. They were having so much fun playing; they forgot they were working! 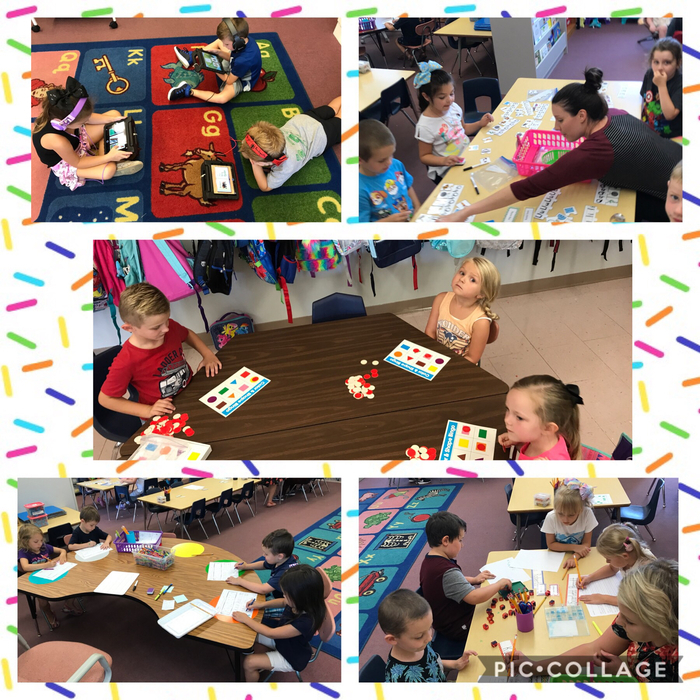 Centers included: addition and subtraction dice, Ice Cream Addition Game, creating their own addition and subtraction fact puzzles, and addition/subtraction games on the learning palette. PARENT NIGHT AT SES TONIGHT!!! 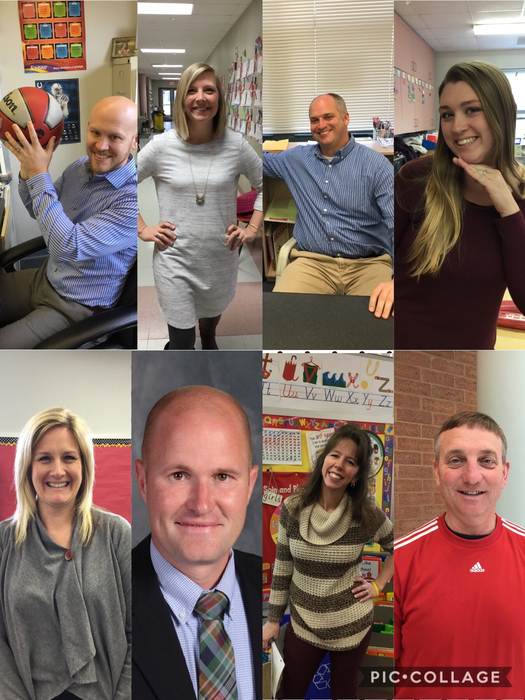 Come meet your students' teachers and see what they will be doing in their classrooms. Starts at 6 pm in the elementary school gym. Due to a late delivery time from our food truck, an adjustment has been made to the menu at the elementary school. We have swapped this Thursday and Friday's second choices around so B choice on Thursday will be grilled ham and cheese and Friday's B choice will be Taco Wedges...yum!!! The online menu on the school website has been adjusted to reflect these changes. Mrs. Fleming put together this great looking bulletin board to honor our Gold Slip winners. When teachers see a student going above and beyond expectations they write the student's name and what they did on a "gold slip" and it gets placed on this display. 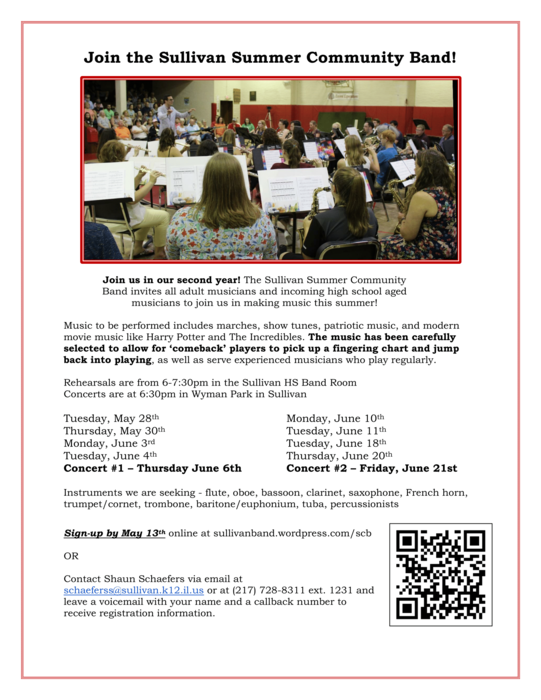 Students also get their picture placed in the News Progress and district newsletter. 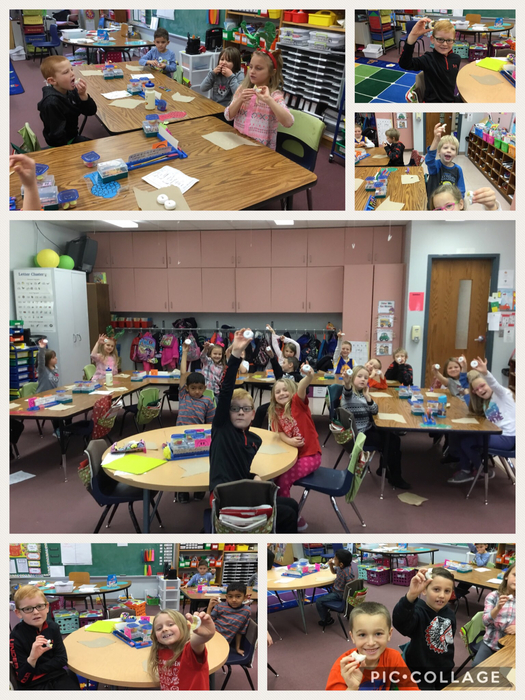 After reading, Too Much Glue, Mrs. Becker's class was excited to practice using our glue. We used one dot of glue to attach colorful paper to spell our names ! They will all remember, " dot, dot, not a lot "! Quick reminder: If you signed up for classroom supplies with the PTO, they will need to be picked up between 4 and 6 pm in the Elementary School Lobby on Monday, August 14th. 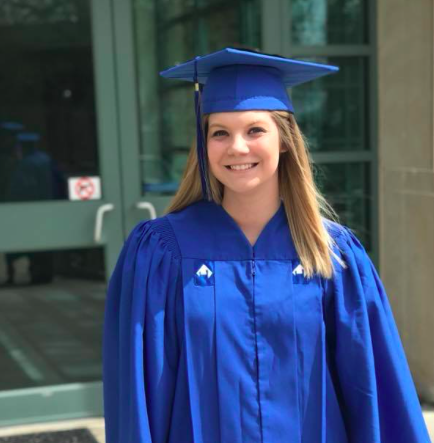 Name: Kay Lehman Grade Level: Fourth Years of experience: 13 Hometown: Mattoon, Illinois Favorite band: Eagles, Alabama, and Little Big Town Favorite movie: Gone with the Wind Favorite sports teams: Reigning World Series Champs Chicago Cubs!! Chicago Bears! Favorite color: purple and orange Favorite subject: Reading Favorite teaching memory: Every time a former student sends me a note or comes back to visit me and tells me how much they loved being in my class in the fourth grade and how being in my class made them want to come to school each day. I love teaching because... there is no better feeling than when you see that lightbulb go on in a child's head when they " get it ". Their "aha" moment! What I want most for my students is... to love coming to school, feel safe, have fun, and to learn and retain something new everyday that will help them later in life. 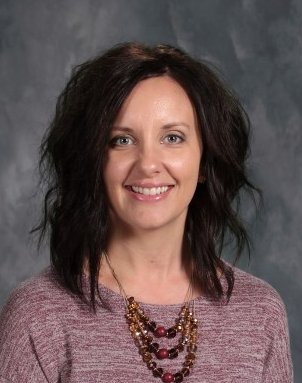 Name: Mrs. Watkins Grade Level: 2 Years of experience: 3 Hometown: Forsyth Favorite band: Goo Goo Dolls Favorite movie: Matilda Favorite sports teams: STL Cardinals & Green Bay Packers Favorite color: blue Favorite subject: math I love teaching because I enjoy sharing my love for learning with others. What I want most for my students is for them to love learning and be excited to come to school each day. Name: Shaun Schaefers Grade Level: General Music (K-2) Hometown: Aurora, IL Favorite band/group: Phantom Planet; Chicago Symphony Orchestra Favorite movie: Kicking & Screaming Favorite sports teams: Chicago Blackhawks Favorite subject: Music! I love teaching because... I get to help students learn how to do create art they might not have thought they were capable of. What I want most for my students is... to have a love for music and the arts. 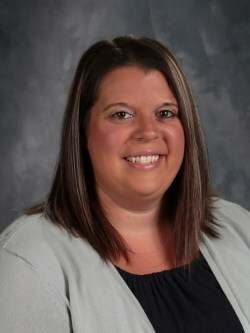 Name: Jessica Reeder Grade Level: Assistant Principal and School Psychologist Years of experience: 7 years Hometown: Flora, Illinois Favorite band: Celine Dion Favorite movie: Dirty Dancing Favorite sports teams: Fighting Illini Favorite colors: Black and Hot Pink Favorite subject: Math What I want most for the students of Sullivan Schools is to be excited to come to school everyday and to feel like a contributing member of a larger community! Name: Cindy Tarr Reading Aide/Title 1 Aide Grade Level:K-5 Years of experience: 7 Hometown: Sullivan Favorite music: Christian Favorite sports teams: Cardinals Favorite color: Blue Favorite subject: Math Favorite teaching memory: My favorite memory is working as a classroom aide in Mrs. Sinkler's kindergarten room my first year at SES. She taught me that it goes beyond teaching the material. It's about making a personal connection with the students. I love teaching because... I have the privilege of working with K-5 grade students. I love the range, I love the challenge, and I love the kids. What I want most for the students I work with is... to feel success, to feel confident, and to feel accepted. Name: Whitney Smith Job: Reading Aide Grade Level: K-5th Years of experience: 3 years Hometown: Lovington Favorite type of music: Country Favorite kid movie: Beauty & the Beast Favorite sports teams: Green Bay Packers & St. Louis Cardinals Favorite color: Blue Favorite subject: Reading Favorite memory of working at the school: Anytime I get to hear new readers reading! I love working at the school because I get to work with students everyday and assist them on their educational journeys. What I want most for the students I work with is for them to succeed. Ann Sanner Office Secretary 30 years Hometown, Sullivan Favorite band: The Doobie Brothers I'm embarrassed that I'm a terrible sports fan, but of course I'll say I'm a Cardinals fan out of loyalty to my boss Favorite color: Red Favorite school memory: Hard to choose just one, but I'll never forget the child who came to school with something in her backpack that she wanted to turn in to the office. I expected a note from her mom, but when she pulled out a dead bunny that she had found on her walk to school, that was a first! I love Sullivan Elementary because it's filled with 500+ creative young minds who are making our world a better place! 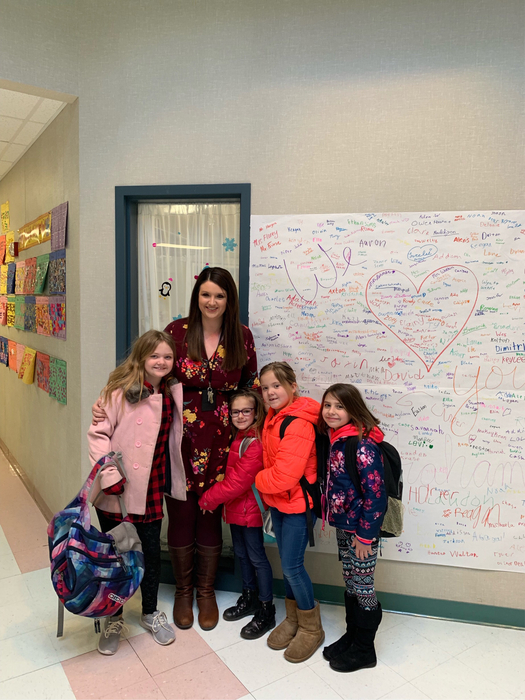 What I want most for our students and families: To know that the Elementary Office is a place that connects school and home. For parents to know that their children will be cared for and safe and that we are here to offer our help in making their child's school experience the best it can be! 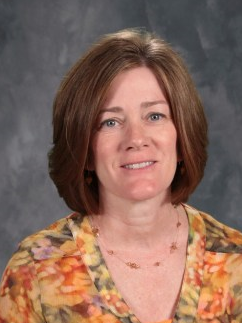 Name: Erin Donovan Grade level : aide for all grades Years experience : 1. Hometown : Yorkville IL. Education: Illinois State University (class of 2002) Favorite band: Fleetwood Mac. Favorite Movie : Harry Potter and the Half Blood Prince Favorite sports team: Cubs. Favorite color : blue. Favorite subject : history. Favorite memory : Watching chickens hatch with Mrs. Boyers class. I love being an Aide because I get to know students at all grade levels and seeing kids that have struggled be successful. What I want most for my students is for them to have confidence in themselves and respect for others. Name: Leah Fleming Grade Level: Librarian Years of experience: 3 years Librarian, 5 years total with the District Hometown: Effingham Favorite band: Paul Simon Favorite movie: Elf Favorite sports teams: St. Louis Cardinals Favorite color: Blue Favorite subject: I may be a librarian, but my favorite subject is math! Favorite librarian memory: Watching kids reactions to the books I read to them. 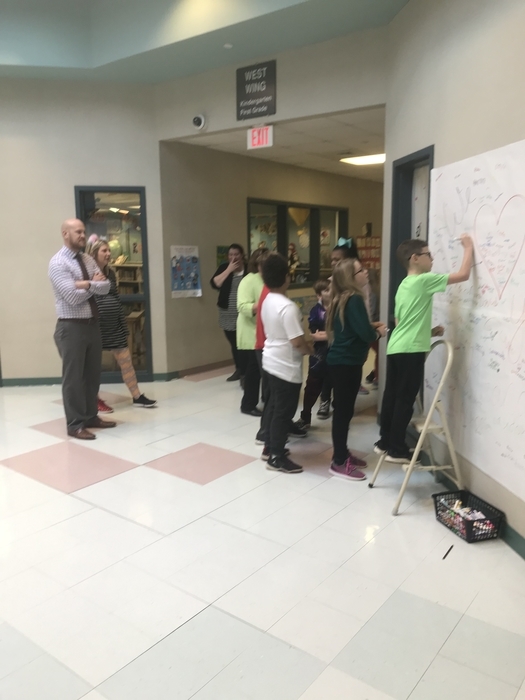 I love being a librarian because, I get to interact with all 500 + students, work with some really awesome teachers and staff, and it gives me a creative outlet. Oh and books! Lots and lots of fun books! 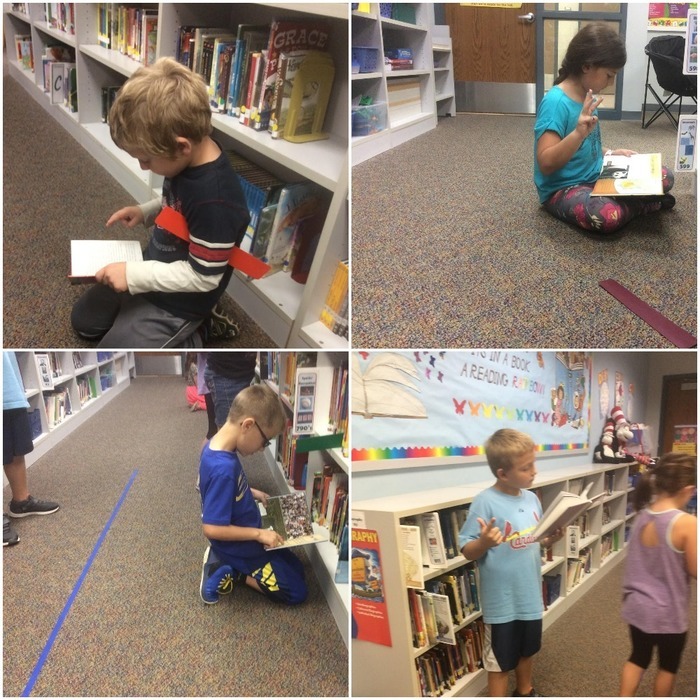 What I want most for my students is for them to leave the library excited to read the books they just independently picked out. Name: Chris Wilson Grade Level: 3-12 Music/Chorus Years of Experience: 7 Hometown: Birmingham, AL Favorite Band: too many I like equally Favorite Movie: Miracle, When The Game Stands Tall Favorite Sports Teams: Atlanta Braves, Chicago Cubs (no, I am not a "fair weather/bandwagon" fan), Denver Broncos, and anything Auburn University Favorite Color: Navy Blue Favorite subject: Besides music/show choir? Probably math. Favorite teaching memory: FAME Branson in 2015. We got first runner-up and qualified for Nationals. You would've thought we won that day. I love teaching because it gives me the opportunity to encourage and inspire students. It has always been a calling to encourage others, and this is the perfect way to answer that calling. I used to be a performer, and the only thing I love better than performing is watching my students love and enjoy what I do as well. What I want most for my students is to use music to allow them to grow up as better students and better people. I want them graduating knowing that music/show choir is what prepared them for life the most. Anne Osthoff: BS from St. Louis u, St. Louis, mo MS from Radford University, Radford, VA I like: The color yellow St. Louis Cardinals Zach brown band Chocolate ice cream This will be the start of my 17th year at SES. 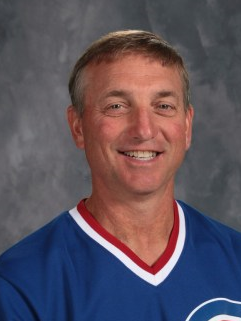 Don Typer k-5 Physical Education 24 years of experience Hometown: Polo, Illinois College: Eastern Illinois University Favorite Band: Eagles Favorite Movie: Man From Snowy River, The Quick and the Dead (Sam Elliott version) Favorite Sports teams: CUBS!! !, Bears, Bulls, Blackhawks Favorite Color: Red Favorite Subject: Physical Education, duh! Favorite Teaching Memory: While singing with the music in the gym, my 3rd grade girls told me I should never try to be a singer. What I want most for my students is: To learn to live a healthy lifestyle, now and into the future. Name: Rikki Ray Grade Level: Elementary K-5 Years of experience: 22 years Hometown: Sullivan Favorite band: Aerosmith Favorite movie: Rocky Favorite sports teams: Cowboys Favorite color: Blue Favorite subject: Reading Favorite teaching memory: Starting a community-wide reading program at the suggestion of a student. I love teaching because... I get to make connections/relationships with kids of all ages. What I want most for my students is...to LOVE reading! Name: Haley Seeley Grade Level: Early Childhood Years of experience: 17 years Hometown: Bethany, IL Favorite band: I love music! Too hard to choose just one! 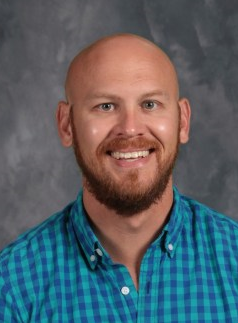 Favorite movie: Home Alone Favorite sports teams: U of I; St. Louis Cardinals; Chicago Bears Favorite color: Green Favorite subject: Reading and Social Studies Favorite teaching memory: I absolutely love seeing former students years after I have had them in class. I always want to hear how they are doing in school, how their families are doing, what they have been up to, etc. I love teaching because... I love spending time with kids! What I want most for my students is... to look back at their time in school and remember it as being one of the best parts of their lives. 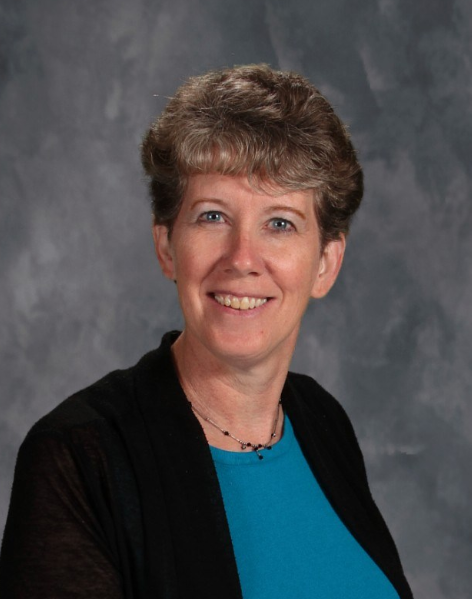 Leslie Guyot Resource Teacher Grades 1-5 17 years of experience Graduate of Illinois State University and Eastern Illinois University Bethany, Illinois Green Day The Great Outdoors Chicago Bears Blue Reading I have so many teaching memories that I love. The smiles, hugs, and laughter from kids just being kids. I love teaching because of that "light" that students get when they finally figure out something that has been difficult to comprehend or grasp. They find comfort and joy in knowing that they can accomplish something that has been a challenge, and continue to work to overcome obstacles. I want my students to love school, to feel supported and safe at school, and to work hard to accomplish their goals so they may have a bright future. 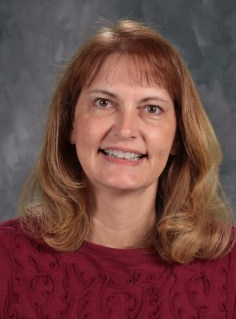 Name: Christine Grohler Grade Level: K-5 Cross Categorical Special Ed. 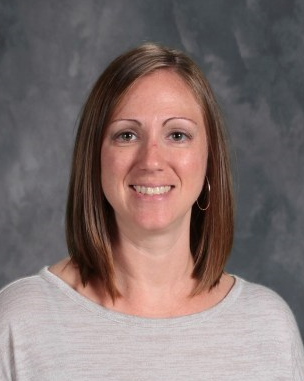 Years of experience: 27 Hometown: Sullivan Favorite Singer: Adele Favorite movie: Breakfast Club Favorite sports teams: Favorite color: Blue Favorite subject: Reading Favorite teaching memory: I love teaching because... I love children and I love helping others. What I want most for my students is...for them to love themselves. 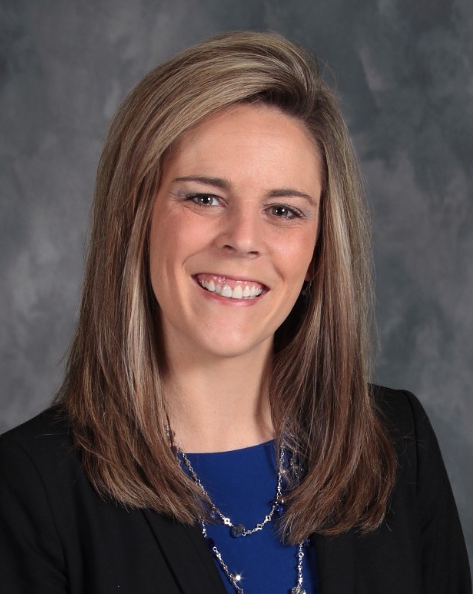 Name: Ashlee Florey Grade Level: Resource K-2 Degree: Bachelors of Science from Eastern Illinois University Years of experience: 8 years Hometown: Sullivan Favorite band: NEEDTOBREATHE Favorite movie: Step Brothers Favorite sports teams: Dallas Cowboys Favorite color: Orange Favorite subject: Reading I love teaching because I enjoy building relationships with students, and seeing their progress! 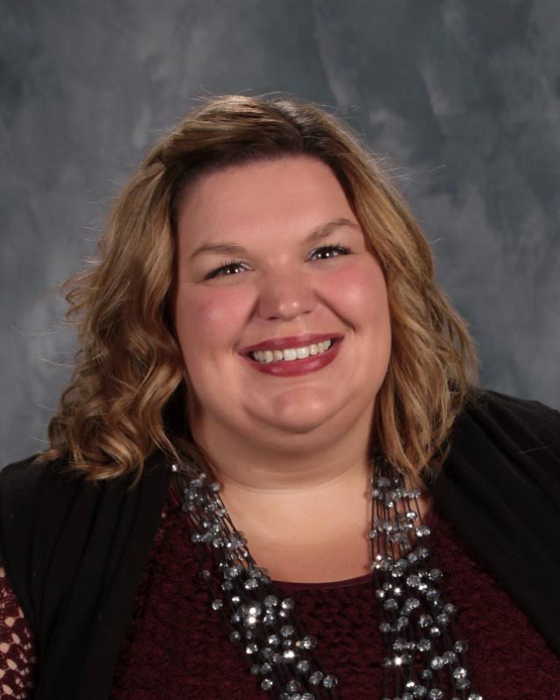 Poppy Ann Graham School Social Worker Years of Experience: 21 Bachelors Degree: University of Illinois @ Urbana-Champaign Psychology, Liberal Arts, Sciences Certificate in Mental Health Workers Program Masters Degree: University of Illinois @ Urbana-Champaign. 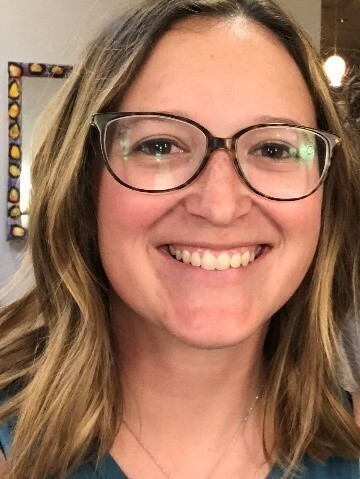 School Social Work Program Hometown: Humboldt, IL Favorite Band: The Monkees Favorite Movie: Mary Poppins Favorite Sports Team: Sullivan Blue Dolphins Favorite Color: Blue Favorite Subject: History Favorite Social Work Moment: Being the good in someone's life. I love school social work because I love kids! What I want most is to empower kids and families to make positive change. 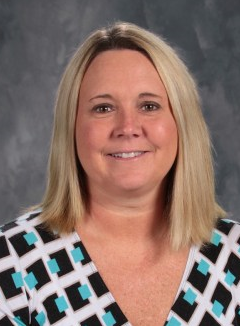 Name: Cindy Yoder Grade Level: 5 Years of experience: 2 Hometown: Arthur Favorite Book: Harry Potter Favorite movie: Ferris Bueller's Day Off Favorite sports teams: St. Louis Cardinals Favorite color: Grey Favorite subject: Reading Favorite teaching memory: During my first year of teaching I learned something new from my students every day! I love teaching because... Everyday is an adventure! What I want most for my students is... 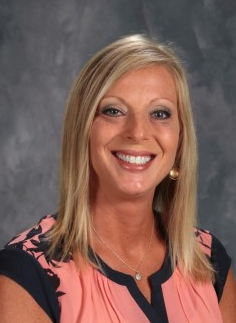 I want my students to always be happy, confident, and kind, and to know how much everyone at SES cares for them. 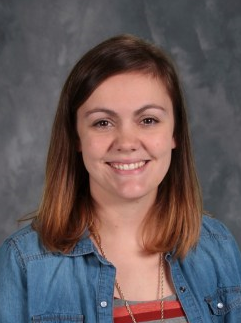 Name: Allie Wright Grade Level: 5th Years of experience: First year teacher! College: Illinois State University Hometown: Mattoon, IL Favorite artist: Thomas Rhett Favorite movie: The Blind Side Favorite sports teams: Cardinals Favorite color: Black Favorite subject: Math Favorite teaching memory: I'm new to this, but I would say my favorite teaching memory was leaving the 3rd grade class that I student taught. Although it was extremely sad because I got so close to the students, getting to see them upset that I was leaving made me feel like I really left an impact on their lives. I love teaching because... of the relationships I can form with the children. It is amazing to watch them understand concepts and have those "light bulb" moments, but what I love most is getting to have nearly 30 ten year old best friends. What I want most for my students is... not only growth and development while in my classroom, but also to feel loved and appreciated every day. Name: Heather Wilson Grade Level: 5th Years of experience: 11 Hometown: Seneca Education: EIU Favorite band: Sugarland Favorite movie: The Holiday Favorite color: Purple Favorite subject: Social Studies Favorite teaching memory is having a student who disliked school and by the end of the year there was a complete change in attitude! I love teaching because everyday I learn something new from my students! What I want most for my students is to enjoy being a kid! Name: Micah Heddins Grade Level: 5th grade Years of experience: 8 years Hometown: Sullivan Favorite band: I love all different styles of music and artists Favorite movie: Remember the Titans Favorite sports teams: Chicago Cubs and Green Bay Packers Favorite color: purple Favorite subject: math and science Favorite teaching memory: one year we had a student move to our district who didn't know English very well, all of our 5th graders jumped in and made them feel very welcome and taught them English even quicker than I could - I love how helpful and thoughtful our kids are! I love teaching because building caring relationships with students lasts a lifetime and helping students feel successful in their learning is so important - every single child is capable of succeeding and it's so rewarding to watch that process happen! What I want most for my students is love the process of learning, feel comfortable in their environment, and learn skills that will help them succeed in their future! Name: Nichole Hendry Grade Level: 4th Years of experience: 8 years Hometown: Palmdale, CA Hobby: coaching the SBD Swim Team Favorite music genre: 90's Alternative Favorite movie: Anything funny Favorite color: Purple Favorite subject: Social Studies Favorite teaching memory: I love reading aloud Historical Fiction and watching students realize the books they are so in love with are events from our US history. I love teaching because...I get to meet and positively influence so many unique students. What I want most for my students is...for them to be confident that they can achieve their dreams with hard work and a desire for success! Kurt Friese 4th Grade Experience: 8 years Hometown: Strasburg Favorite Band: 3 Doors Down Favorite Movie: Any of the Fast and Furious Movies Favorite Sports Teams: Detroit Tigers, Philadelphia Eagles, Boston Celtics Favorite Color: Green Favorite Subject: Math I love teaching because everyday brings a new experience. What I want most for my students is that they want come to school and learn in my class. Name: Drew Campbell Grade Level: 4th grade Years of experience: 13 years Hometown: Oakland, IL Family: Haley, Tenley (6), Presley (4), and Khiry (2) Favorite band: Dave Matthews Band Favorite movie: Gladiator & Toy Story Favorite TV show: Game of Thrones Favorite sports teams: Indianapolis Colts, St Louis Cardinals, & Chicago Blackhawks Favorite color: Blue Favorite subject: Math Favorite teaching memory: My first year, on my first day, and with my first class. I'll never forget that day as I closed the door behind me with 22 pairs of eyeballs staring straight through me, while I nervously utter the words "Good morning, I'm Mr. Campbell your 4th grade teacher!" At that very moment, I'm not sure who was more terrified, the students or me! Needless to say, we all learned, laughed, and grew together! A snapshot I share with every class, every year! I love teaching because...I get to act like a kid! I get to be silly and goofy with the students, I get to eat lunch with them, or jump around the room when we need a brain break. But most of all, I get the privilege of watching them grow academically and mature into big, bad 5th graders! What I want most for my students is...growth, both in the classroom and outside of the classroom! I want them to become better readers and writers! I want them to explore and discover the joys of science and community! I want them to become confident and fluent with numbers! I want them to respect themselves and become more confident! I want them to be more considerate and thoughtful of others! I want them to challenge themselves to learn new things! I will provide them the resources, the support, and the avenues to find that growth! Let's GO! Name: Amber Saul Grade Level: 3rd grade Years of experience: 12 years Hometown: Oreana, IL Favorite band: Hmm.. 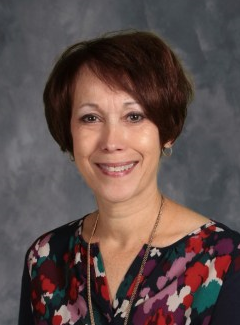 I like to listen to any live music Favorite movie: Pretty Woman Favorite sports teams: St. Louis Cardinals Favorite color: Yellow Favorite subject: Math Favorite teaching memory: Too many to name just one! I love teaching because... everyday is different! What I want most for my students is... to feel loved each and every day in our classroom! Name- Ashley Hussong Grade-2nd Years of Experience-13 years Hometown-Lovington Favorite Movie-Pitch Perfect and Elf Favorite Sports Team-Cubs Favorite Color-Blue Favorite Subject-Math Favorite Teaching Memory-I have so many teaching memories, but my favorite would have to be when we paper mache' pigs as we read Charlotte's Web. 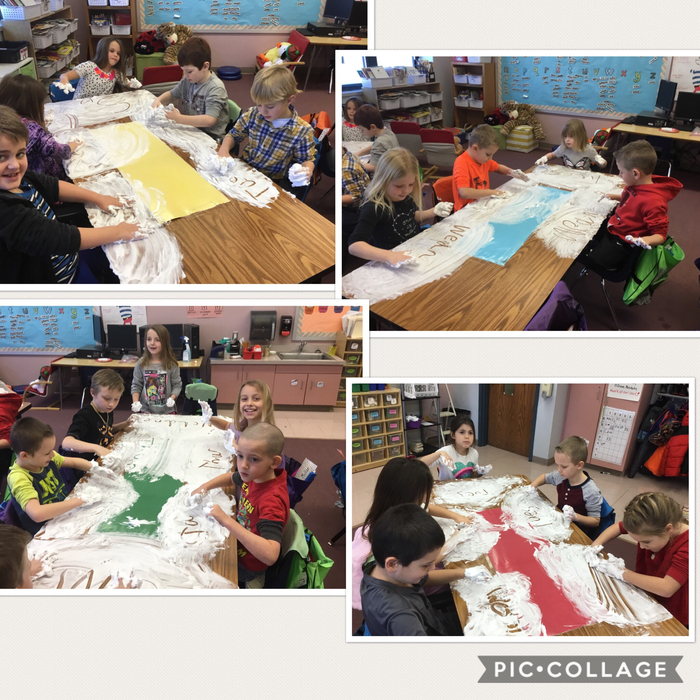 It is a long process that includes blowing up balloons, covering the balloons with 2 layers of paper mache', adding legs, painting the pig, hot glueing ears and tails on, and then naming each pig! It is a messy process that is so much fun!! I love teaching because everyday is a new adventure. I also get to spend my days with about 20 kids that look up to me, laugh at my corny jokes, hug me, and want to spend time with me!! What I want most for my students is for them to know that I truly care for them and want to see them succeed. Melissa Haegen 2nd Grade 10 yrs in 2nd grade at SES Sullivan graduate Fav Band: 80s and 90s Monster Ballads Fav Movie: I can't pick just one but I love Breakfast Club and Dirty Dancing Fav Sports Team: St. Louis Cardinals Fav Color: all colors of the rainbow Fav Subject: I enjoy teaching reading Fav teaching Moment: I love when former students come back and share memories with me about times in 2nd grade. I love to see how they have grown and matured. It's a great reminder of why we do what we do and that each and every year is important to our students. What I want most for my students is to give them the confidence to be themselves. I want them to feel safe in my classroom and know that they always have a place here. 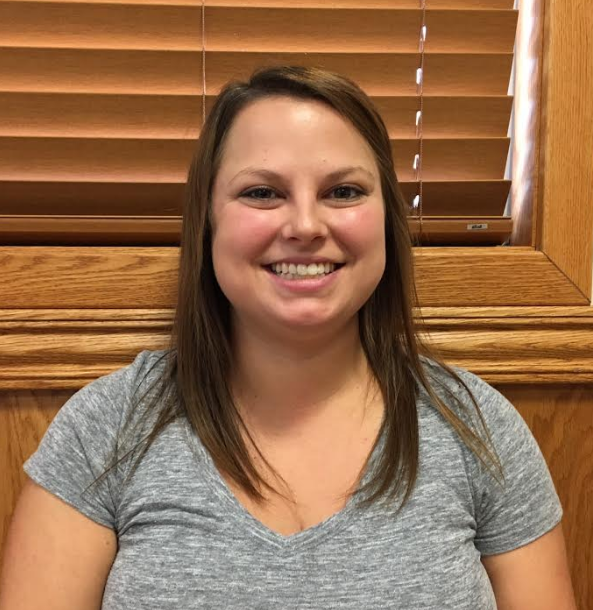 Name: Leslie Auten Grade Level:2 Years of experience:29 Hometown: Shelbyville, Illinois Favorite band: No favorite, but I enjoy listening to lots of artists. 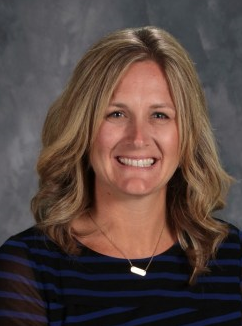 Favorite movie: the Harry Potter movies Favorite sports teams: Sullivan Redskins Favorite color: purple or navy blue Favorite subject:math and science Favorite teaching memory: There are too many memories to have just one! Everyday, I look forward to the smiles and accomplishments of my students. I love teaching because... I enjoy being around children with all of their enthusiasm to learn and I enjoy leading them to gain new knowledge. What I want most for my students is... to feel successful, proud, and have that eagerness to learn. Here is Mrs. Wilson's new classroom. 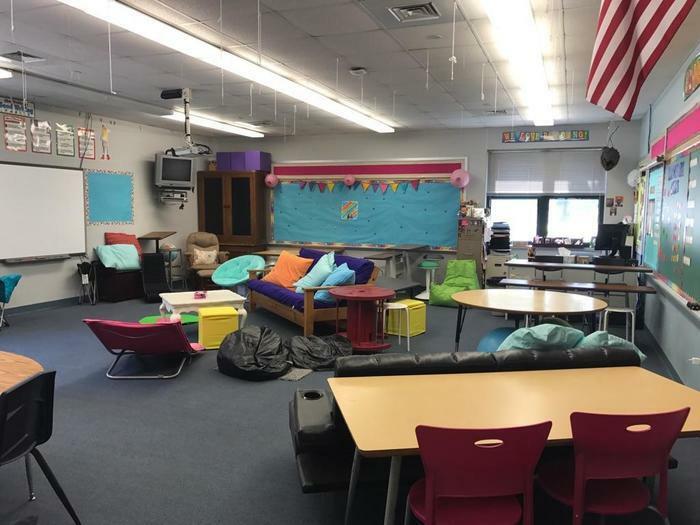 Flexible seating has been linked to improved academic performance and classroom environment. 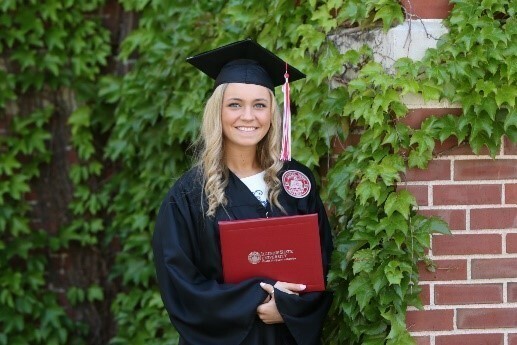 Name: Sara Boyer Grade Level: Kindergarten Years of experience: 23 Hometown: Sullivan, IL Education: University of Illinois Favorite band: Rascal Flatts Favorite movie: E.T. Favorite sports teams: Cubs Favorite color: Purple Favorite subject: Math Favorite teaching memory: I will never forget when we were learning about the heart. We were running in place for one minute to make our heart beat faster. When the minute was up, I told the kids to be really quiet and try to listen and feel their heartbeat. After a couple of seconds, one little boys blurts out in a panic, "Mrs. Boyer!! Mrs. Boyer!! I can't feel my heart!! I think it needs new batteries!!" I quickly helped him find his heartbeat, but on the inside I was laughing hysterically!!! Kids really do say the darndest things!!! I love teaching because... I absolutely LOVE watching kids grow, and change, and learn!!! I LOVE it when I see that light bulb turn on and they finally "get" something they have been working so hard on. I LOVE the confidence that beams from their smiles! I LOVE to help make a positive difference in their lives! (And I ESPECIALLY LOVE all of the HUGS I have received over the years....definitely one of my favorite parts of teaching Kindergarten!!) What I want most for my students is... to have SO MUCH FUN learning that they don't even know they are doing it!!! I want them to embrace a LOVE FOR LEARNING and to know that SCHOOL IS FUN!!! Name: Eudora Drollinger First Grade Years of Experience: 35 Hometown: Sullivan Alma Mater: Eastern Illinois University - Bachelor's Degree Southern Illinois University - Edwardsville - Master's Degree Favorite Concerts: Garth Brooks, Billy Joel, Michael W.Smith/Amy Grant Favorite Sports Teams: Fighting Illini, Chicago Cubs Favorite Colors: Blue, Lime Green Favorite Pizza Place: Monical's Favorite Vacations: Washington D.C., Canadian train trip, any National Park, beaches One of the reasons I love teaching is because I get to share to books, books, and more books with kids everyday. What I want most for my students is that they love school, have character, and are blessed with people in their lives that will always help them and support their educational journey! Teaching memory: When I went to interview for my first job, the man outside sweeping the sidewalks directed me to the principal's office. A few minutes later I discovered that man was the principal. The message I got was to be willing to jump in and do what needs to be done and to be respectful to everyone. That makes for a great school! On a lighter note: One afternoon at around 2:40, a parent arrived at my classroom door and said she was removing her child from our school to homeschool him. The next morning, around 8:20, that student walked into my classroom and said "I'm back!" Name: Cassie Becker Grade Level:1st Grade Years of experience:3 years Hometown:Gibson City College: Eastern Illinois University Favorite band: The Beatles Favorite movie I watch with my kids: The Little Mermaid Favorite sports teams: Sullivan Redskins and The Cubs Favorite color: Pink and Teal Favorite subject: Math !!! Favorite School Supply: Post-its and Coffee Favorite teaching memory: Dunking at the Wizards Game I love teaching because... I love teaching because every student is different, every day is different, and every day there is a chance to learn something different. What I want most for my students is for my students to fall in love with learning and want to keep learning for the rest of their lives. 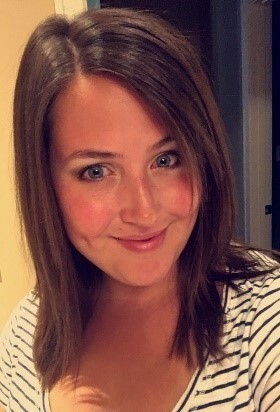 Name: Sarah Atchison Grade Level: 1st Grade Years of experience: 2nd year teaching, 1st year teaching 1st College: Indiana State University Hometown: Sullivan, IL Favorite band: Ed Sheeran, Taylor Swift, Sam Hunt, Chris Stapleton Favorite movie: Frozen Favorite sports teams: St. Louis Cardinals, Dallas Cowboys Favorite color: Purple Favorite subject: Reading/Music Favorite teaching memory: Mr. Moon (OV’s custodian) helped my class to bungee jump Barbie’s off of the roof! We had a blast! 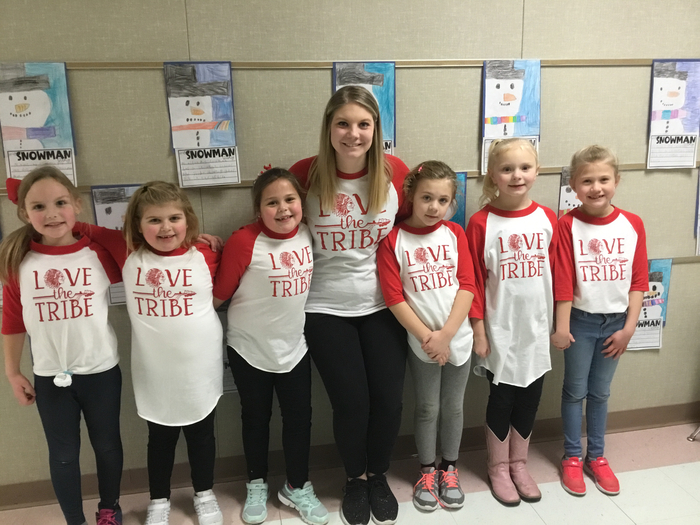 I love teaching because...I love building relationships with my students and their families! I also love seeing the growth that my students have and knowing that I was a part of that! What I want most for my students is... For them to develop I lifelong love for learning! Name: Erin VanDeursen Grade Level: Kindergarten Years of Experience: 5 years Hometown: Mattoon, Illinois Favorite Singer: Carrie Underwood Favorite Movie: Beauty and the Beast Favorite Sports Team: Chicago Cubs Favorite color: Pink Favorite Subjects: Reading and Writing Over the past five years, my favorite memory is watching each of my students succeed and complete tasks/activities her/she once felt were too tricky or challenging. I love teaching because I have the opportunity to inspire kids and help them develop a passion for learning! What I want most for my students is for them to look forward to coming to school, knowing that they are cared about and excited to learn something new each day! Name: Kelli Rarick Grade Level: Kindergarten Years of experience: 1.5 Hometown: Batavia, IL Favorite singer: Jack Johnson Favorite movie: Beauty and the Beast Favorite sports teams: Chicago Blackhawks Favorite color: Purple Favorite subject: Reading I am so excited to meet my kindergarteners and hope that each and every one of them will learn to love school! I sure hope my students are ready to have some fun this year! Name: Cheryl Kramer Grade Level: Kindergarten Years of experience: 18 years Hometown: Shelbyville, IL Favorite band: Johnny and June Cash Favorite movie: To Kill A Mocking Bird Favorite sports teams: Illini Basketball Favorite color: red Favorite subject: English Favorite teaching memory: When one of my little darlings said, with a surprised look, "Hey, I finally CAN read!" I love teaching because...as a kindergarten teacher, I get hugs everyday! What I want most for my students is...to love coming to school everyday! Parents of SES students. Now that class lists are posted, get a little more background on your child's teacher! 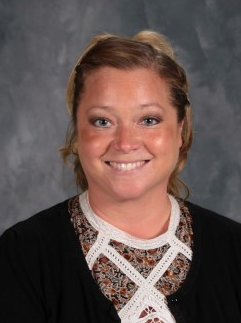 A picture and brief biography of each teacher will be put on the school's live feed. Kindergarten and 1st Grade will go on Wednesday, August 2, 2nd and 3rd Grades Thursday, 4th and 5th Grades Friday, other teachers and staff members on Saturday. Use our app (look up Sullivan 300, iPad users may need to switch your app store setting to iPhone) or go to our new, fancy website: http://www.sullivan.k12.il.us/o/elementary-school. Scroll down and the live feed will be on the left-hand side. How do you keep a 20 year old building looking great? By having an amazing custodial/maintenance staff! 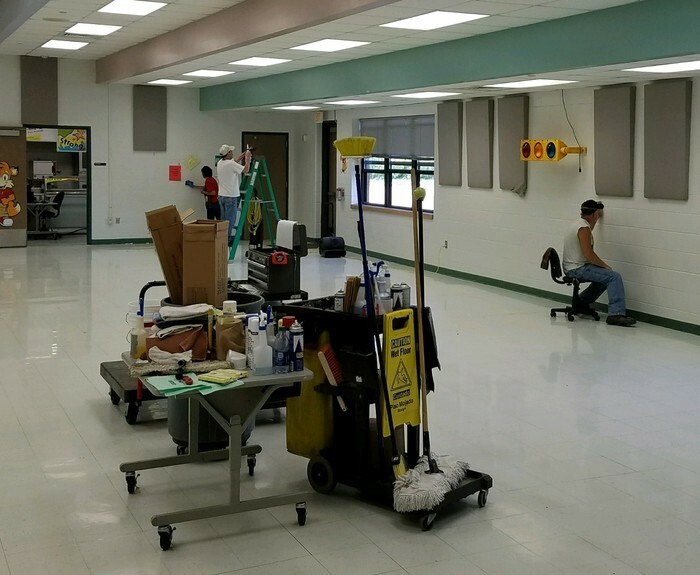 Gary Crowe, Tim Lappin, and the crew have worked hard painting, cleaning carpets, waxing floors, moving desks, and more in preparation for the upcoming school year. Here you see Tim, Gary, and middle school custodian Kathy Crowe getting the cafeteria for another year of breakfasts and lunches. 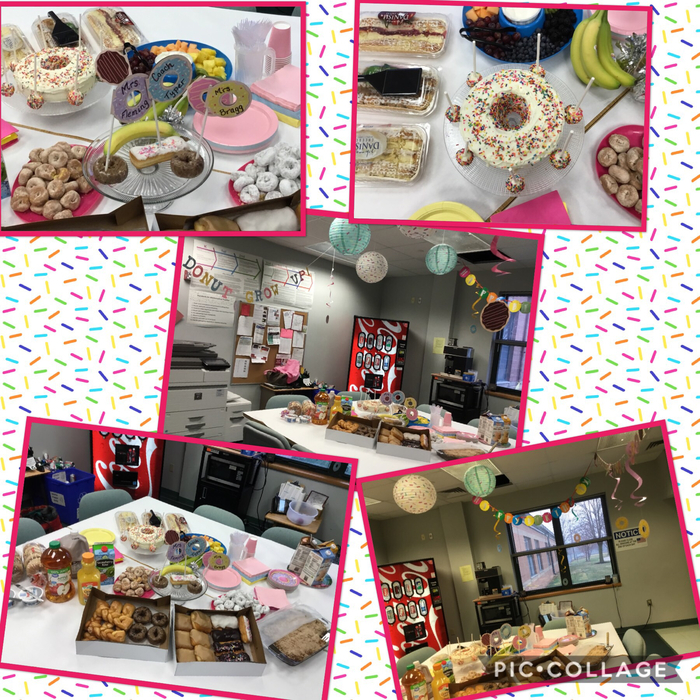 Thanks for all you do! CLASS LISTS WILL BE POSTED AT 3 PM TOMORROW (Tuesday, August 1) ON THE EAST AND WEST ENTRANCES OF SES! Also, a reminder that PTO will be doing sign ups for those who would like to volunteer for PTO activities this year. There will be sign ups for families who can't afford school supplies as well. Pickup night for the supplies will be in the SES lobby from 4-6 pm on Monday, August 14 (the day before the first day of school). Parents of Sullivan Elementary School: The PTO is partnering with local churches to provide school supplies for families in need. On Tuesday, August 1, the PTO will have a table set up from 3-6 pm at both entrances of the elementary school when class lists are posted. Parents who cannot afford supplies may sign up at that time for their students to receive needed supplies on the first day of school. There will be a separate sign up available for parents interested in being a volunteer for the PTO. Thank you to the PTO and local churches for all you do for our community and schools! Here is the 2017-2018 Sullivan Elementary School Calendar as it currently stands. Some events (such as PTO activities) are subject to change due to potential scheduling conflicts, but notifications will be sent out should such changes occur. Dates that are in bold print deal with student attendance. Looking forward to another great year at SES! 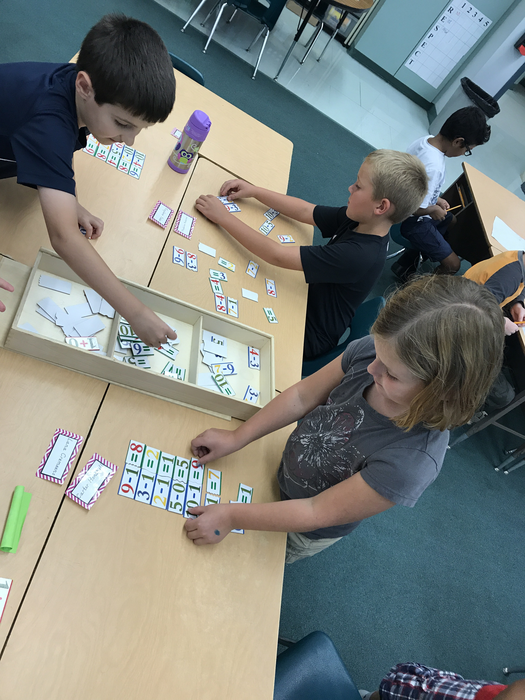 A glimpse into summer work at the elementary school. 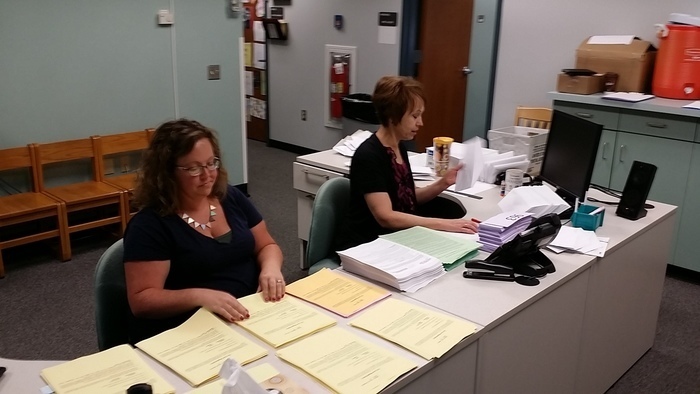 Thank you to Ann Sanner and Janelle Martin (PTO representative) for sacrificing a day of summer to help stuff around 400 mailings for registration (1 per student household), expect your packet soon! A quick reminder that online registration opens on July 17th or you can come to the high school media center to register from noon to 7 on July 27th.